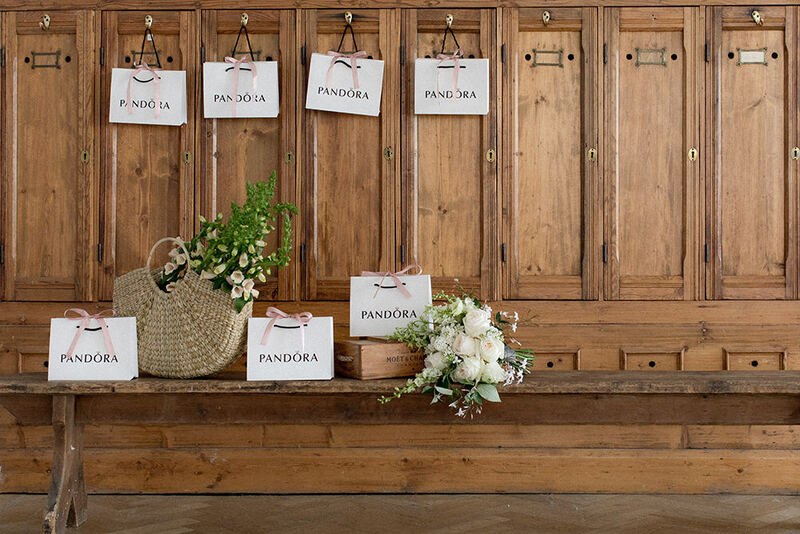 Well we are delighted to say we enjoyed working with Pandora and Rock My Wedding again on this pretty editorial shoot. 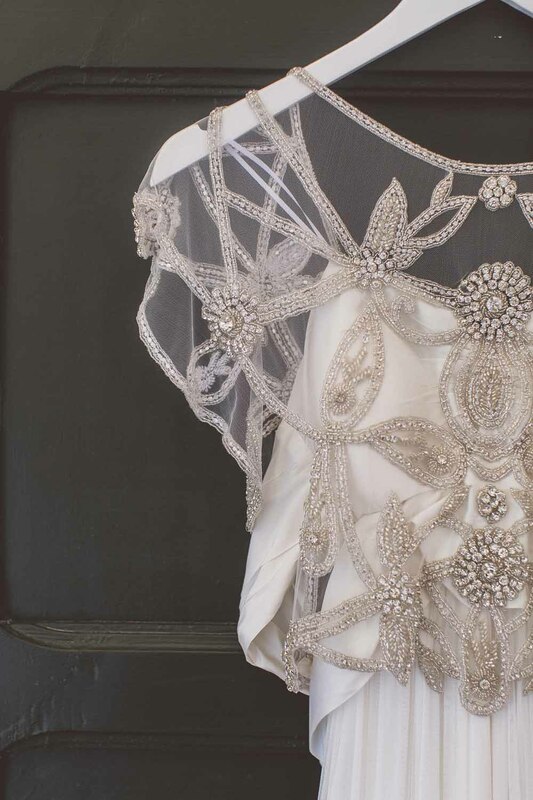 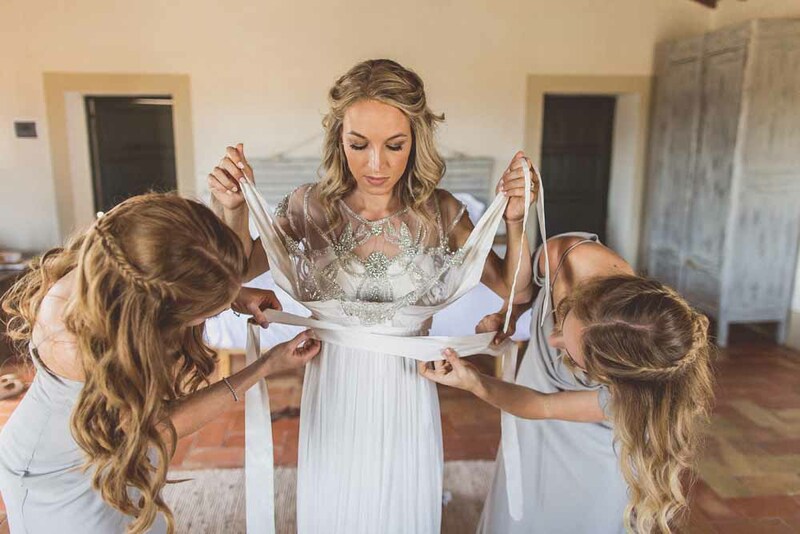 It is always a dream team and a way to a girl’s heart with beautiful jewels, gorgeous dresses, and great styling. 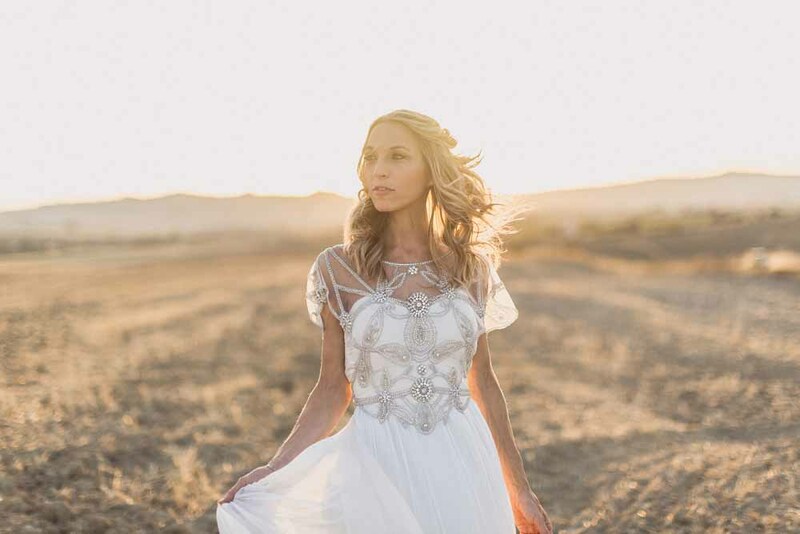 See more on Rock My Wedding. 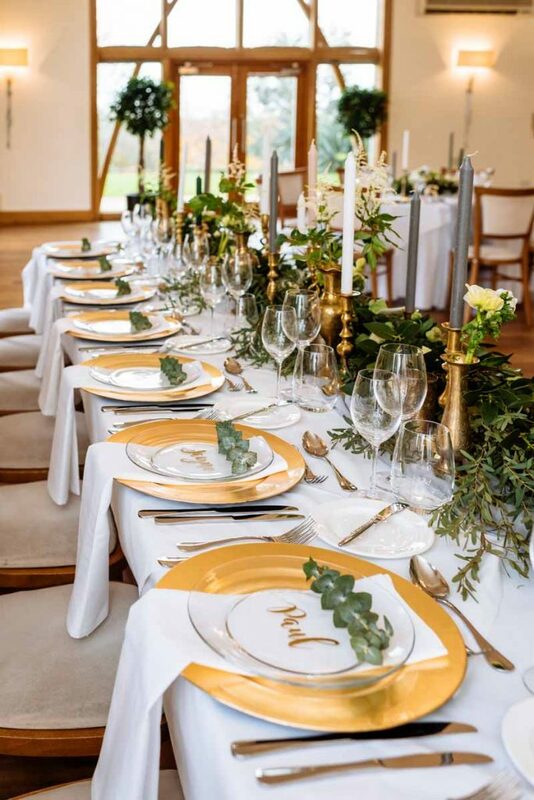 Barton Court is a small country house estate, made up of the main house and several interesting outbuildings set in 6 acres of gardens. 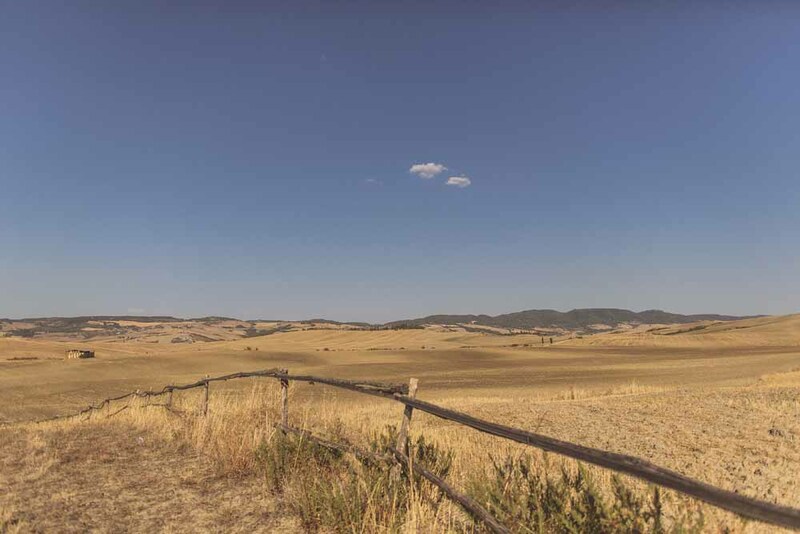 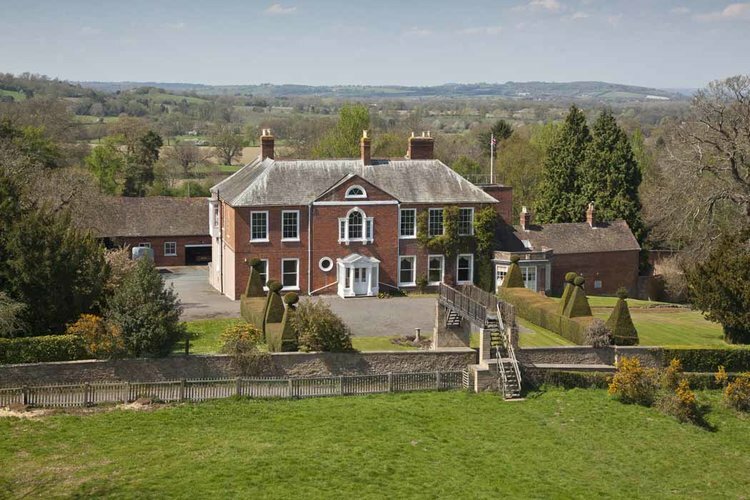 The property sits on the edge of the village of Colwall near Malvern and Ledbury and has uninterrupted views of the glorious countryside that surrounds it. 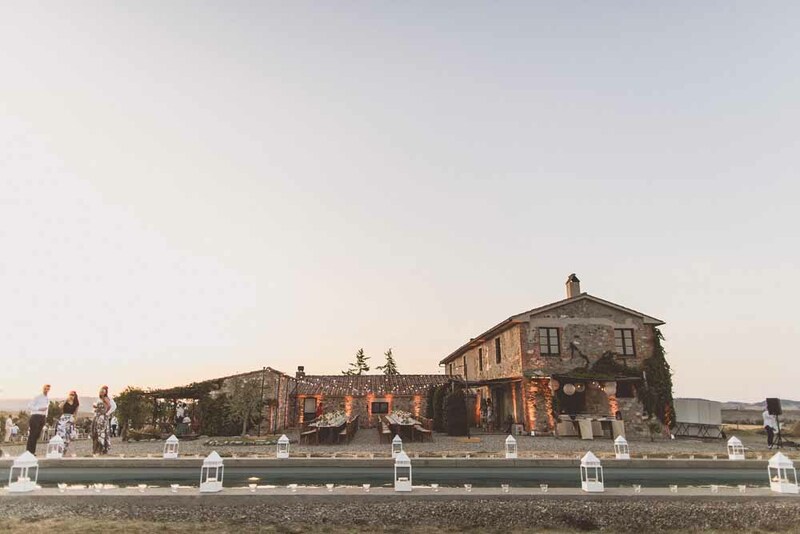 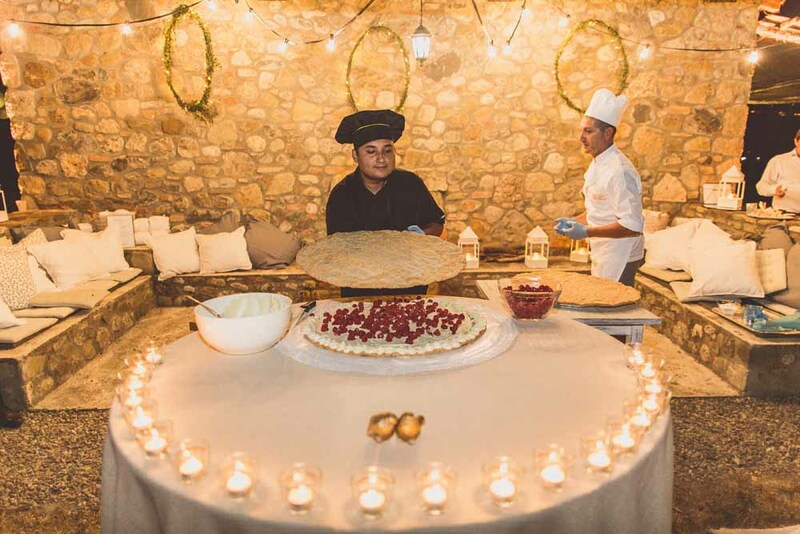 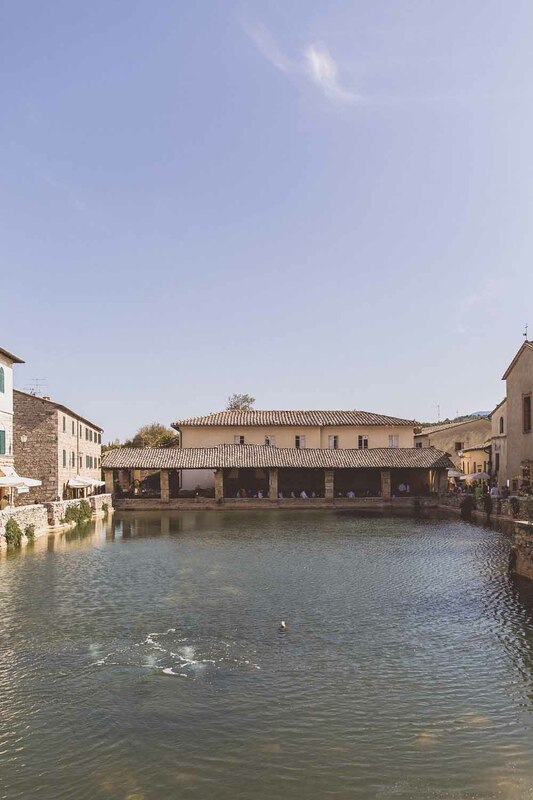 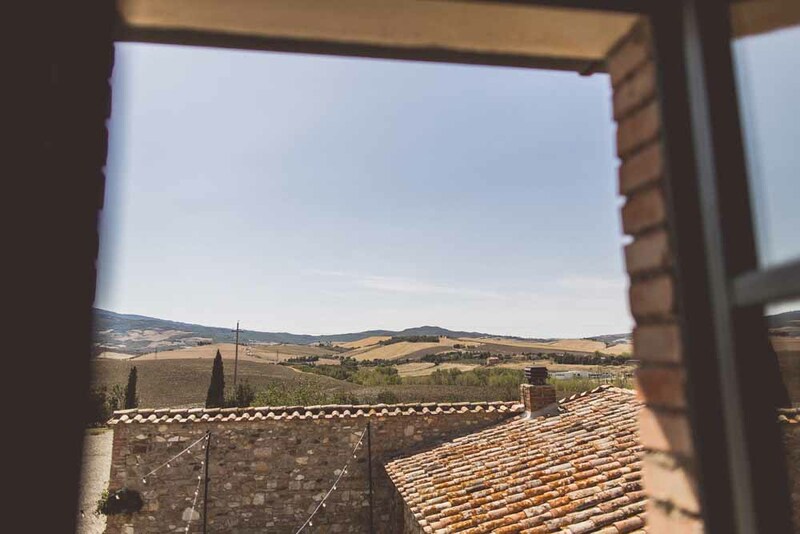 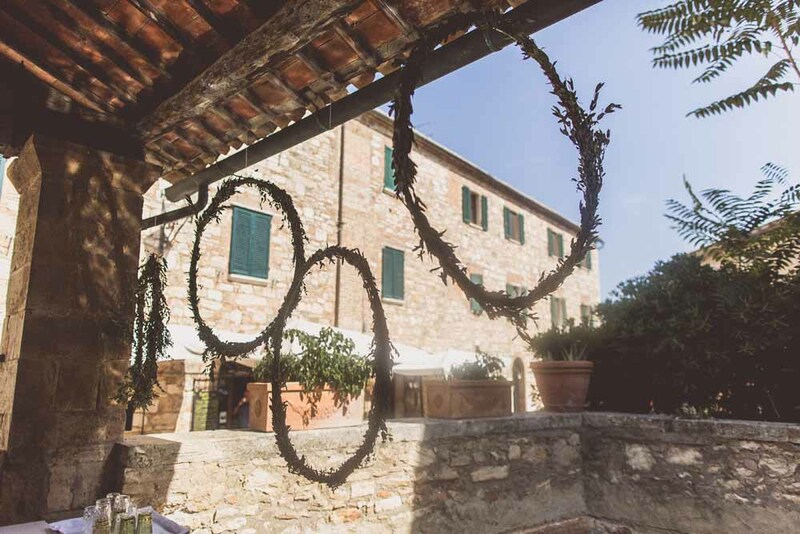 The main house, the Clock Tower and the ancillary buildings can be rented for short breaks, weddings and events, altogether, in various combinations or separately. 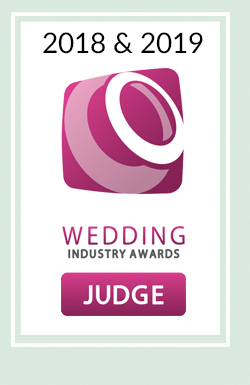 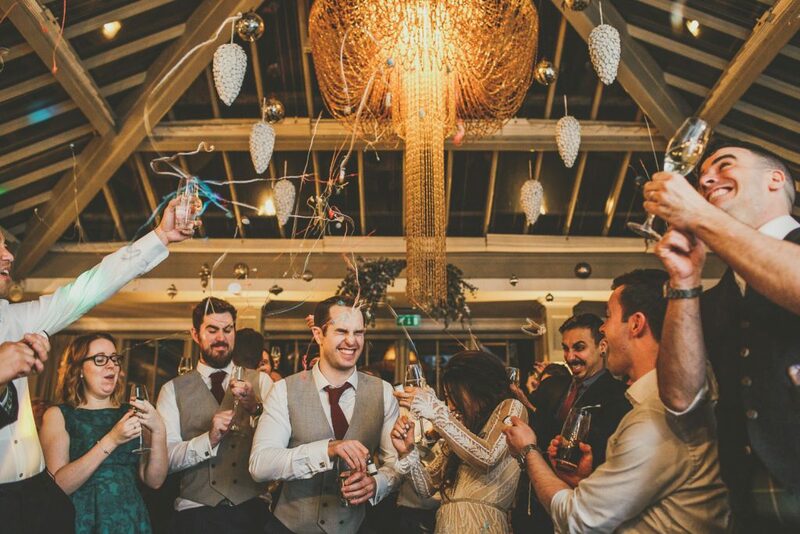 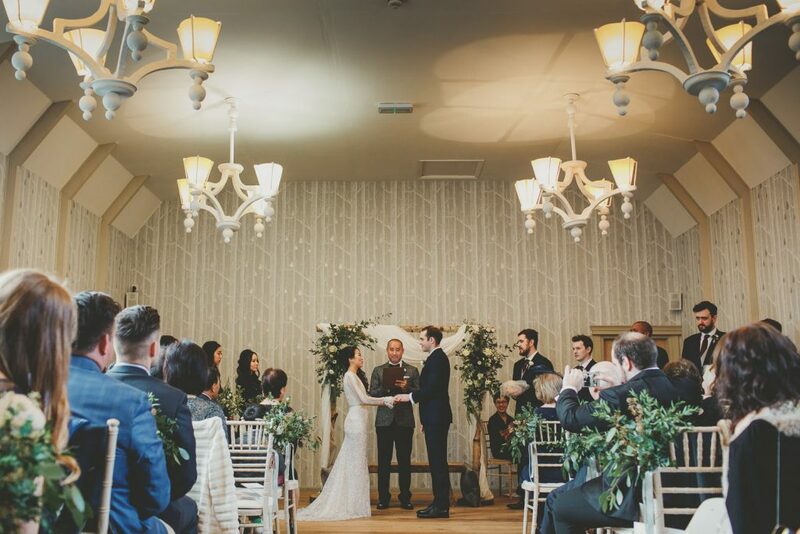 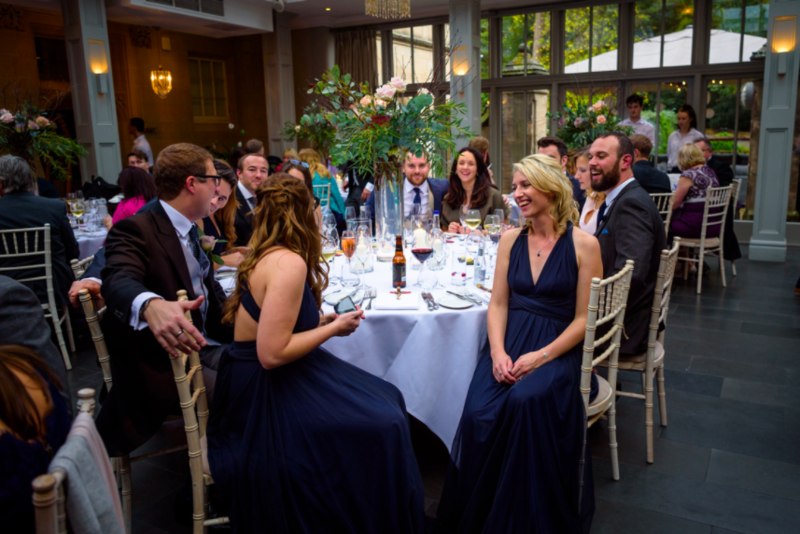 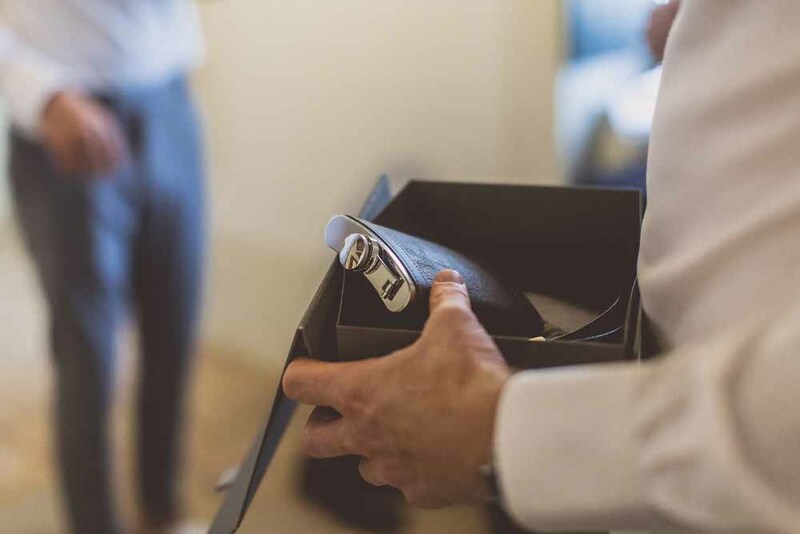 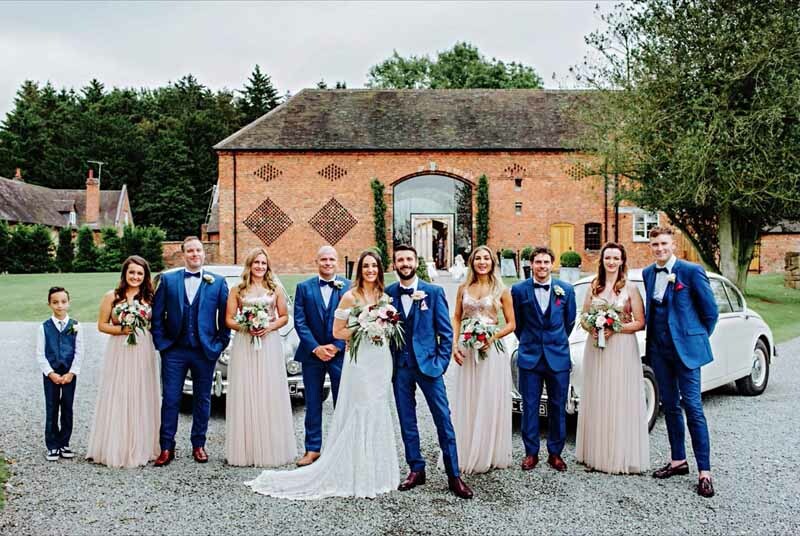 We have not yet worked at Barton Court as it is new to the wedding world, but we are happy to recommend this venue to our couples and would be delighted to work with the team at Barton House on weddings. 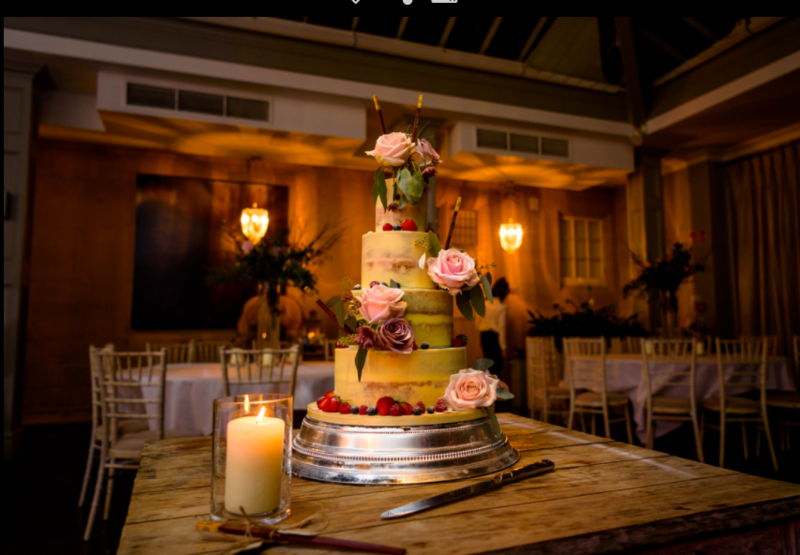 These photos below were taken from their open day to show how the venue can be dressed, flowers by talented florists whose work we enjoyed. 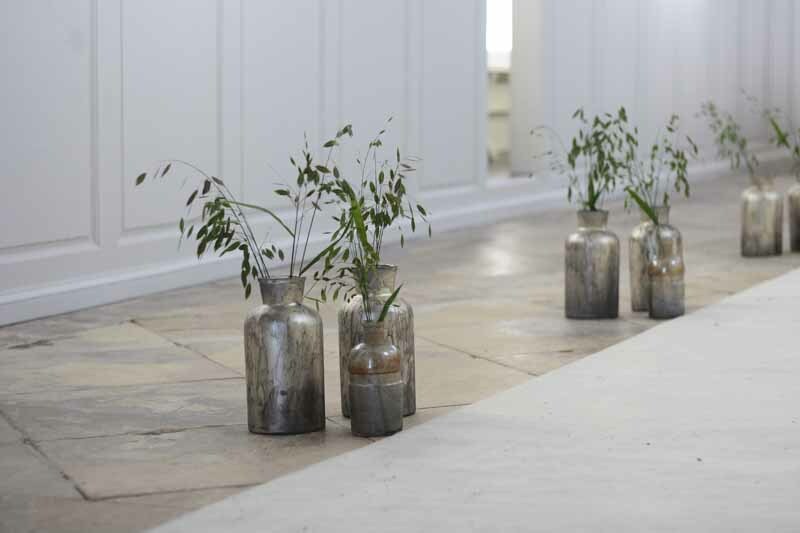 Sabine Darrall is a great favourite of ours and we loved how she had decorated the entrance hall in such an organic and natural style. 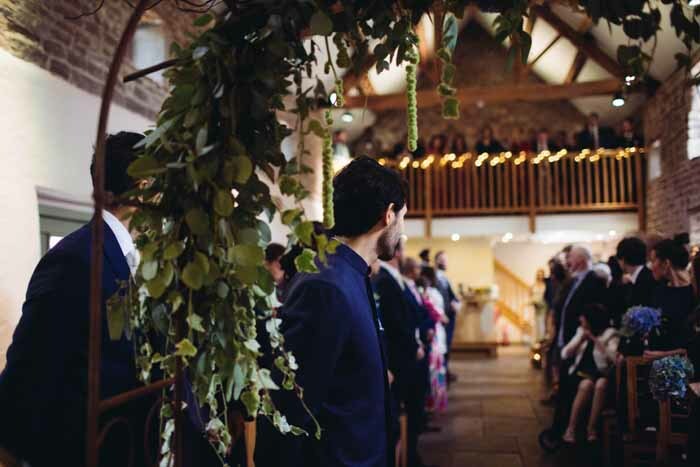 The ceremony barn was beautifully dressed by Helen Walker of BrideandBloom with an arch and meadow style planting to line the aisle. 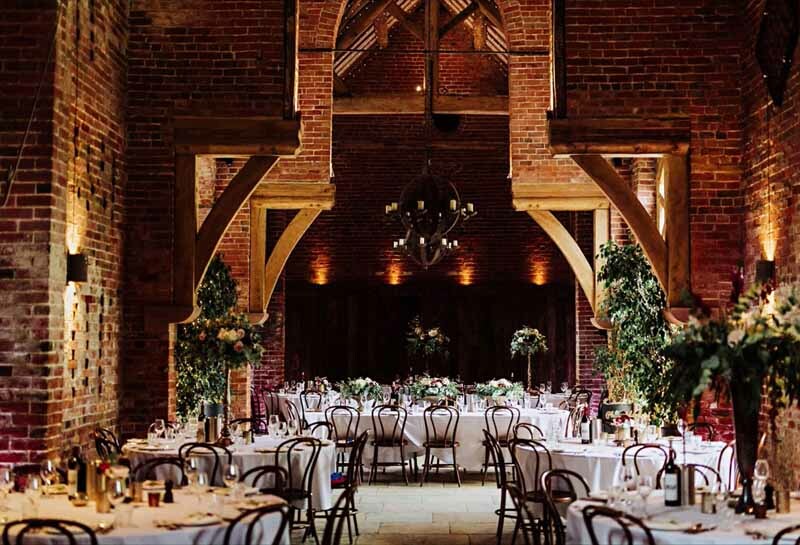 Barton Court is a unique building with plenty of character. 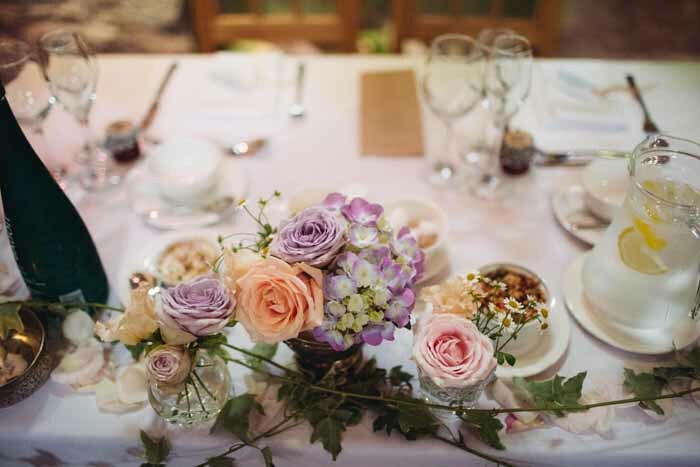 There is plenty of space for a delightful wedding breakfast. 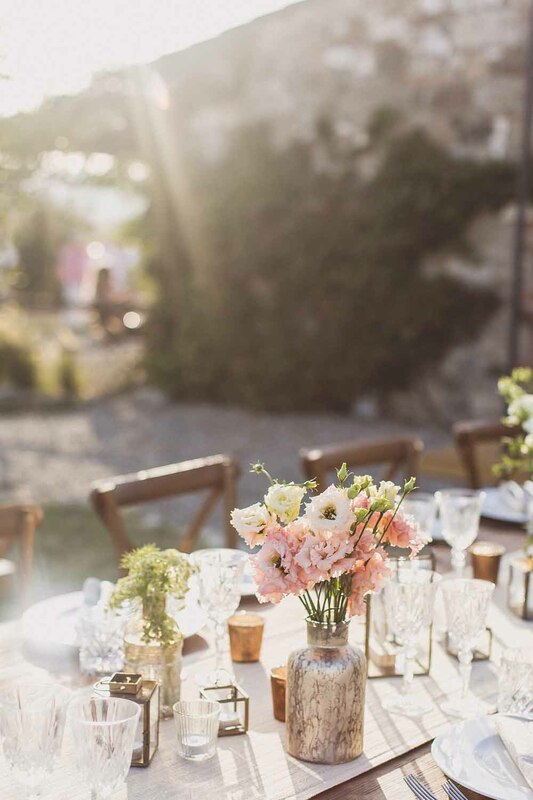 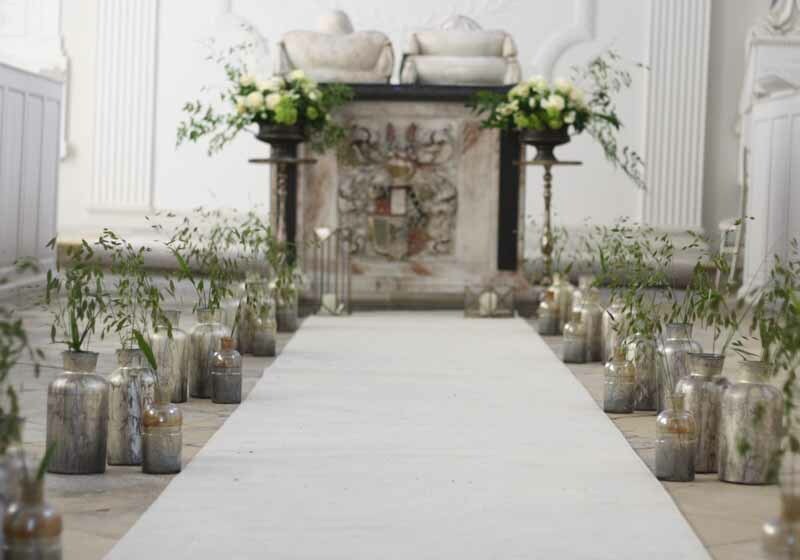 Here it was set out with a long table and a mix of candles and pretty blooms in footed vases. 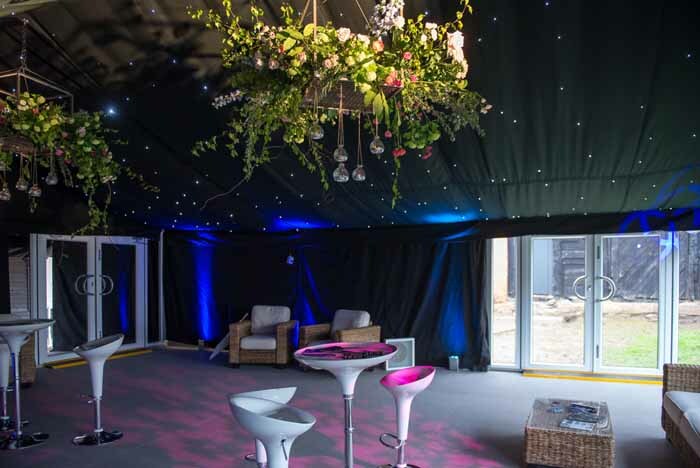 The marquee set up by the team at goodintents is the perfect place for a party. 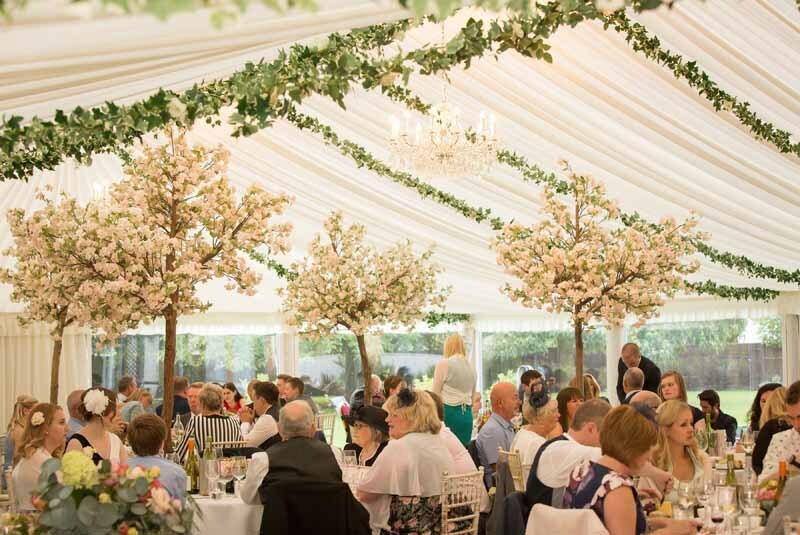 Marquees always look lovely with hanging arrangements to continue the tone and look of the wedding. 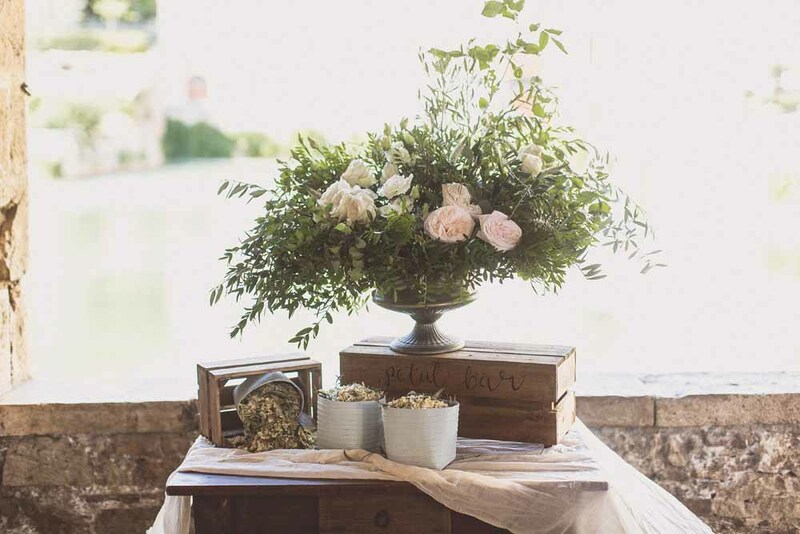 Sabine created some natural arrangements with plenty of style. 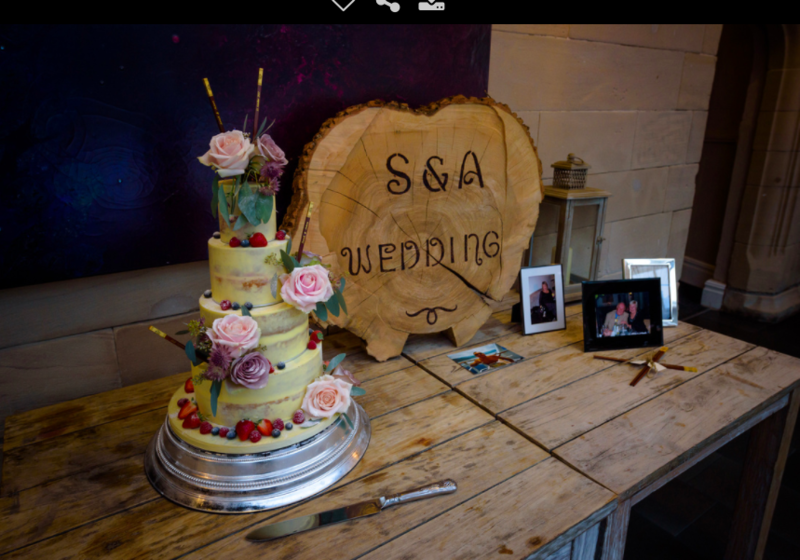 Thank you Linda and James for inviting me over. 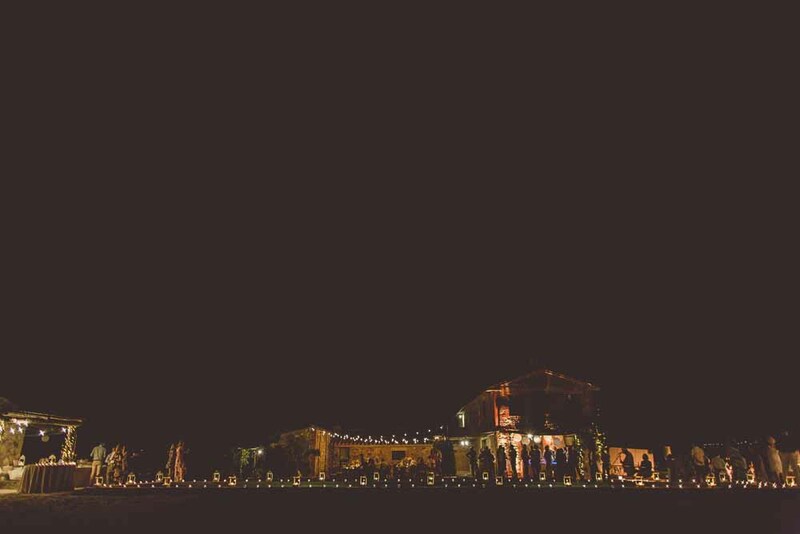 Wishing you all the best with your venue. 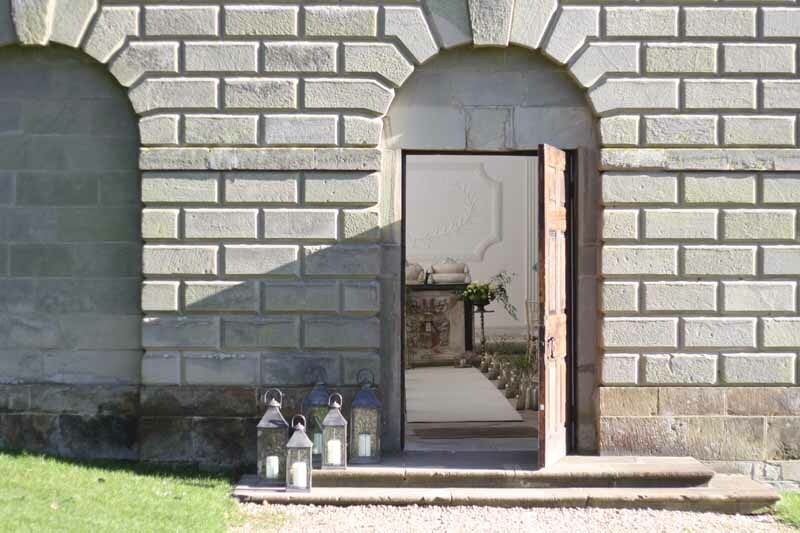 For further information on Barton Court visit. 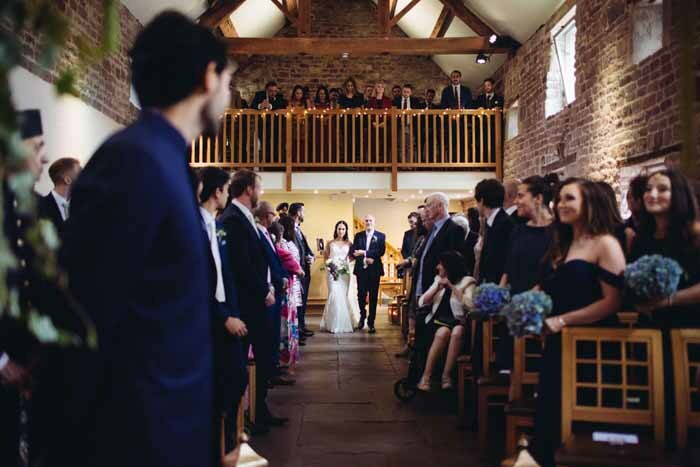 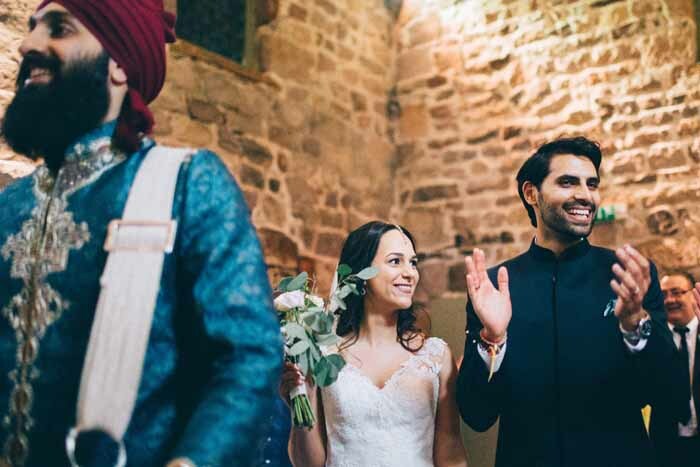 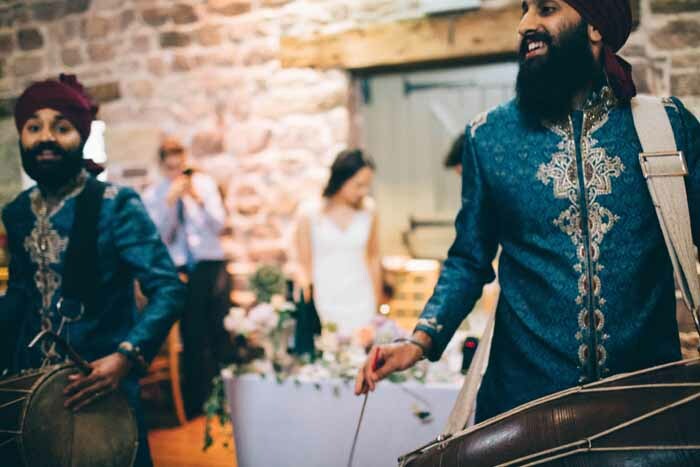 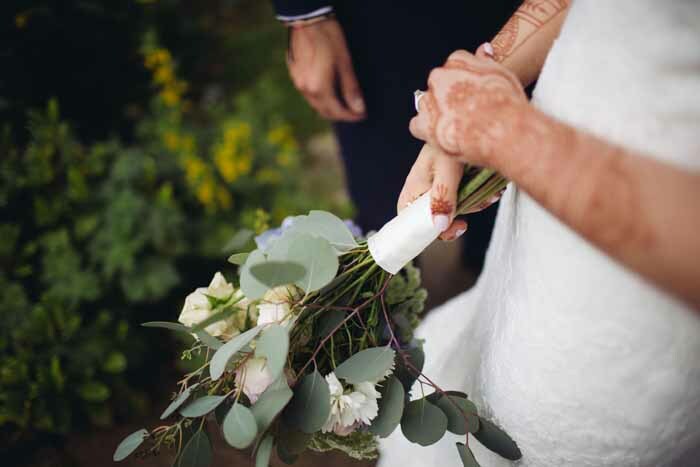 Hannah and Rishi were married at The Ashes, the most beautiful countryside venue, a place where you feel relaxed as you arrive and revived when you leave. 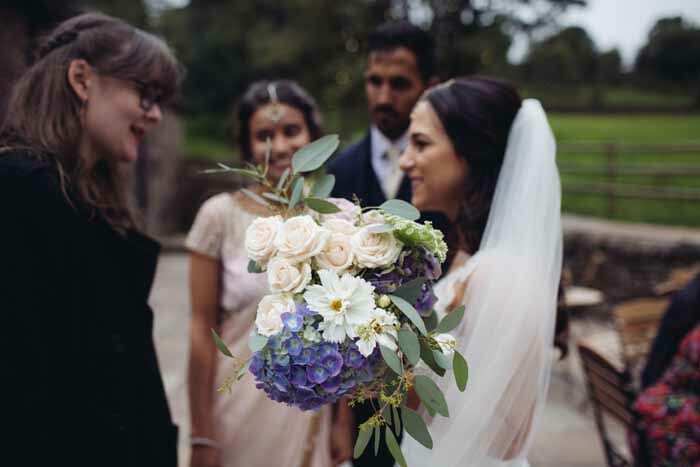 We were delighted to be asked to work with Hannah and Rishi on their wedding as we had the pleasure of creating flowers for Rishi’s brother’s wedding at Shustoke Barns previously. 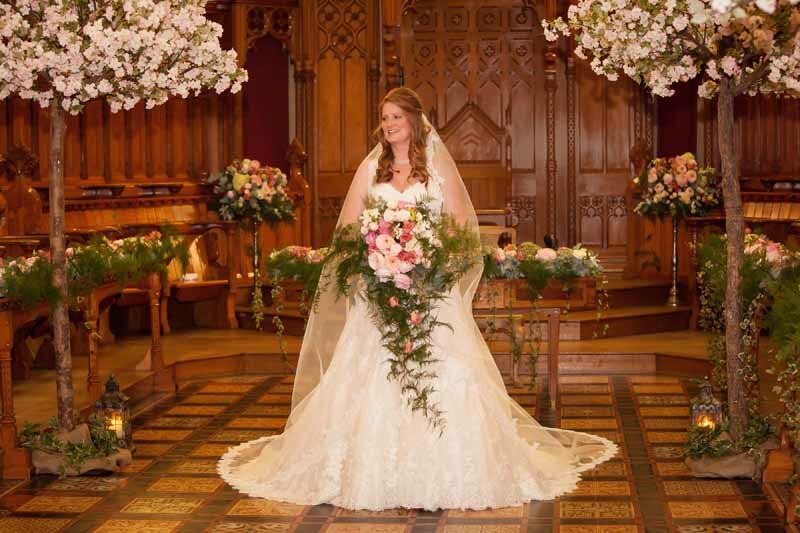 The bridal bouquet was a mix of hydrangea and roses in beautiful tones. 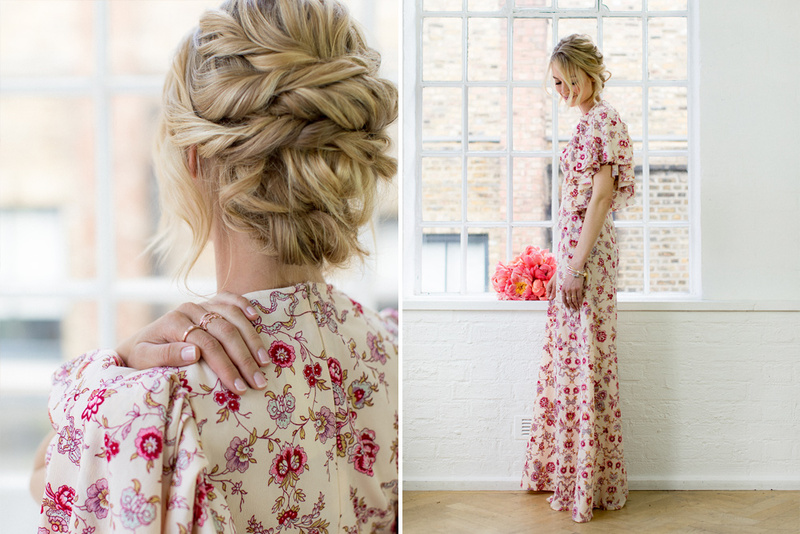 The whole look was chosen to remind Hannah of the family garden. 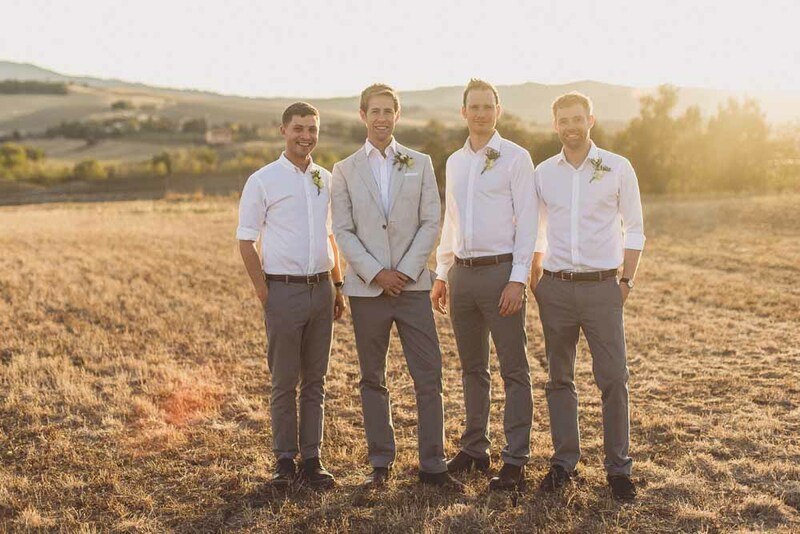 The boys sported just picked rustic buttonholes and enjoying posing under the photo backdrop with beautiful watercolour tones. 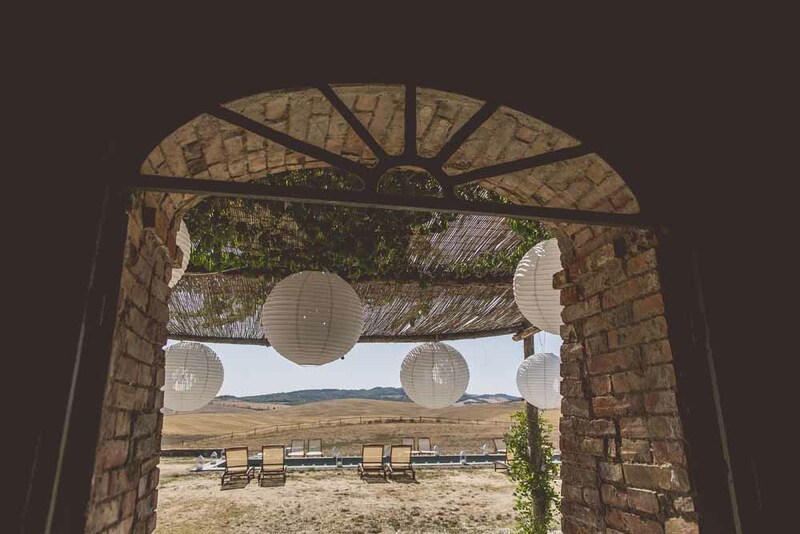 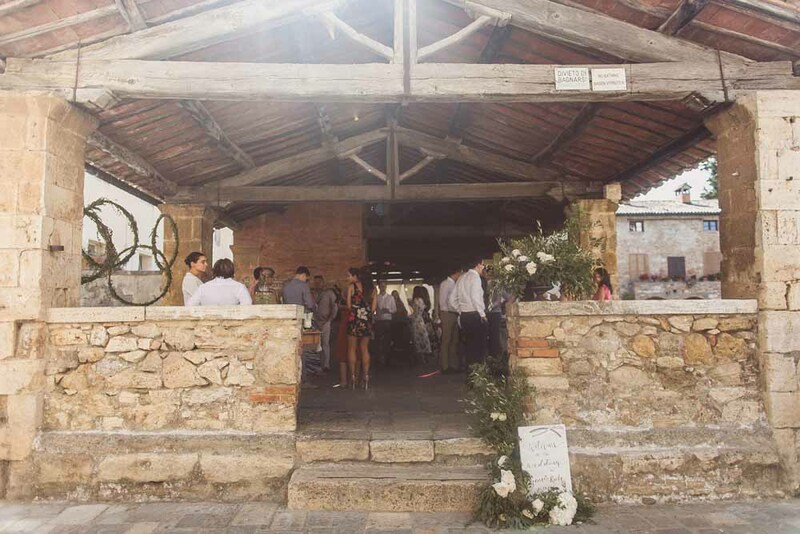 The barn at the Ashes is a warm and inviting ceremony space and we love adding a feature arch for the ceremony. 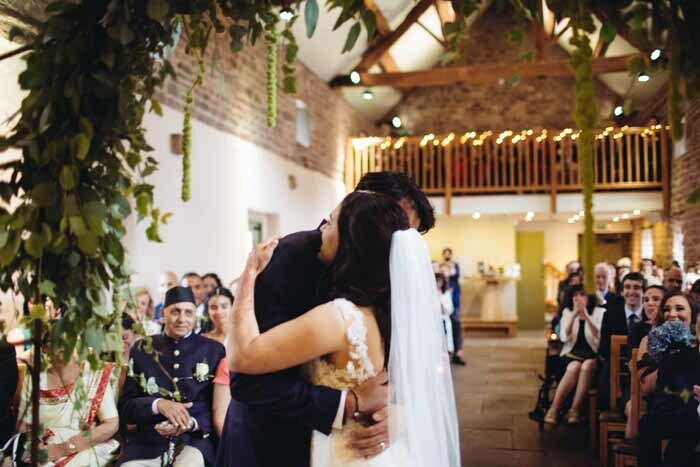 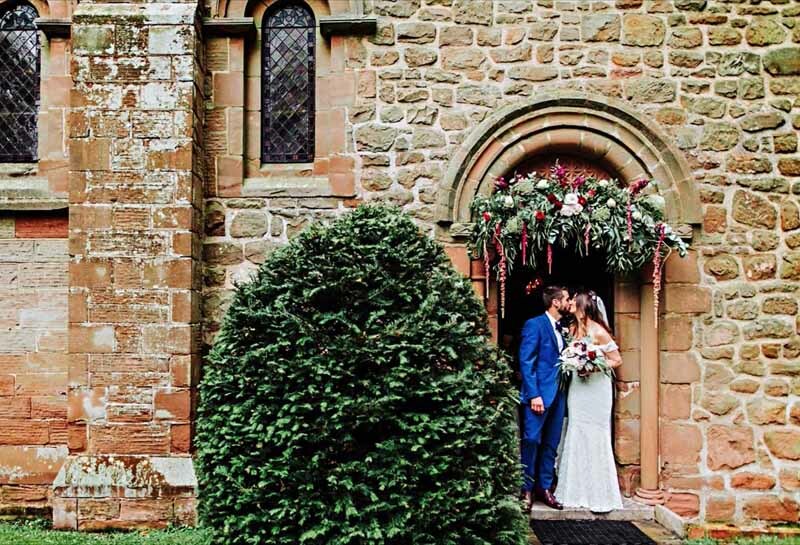 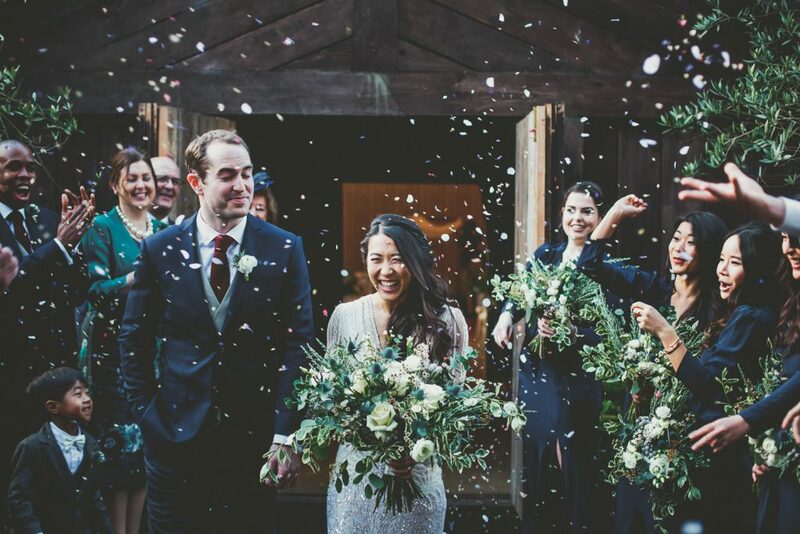 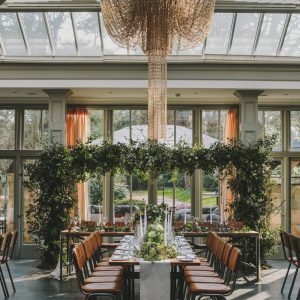 Lashing of eucalyptus foliage, ivy and hanging amaranthus set the scenes with colours being added to tie in with Hannah and Rishi’s colours from the day. 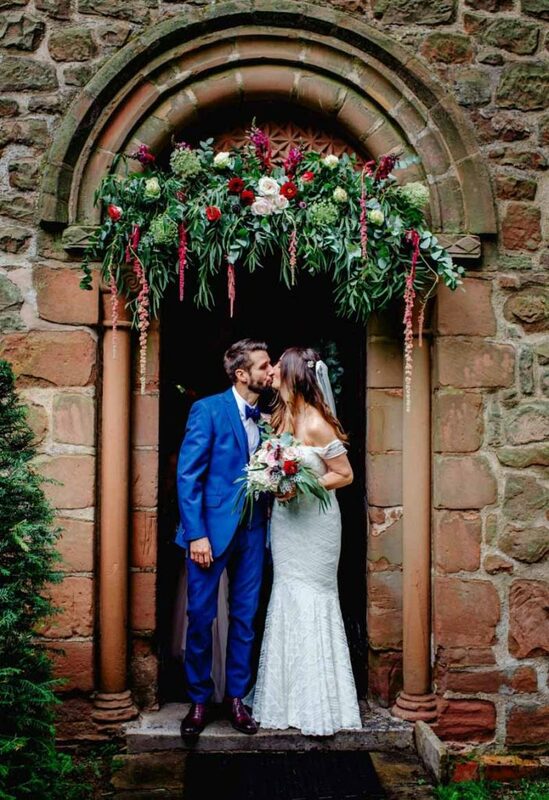 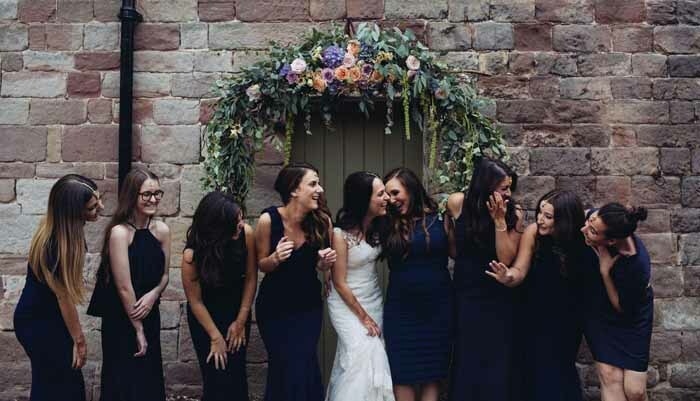 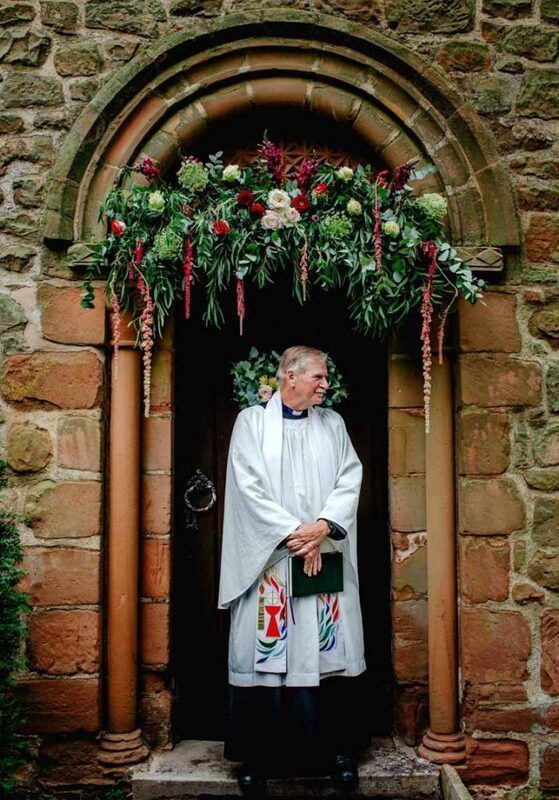 The floral arch proved popular as a photo backdrop for some fun photos on the day. 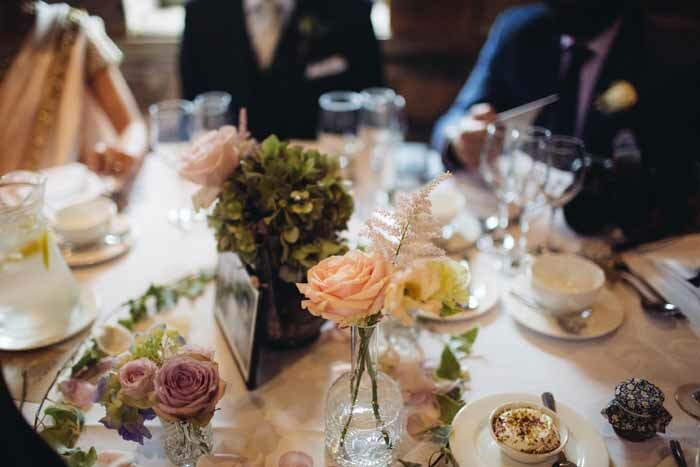 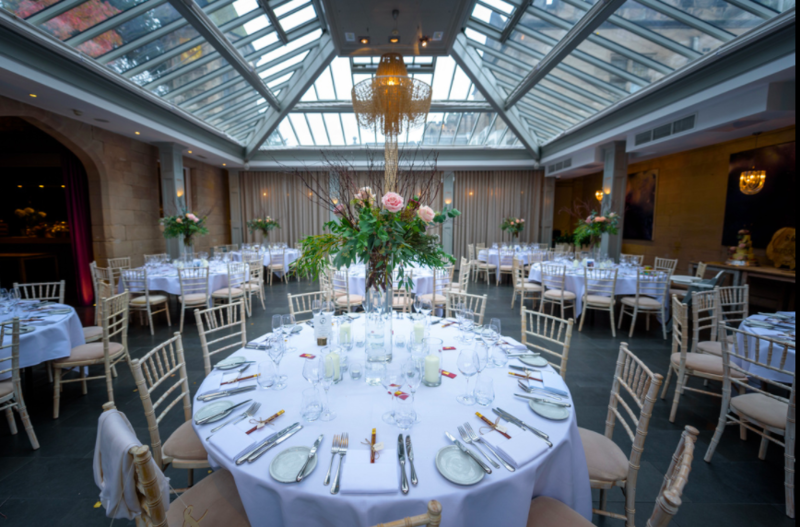 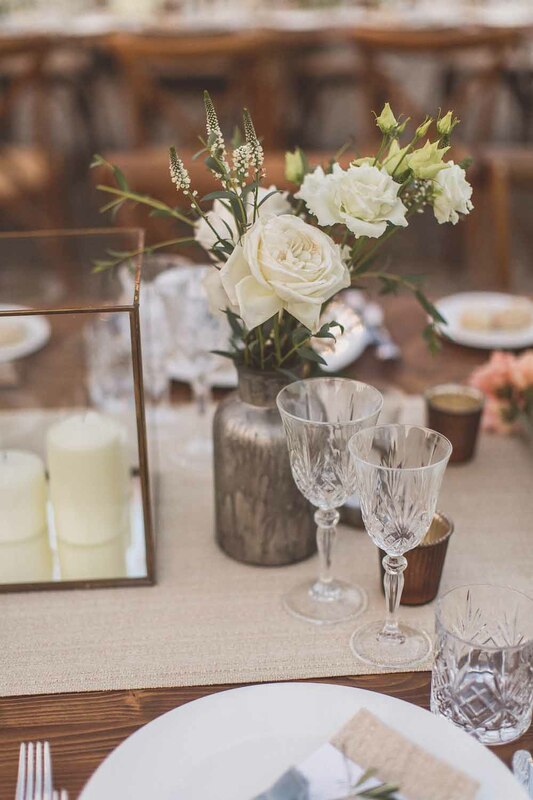 Hannah and Rishi had collected a lovely selection of antique vases, copper coffee pots and smaller bowls we incorporated into the table decoration with the addition of some crystal glass. 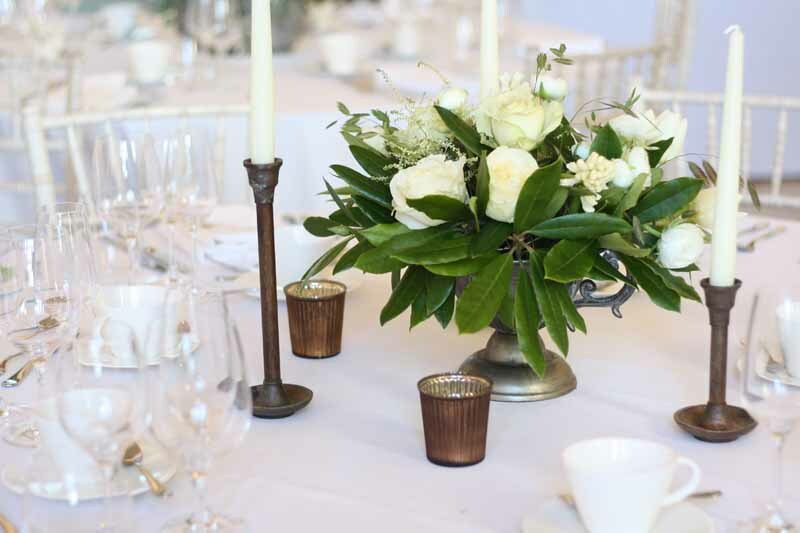 Delicate stems of ivy and soft scented flowers were added bringing colour to the tables. 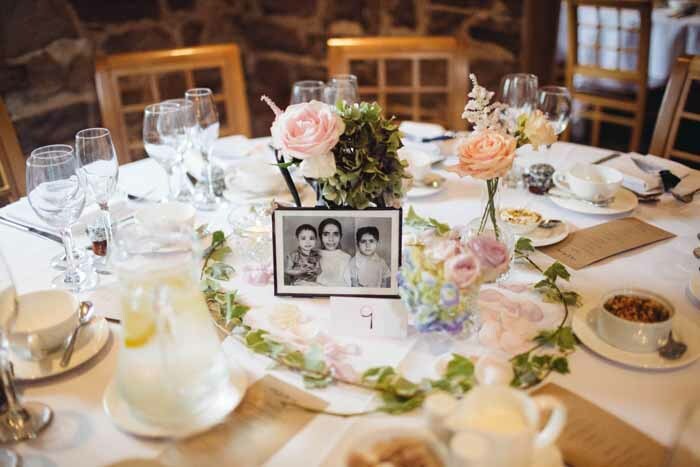 I loved the old photos that Hannah had displayed in photo frames for each table. 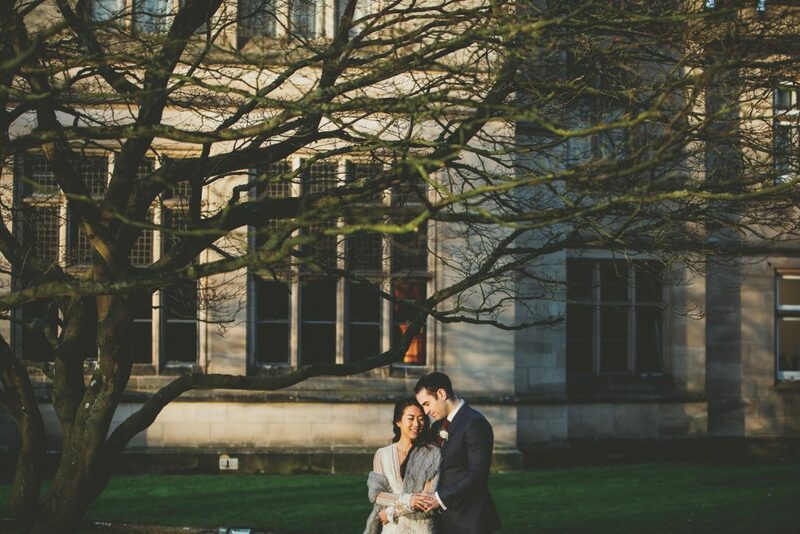 The couple found some tranquil spots for their portrait shots beautifully captured by Joanne Jacobs. 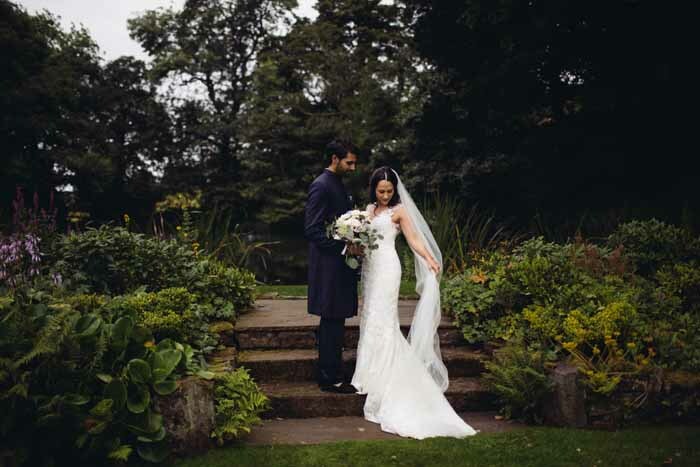 Thank you, Hannah and Rishi for sharing and for your lovely words. 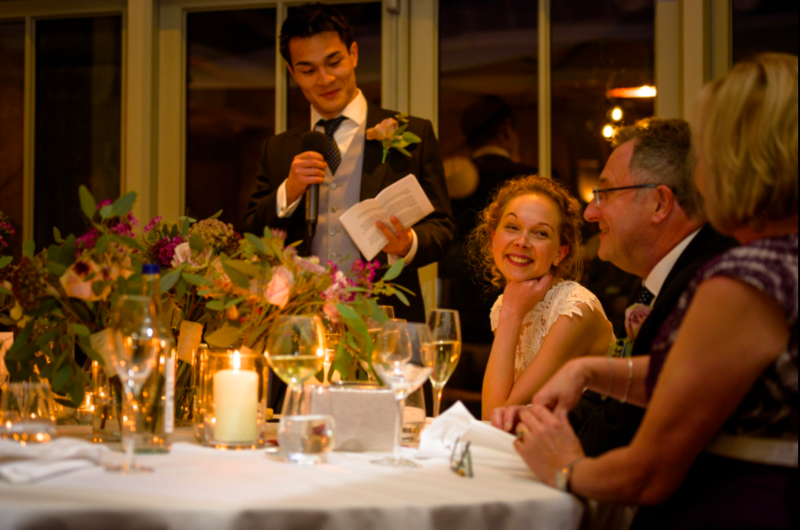 As always weddings and in particular our couples are the reason we love what we do. 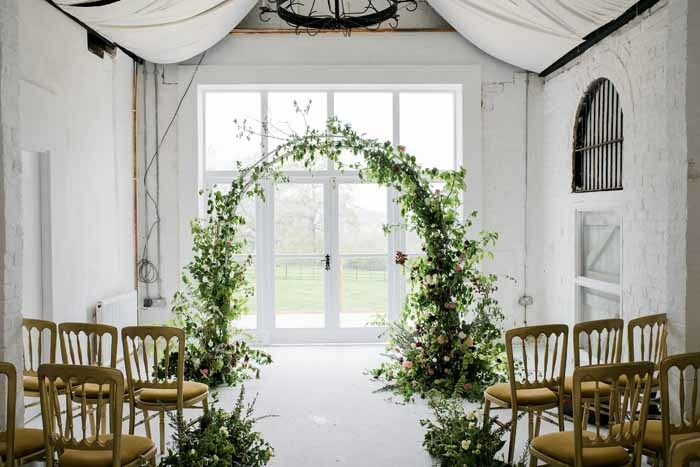 If you are planning a barn wedding or need inspiration for a floral arch then do get in touch. 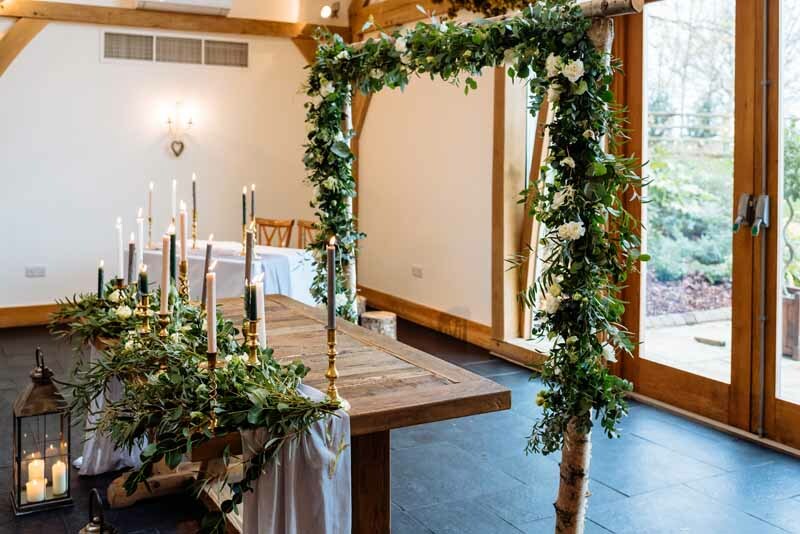 We usually use our birch arch covered in flowers and foliage to create a rustic frame for a wedding ceremony. 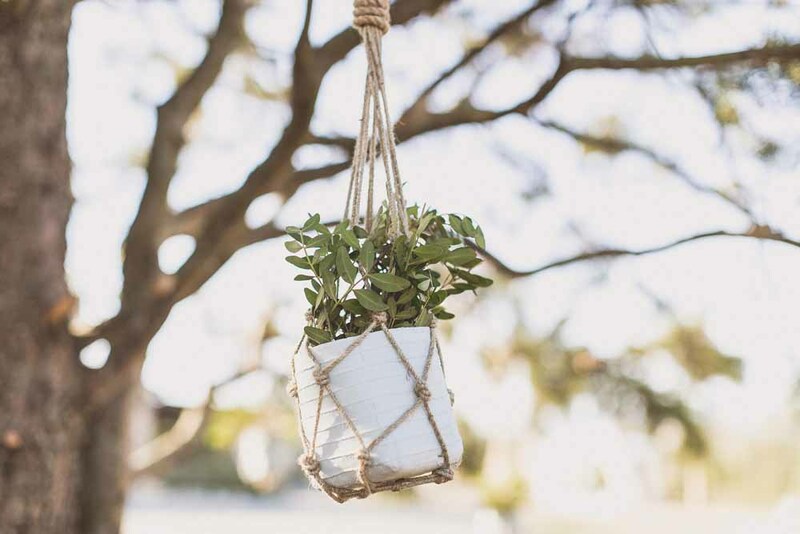 Here is another use for it. 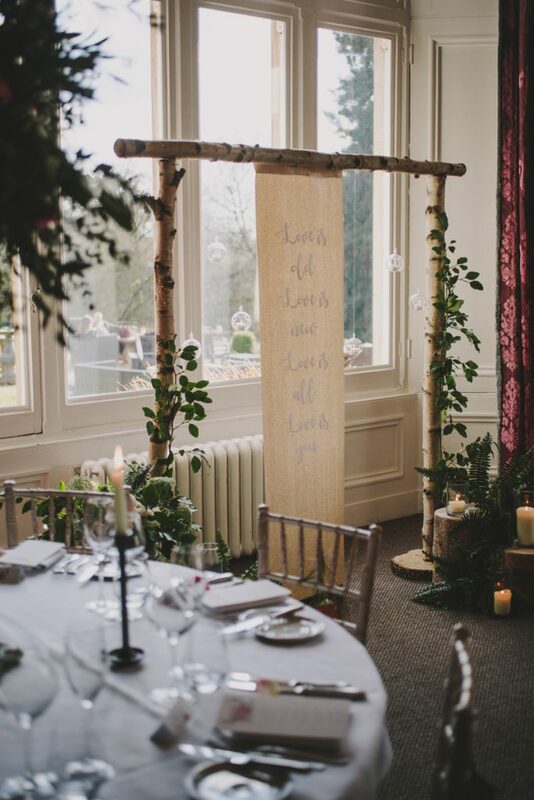 At the recent Hampton Manor wedding fair, we showed our birch arch as a backdrop with a bespoke scroll hanging from it. 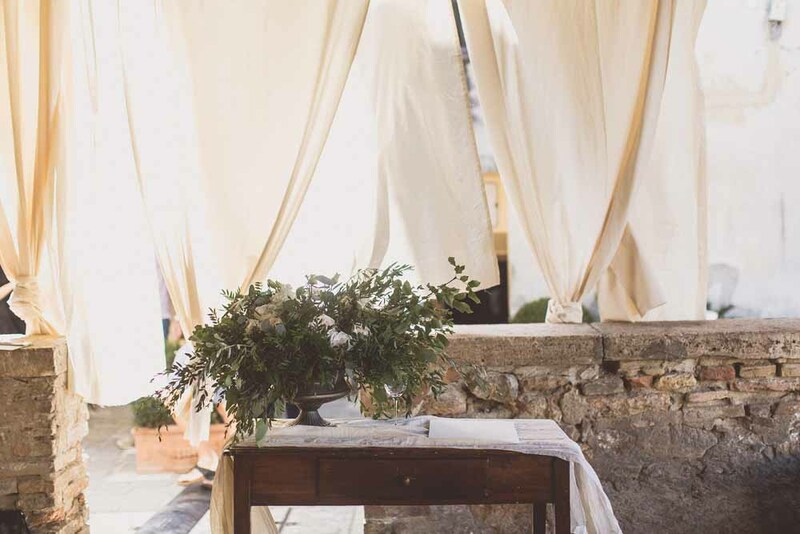 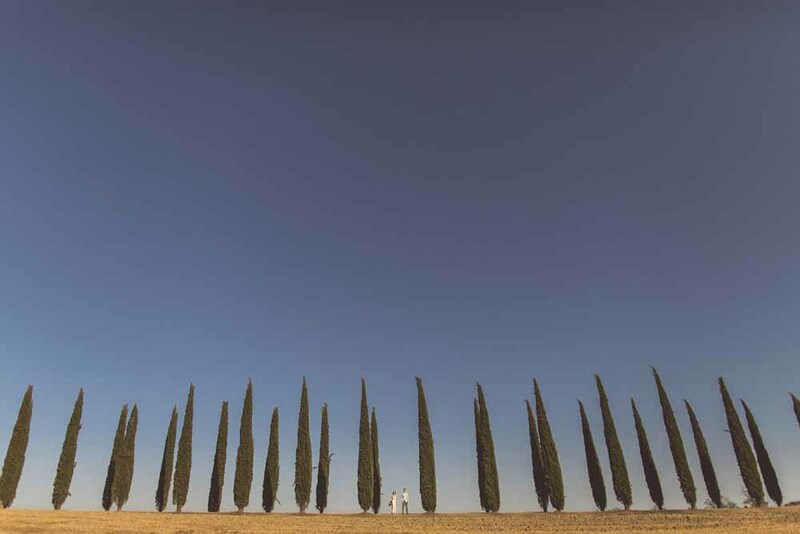 This backdrop could be used behind the wedding ceremony, behind a top table or behind a cake table or dessert bar. 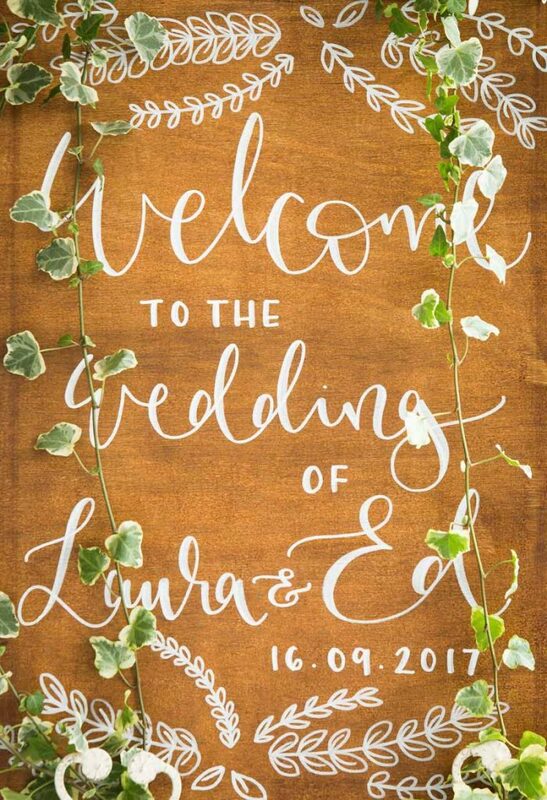 The scroll reads “Love is old, love is new, love is all, love is you” but we would love to create this to say something of your choice. 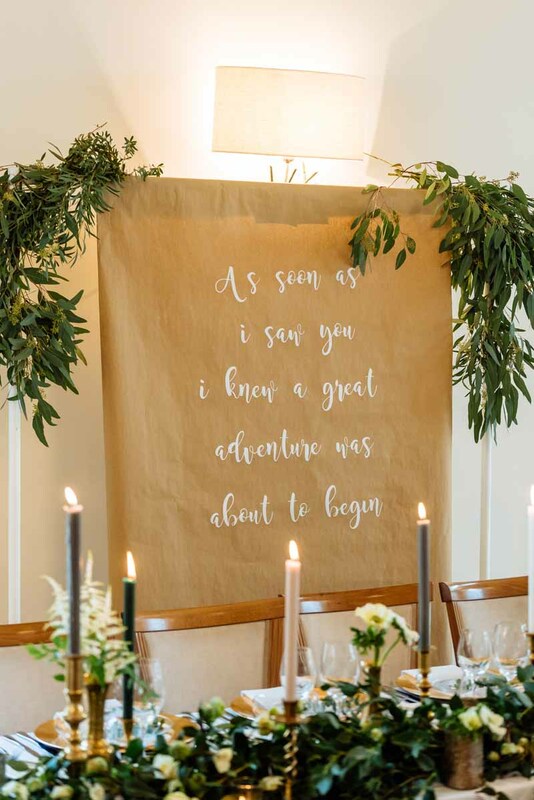 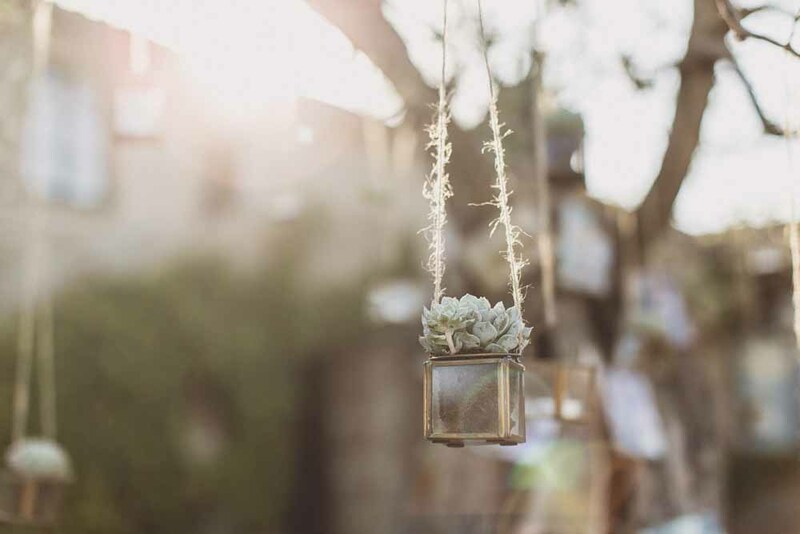 A wedding backdrop is a great styling trick to add to your venue decor. Here a pared-back birch arch has a personalised scroll and delicate foliage, glass hanging baubles, rustic tree stumps, an abundance of candles and relaxed planting and florals to create a great backdrop for your wedding day. 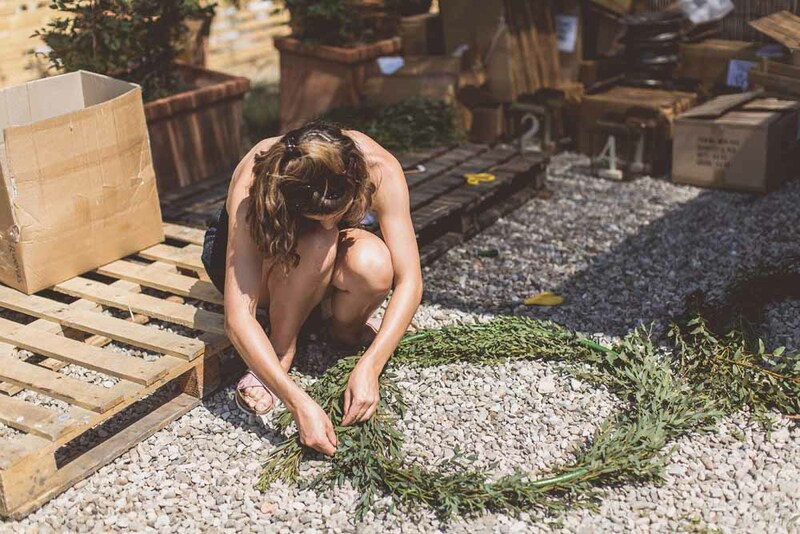 For an alternative wreath, we created an asymmetric floral decoration around an old cartwheel, perfect for welcoming guests to your wedding ceremony. 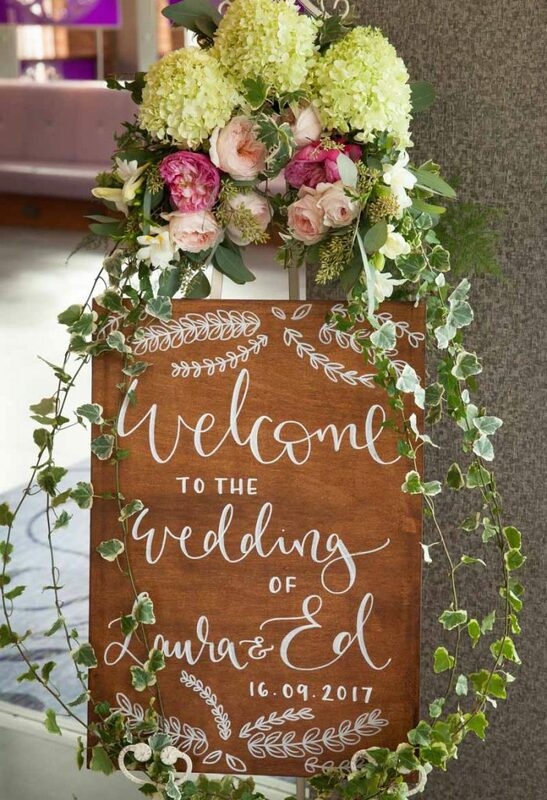 Here the arrow reads flowers, but for a ceremony, we could change it to welcome, or later for drinks or bar. 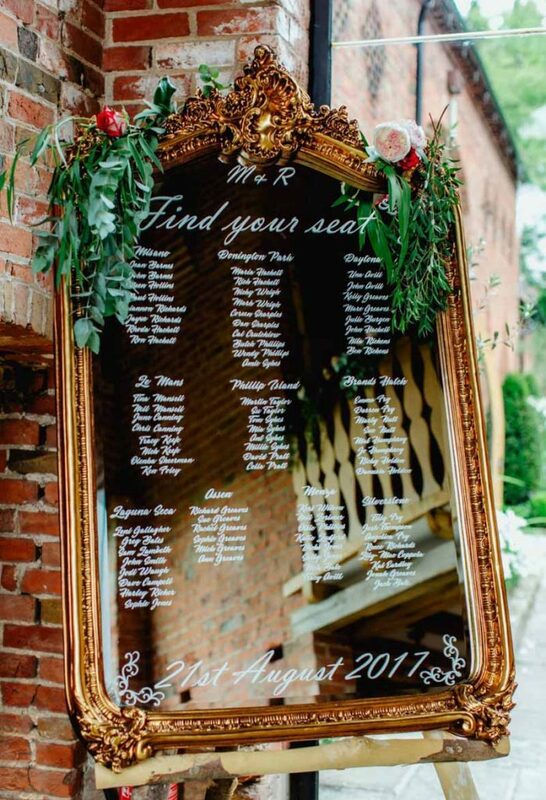 Looking for tall wedding centrepice ideas for your Hampton Manor wedding? 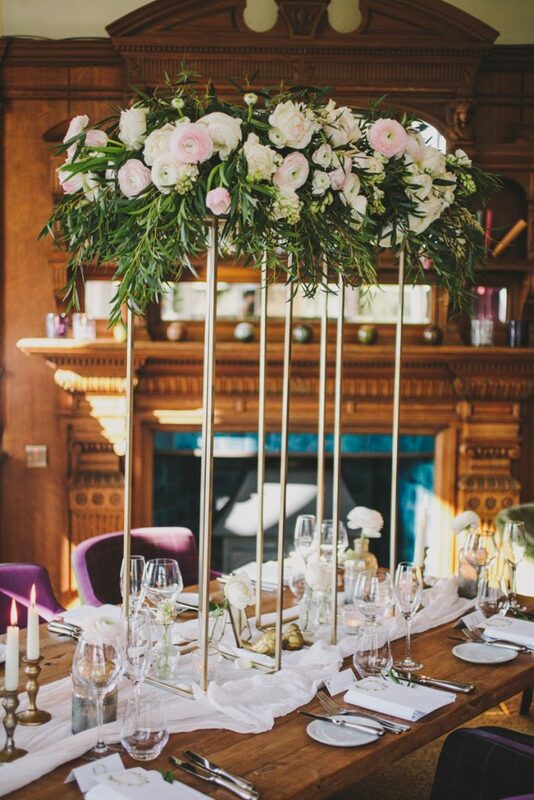 Hampton Manor suits tall centrepieces. 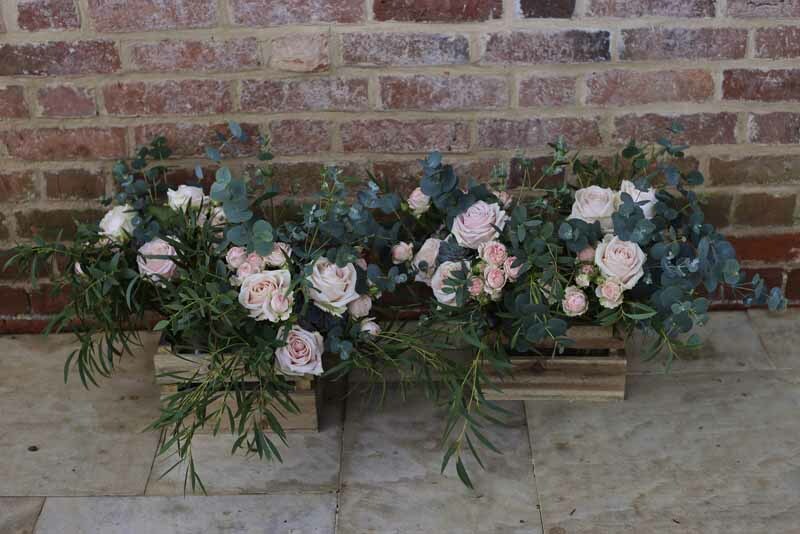 At the spring wedding fair we showed our two newest floral stands both of which would be perfect for Hampton Manor, depending on your style. 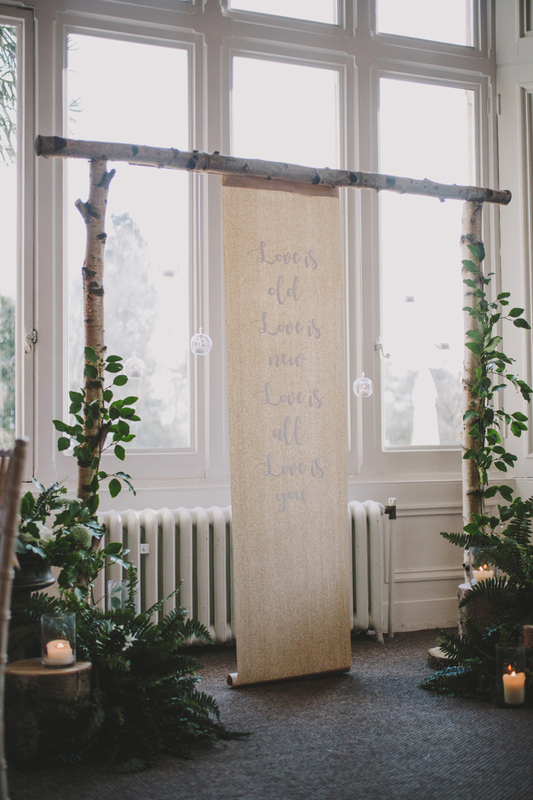 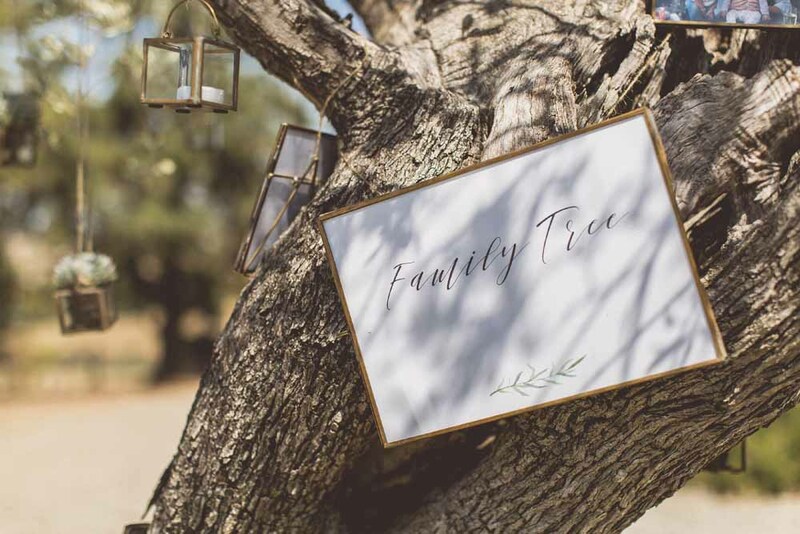 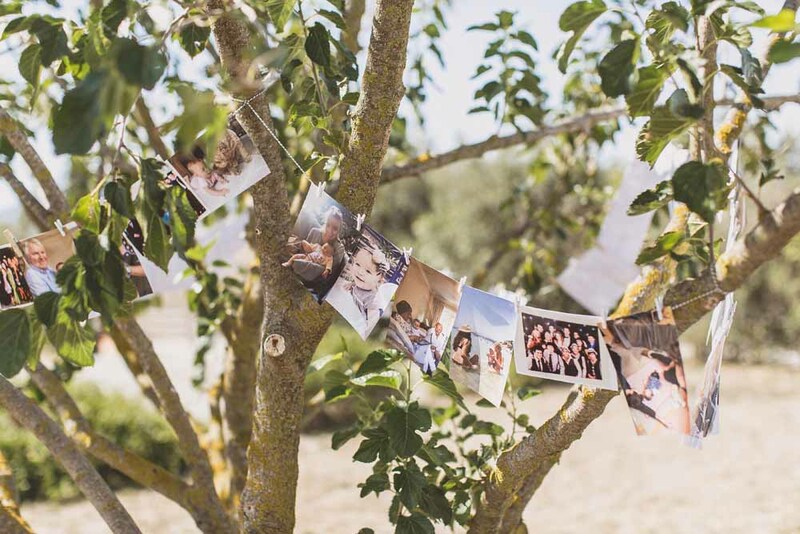 This rustic branch stands would also suit barn wedding venues, or could be used as floor standing arrangements to frame your ceremony in The Birches and later used on the tables. 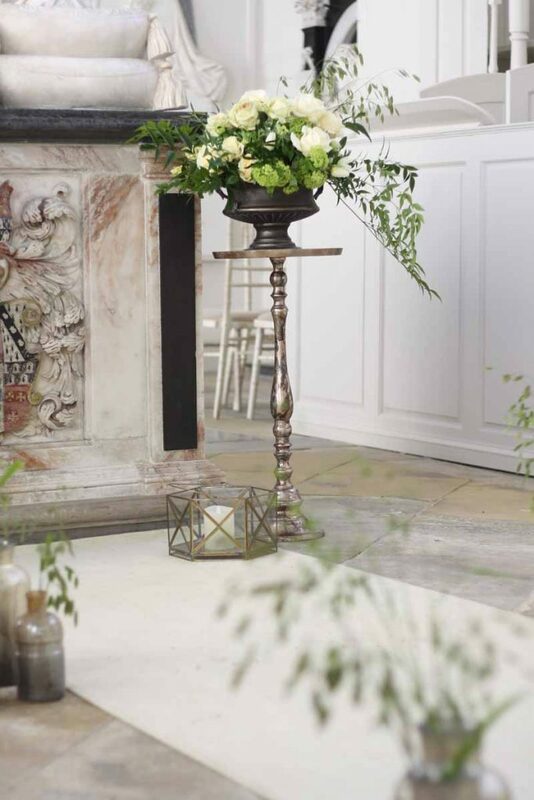 Tall gold stands are great for adding height and a WOW factor to a room. 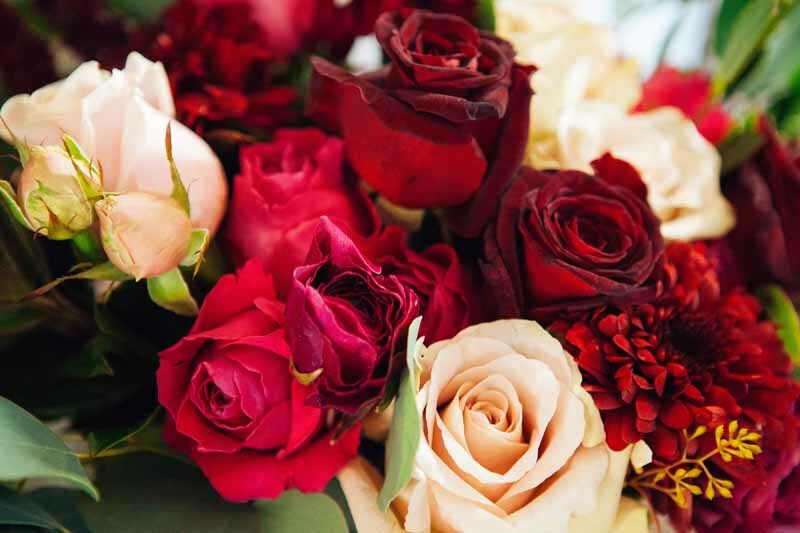 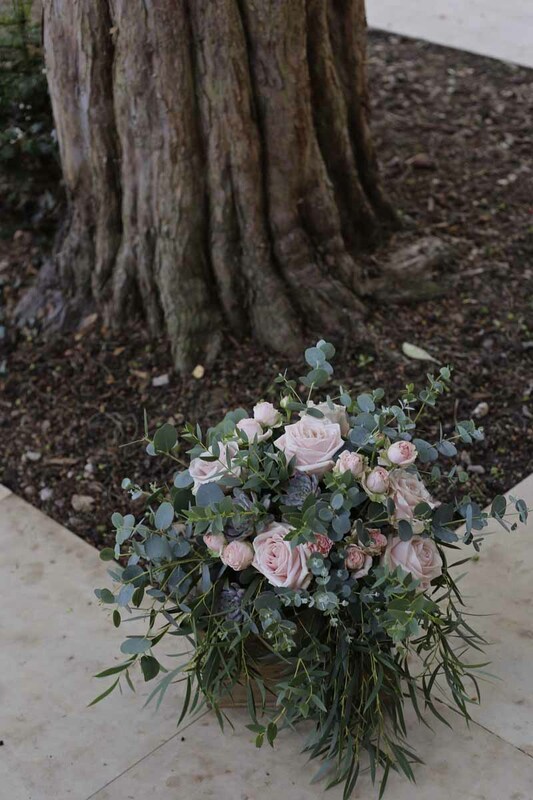 Here a lush arrangement with trailing foliage and a mix of scented roses, ranunculus, tuberose and tulips filled the room with scent and romance. 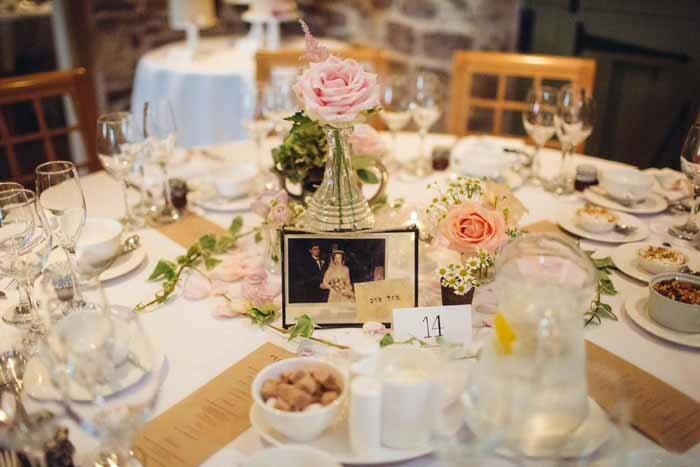 The stands can be set out along tables or to form a top table arrangement. 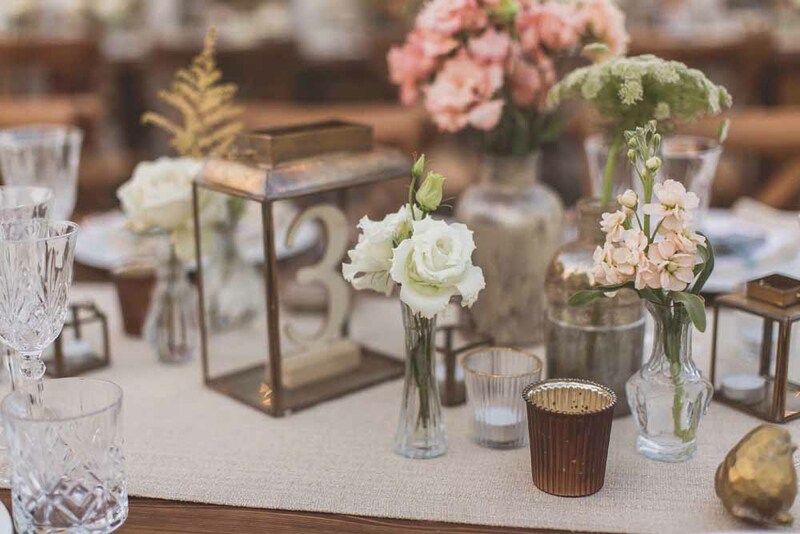 Smaller vases and candlesticks along the table finish the look. 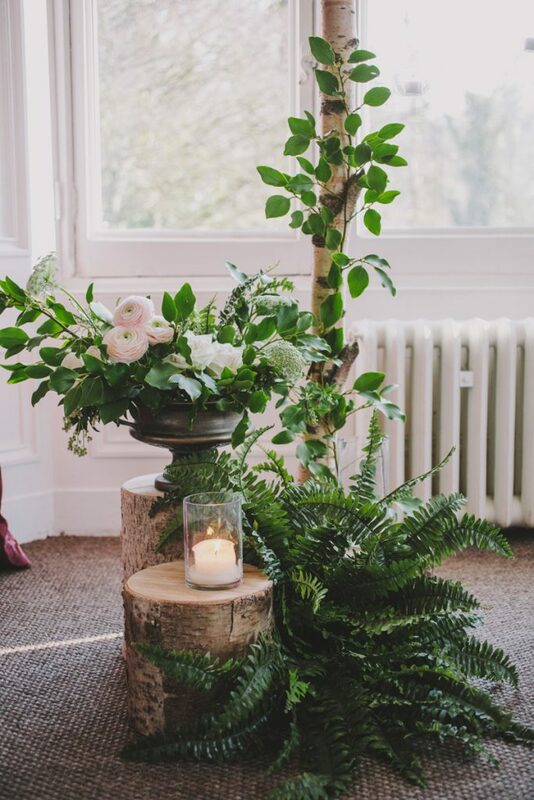 Tall bronze branch stands add an element of drama to the room, they suit relaxed mixed foliage displays with highlights of seasonal blooms. 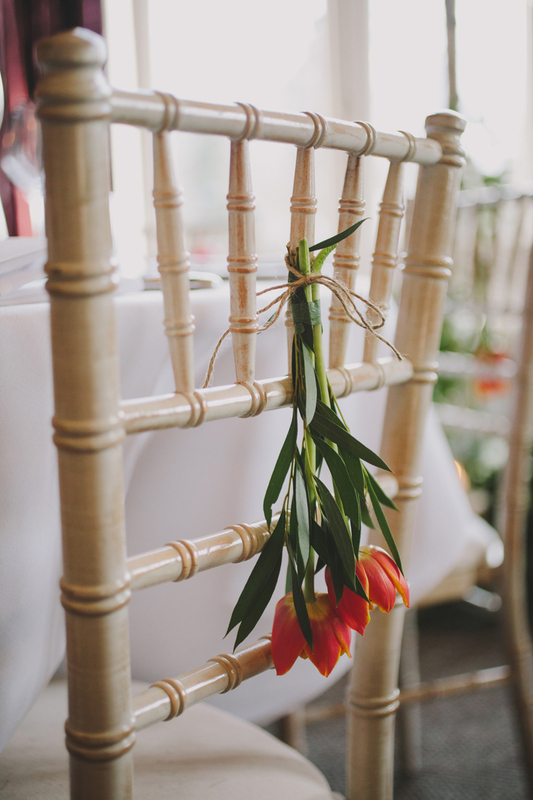 Here we added a mix of beautiful English tulips perfect for a spring wedding. 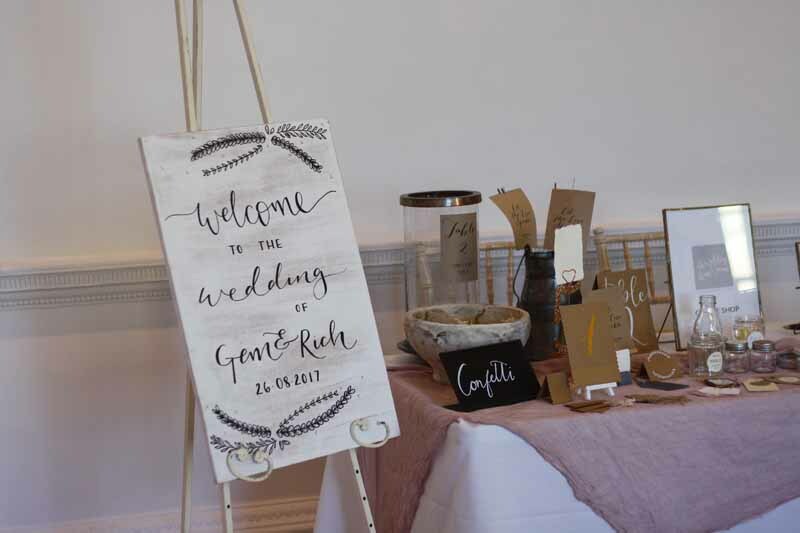 These stands can be used floor standing at the entrance to a room, either side of the aisle or ceremony and later for the dinner. 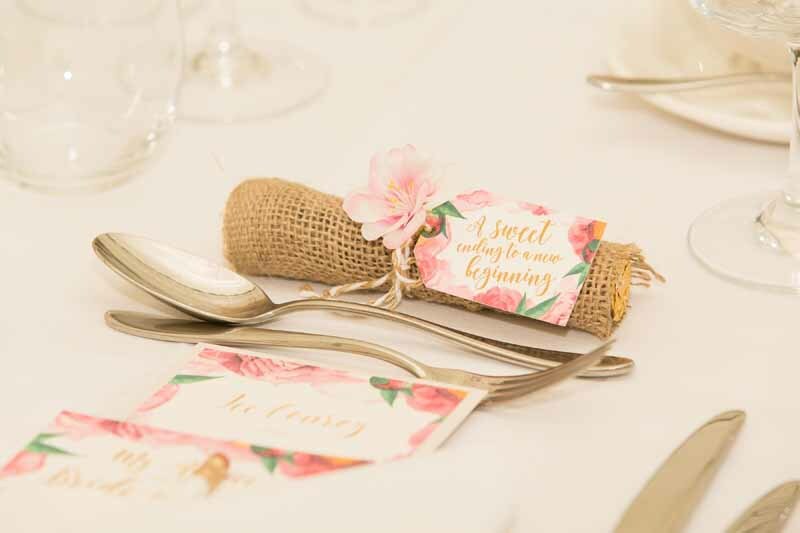 Extra details are always appreciated a single stem to the chair and place setting is a lovely touch. 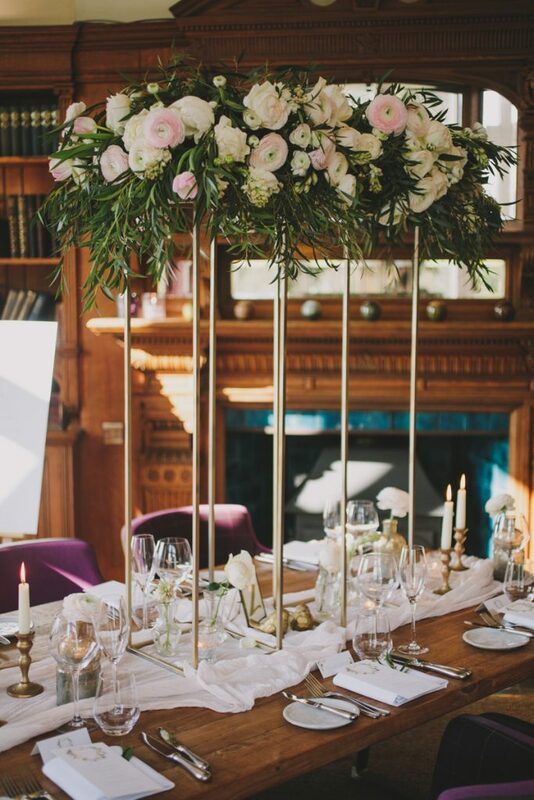 New Year’s Eve is a special time for celebrations and we were honoured to assist Kristin and Tim with their wedding flowers and styling at Hampton Manor. 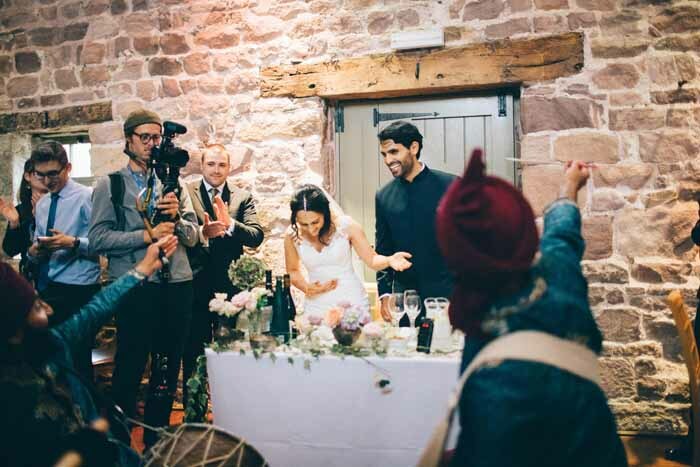 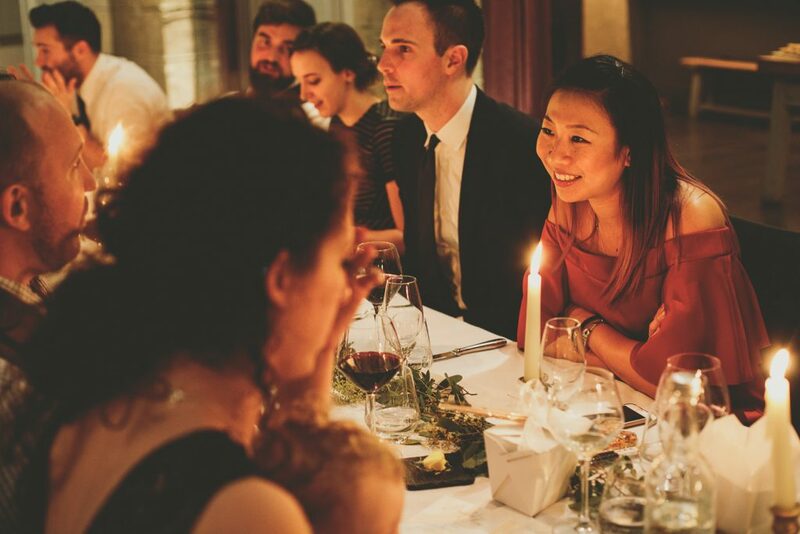 This gorgeous couple chose to come back to England to share their day with family and friends from around the globe. 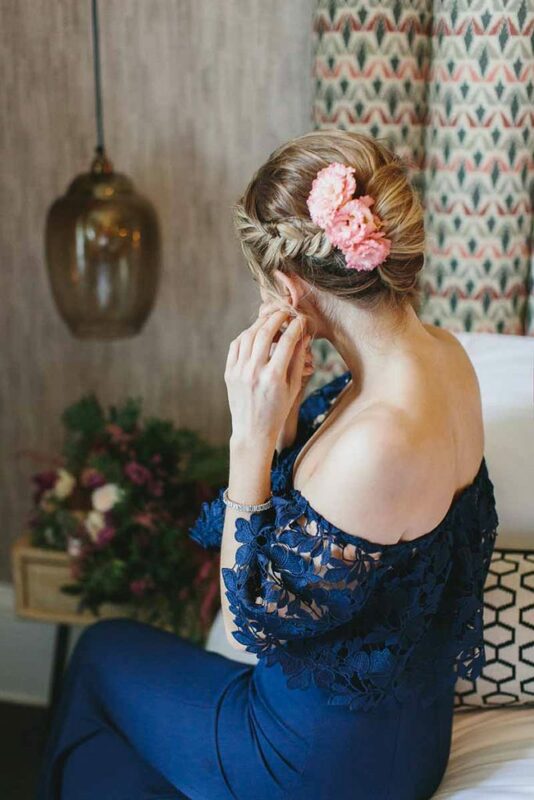 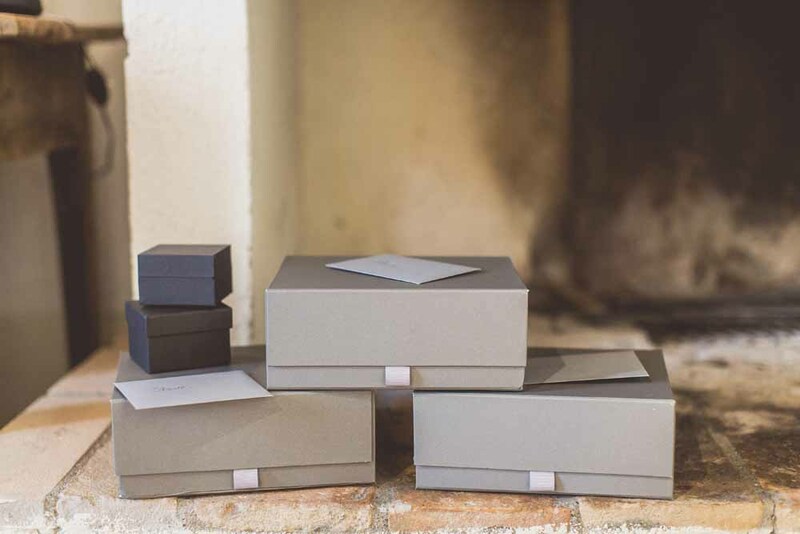 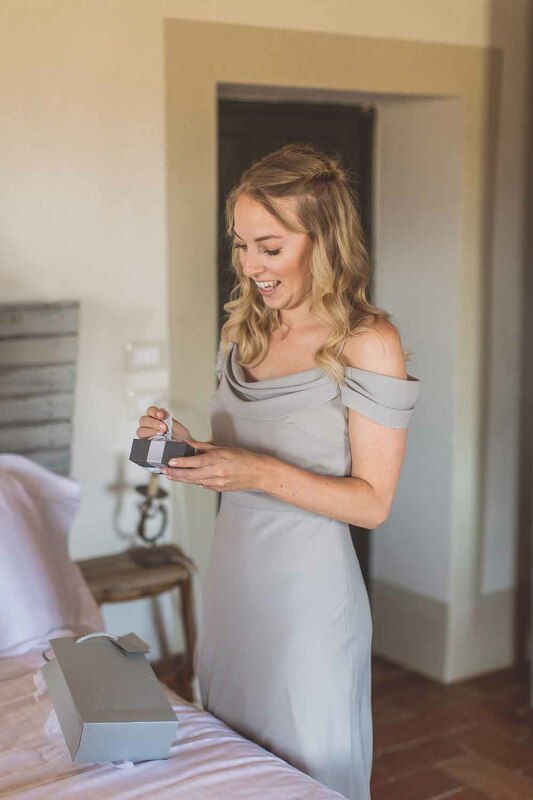 We enjoyed skyping with Kristin who is based in Bejing in the build up to her wedding to ensure we delivered the elegant winter wedding she desired. 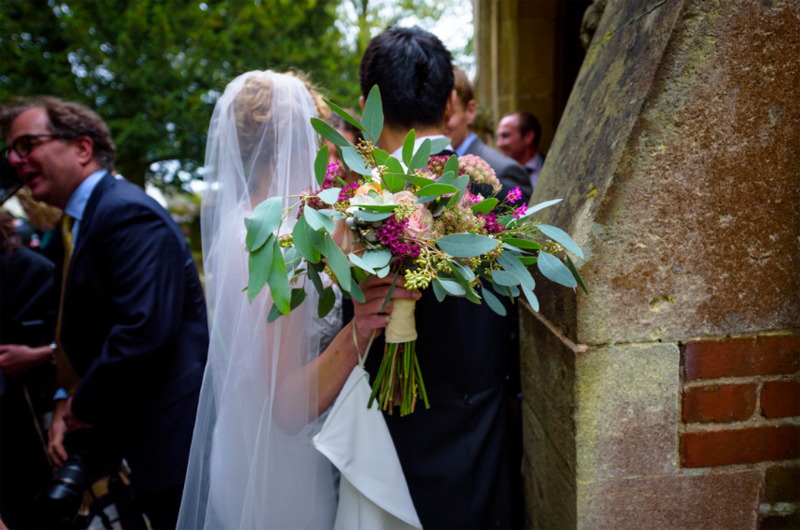 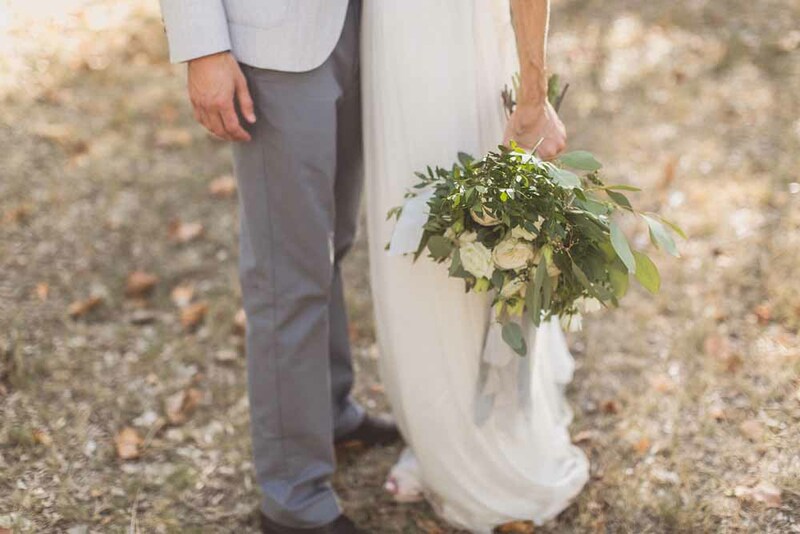 The bouquets were large organic free form is style with a textured mix of foliage eucalyptus, ozmanthus, dotted with brunia berries, thistle, lisianthus, roses, and ranunculus. 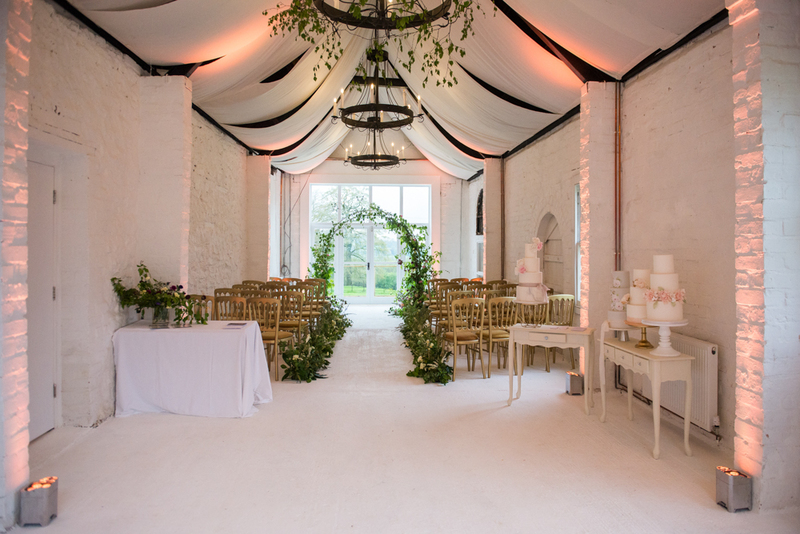 The ceremony was a beautiful affair with a birch arbour trimmed with the softest drapes to create a soft, romantic backdrop. 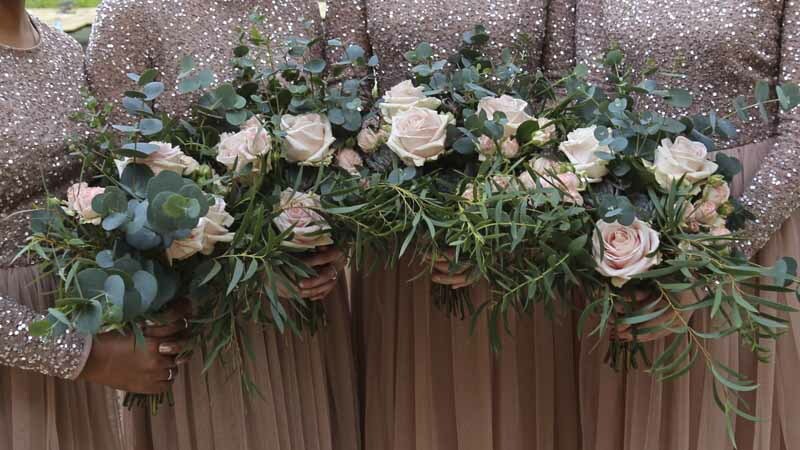 The organic mix of foliage and flowers was continued throughout the day with hand tied bunches of foliage to the aisle chairs to bring the outdoors in. 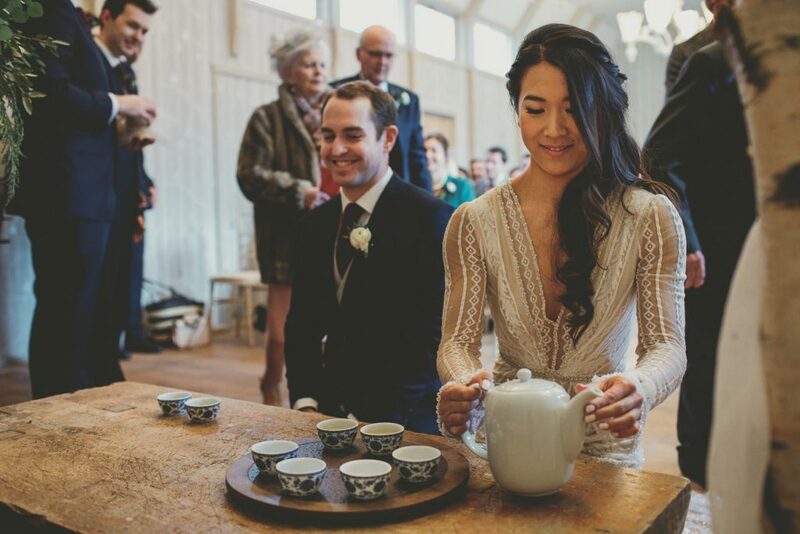 A traditional Chinese tea ceremony was an integral part of the ceremony. 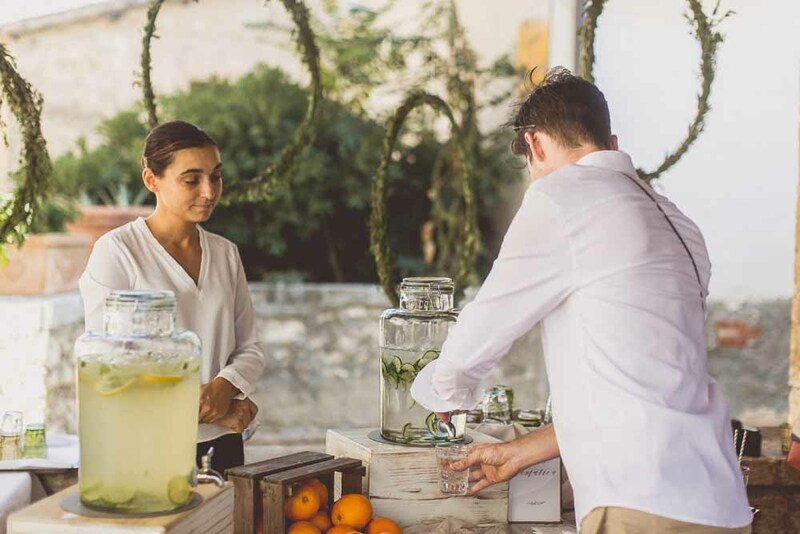 Here tea is lovingly poured by Kristin. 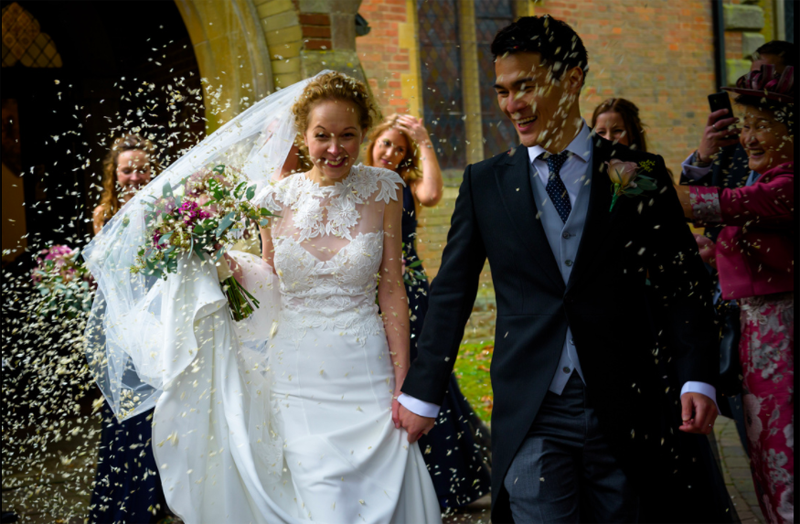 As they left the Birches the Kristin and Tim were showered with confetti to celebrate their marriage. 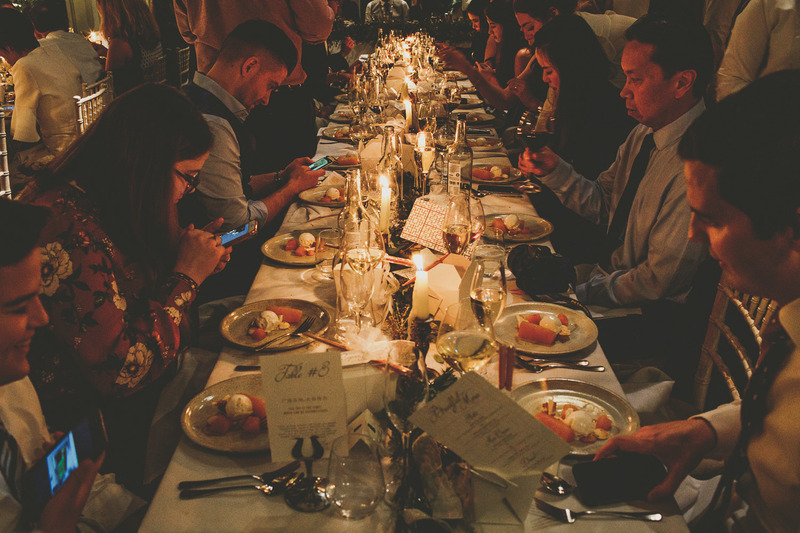 Long tables enabled family and friends from around the globe to connect, chat, and enjoy the food selected for this special wedding day. 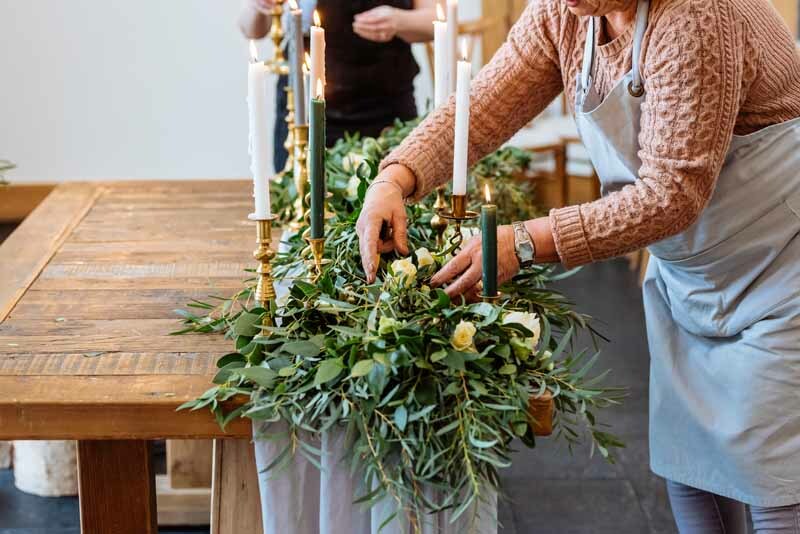 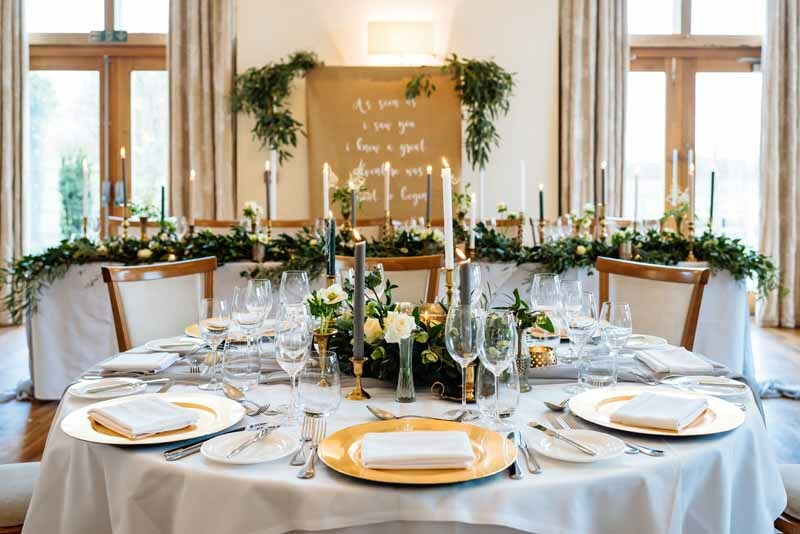 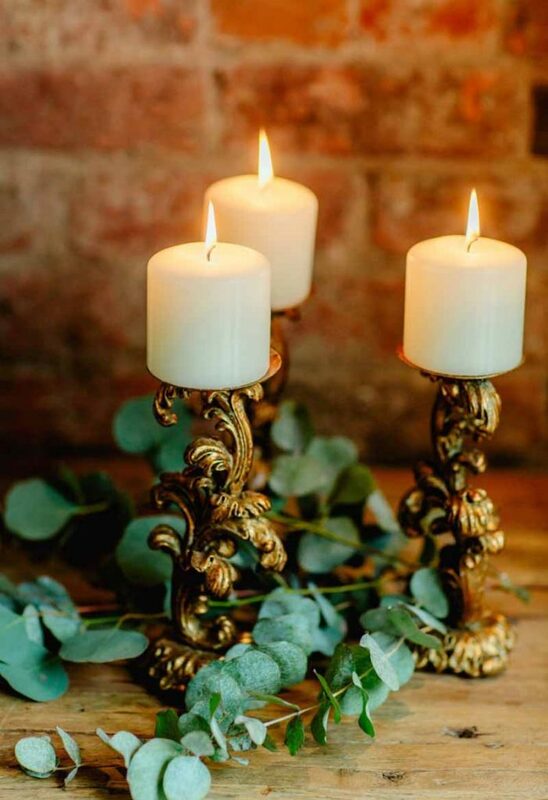 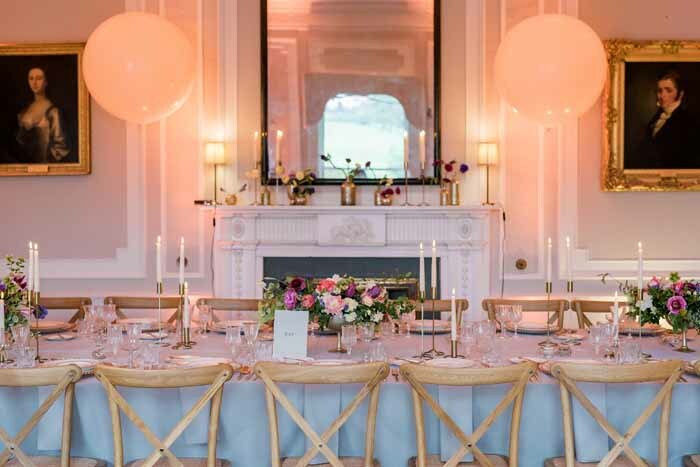 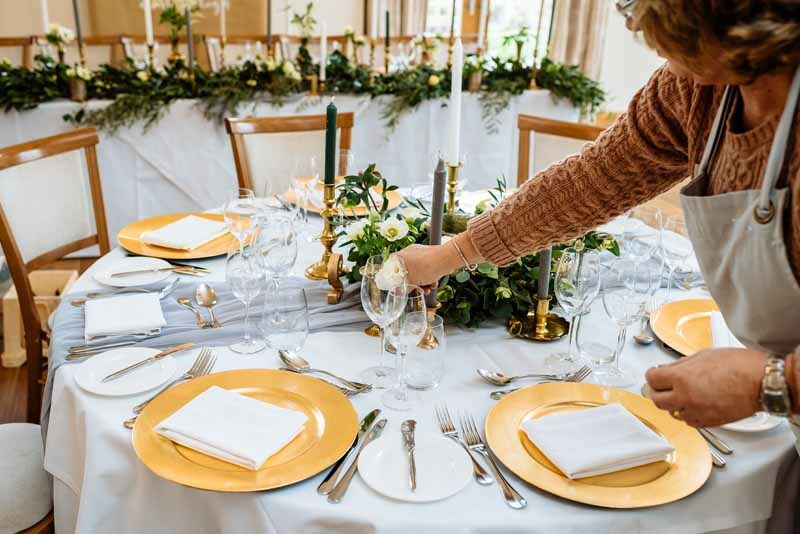 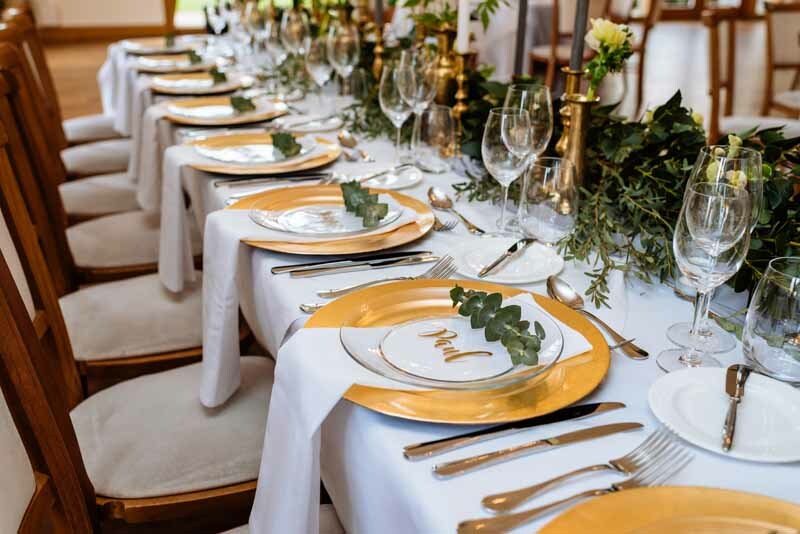 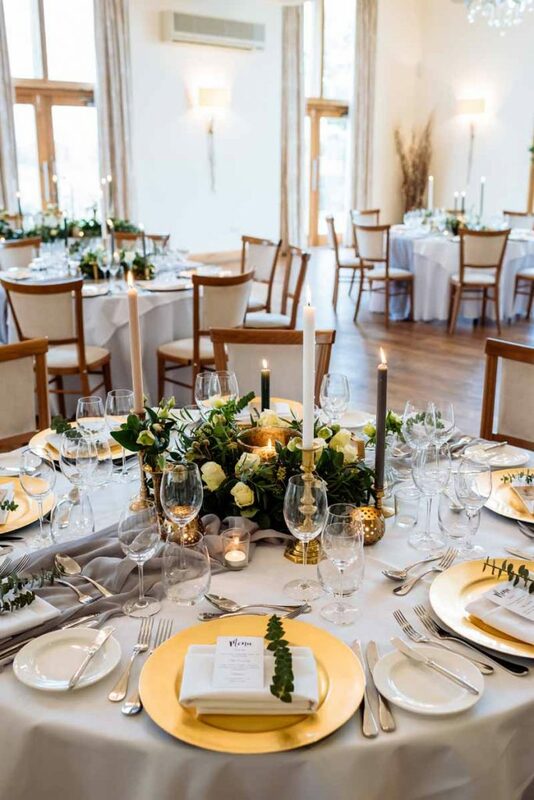 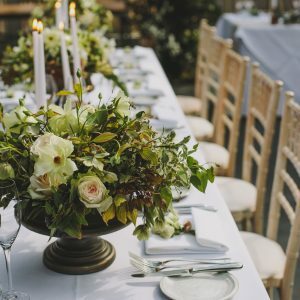 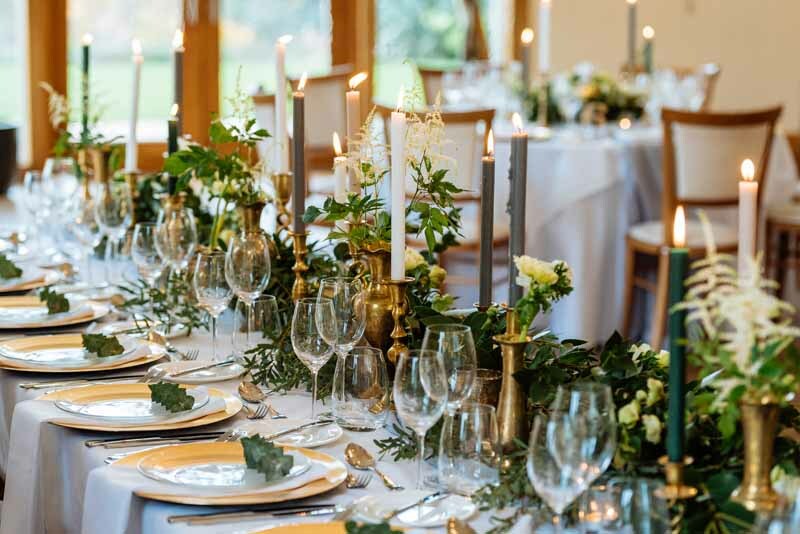 Fresh foliage was entwined the length of the long tables delicately interspersed with touches of white illuminated with gold candlesticks for a romantic look. The evening was enjoyed as guests celebrated and welcomed in the New Year in style under the amazing chandelier in Elizabeth’s Court. 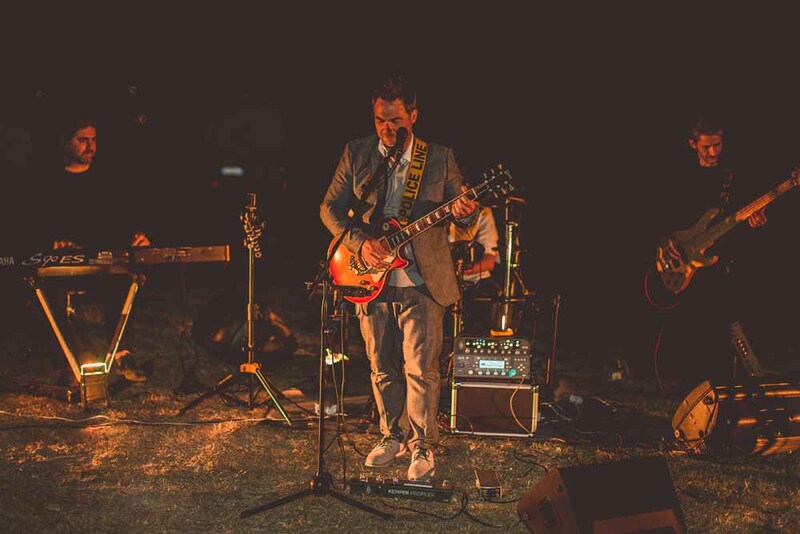 These images are captured by the talented Fjona Weiling. 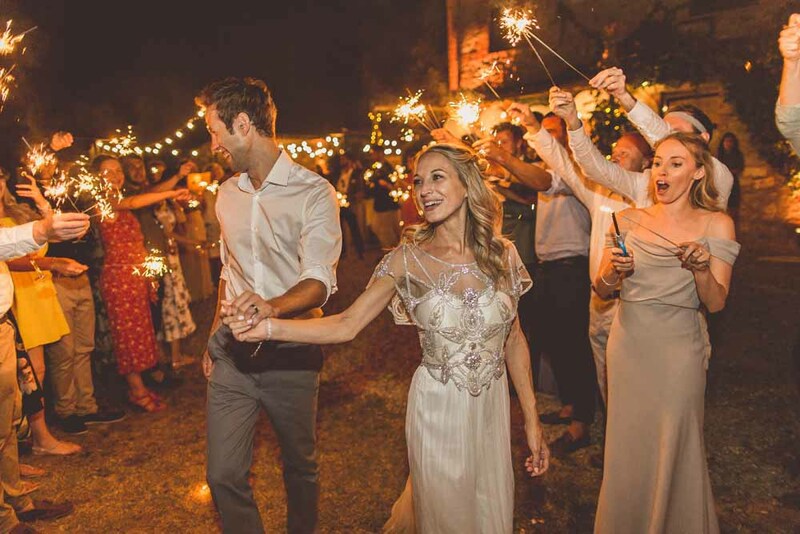 Thank you Kristin and Tim for putting your trust in us, we loved being part of the magic of your New Year’s Eve Wedding. 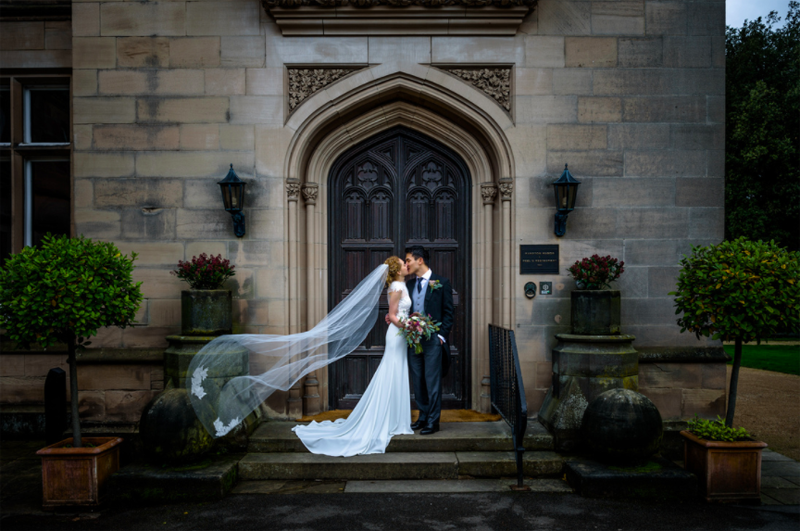 I am delighted to share these photos of a gorgeous December wedding at Hampton Manor. 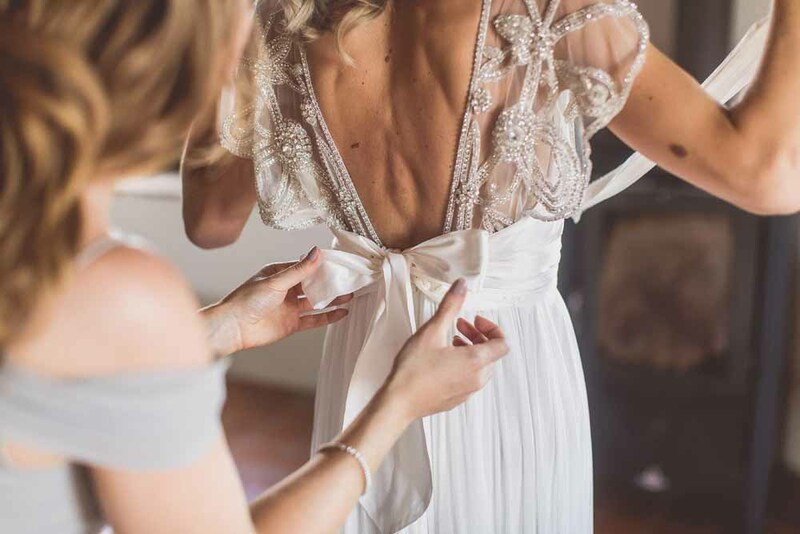 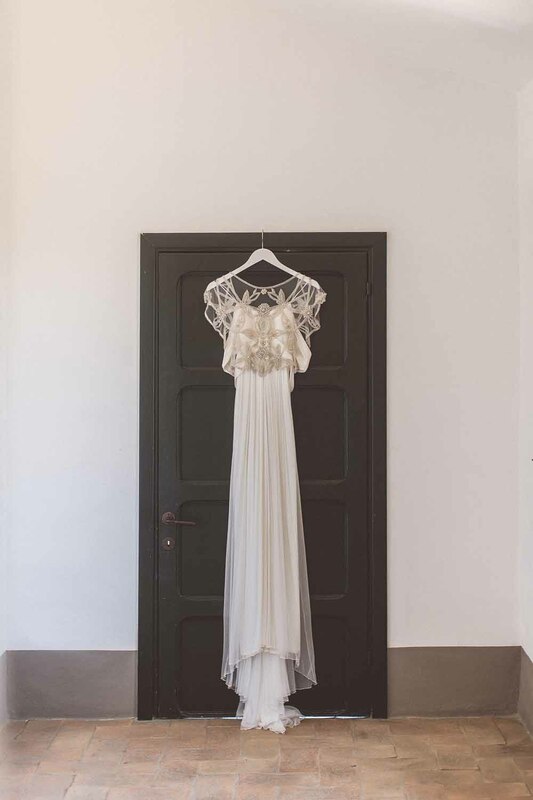 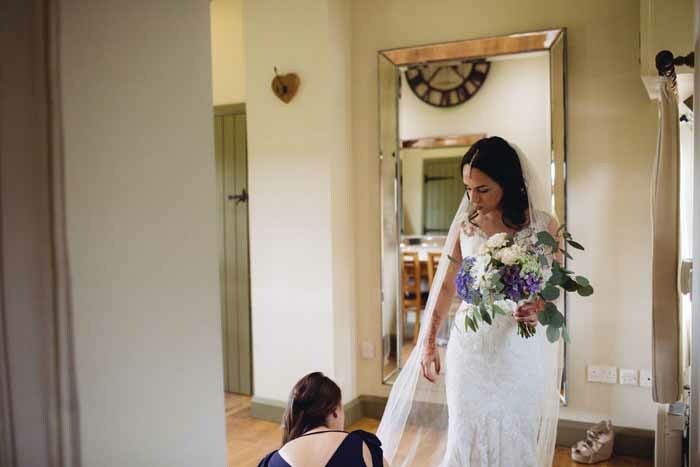 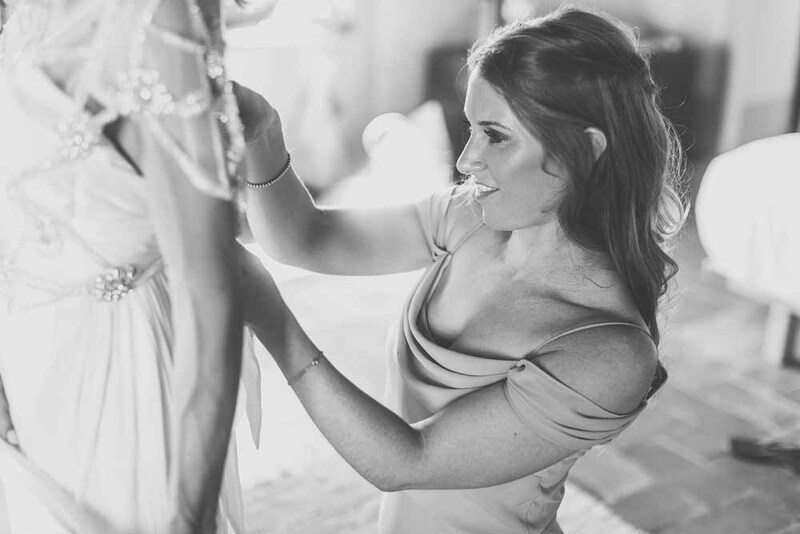 There is always a sense of excitement when visiting a bride on her wedding morning, last minute checks on the bridal bouquet before handing it over and of course seeing the dress hanging up in pride of place. 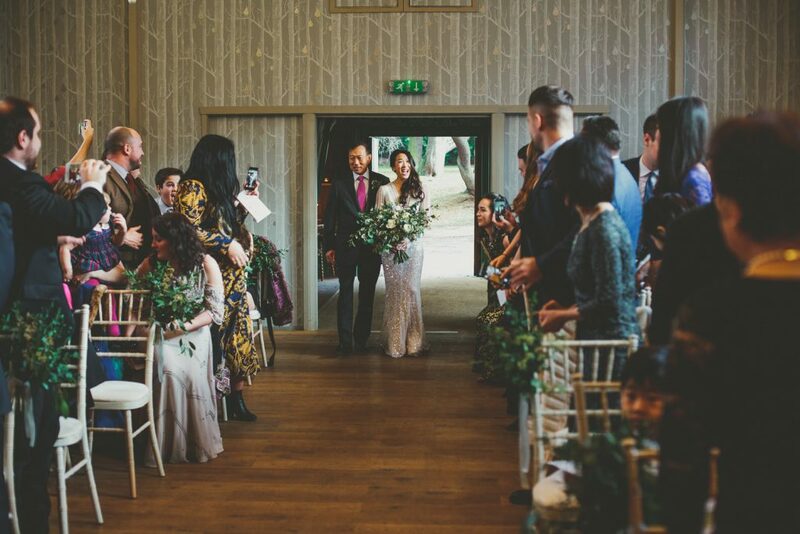 The Birches at Hampton Manor is a graceful ceremony barn and on this December morning the sun shone through to create a beautiful warm environment for this wedding ceremony. 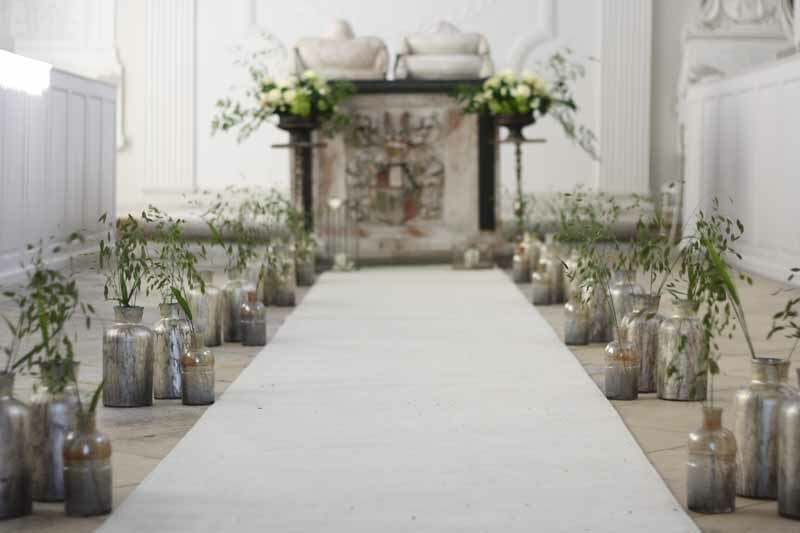 Large stone urns created the backdrop and were overflowing with a bold design with a mix of foliage and flowers. 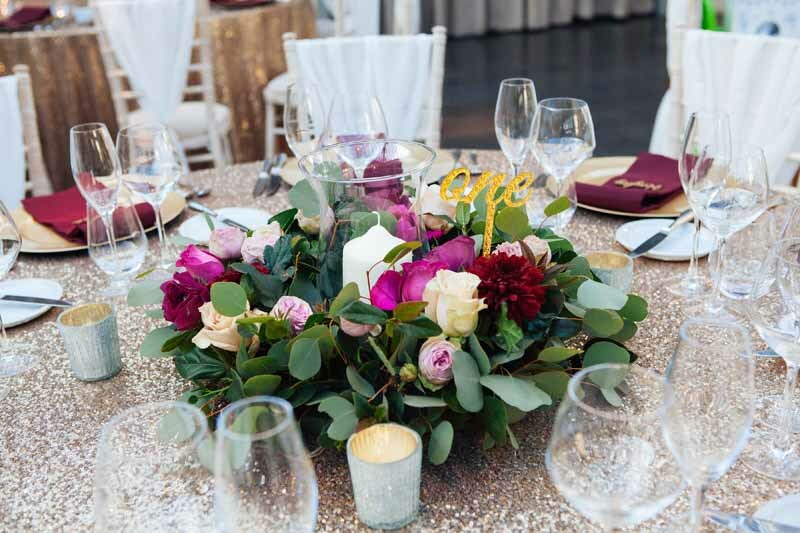 Colour is so important and our couple knew they wanted to have beautiful flowers and warm winter colours for their wedding. 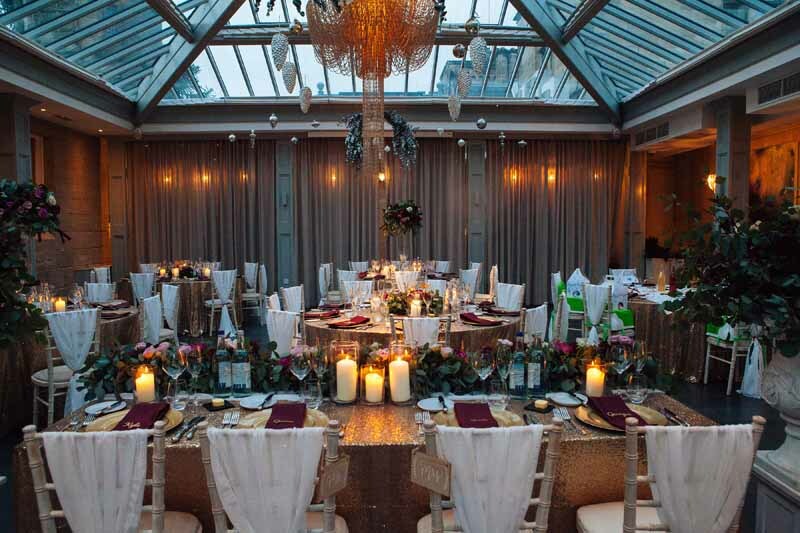 The room looked splendid with these gorgeous sequin cloths and deep burgundy napkins with individual pace settings. 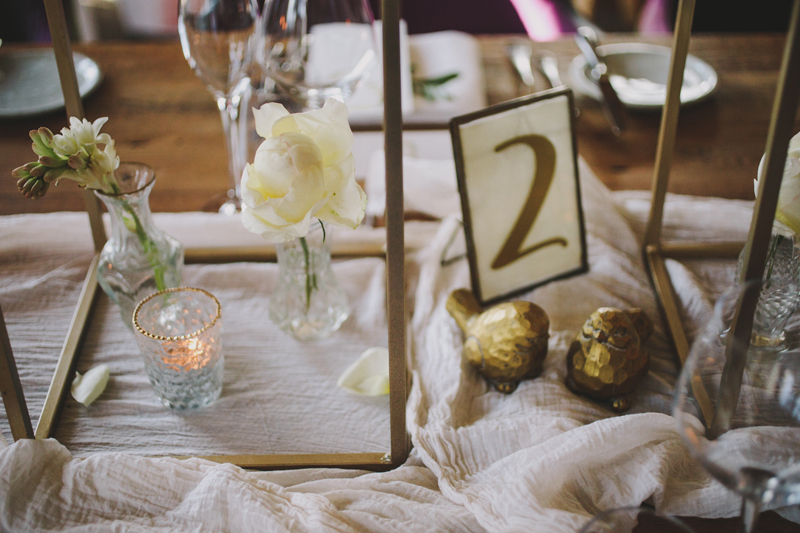 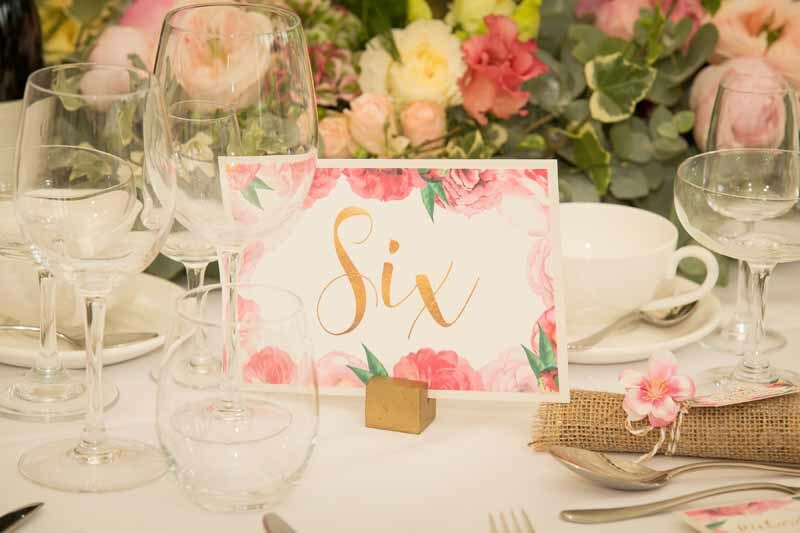 The gold table numbers kept to the warm elegant look and the tables had a mix of high and low centrepieces. 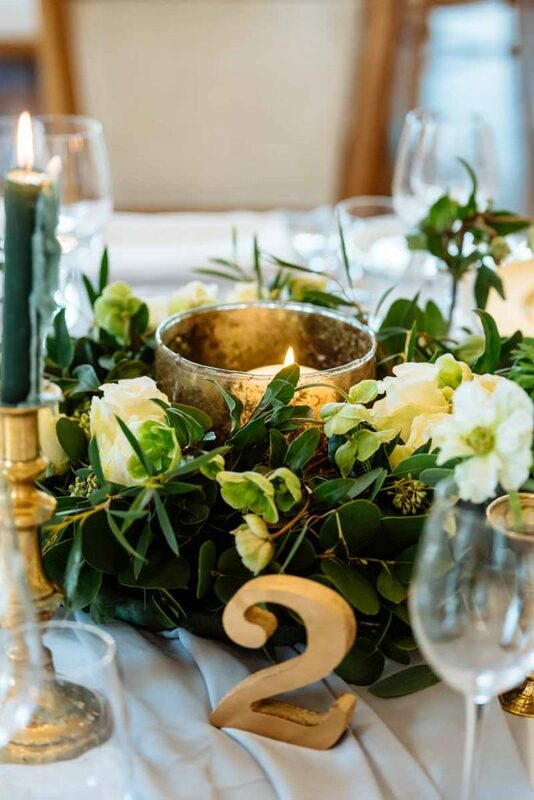 The low centrepieces featured a glass hurricane vase with candle set inside a lush ring of eucalyptus foliage and a mix of roses. 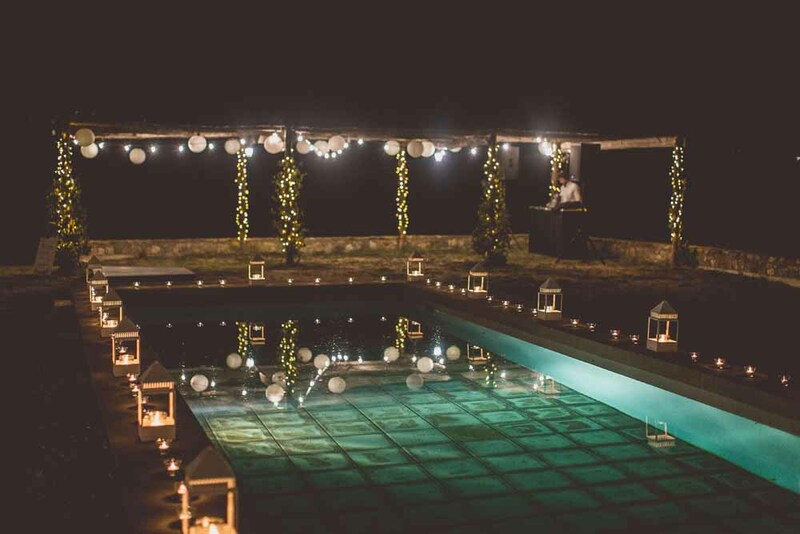 Extra details were added with the tea lights. 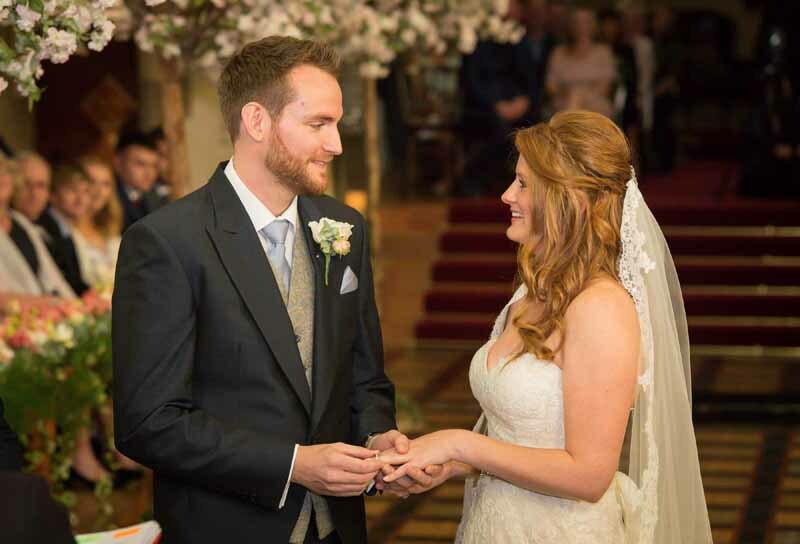 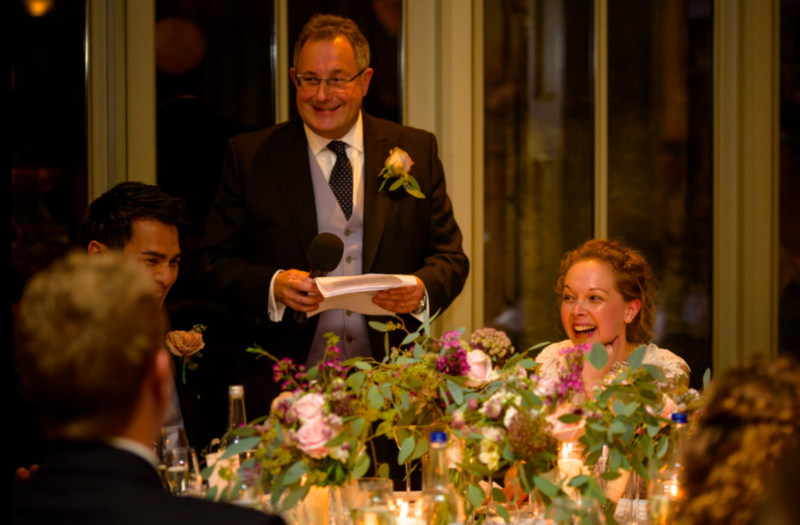 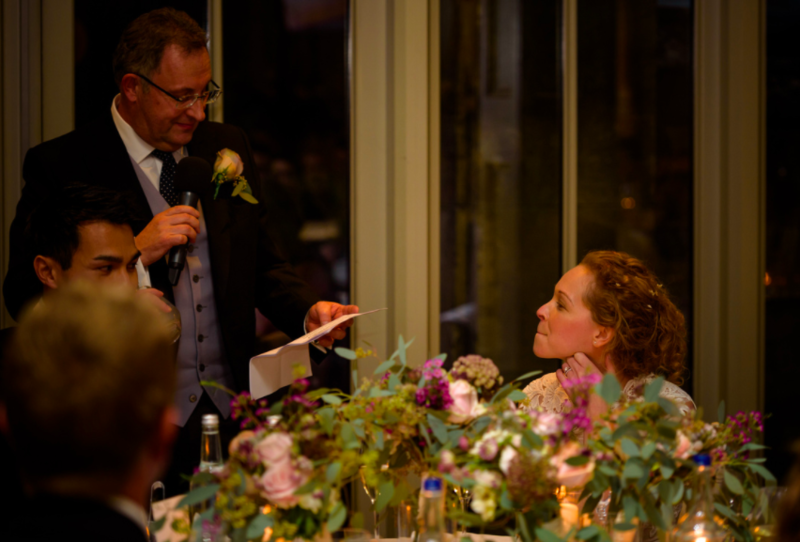 I was delighted to receive such a lovely note from Mr and Mrs Walton after their wedding. 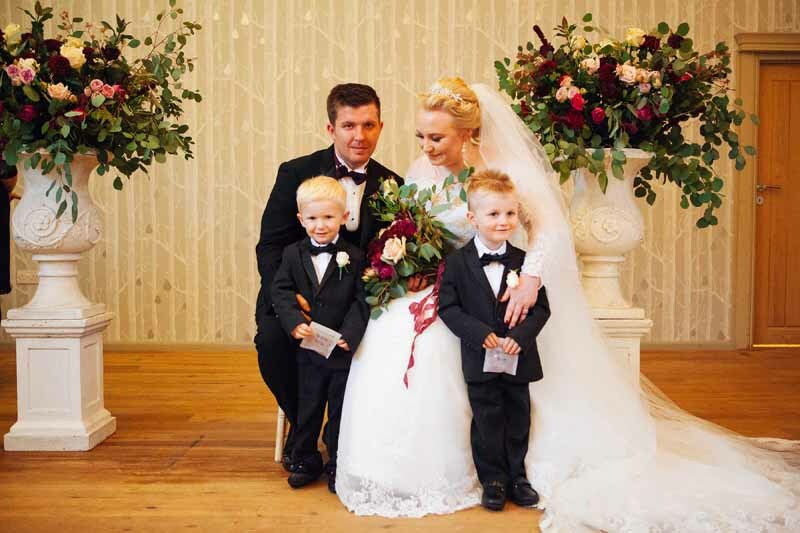 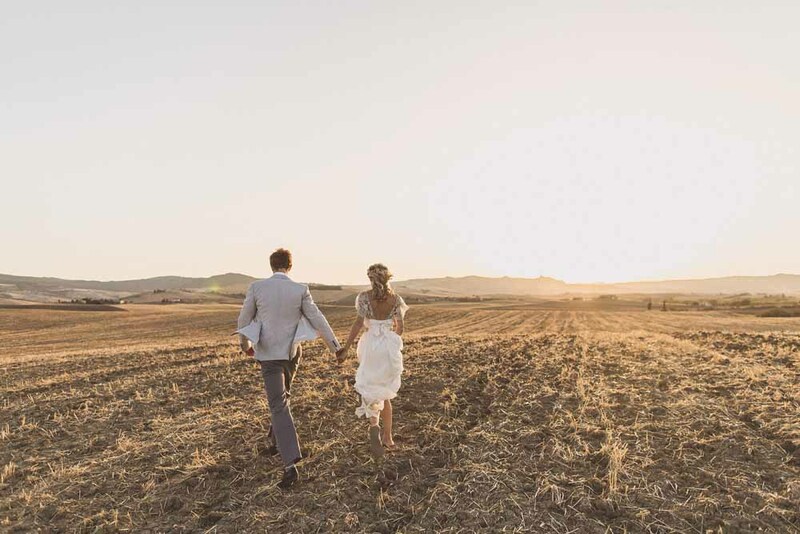 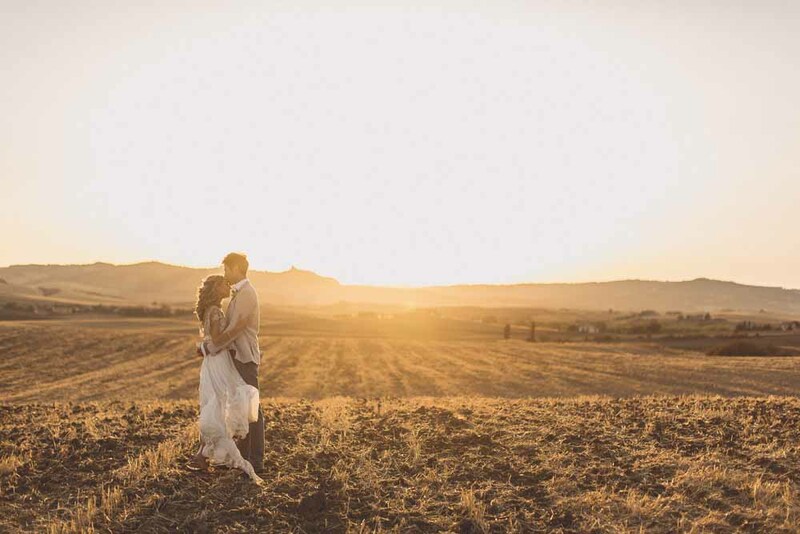 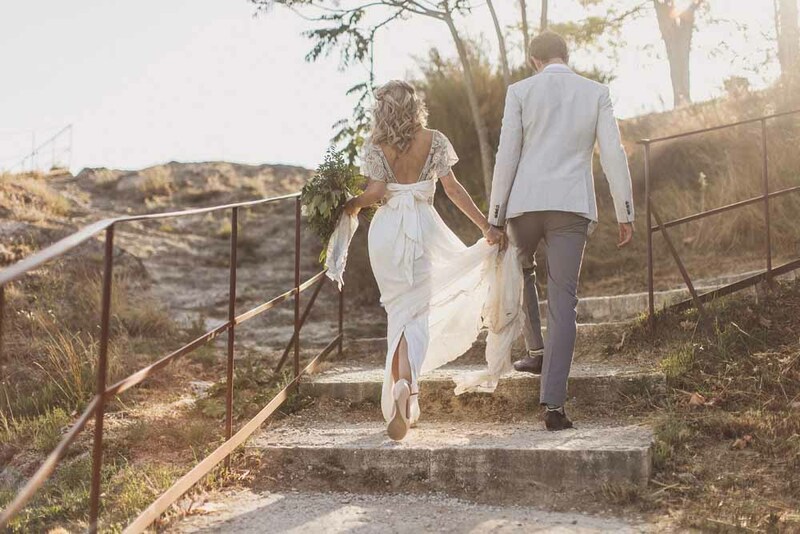 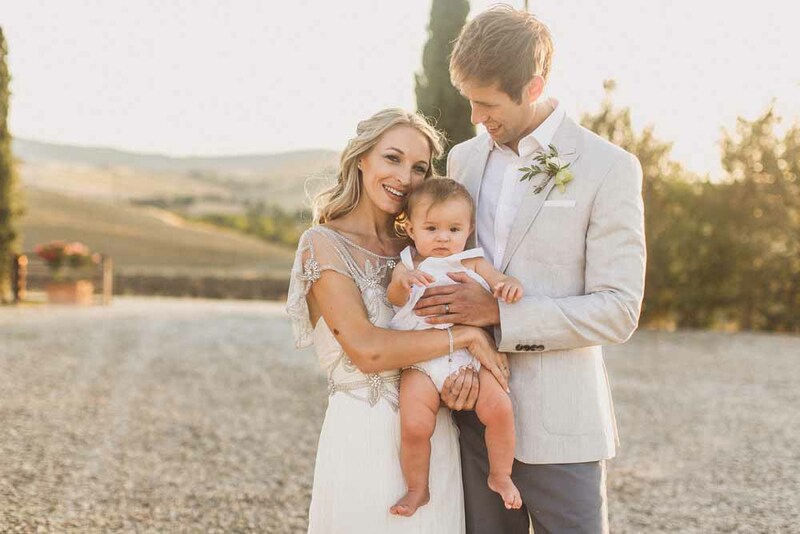 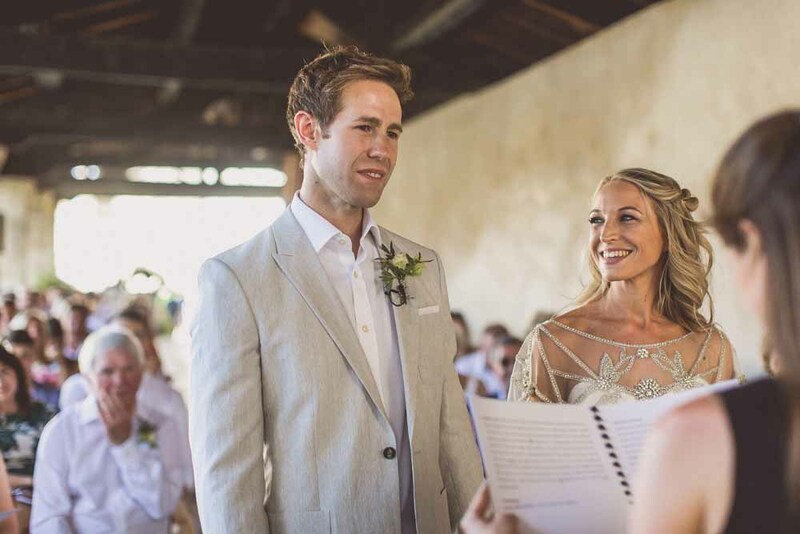 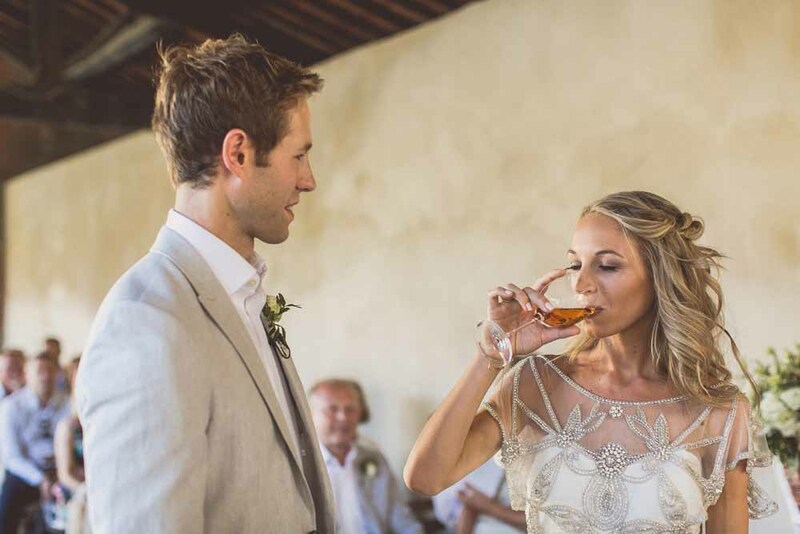 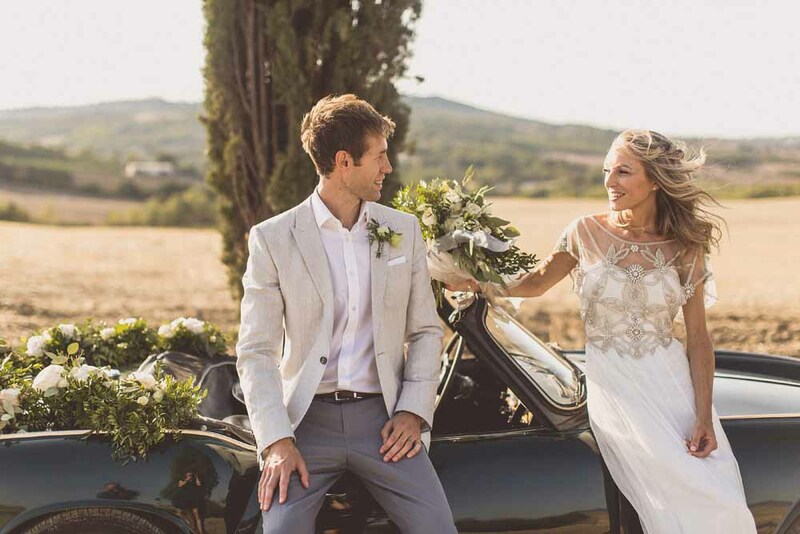 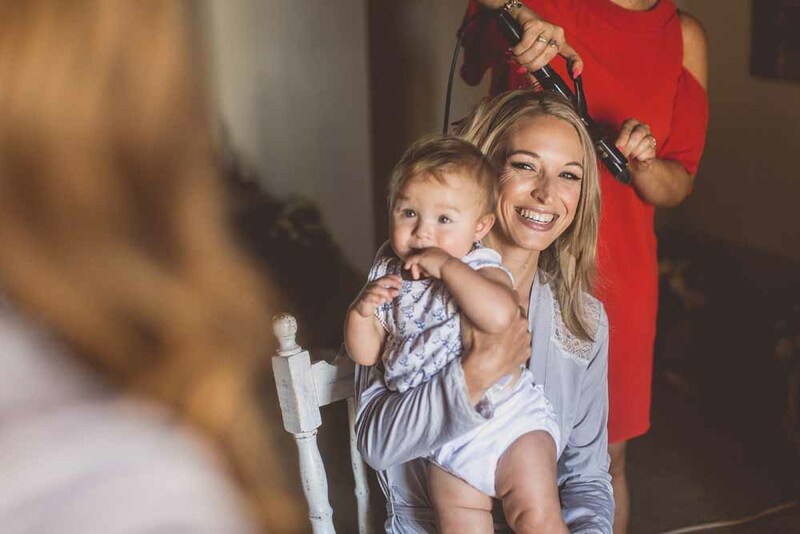 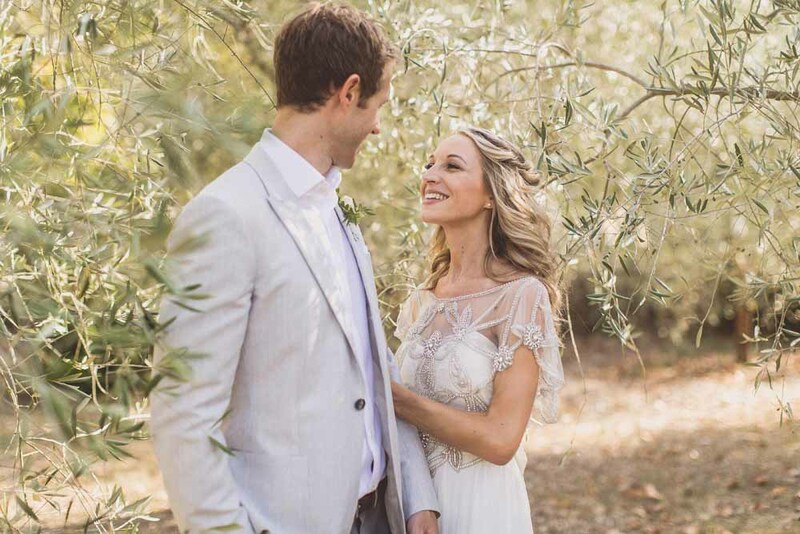 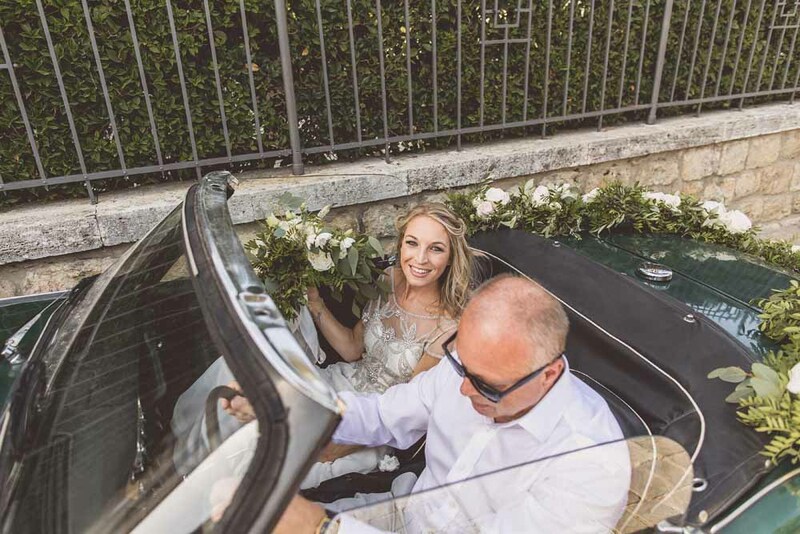 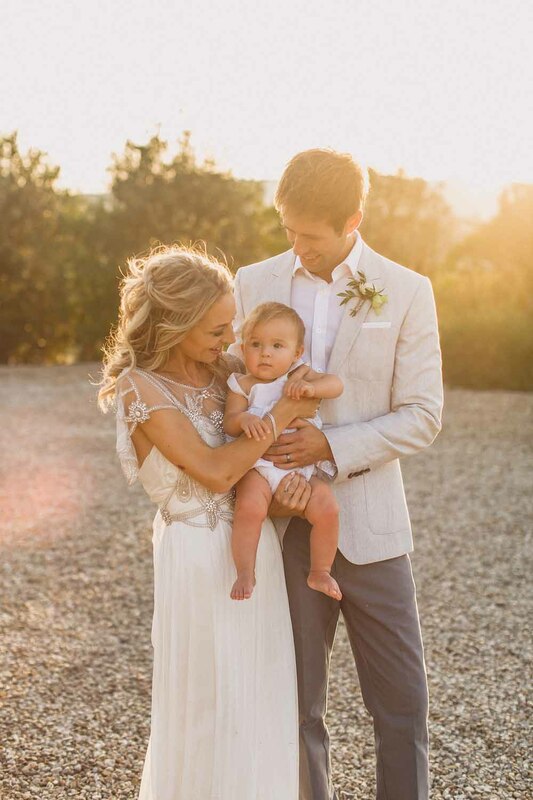 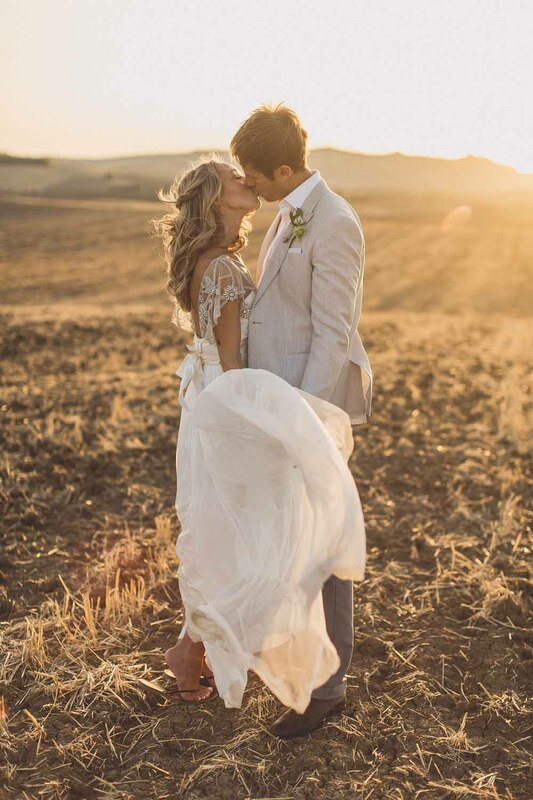 “Karen, everything you created for our wedding day was simply stunning and far better than I ever imagined. 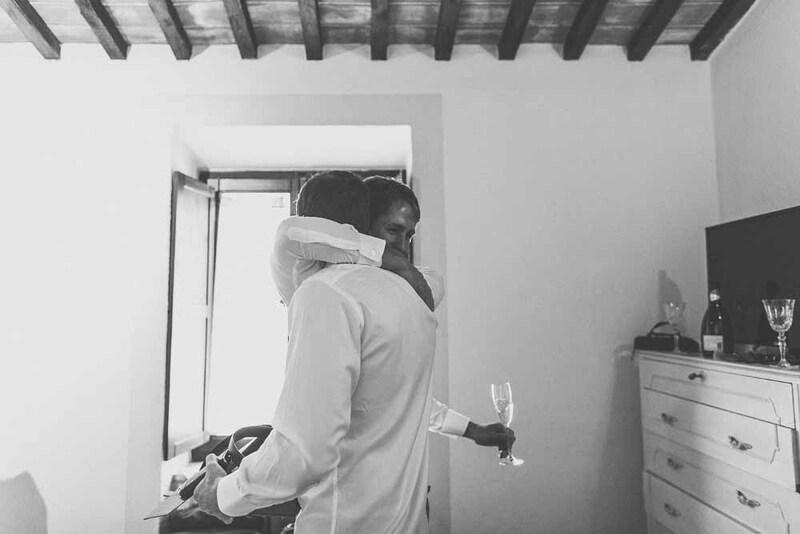 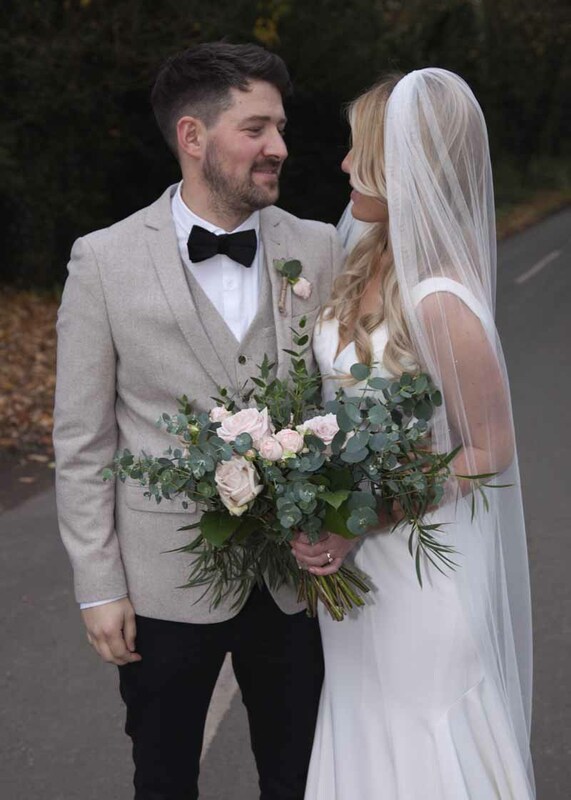 You delivered the wedding of my dreams, it was just perfect. 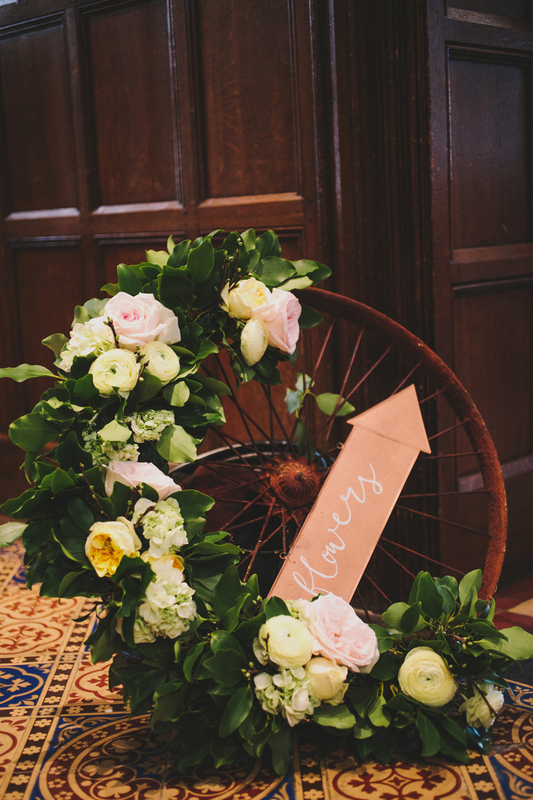 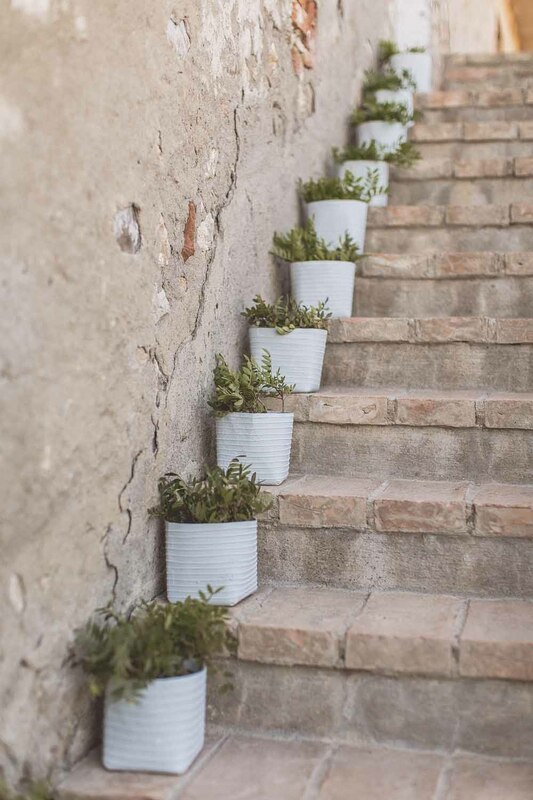 From the very beginning of our planning journey, flowers were always a priority so they were very high up on our list. 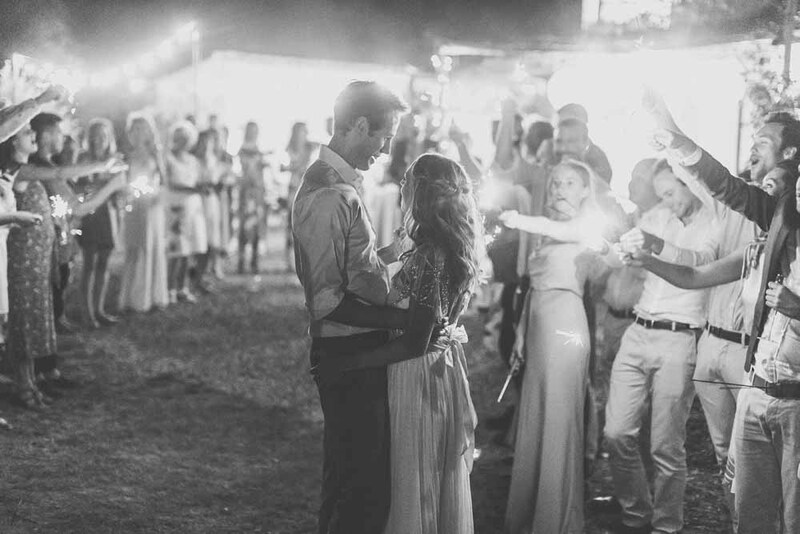 When I came across your previous work I just knew I had found the perfect person for the job. 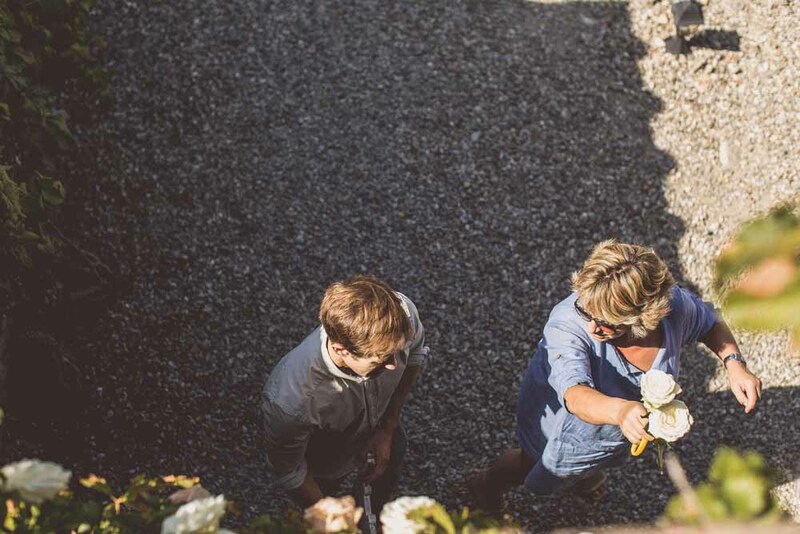 We took a lot of the flowers home with us and admired them for a couple of weeks before they turned. 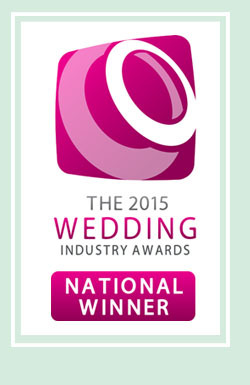 I have pressed a couple to keep and frame them as a lovely keepsake of the day. 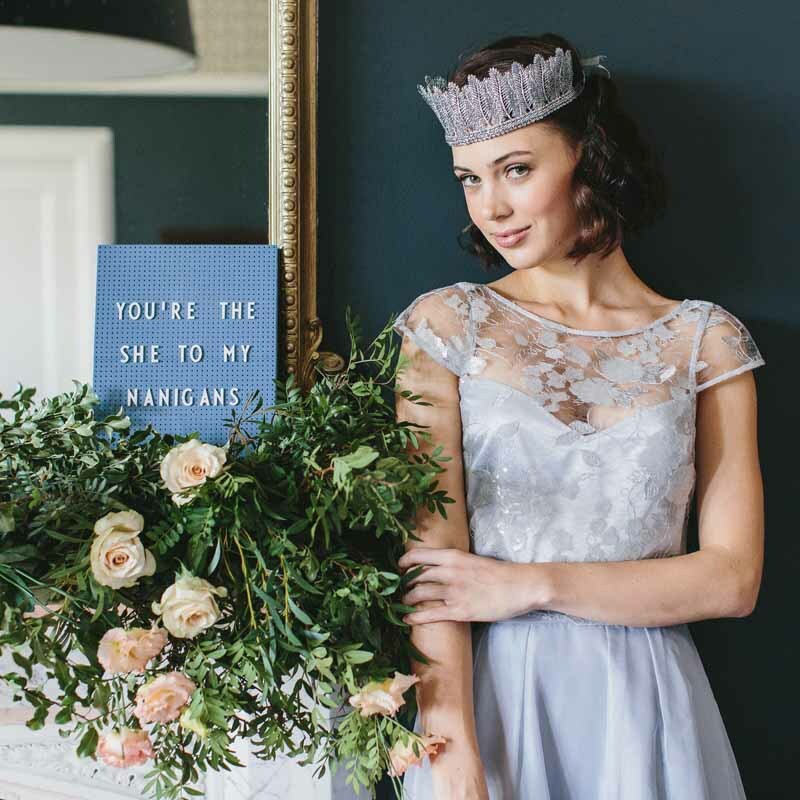 Editorial shoots are a delight to be asked to work on especially by the talented team of stylists at Rock My Wedding. 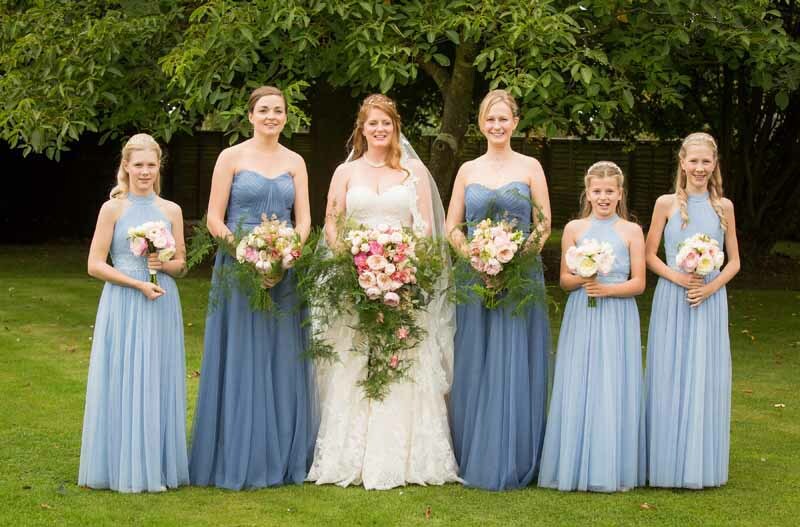 A natural organic style bouquet works beautifully with these beautiful Coast bridesmaid’s dresses. 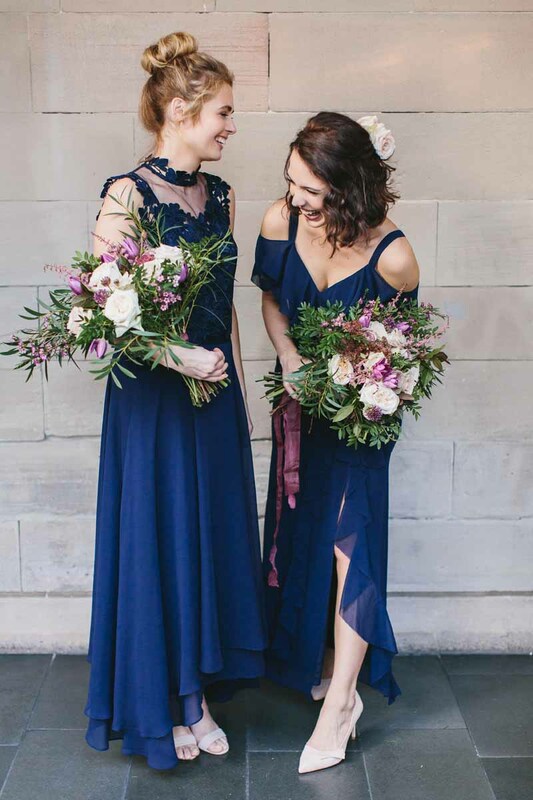 The elegance of the navy was offset with the blush and deeper tones of pink. 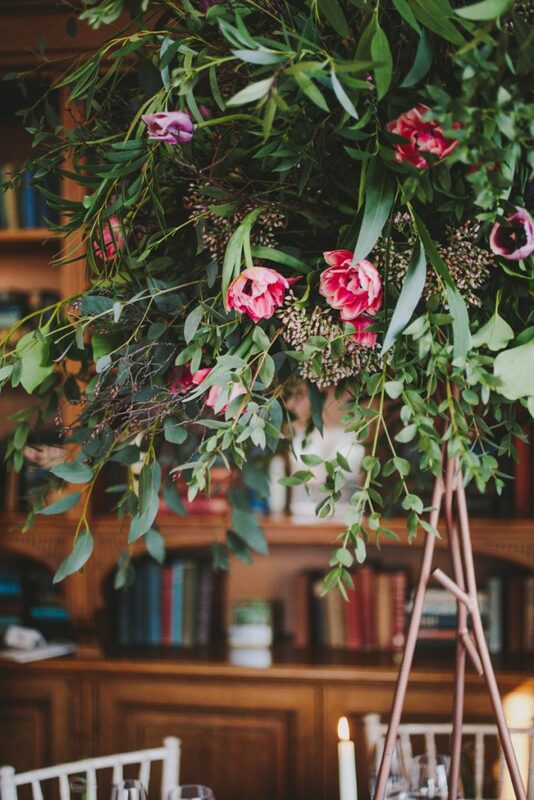 The layering of the colours and a mix of blooms creates interest in the bouquet whilst the snippets of foliage add a natural touch. 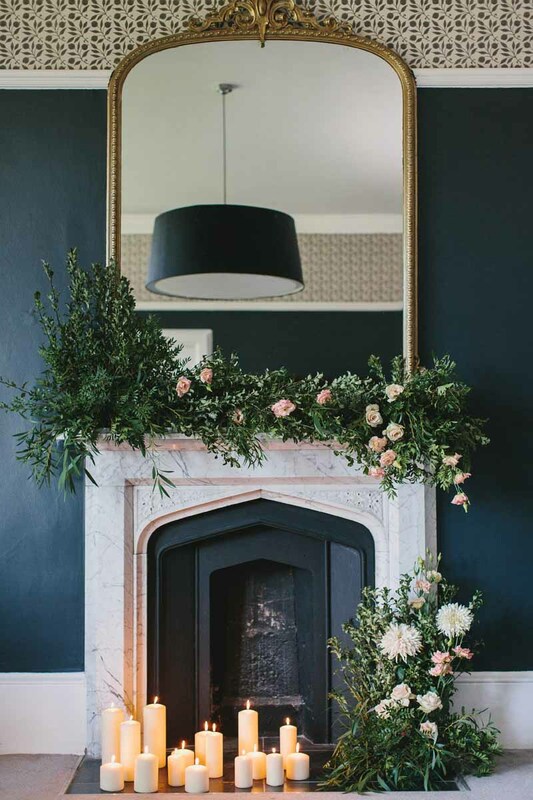 The fireplace and dark walls of this bedroom at Hampton Manor create a stunning backdrop. 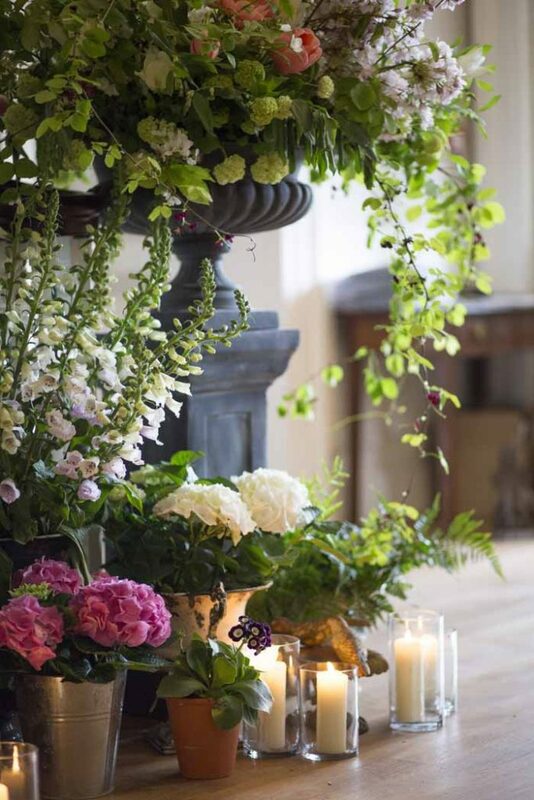 I just love how the organic, asymetric fireplace decoration works in this setting. 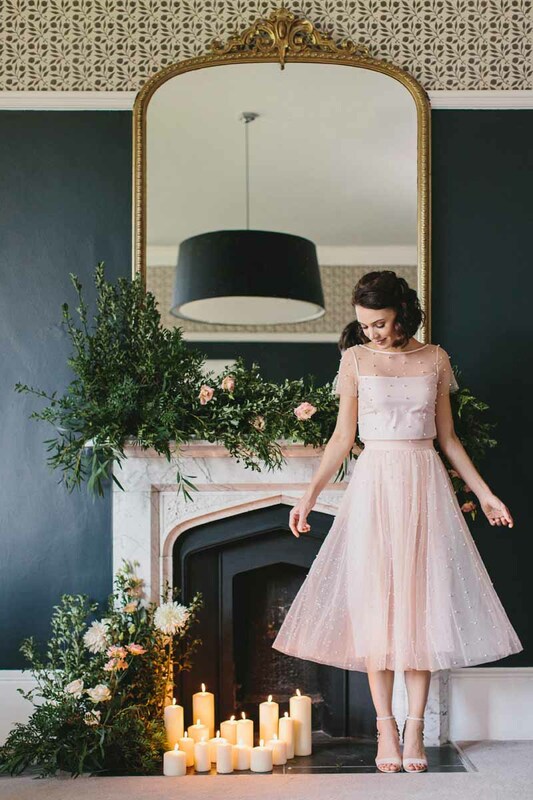 The light blush pink tones in the florals pop against the dark walls and bring the room to life. 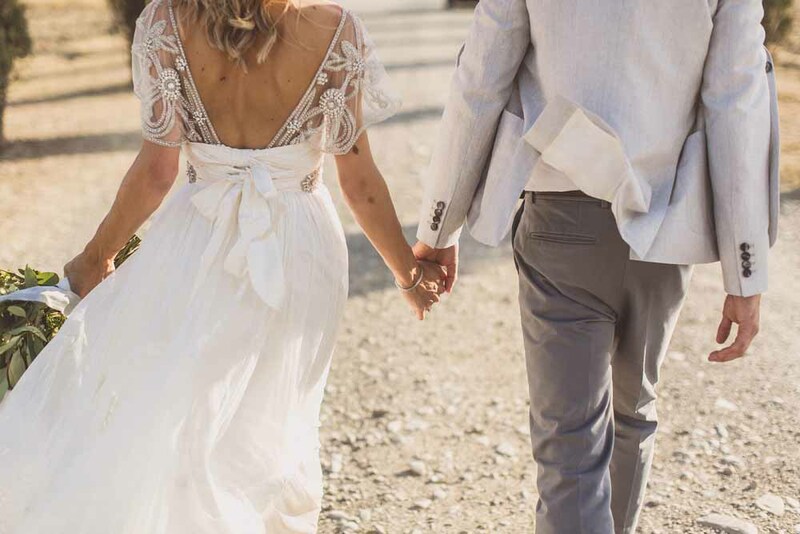 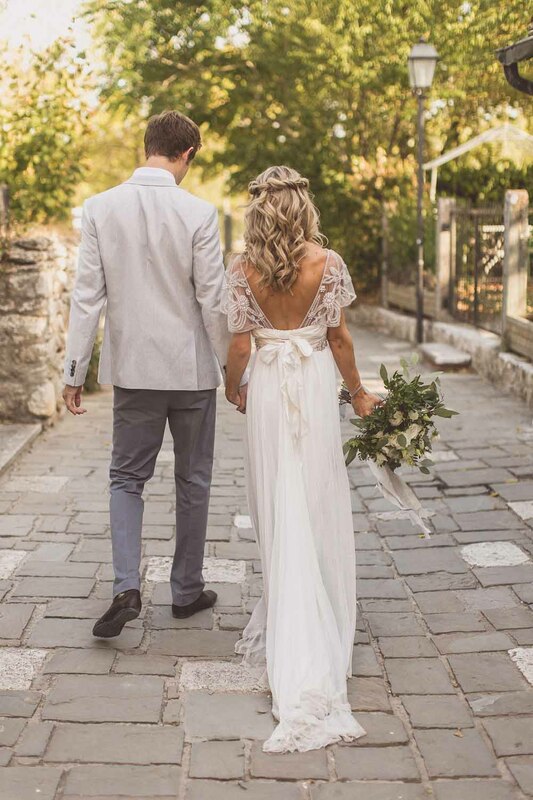 An abundance of candles and a stunning Coast dress created a most dreamy look, so elegant and magical. 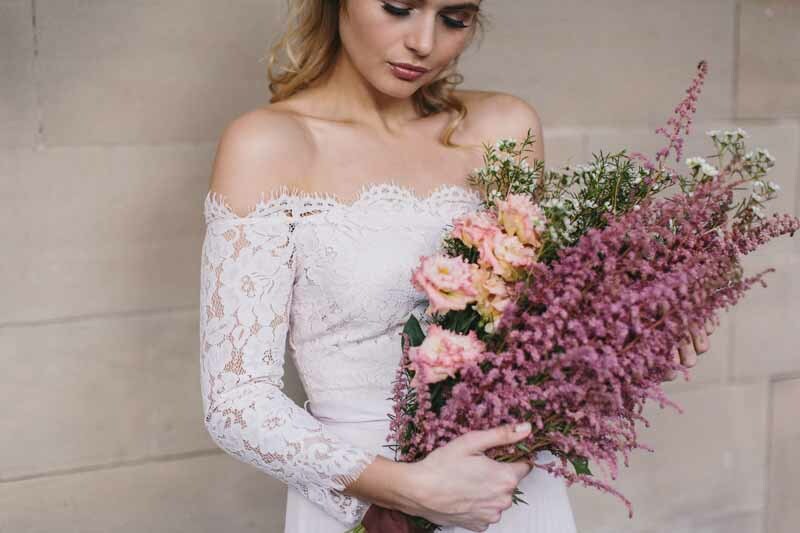 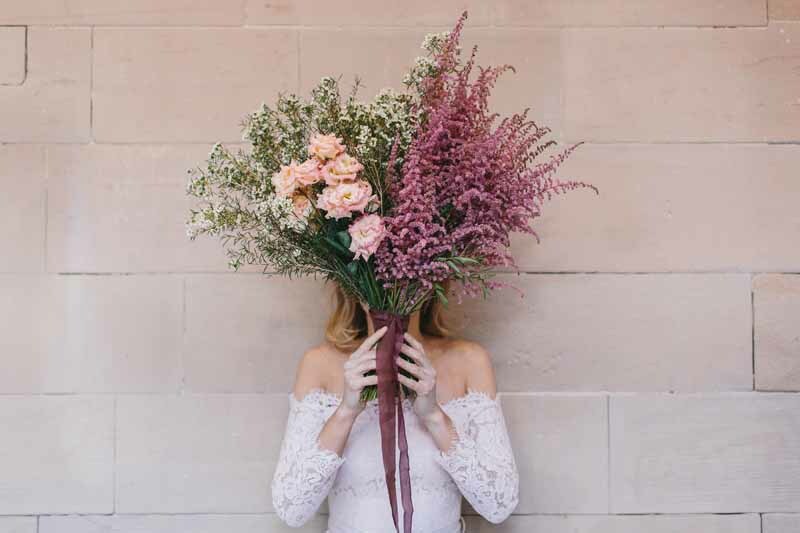 For a blush pink feathery bouquet to wow your bridesmaids choose an extra large bouquet design, here we used a mass of just three different blooms, feathery astilbe, the softest lisianthus and the lemon scented wax flower. 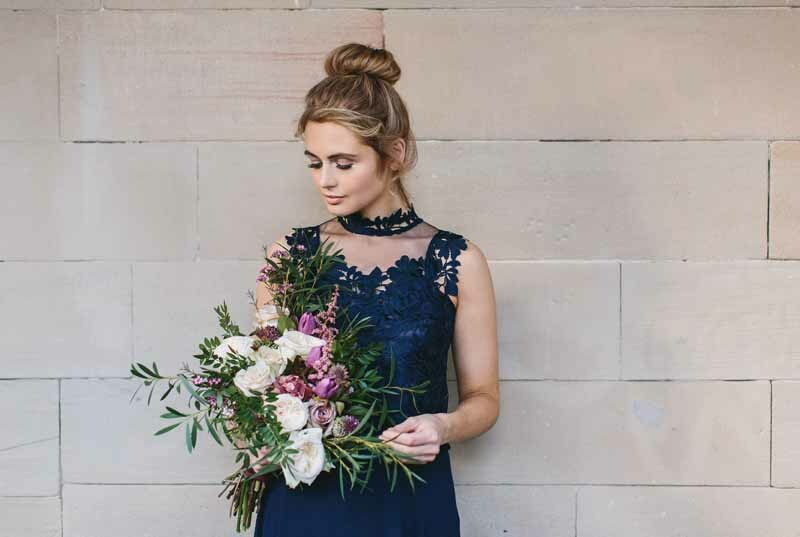 The effect with this beautiful lace dress from Coast is so stylish. 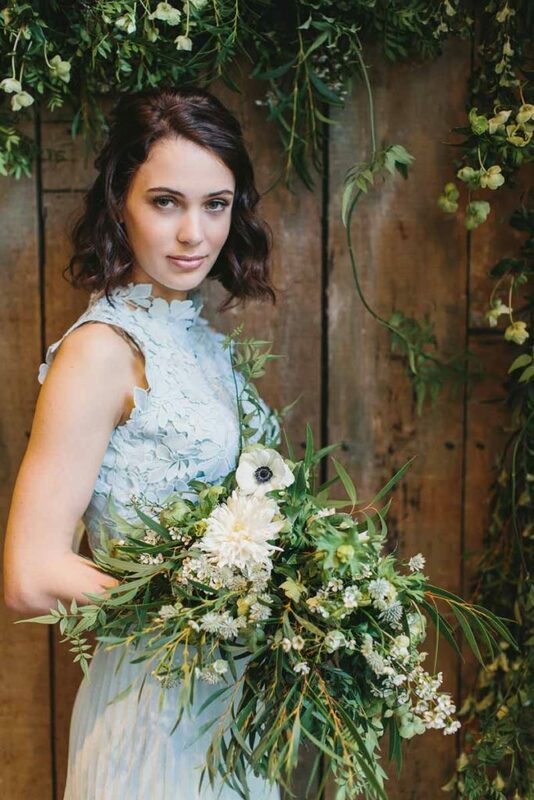 Bringing the outside in is a great idea and a natural wild green and white bouquet suits the style of this mint green Coast dress perfectly. 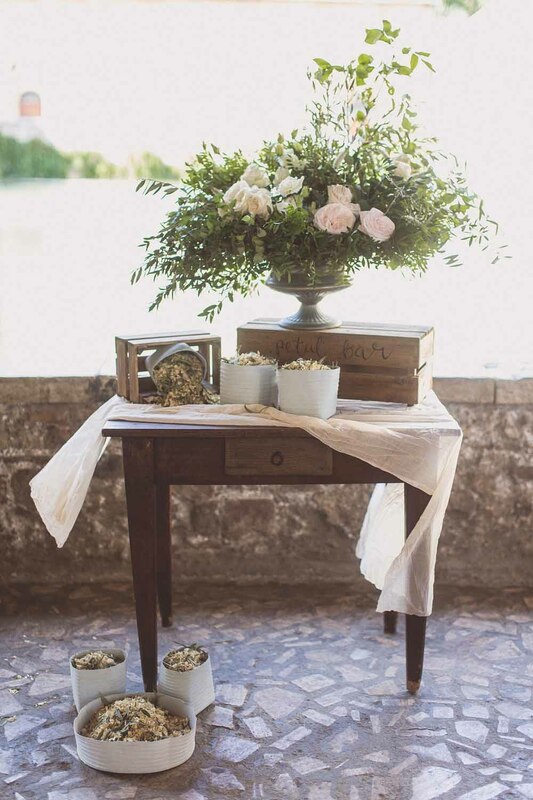 A backdrop of jasmine trails, hellebore and the softest foliage stems frame this shot beautifully. 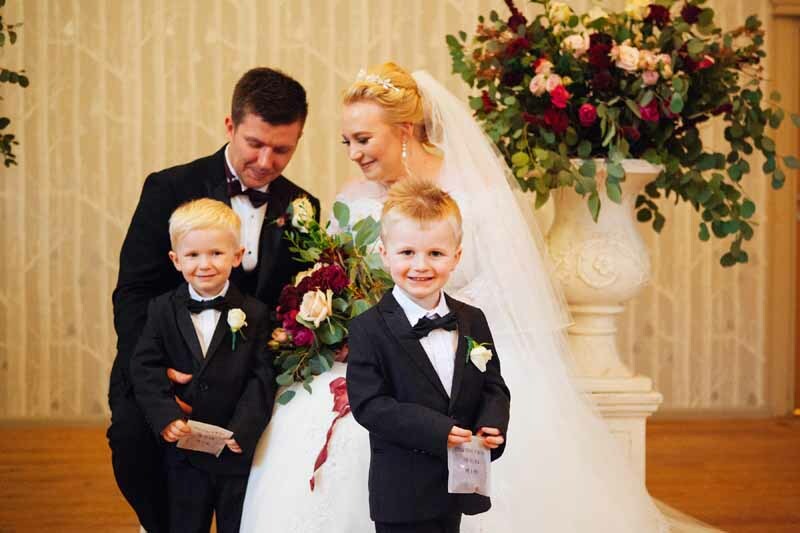 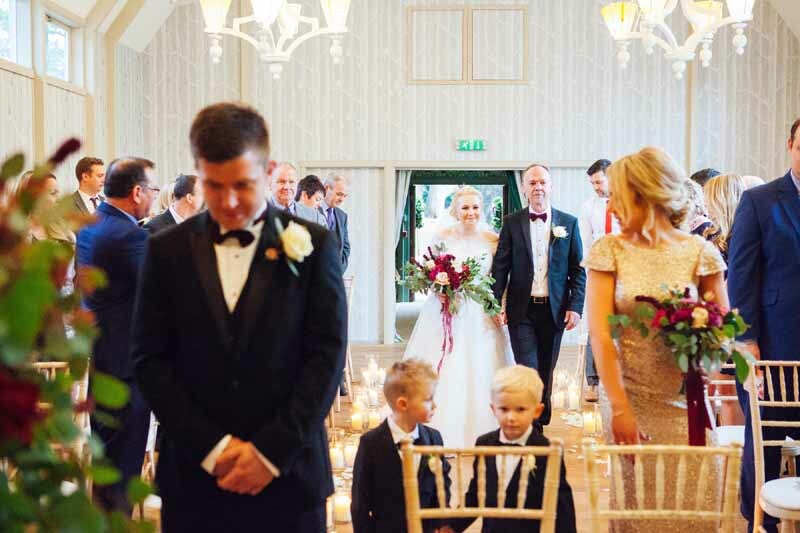 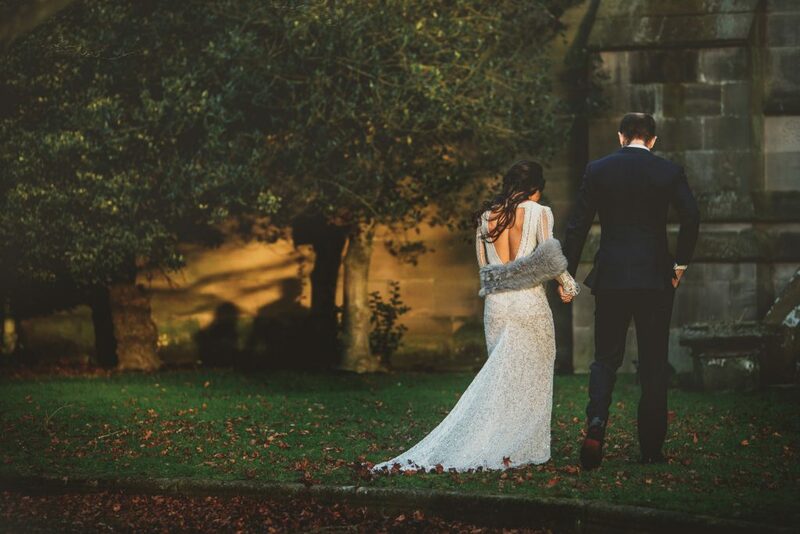 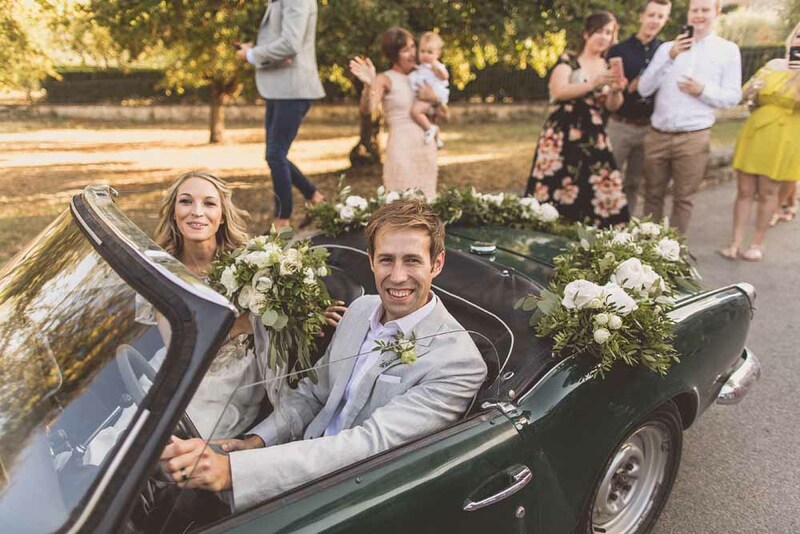 Sarah and Adam planned the most beautiful autumn church wedding followed by a reception for family and friends at our favourite Hampton Manor. 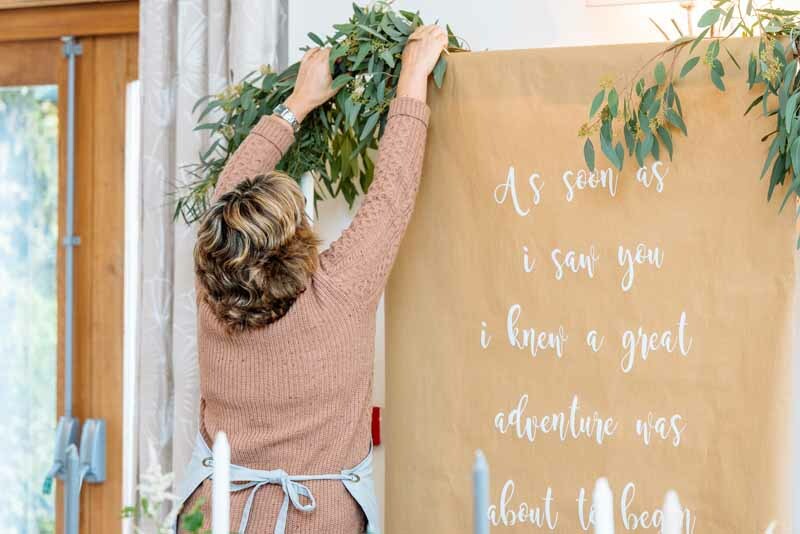 They are currently living out in Hong Kong and so we had the opportunity to meet up on their visits home as well as skype and share pinterest boards and ideas during the planning stages. 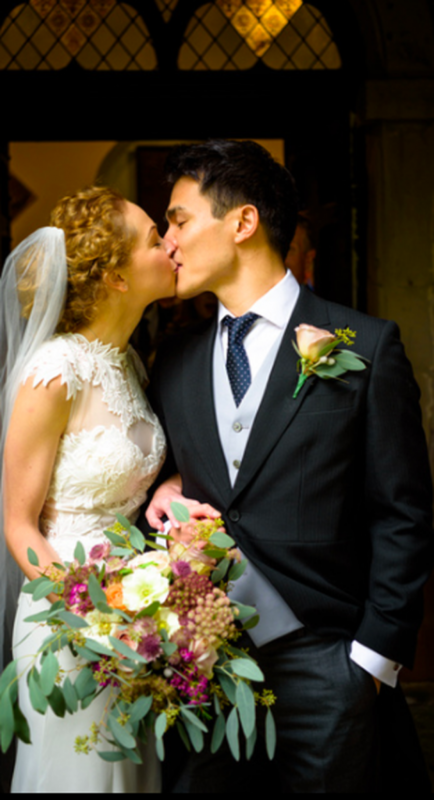 Right from the start this couple knew they wanted natural organic style flowers with lots of autumn colour. 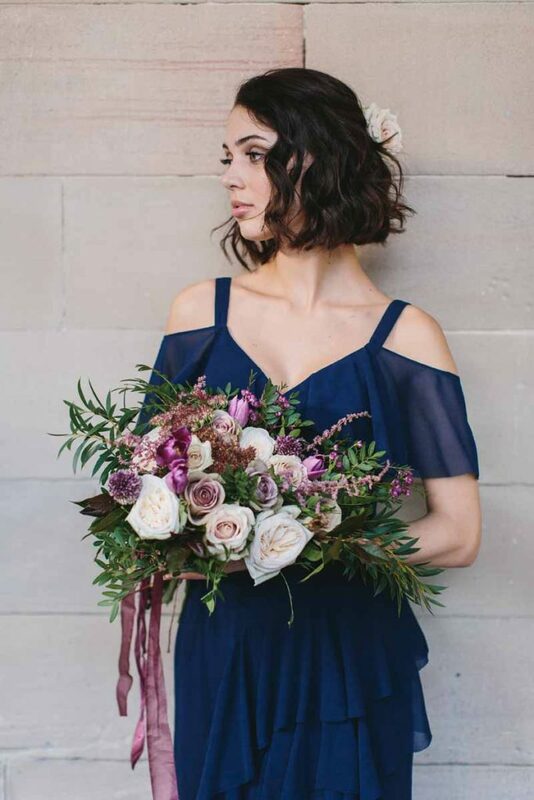 With the navy blue two birds bridesmaids dresses, the burgundy and pink tones worked well with plenty of foliage and texture to the bouquets. 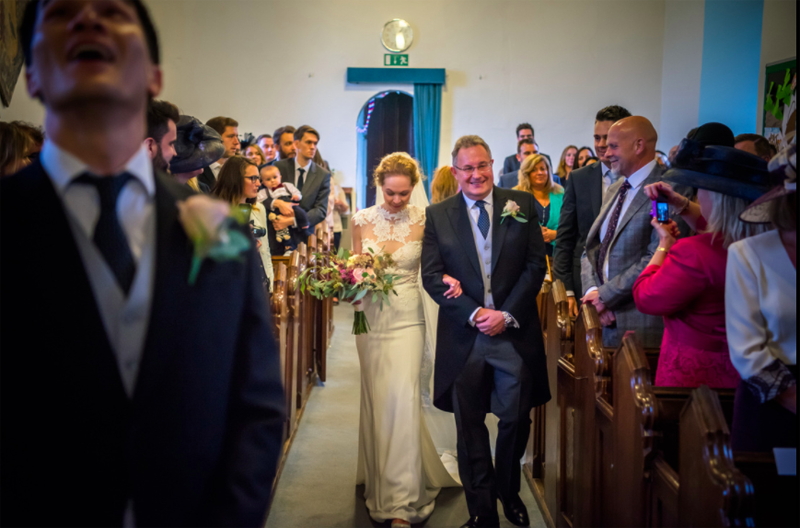 Sarah had the pleasure of walking down from her family home to the village church for the wedding service where everyone was awaiting her arrival. 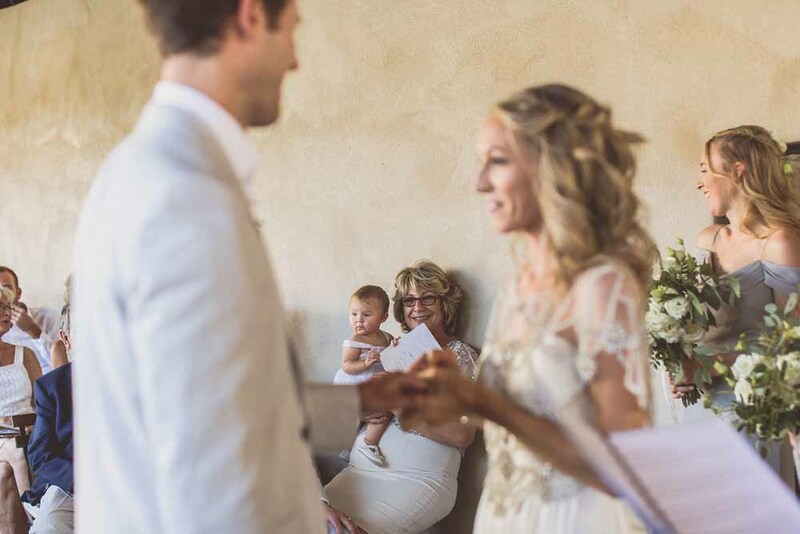 Adam’s face is a picture awaiting her arrival. 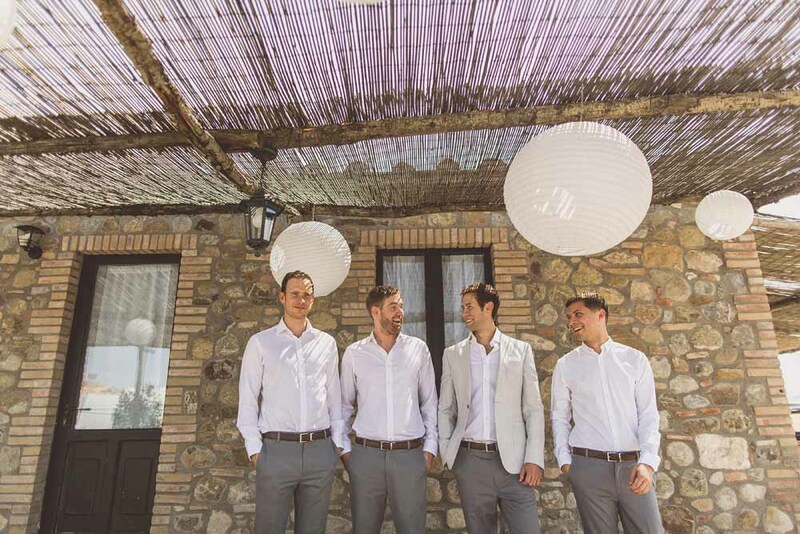 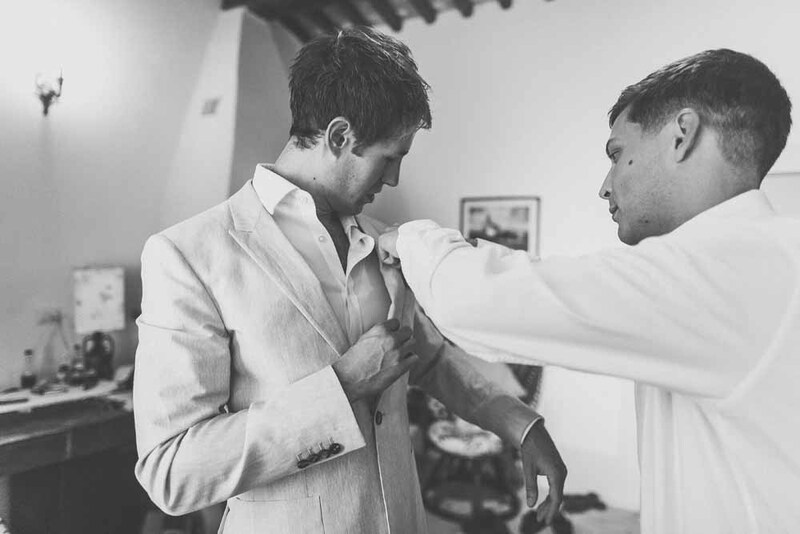 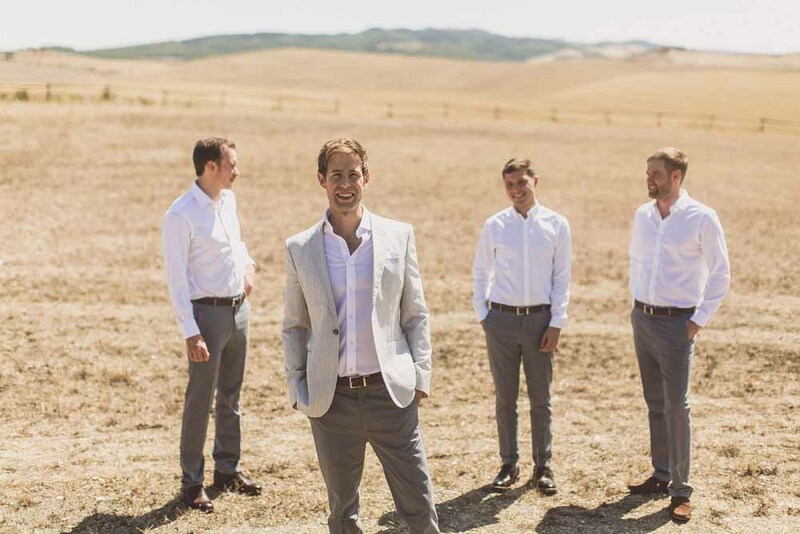 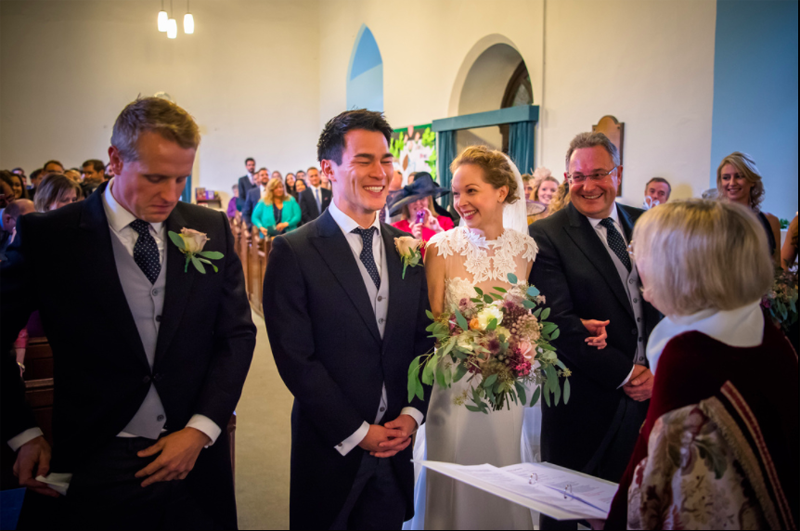 The boys wore button holes in the softest dusky pink to tie in with Sarah and her maids. 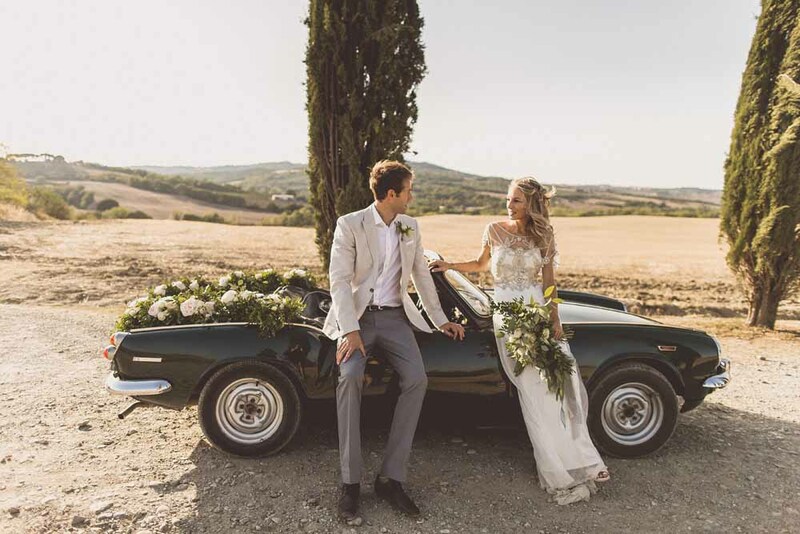 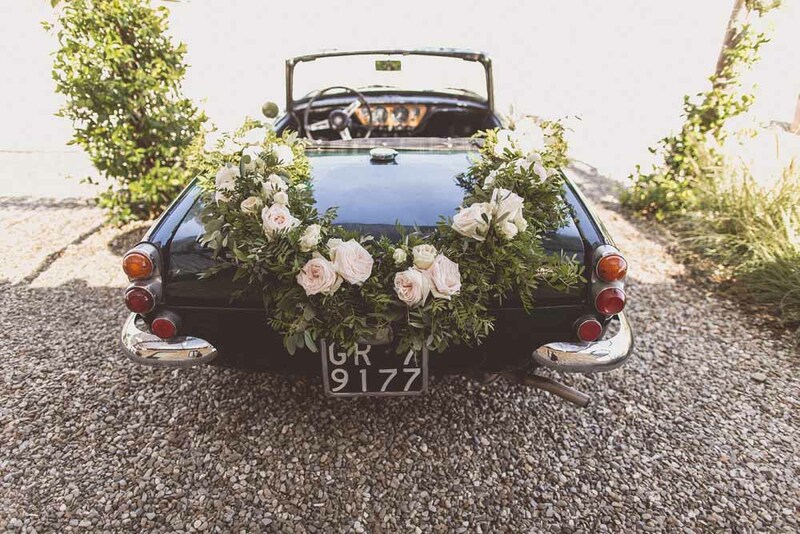 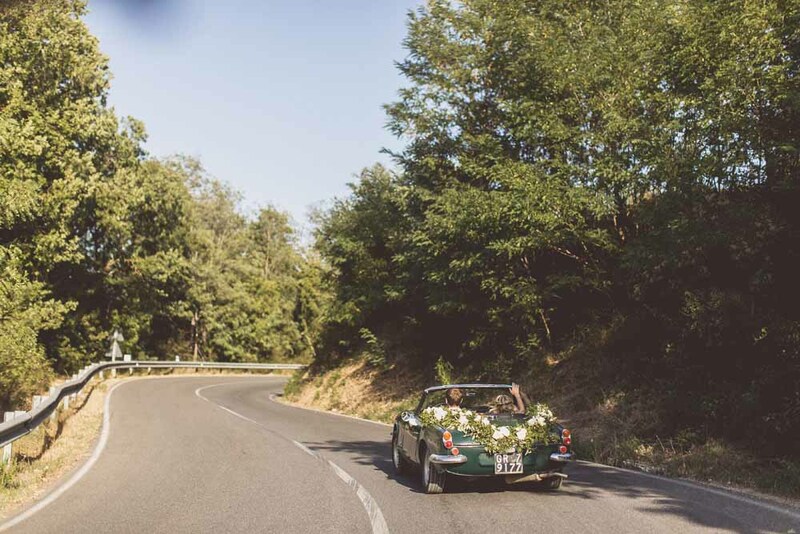 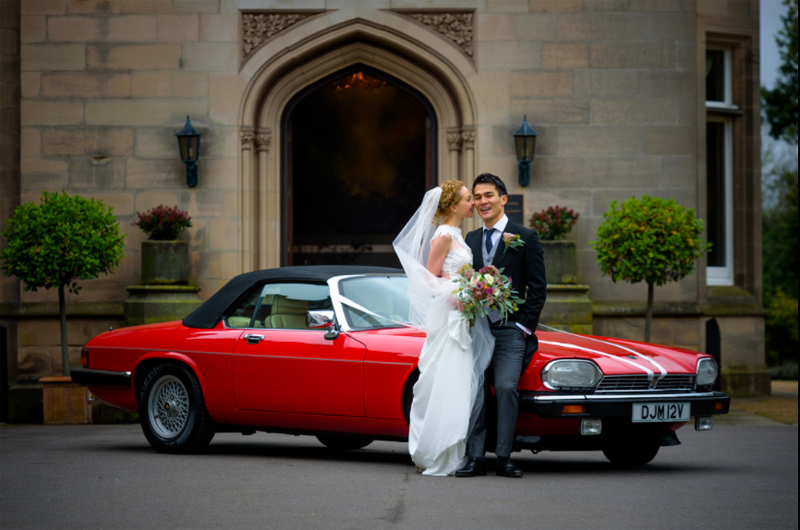 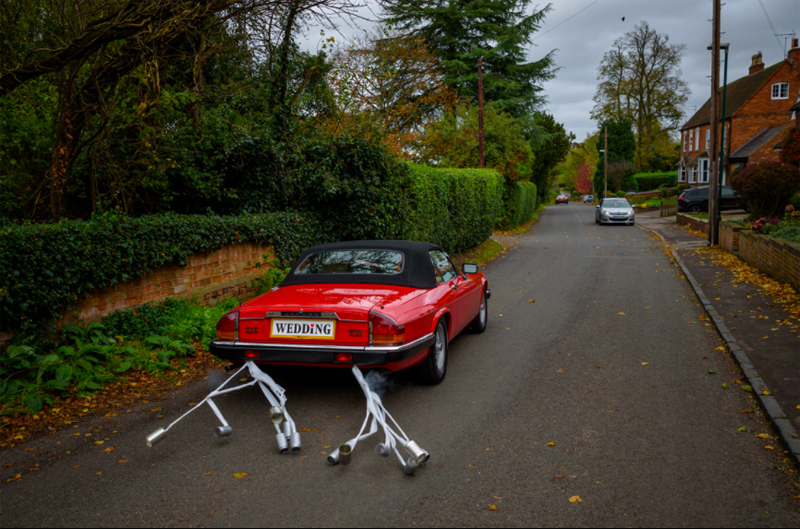 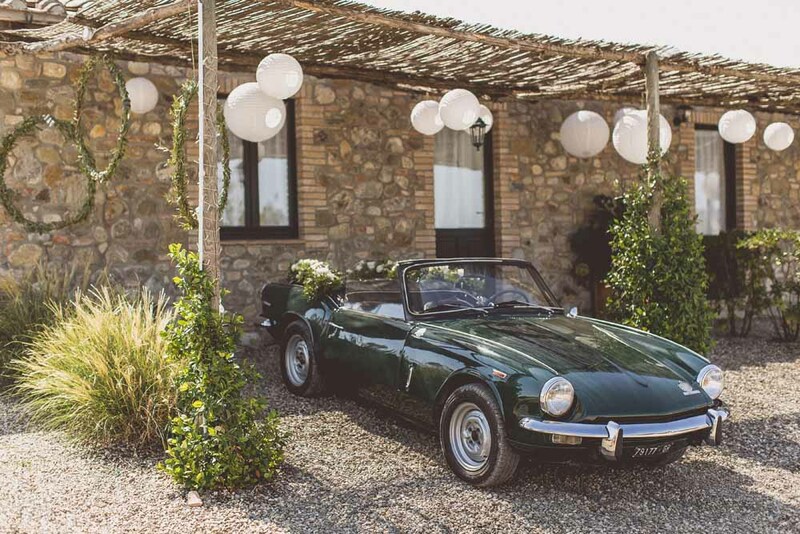 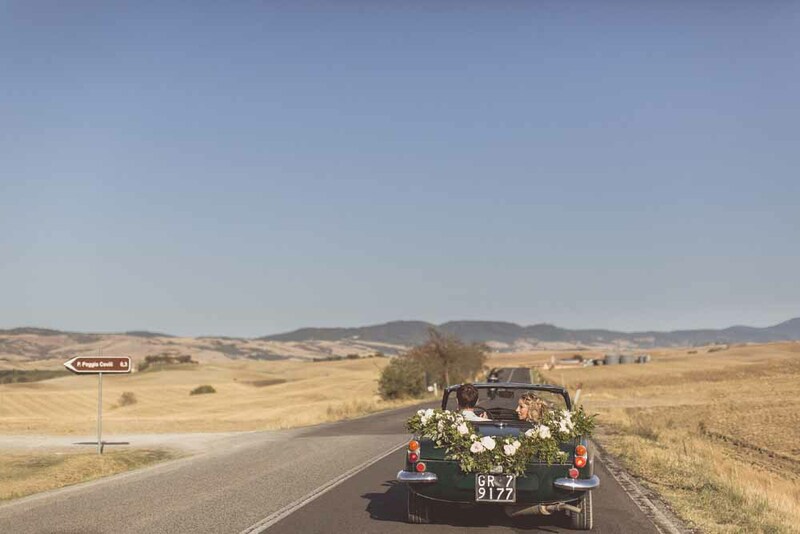 Adam drove his bride away in a vintage Jaguar XJS to the sound of rattling tin cans. 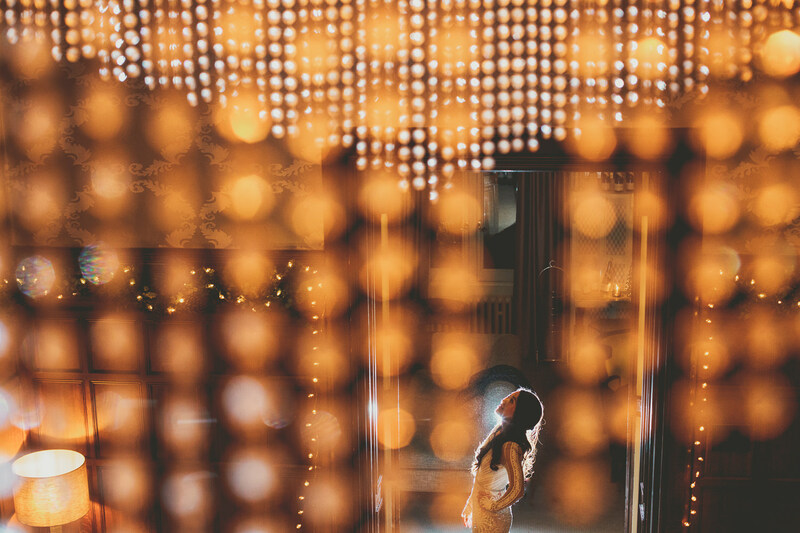 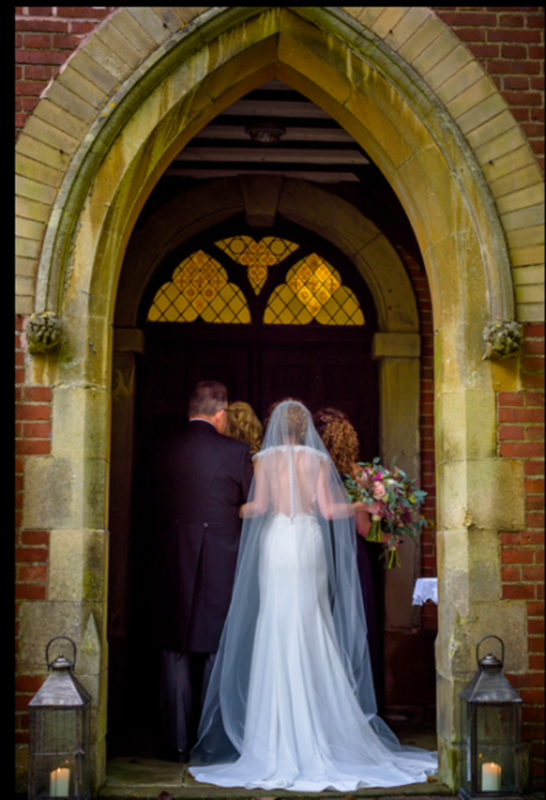 This epic shot at the entrance to Hampton Manor is just so timeless and sums up the romance of their wedding day. 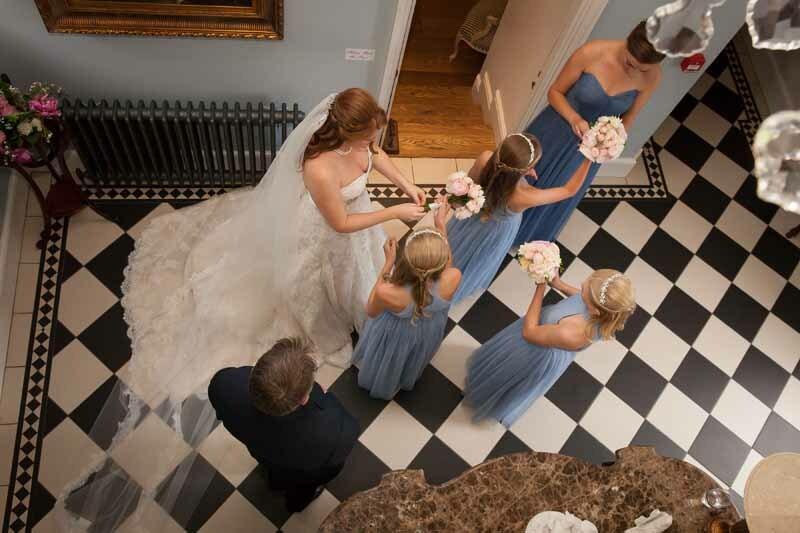 The natural organic style continued through to Elizabeth Court at Hampton Manor. 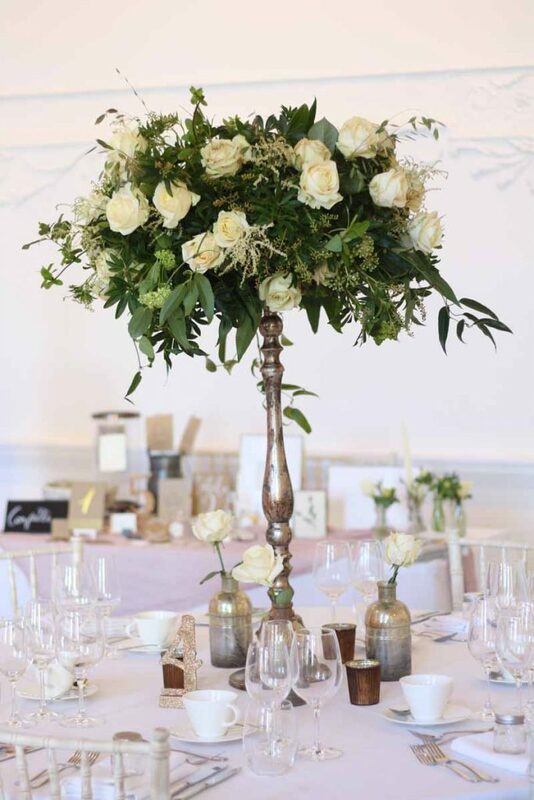 Adam in particular loved the idea of tall centrepieces and we agreed on clear glass vases with an organic design with tall twigs, eucalyptus foliage and the softest of roses. 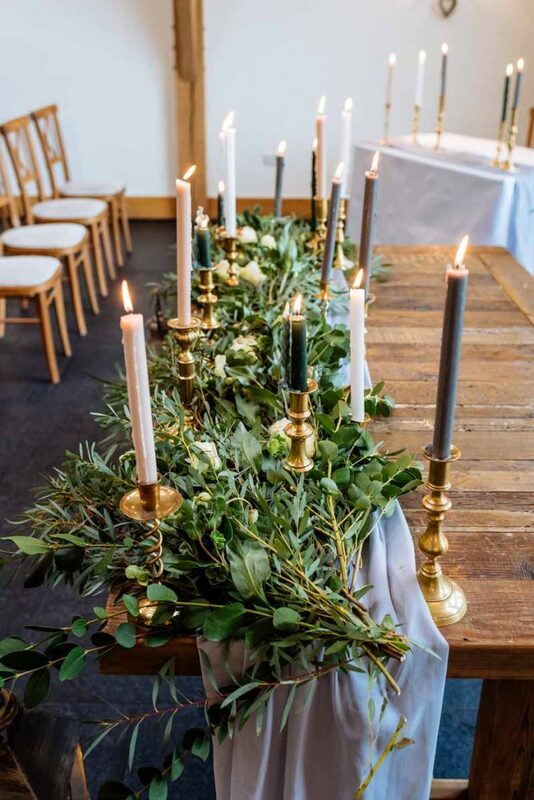 On the top table flowers we added the beautiful bridesmaids bouquets to add impact to the table among the candles. 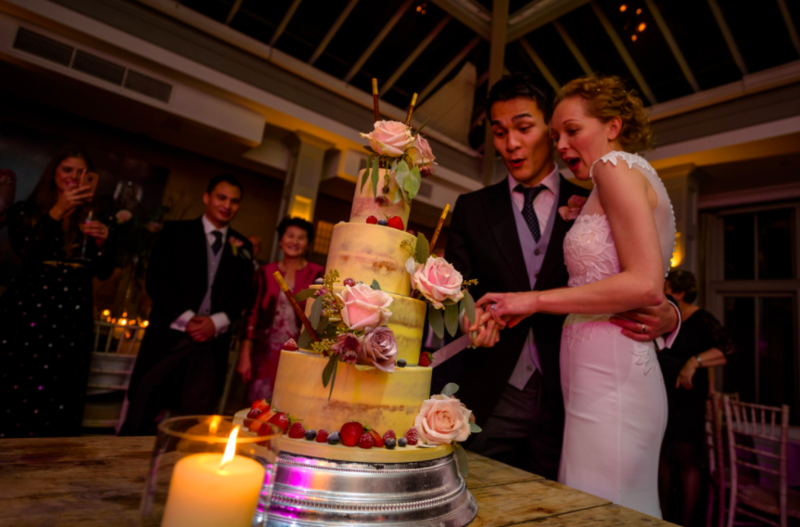 The wedding cake by Ben The Cakeman brought together the Chinese and English elements of the day with the beautiful addition of the chopsticks and the berries. 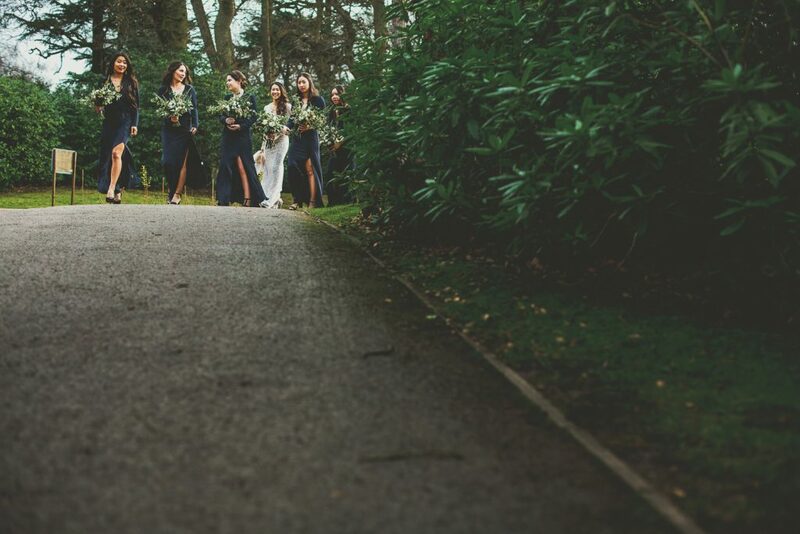 Thank you Sarah and Adam for sharing your beautiful wedding photos we loved being part of your day. 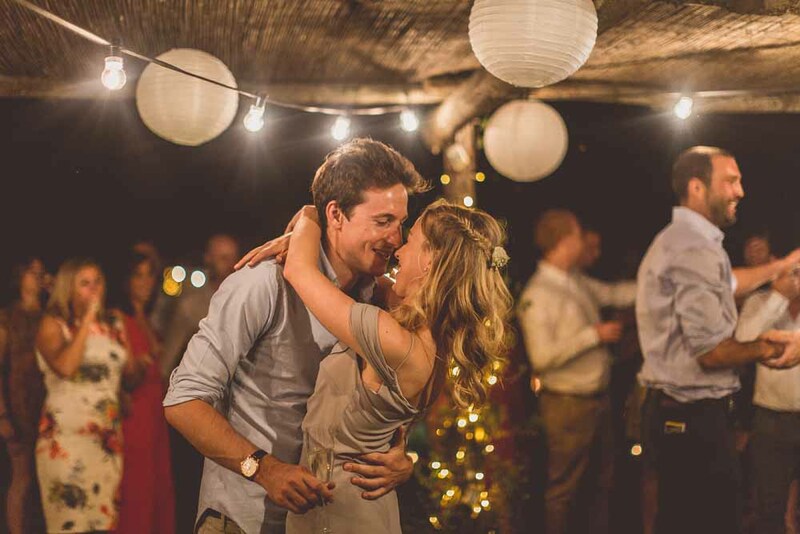 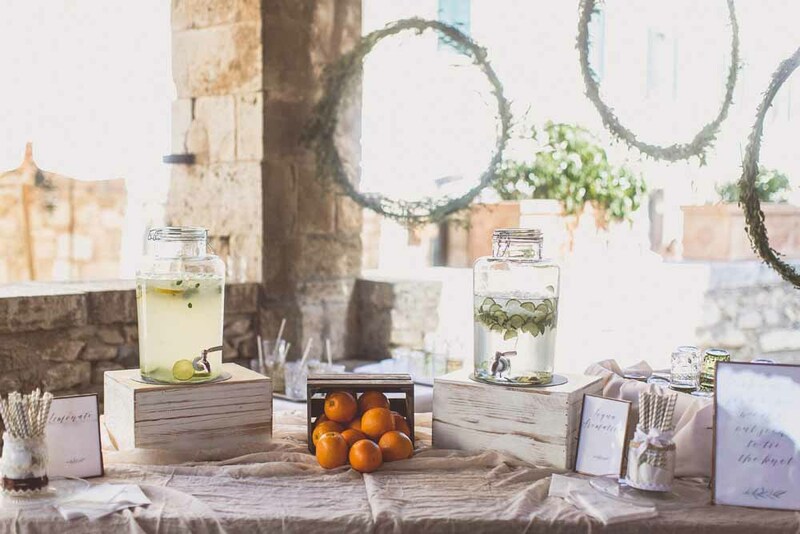 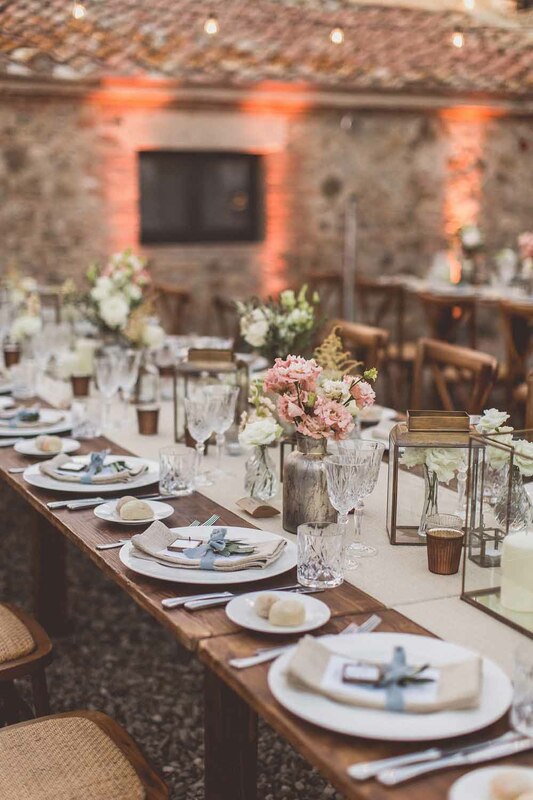 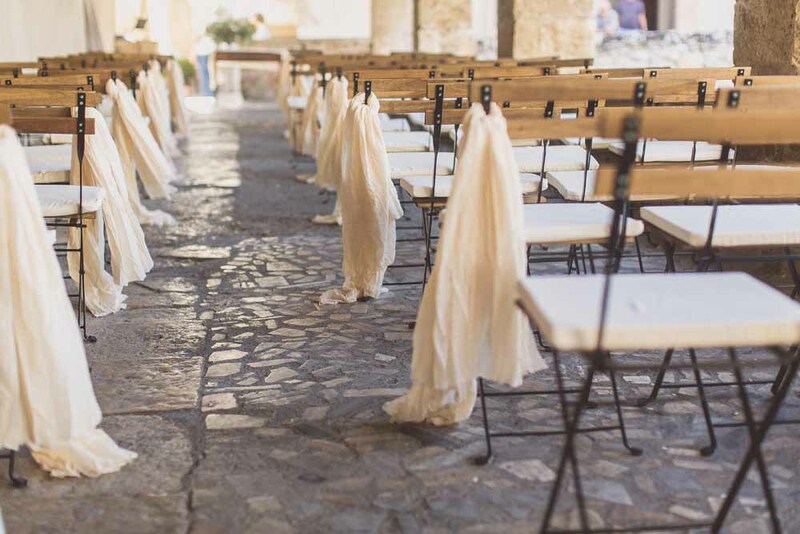 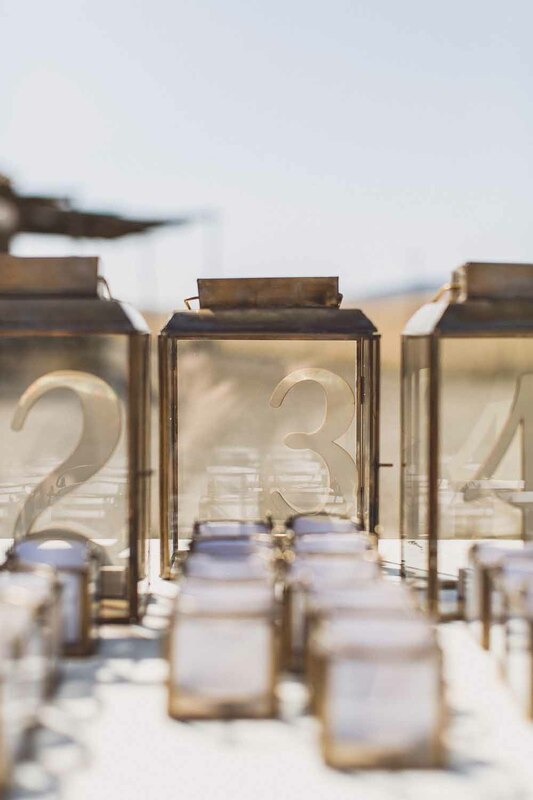 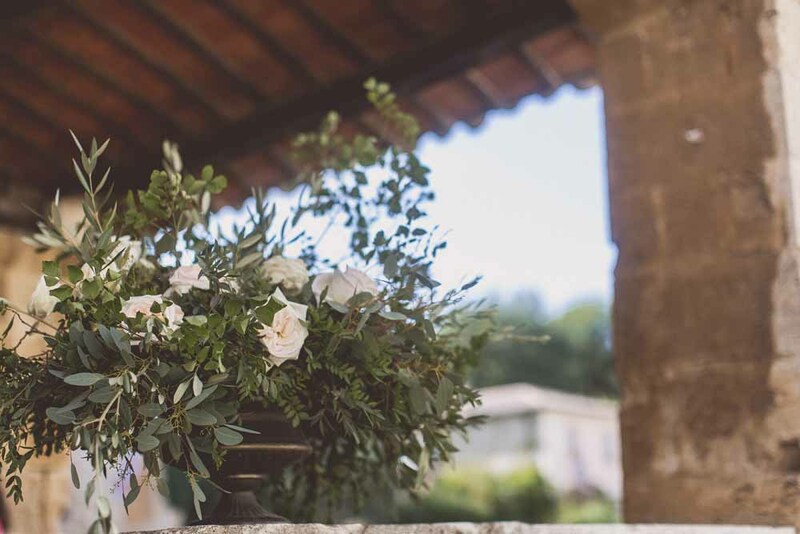 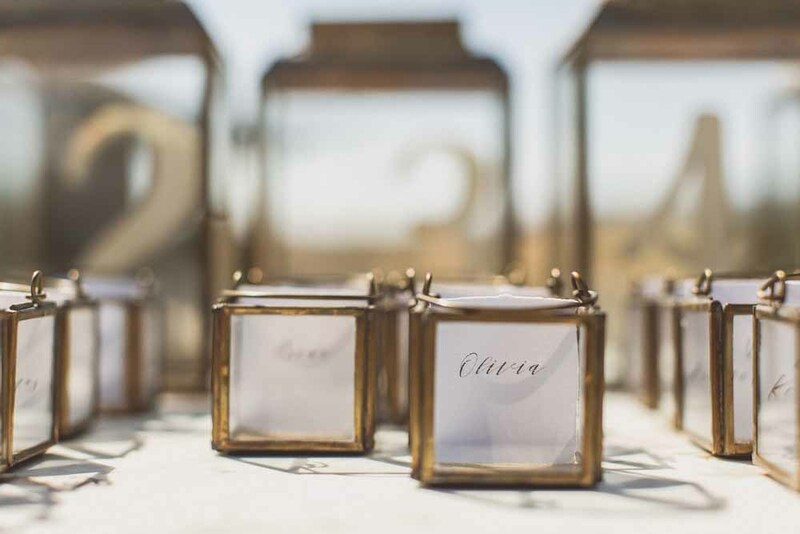 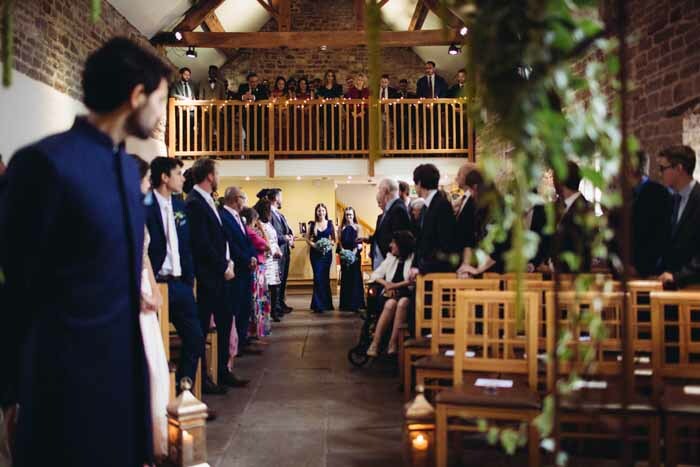 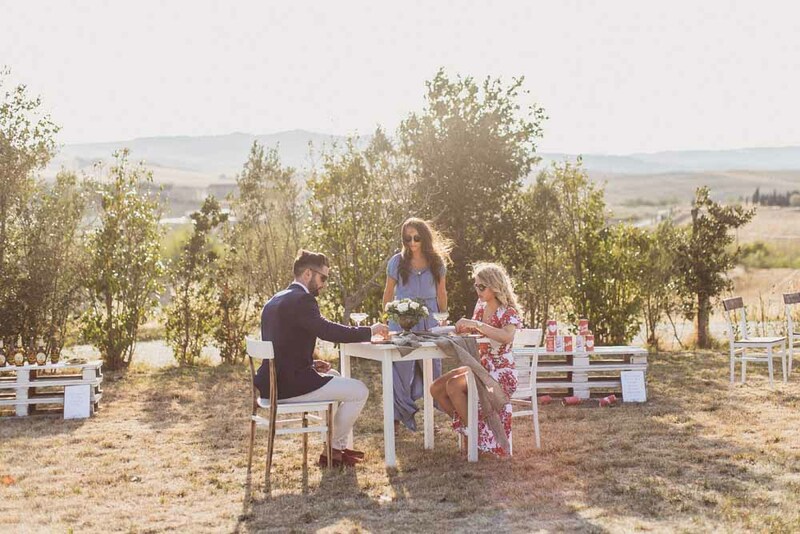 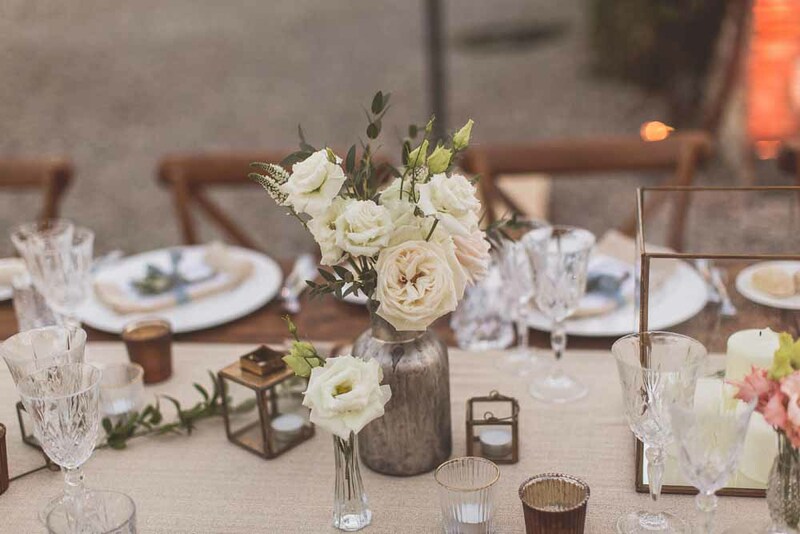 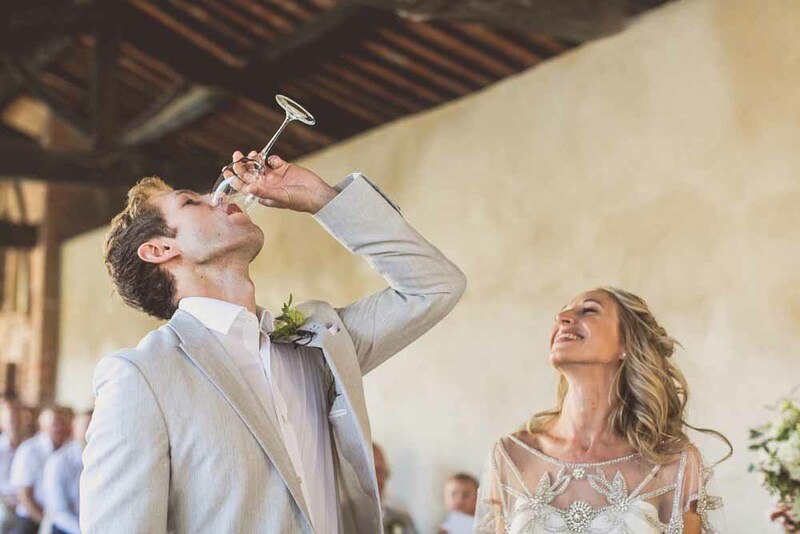 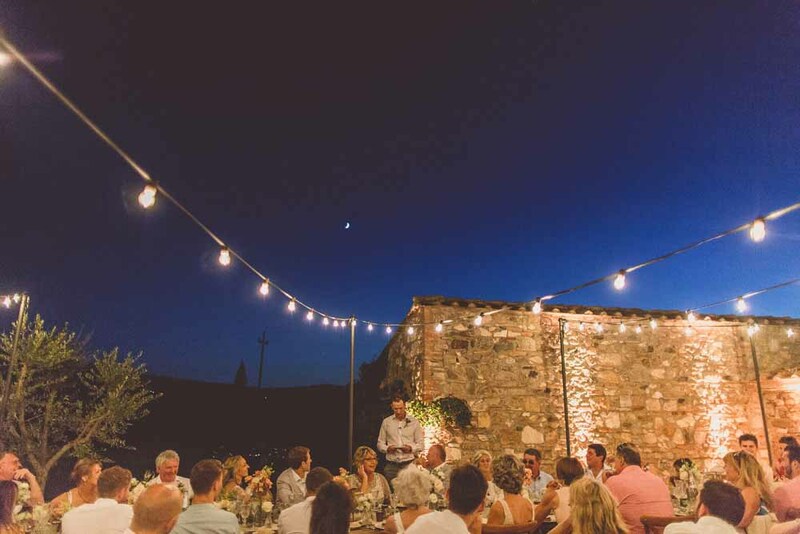 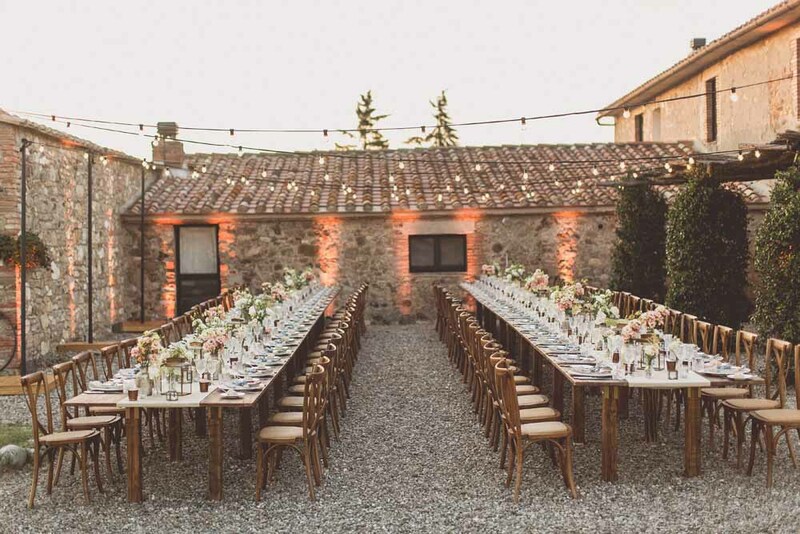 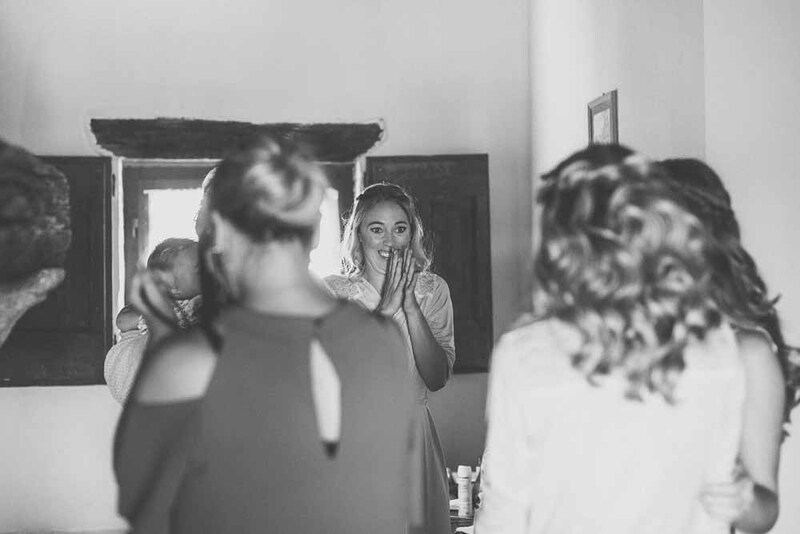 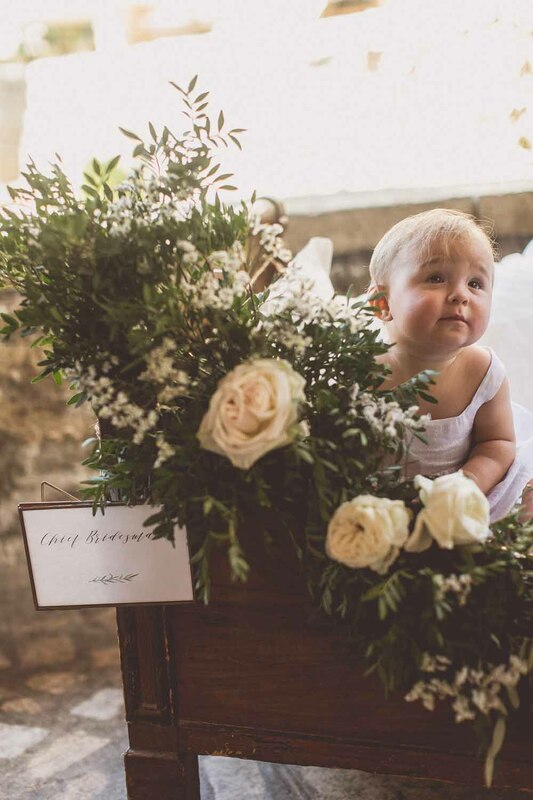 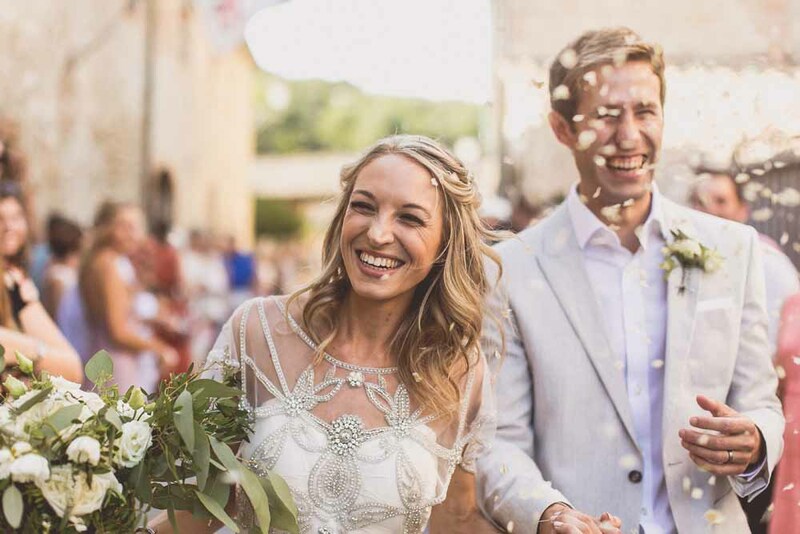 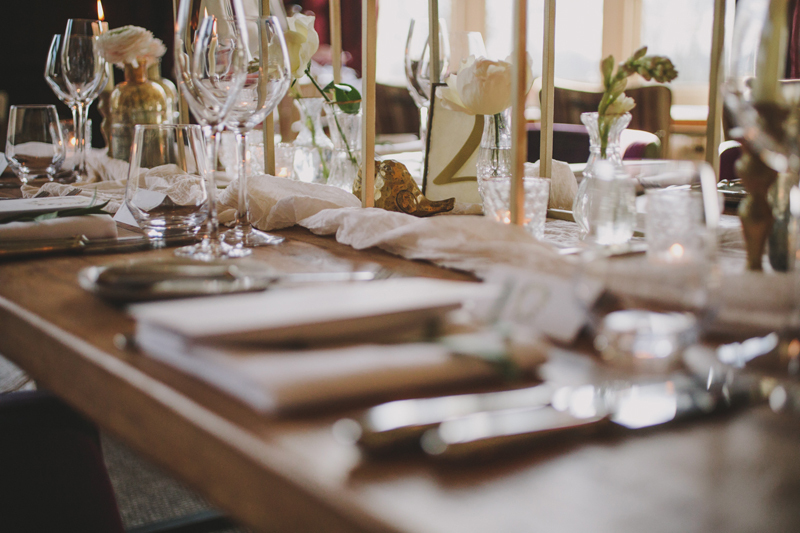 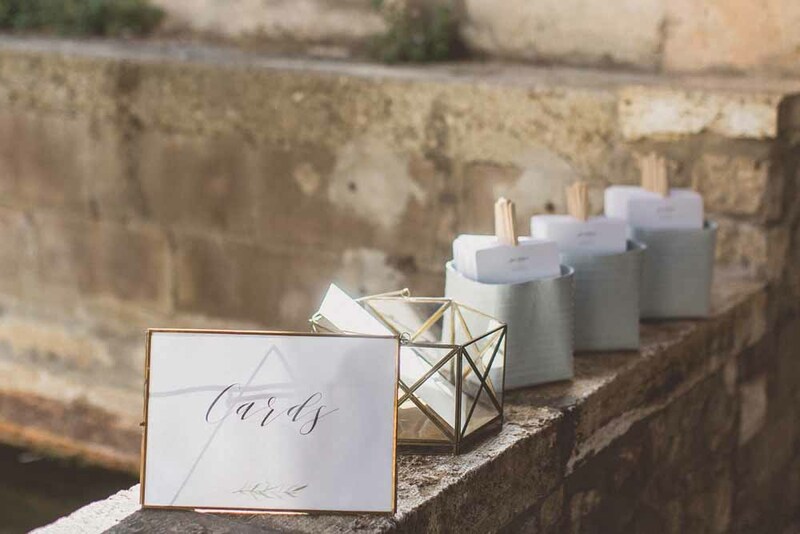 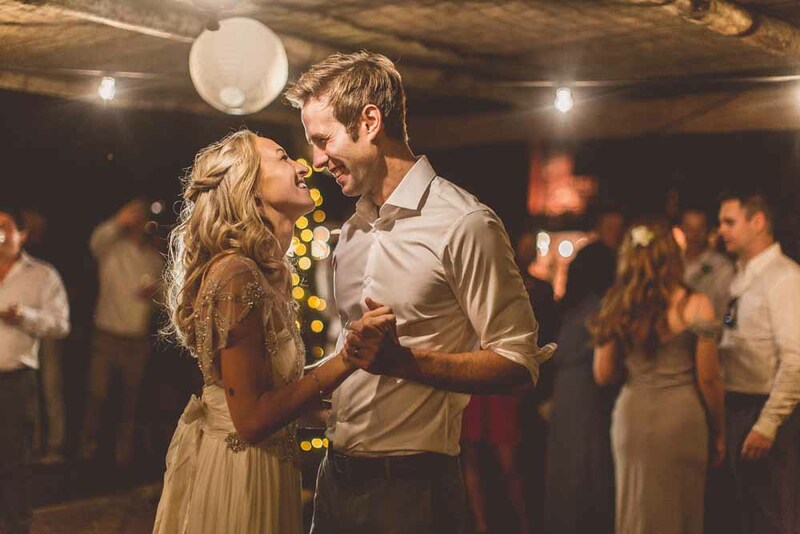 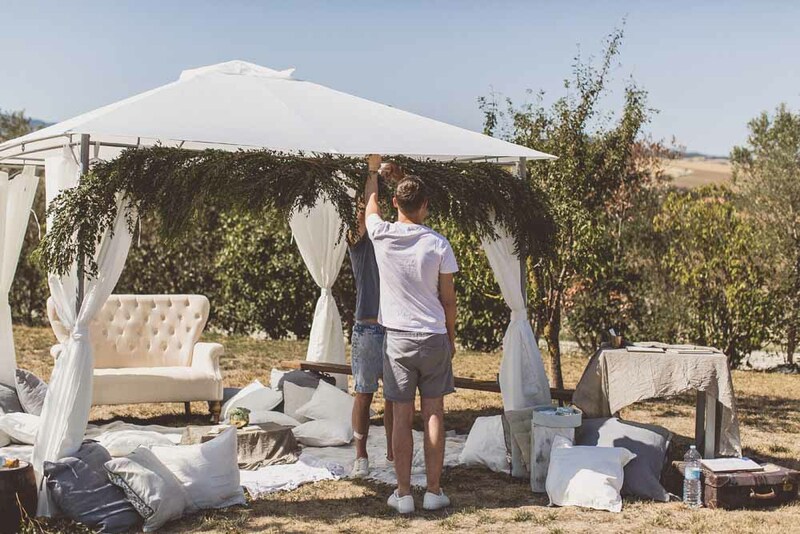 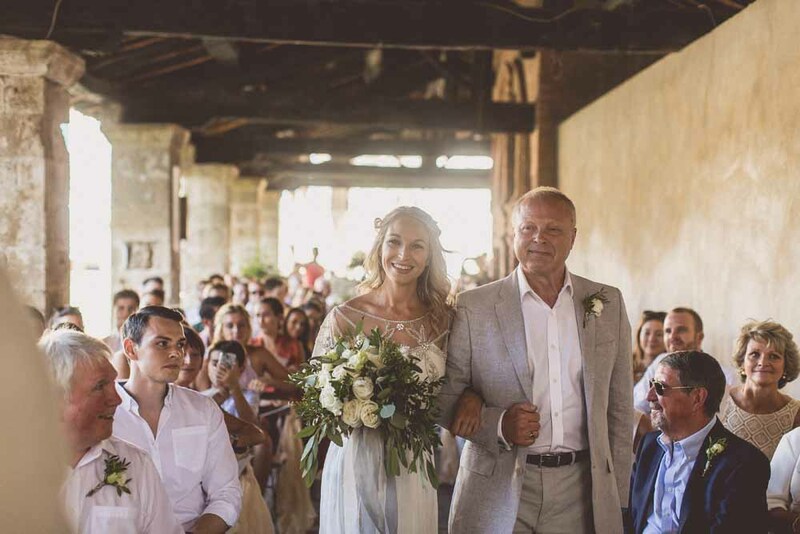 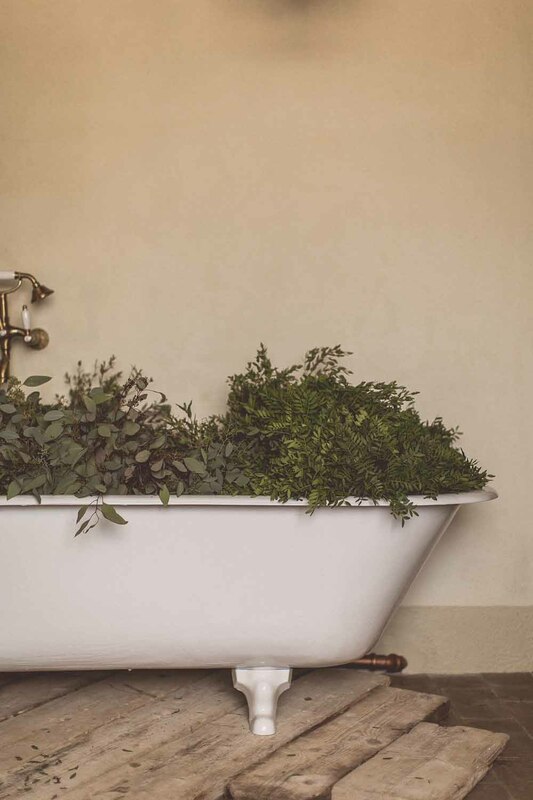 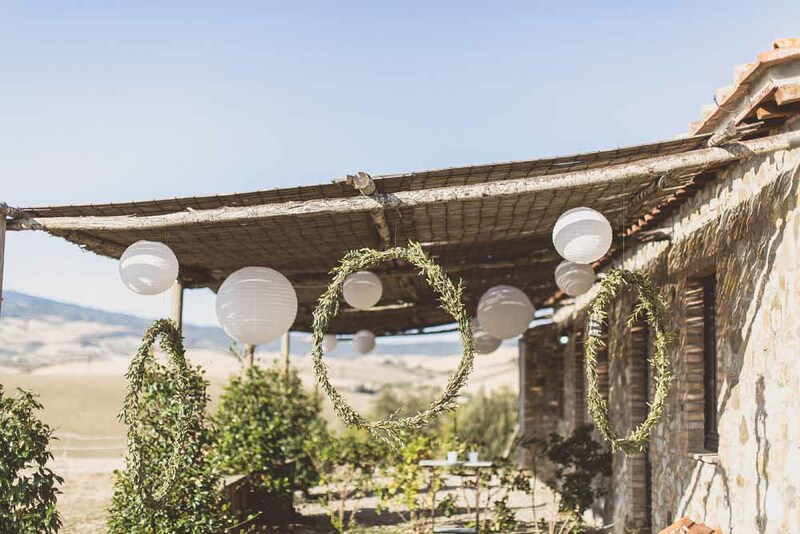 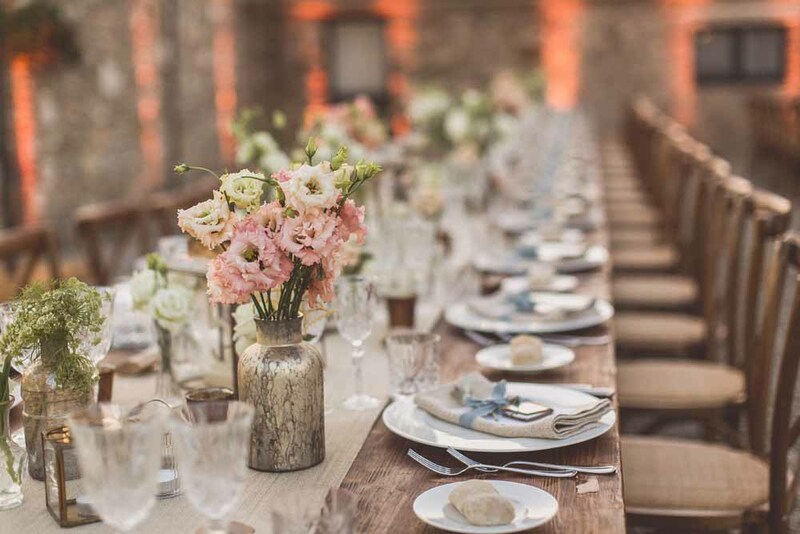 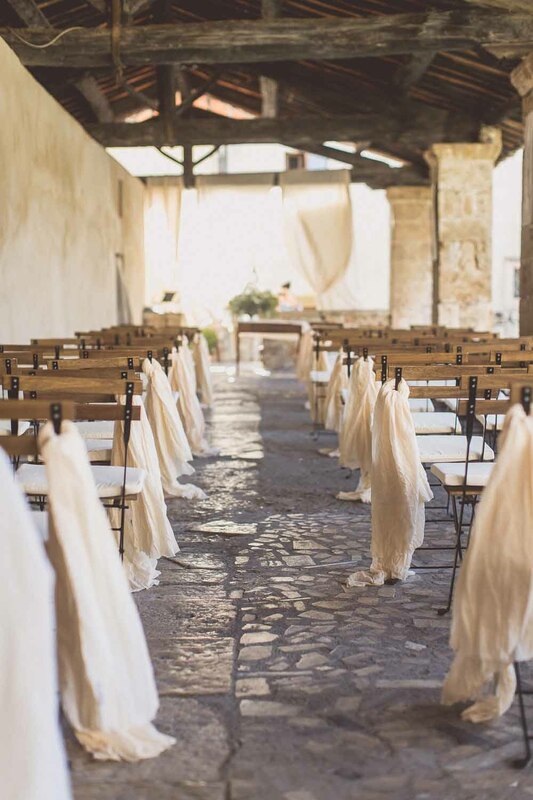 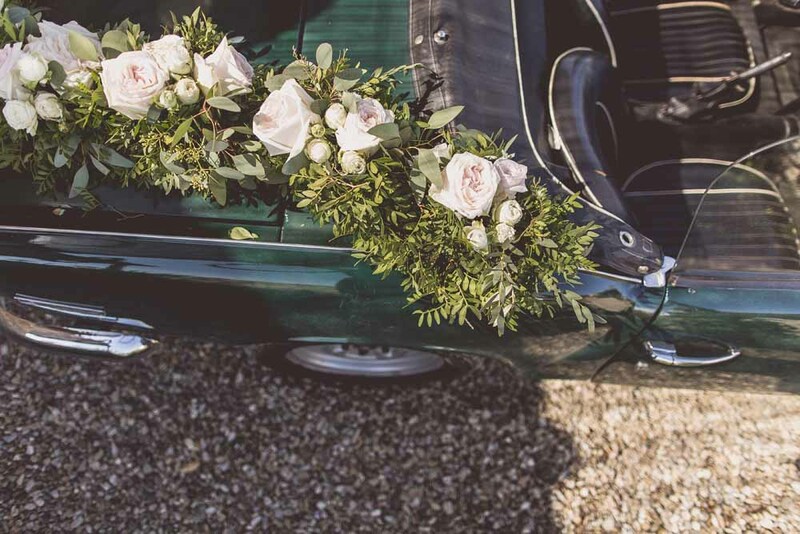 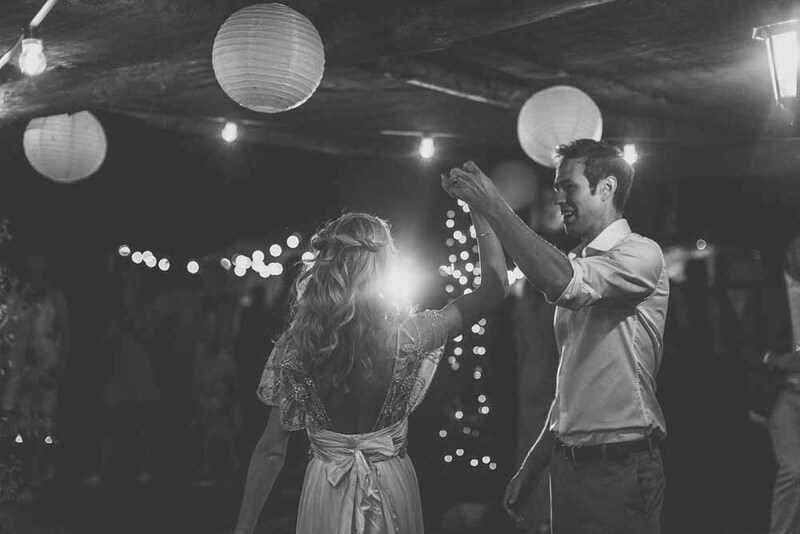 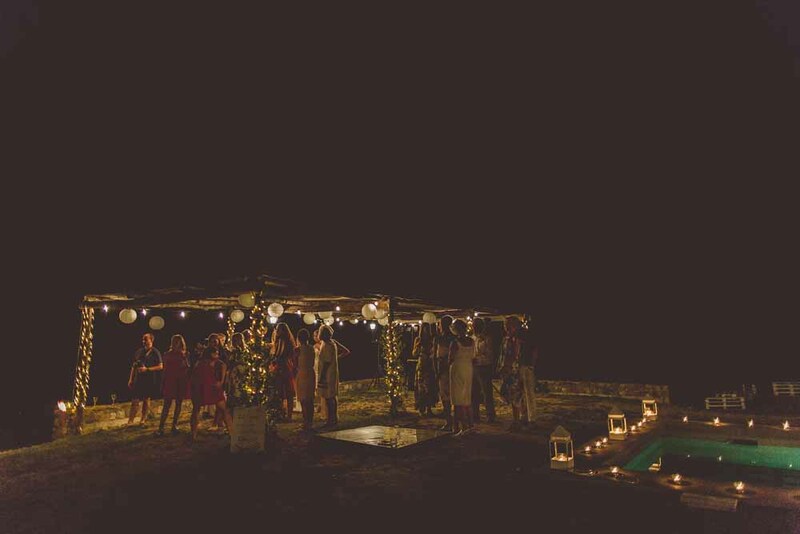 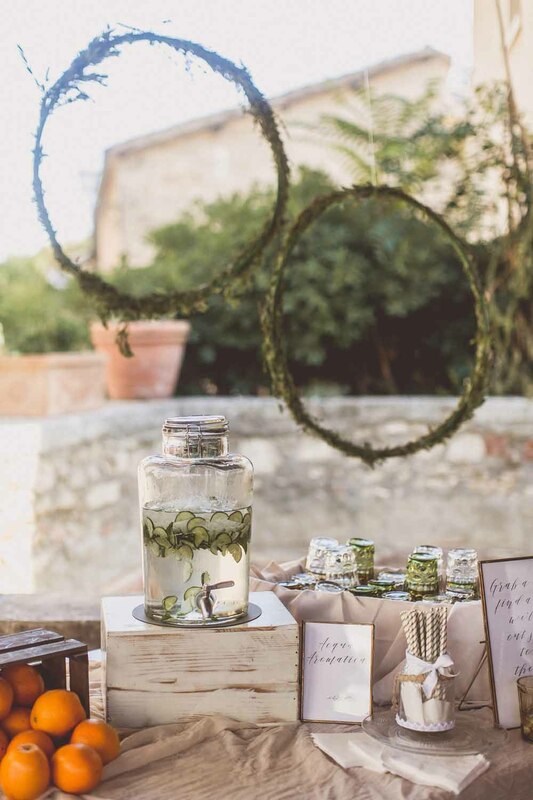 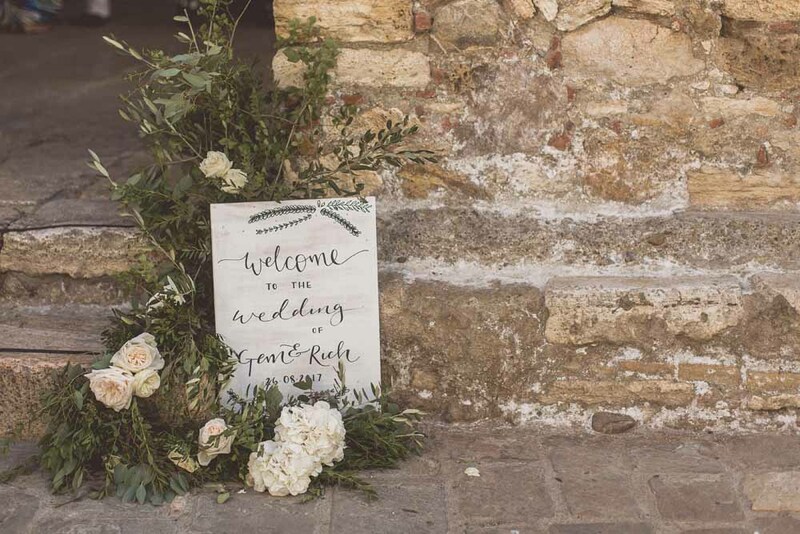 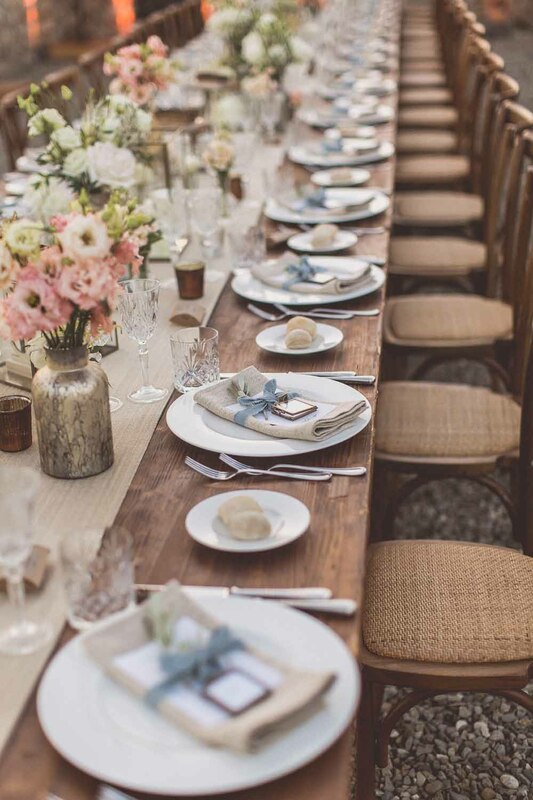 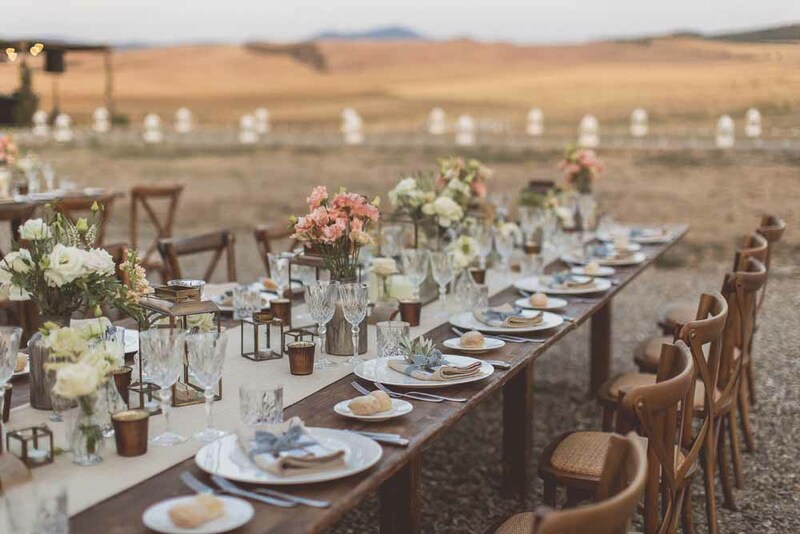 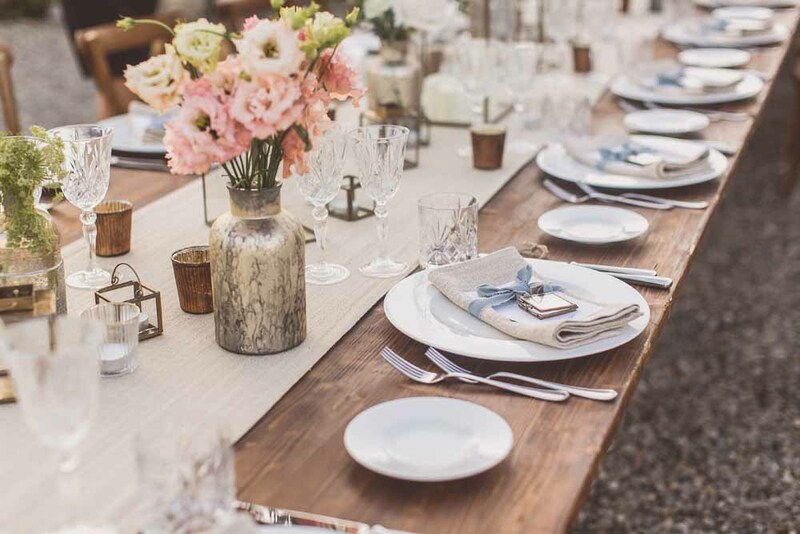 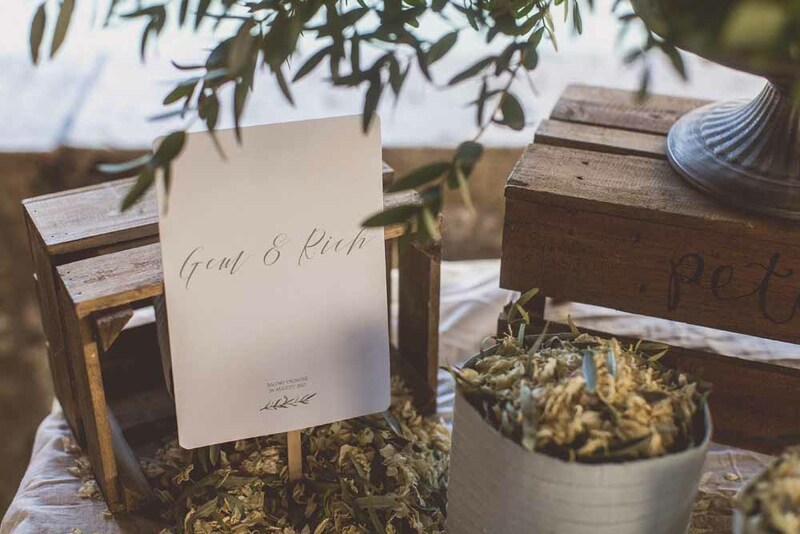 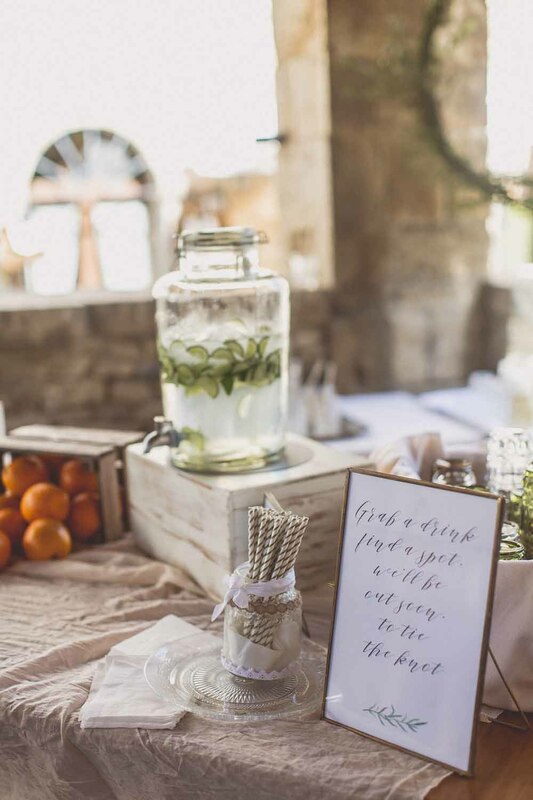 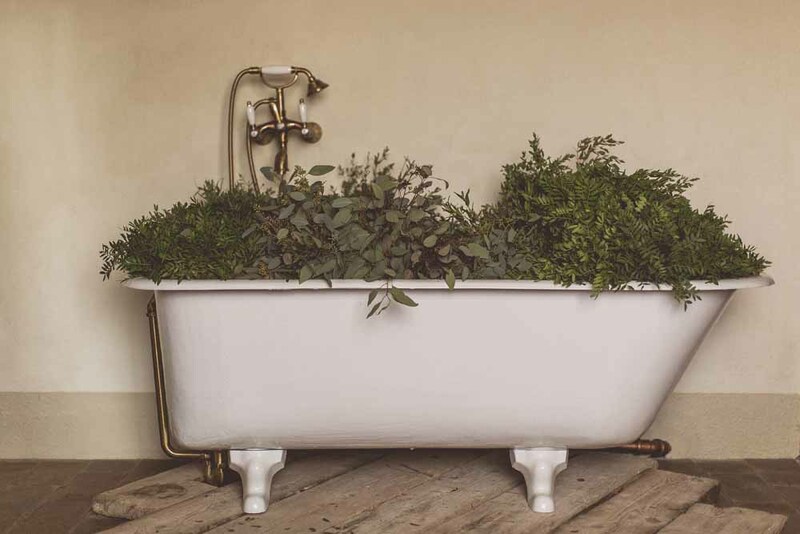 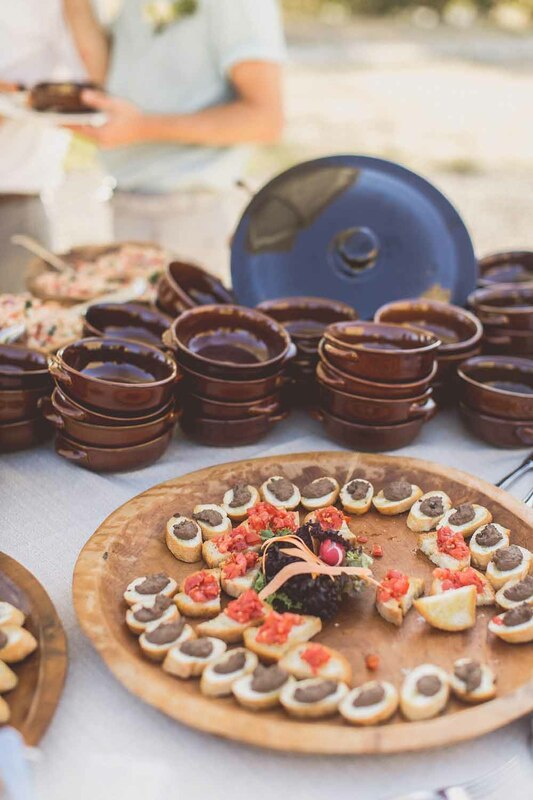 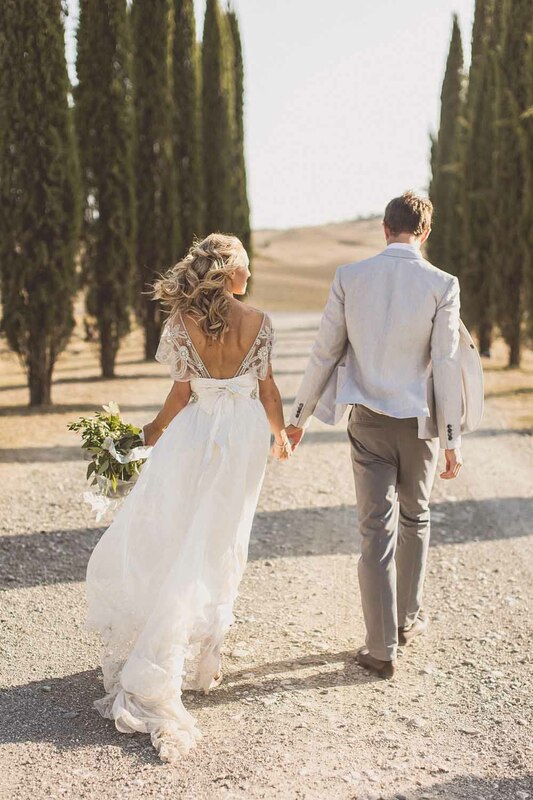 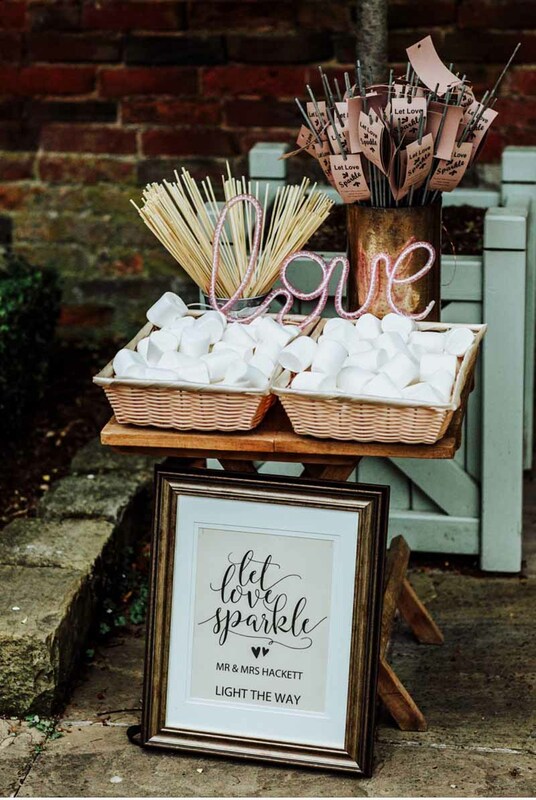 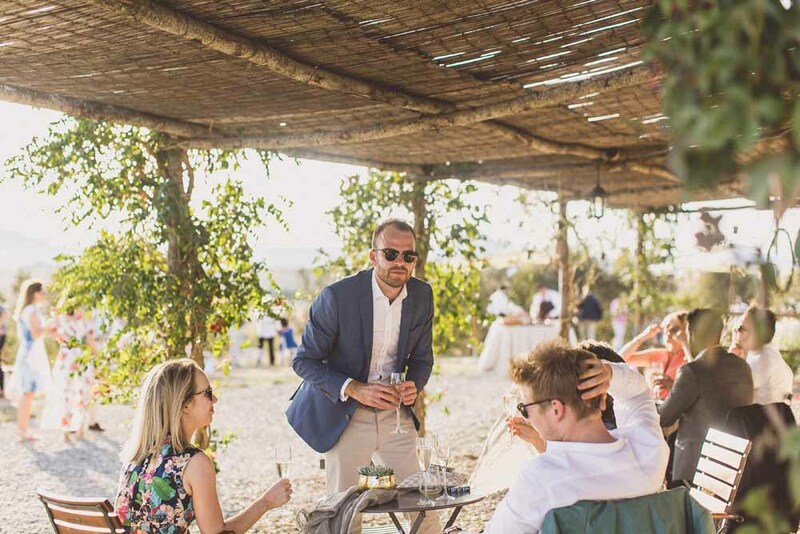 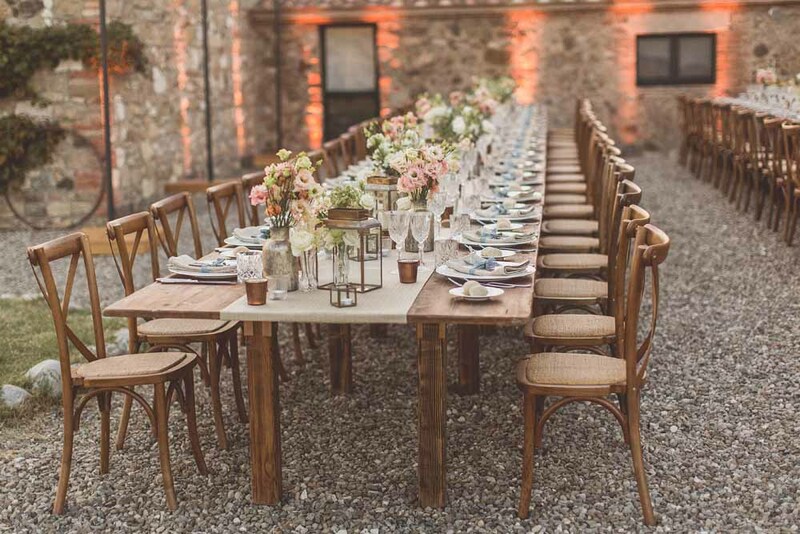 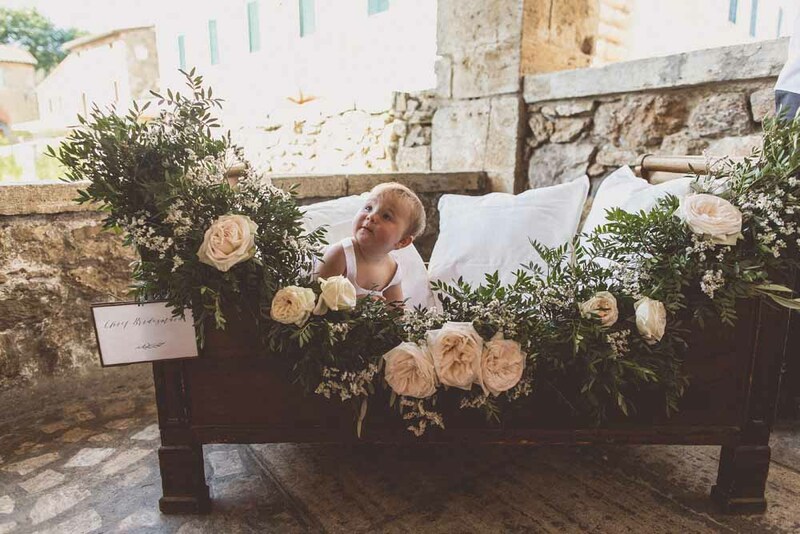 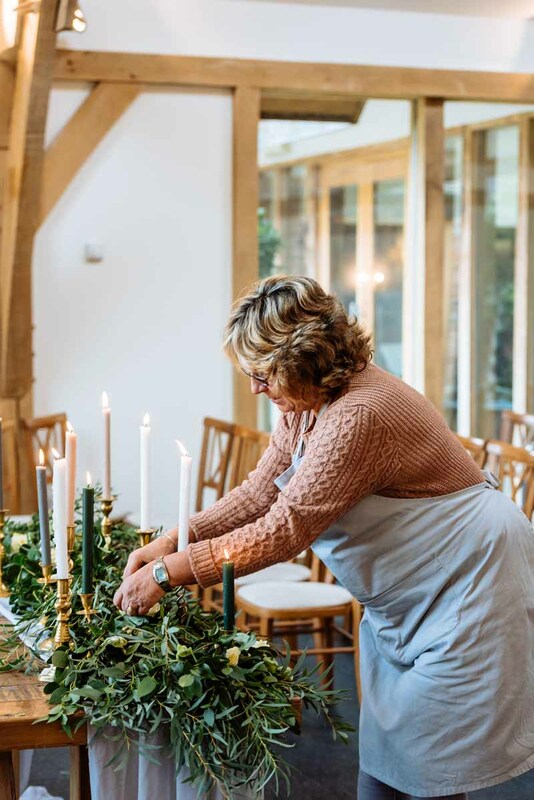 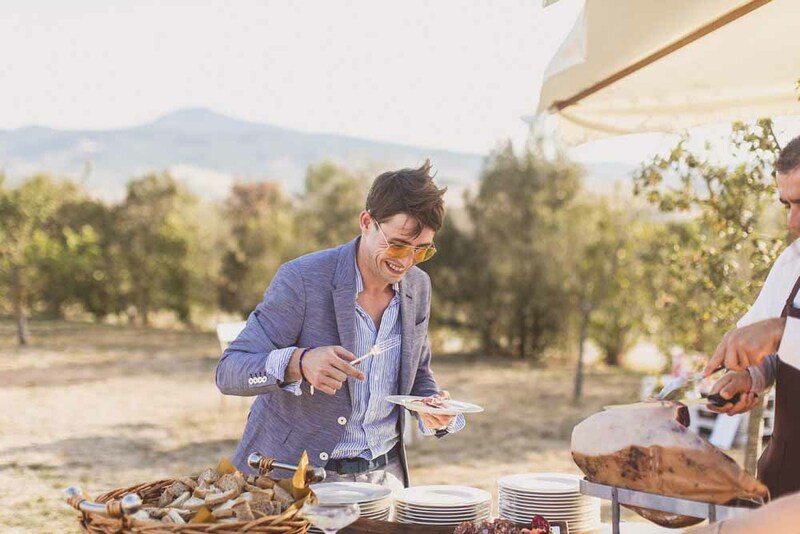 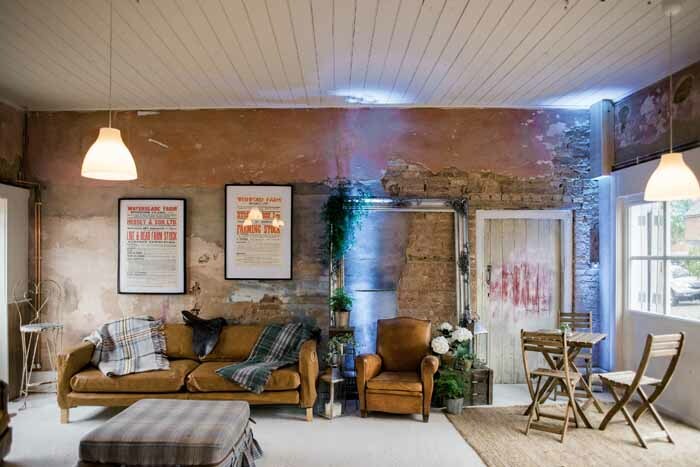 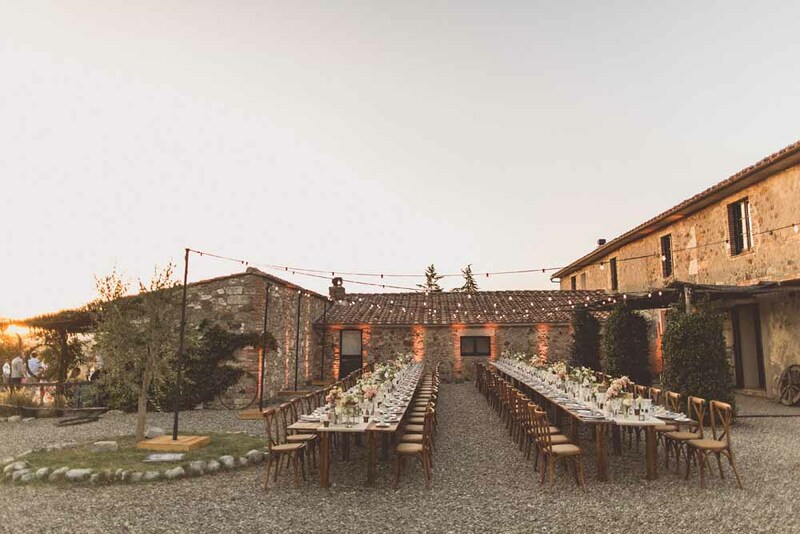 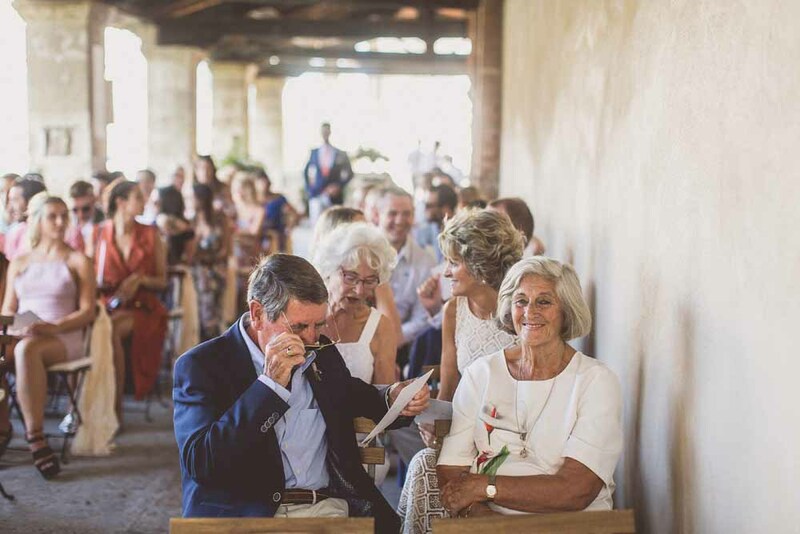 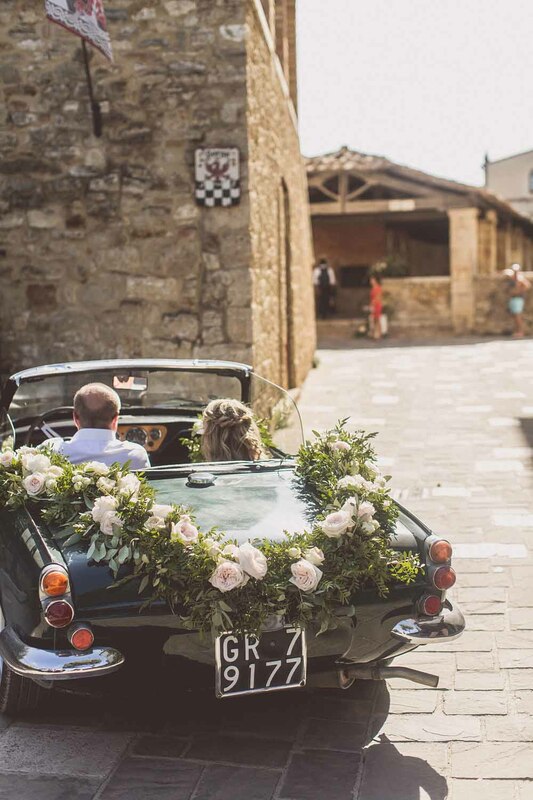 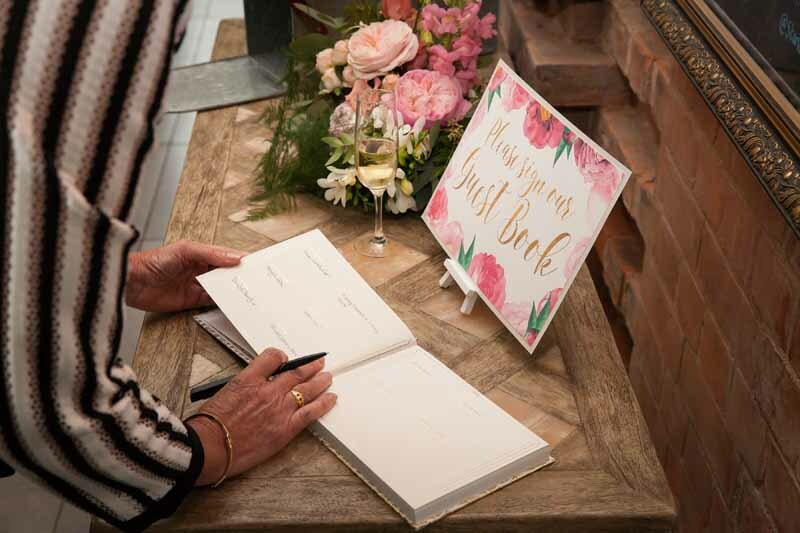 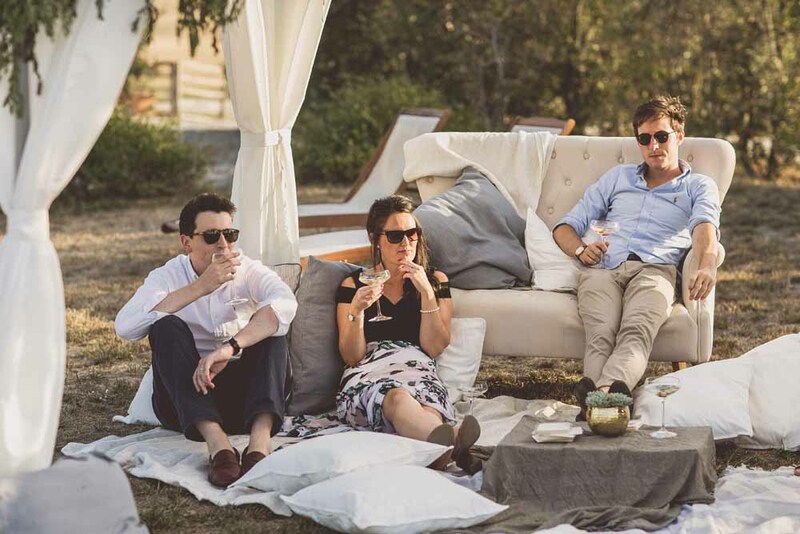 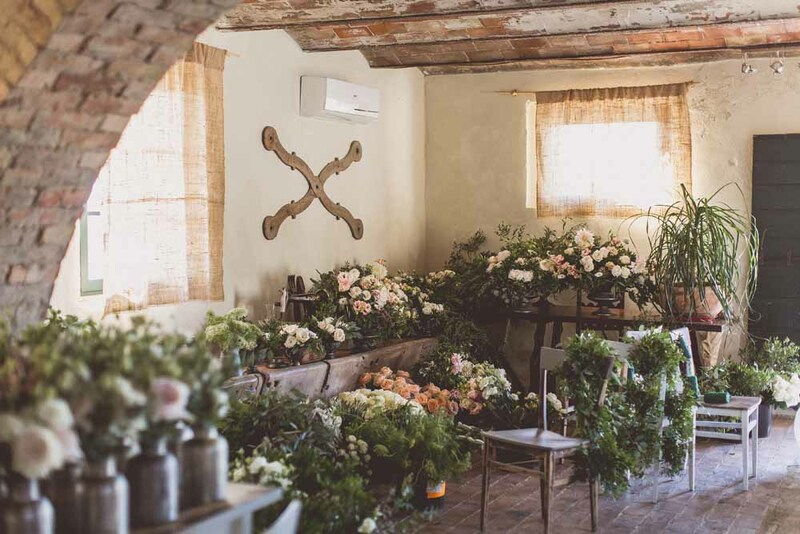 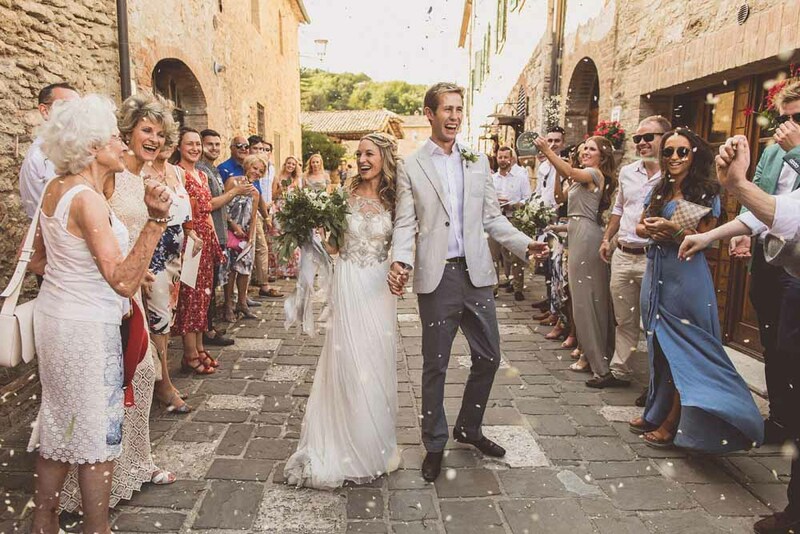 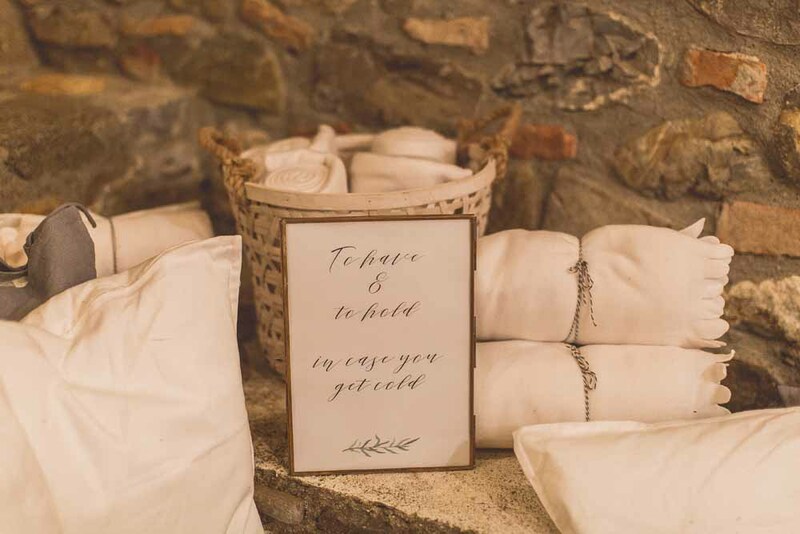 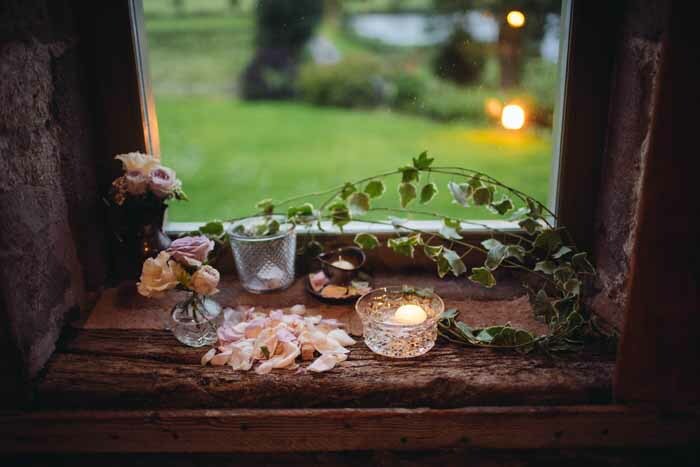 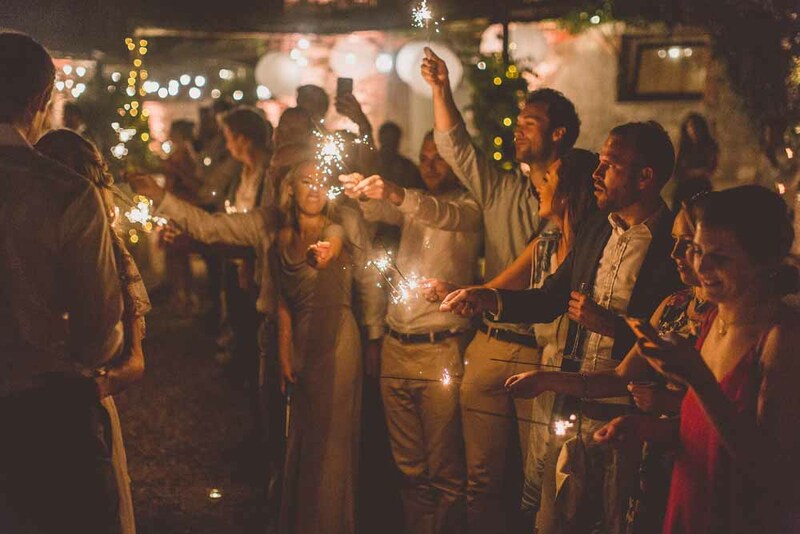 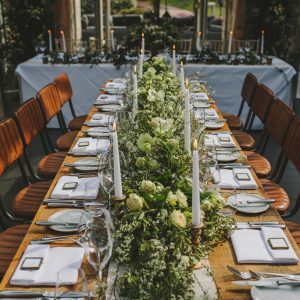 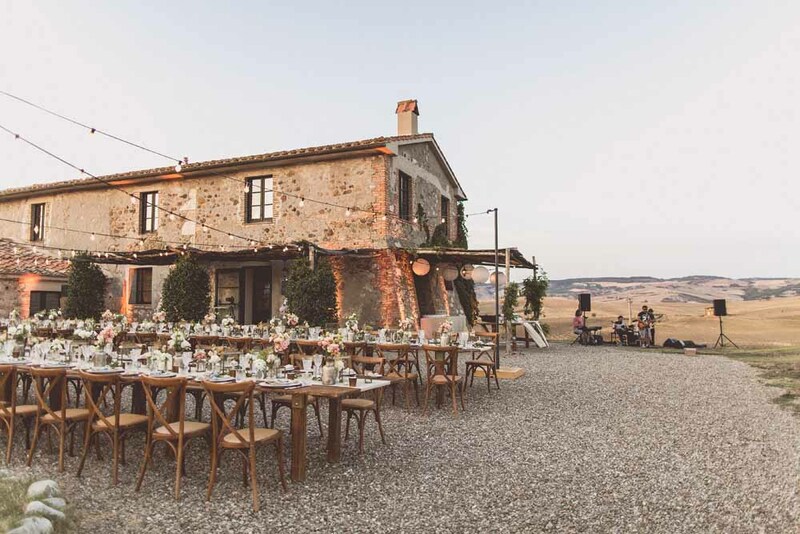 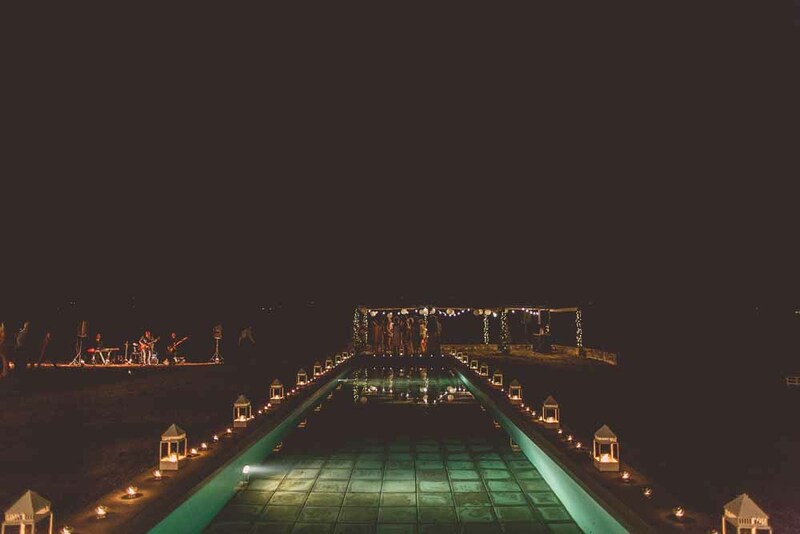 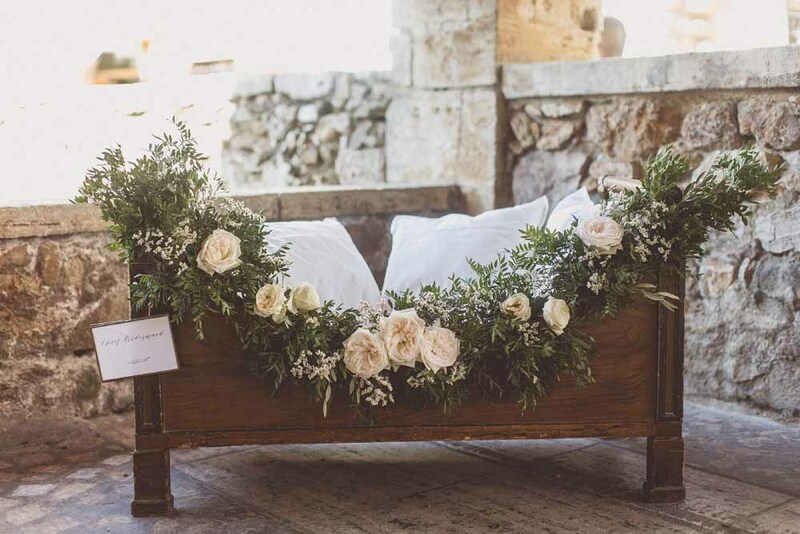 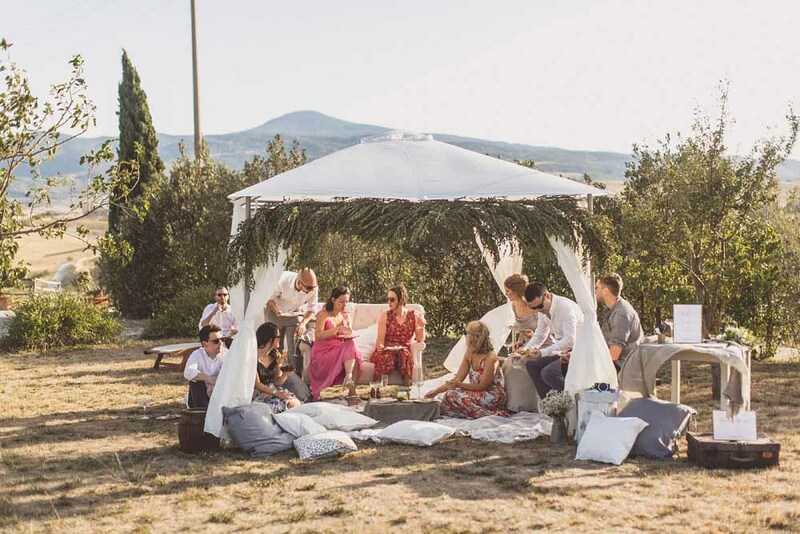 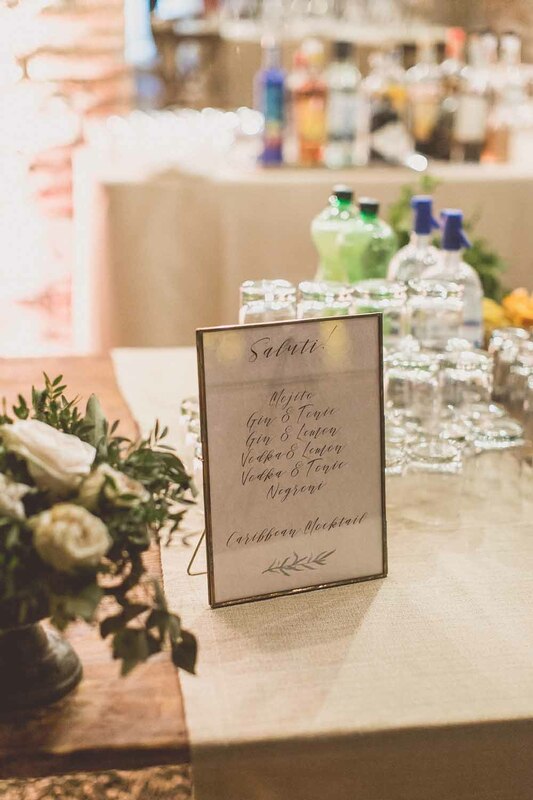 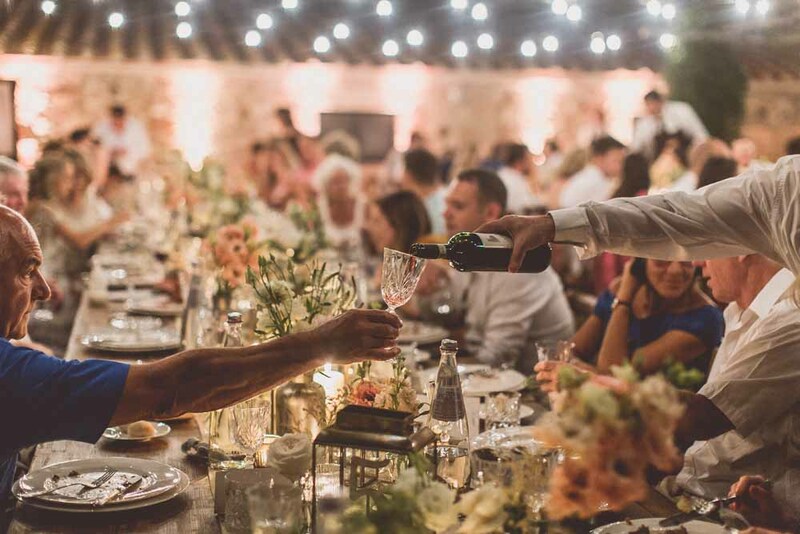 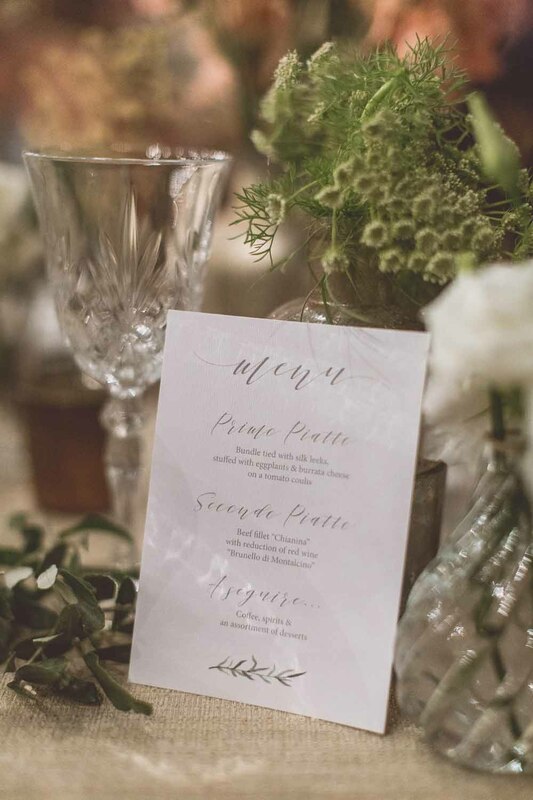 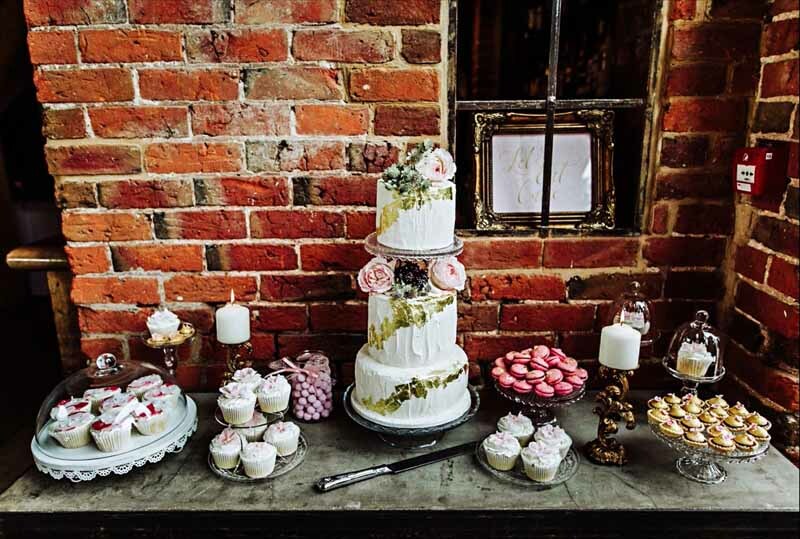 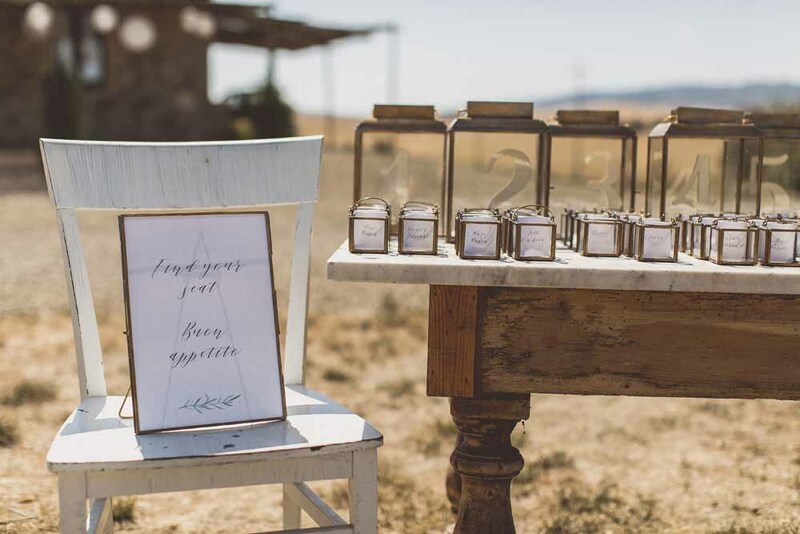 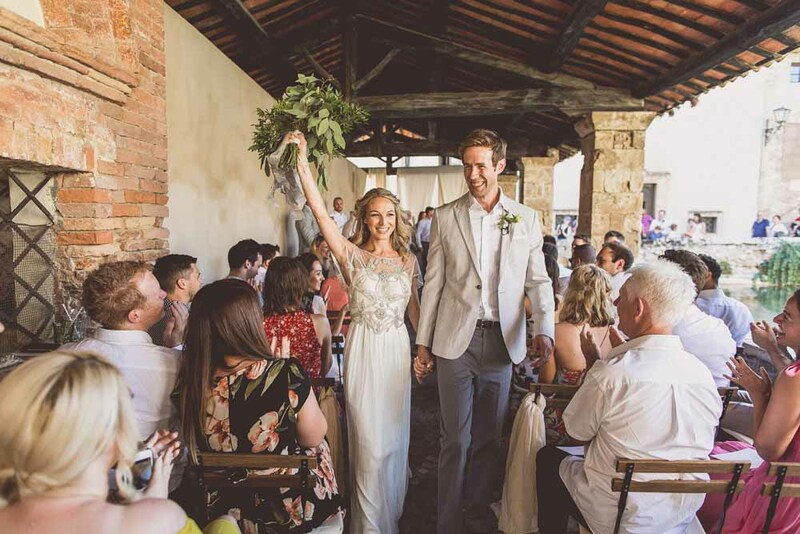 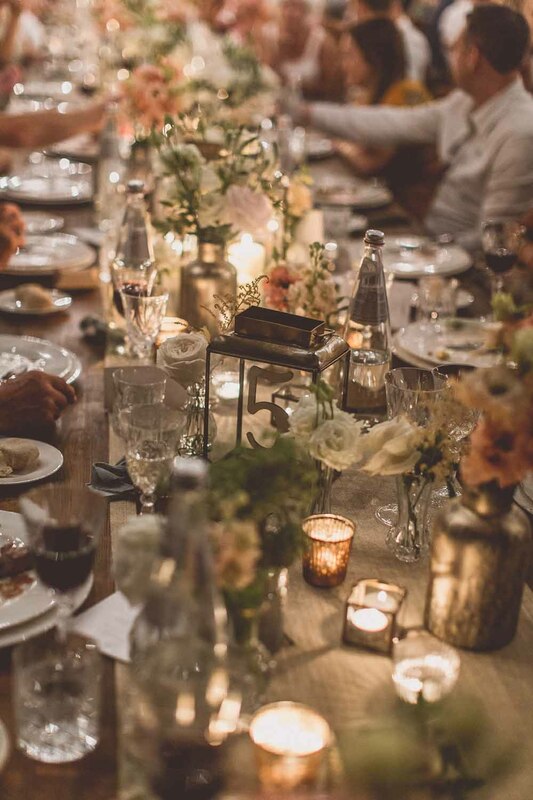 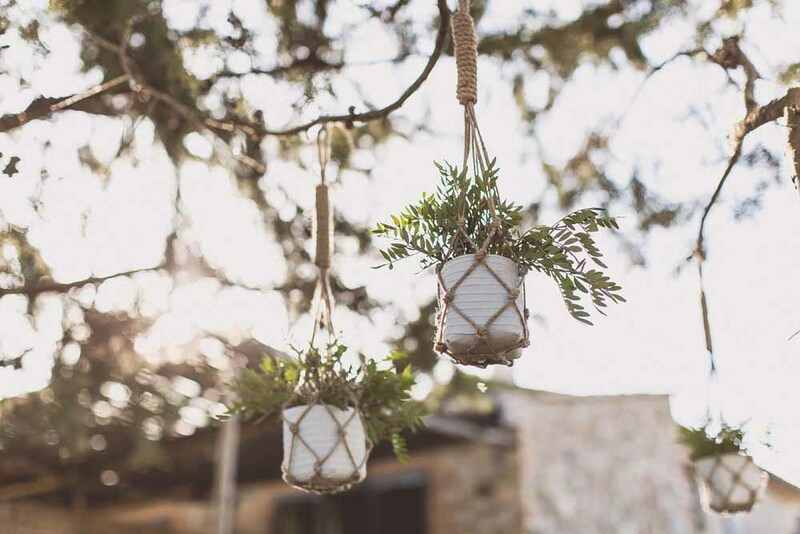 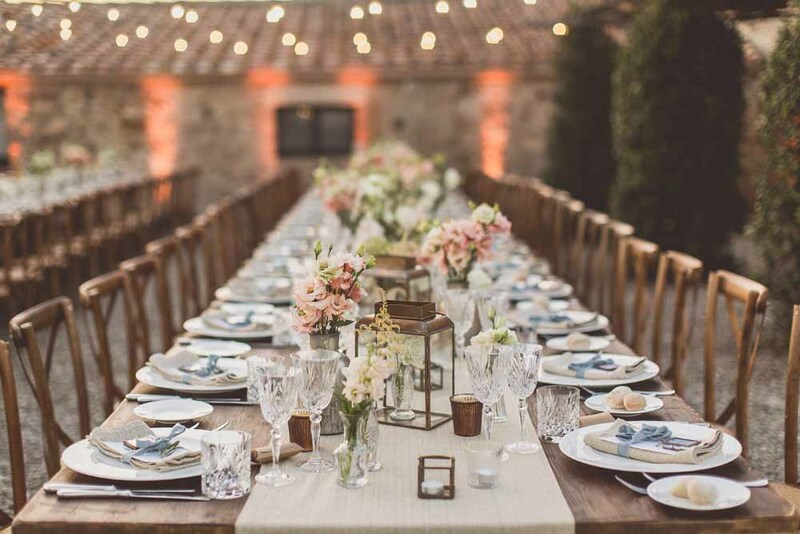 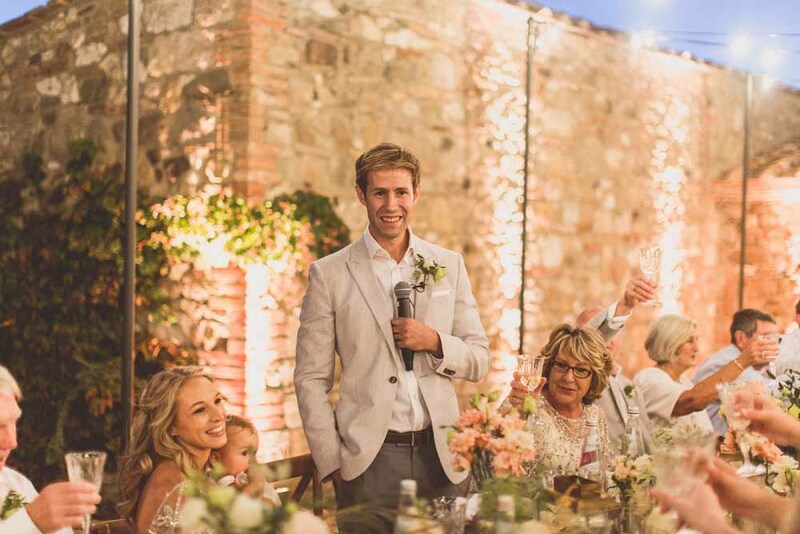 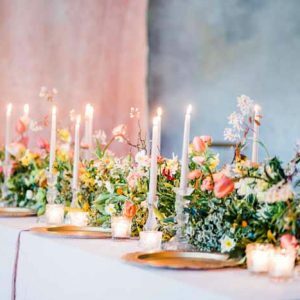 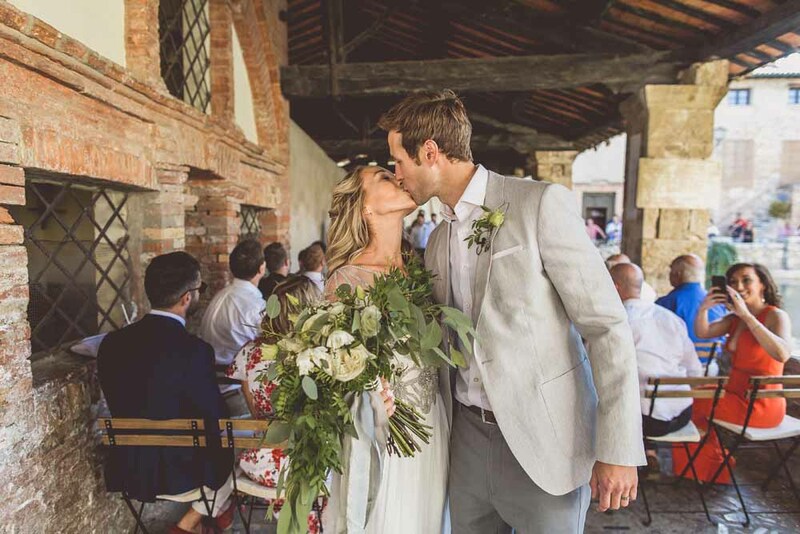 We always love a collaboration and when asked by Country Wedding Venues if we would like to work with The Rustic Wedding Company in styling Mythe Barn we jumped at the chance. 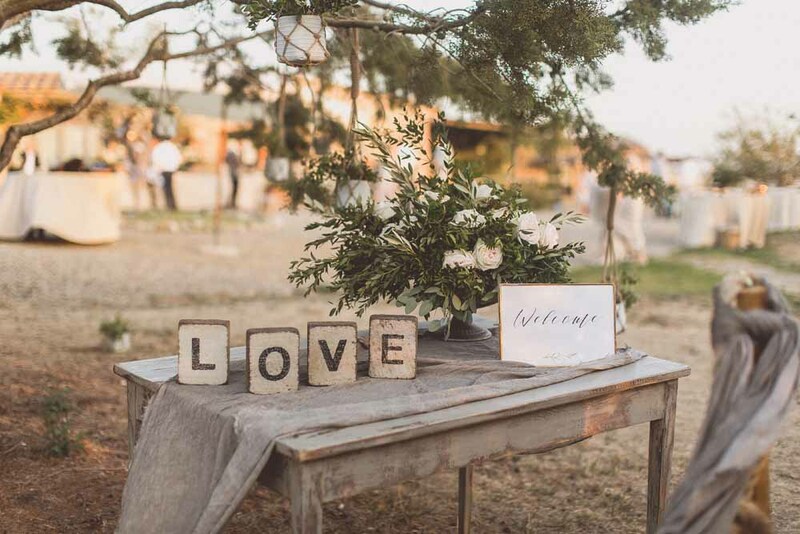 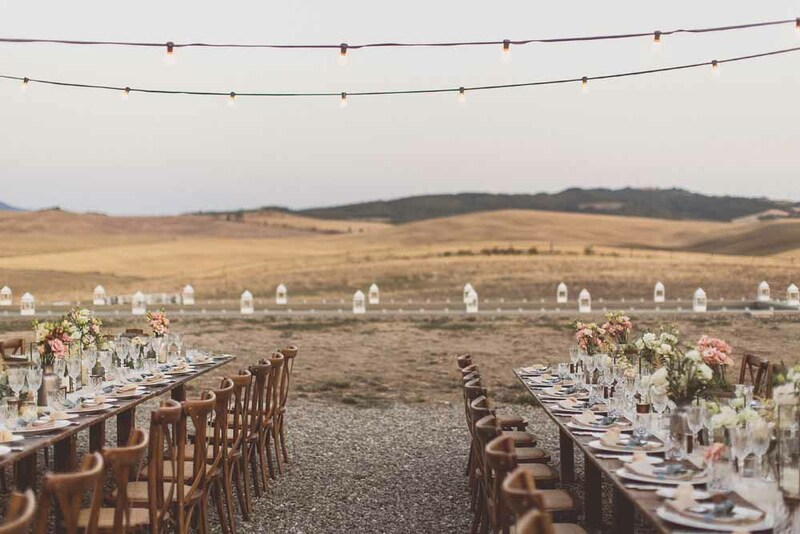 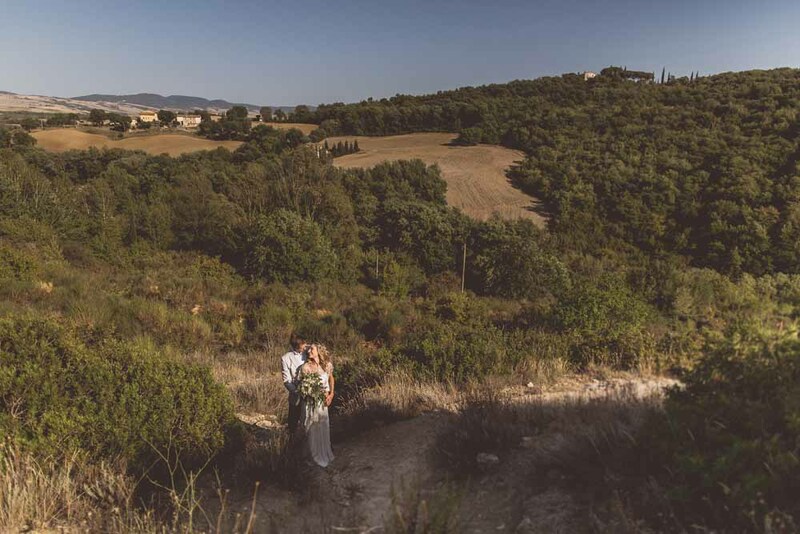 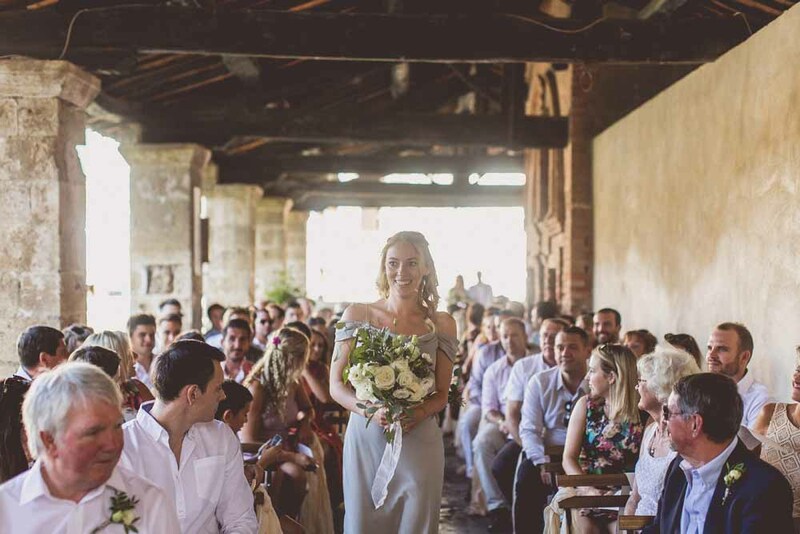 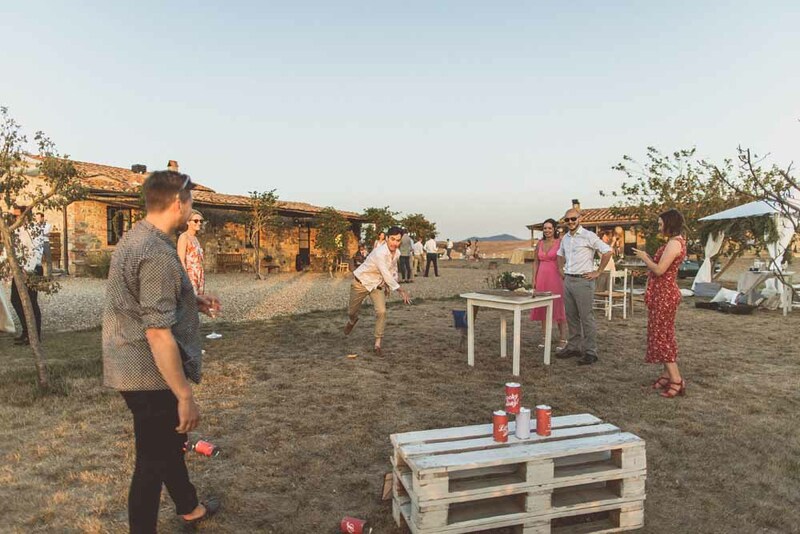 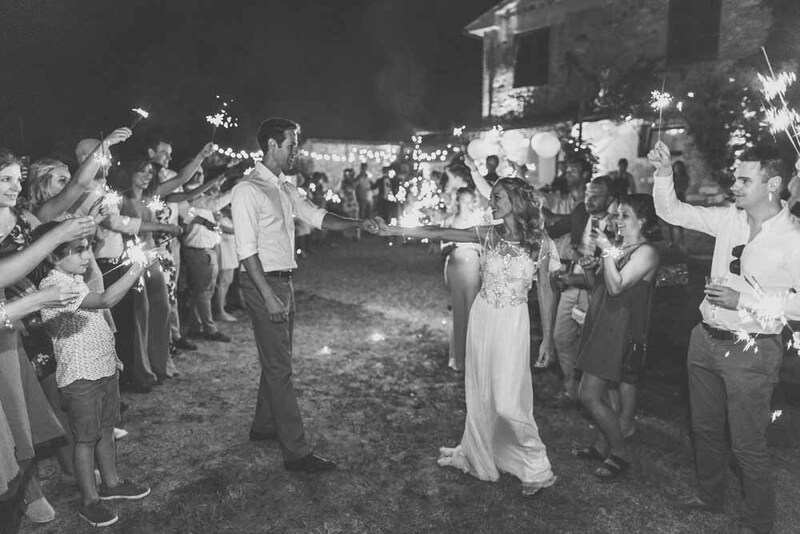 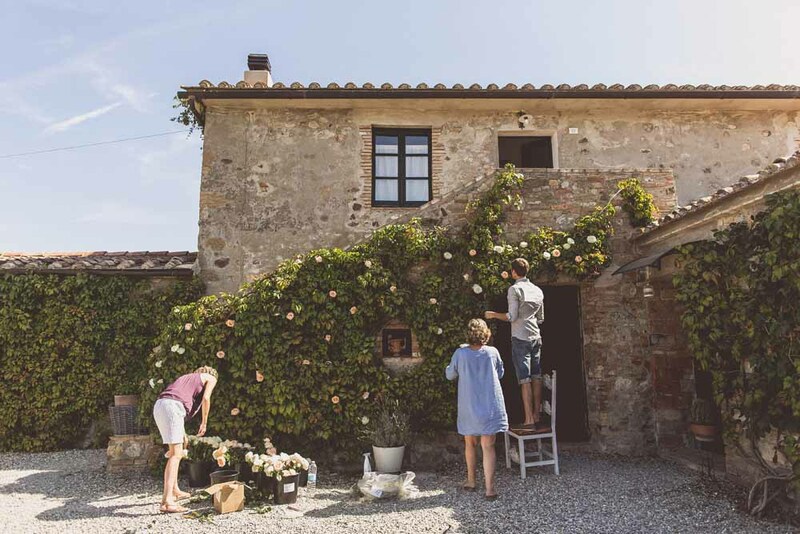 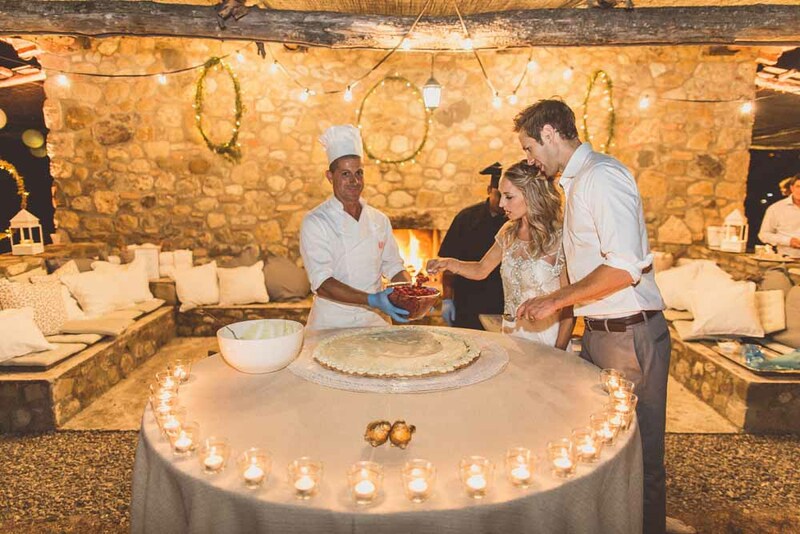 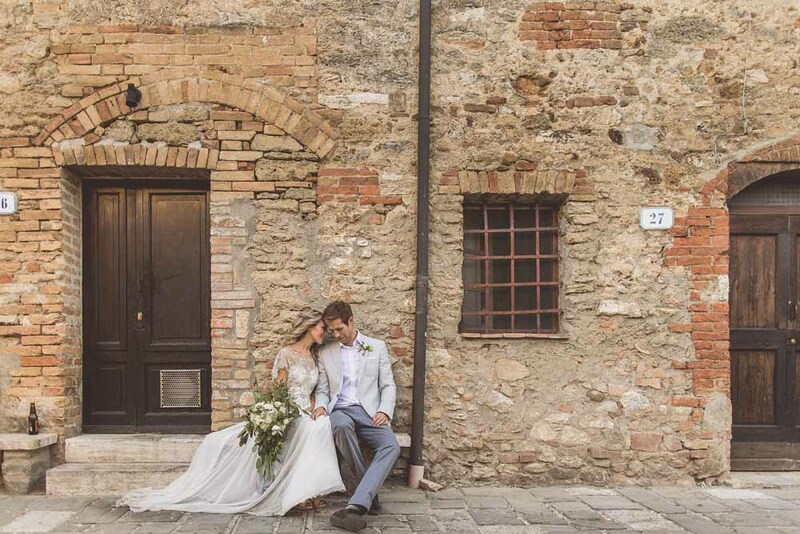 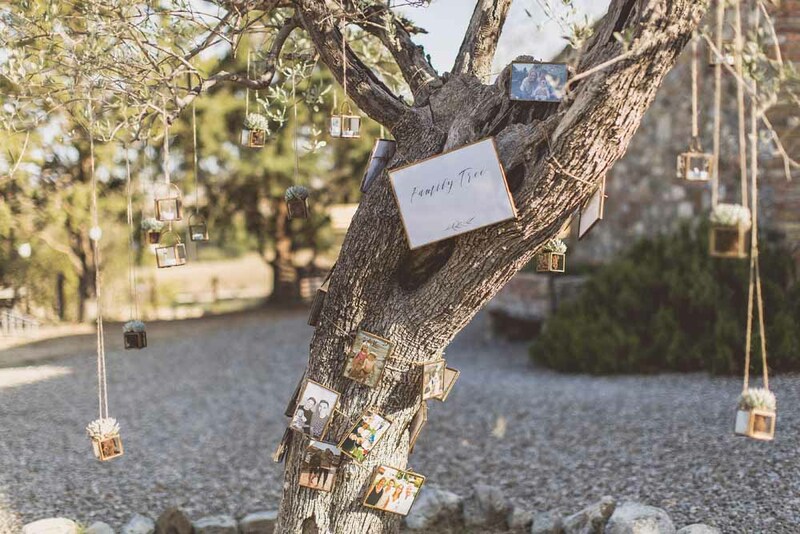 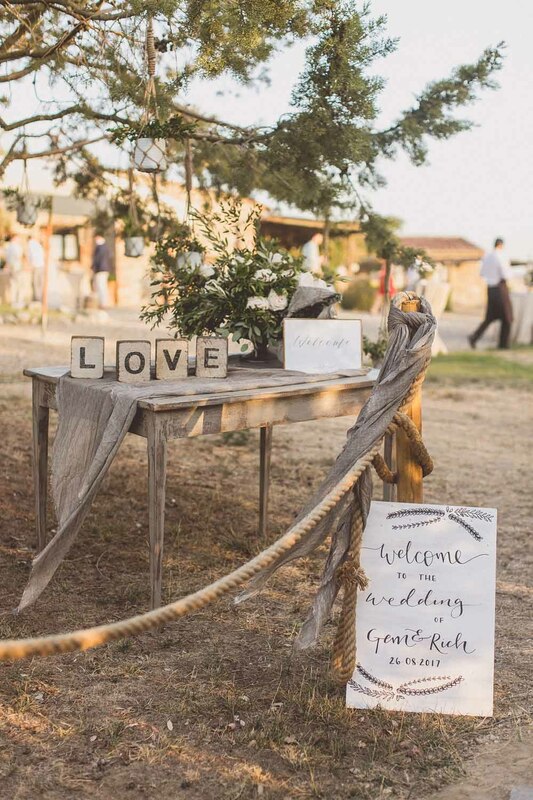 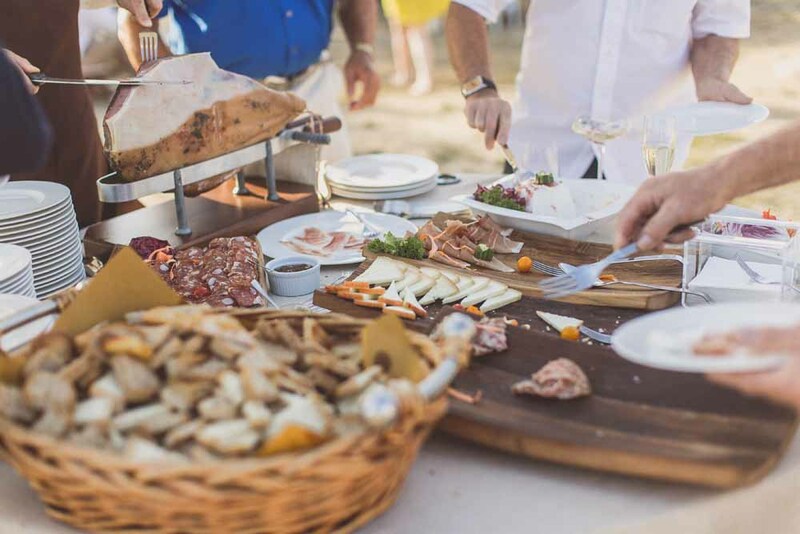 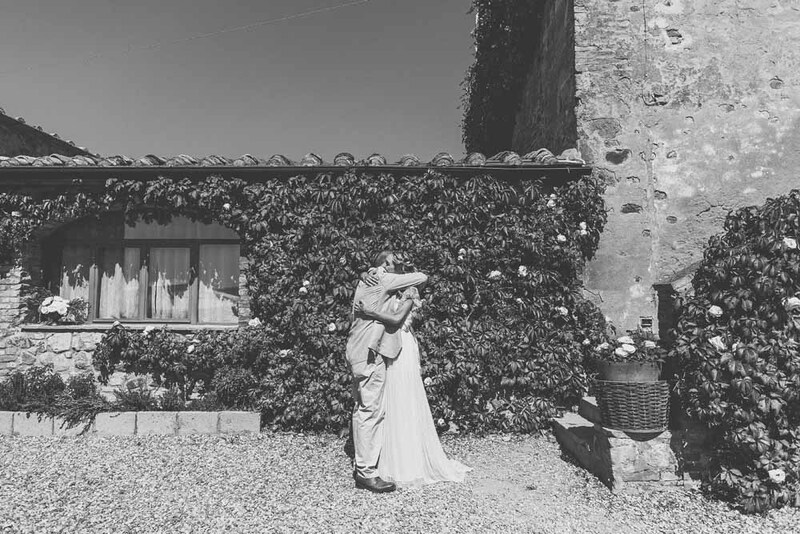 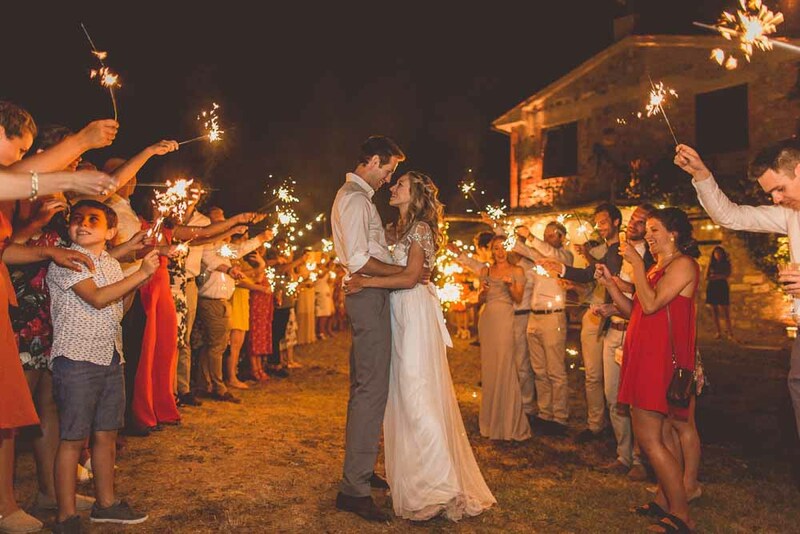 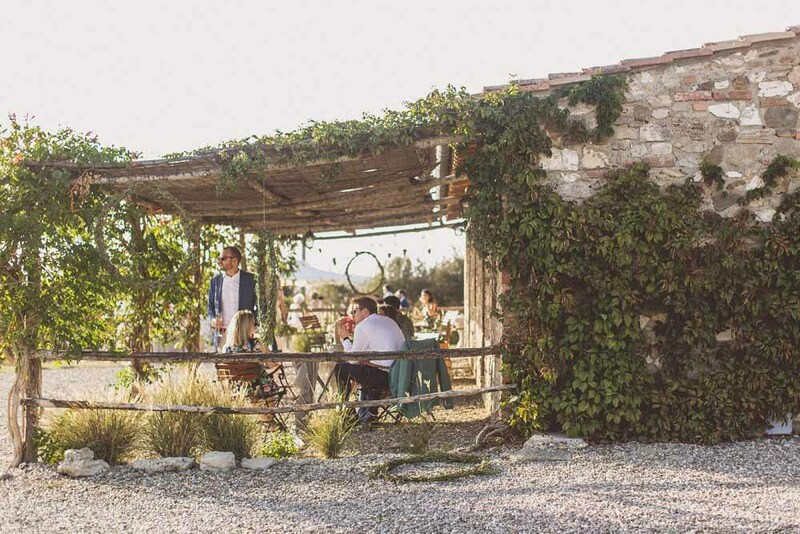 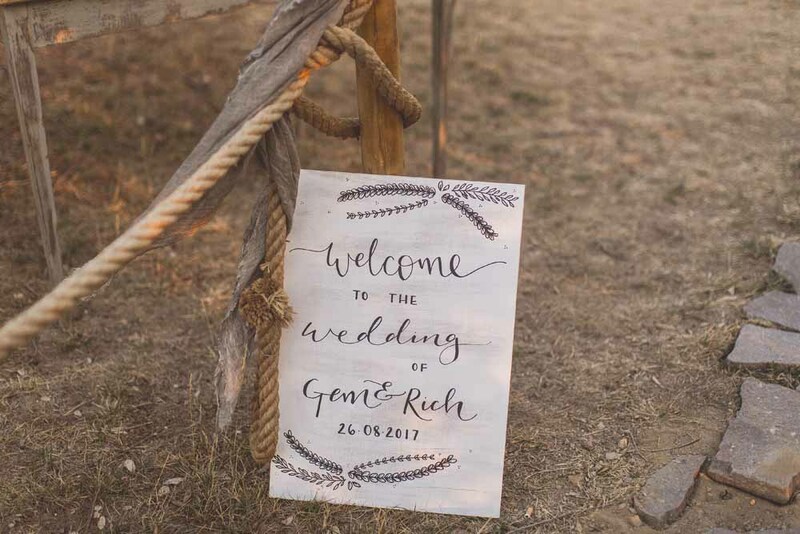 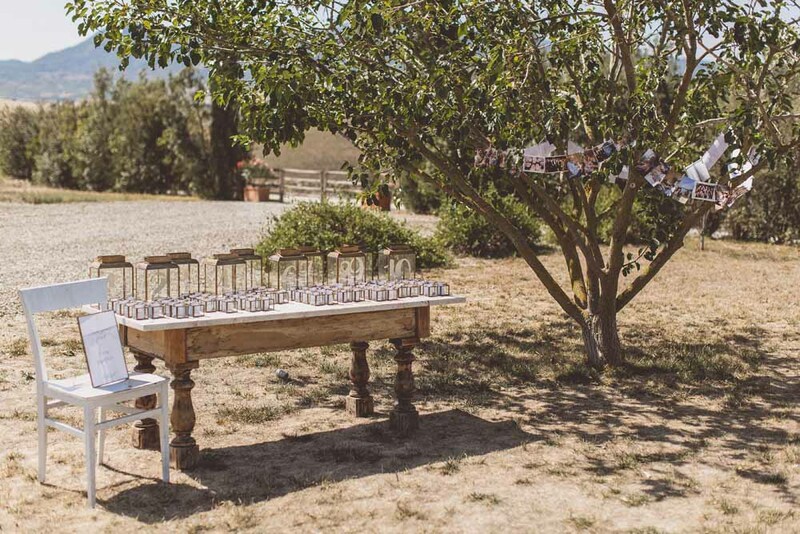 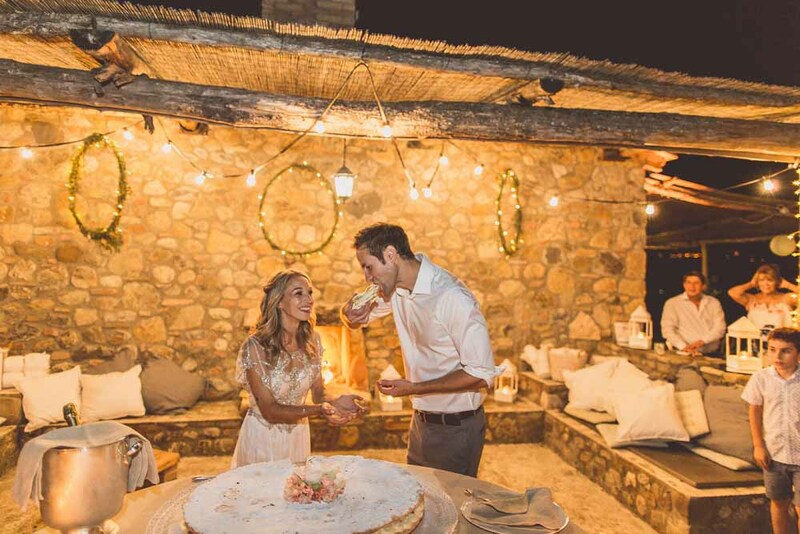 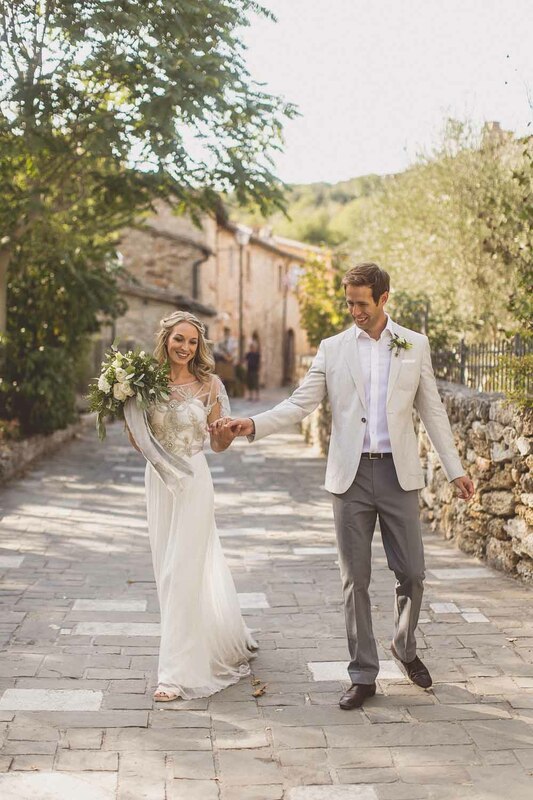 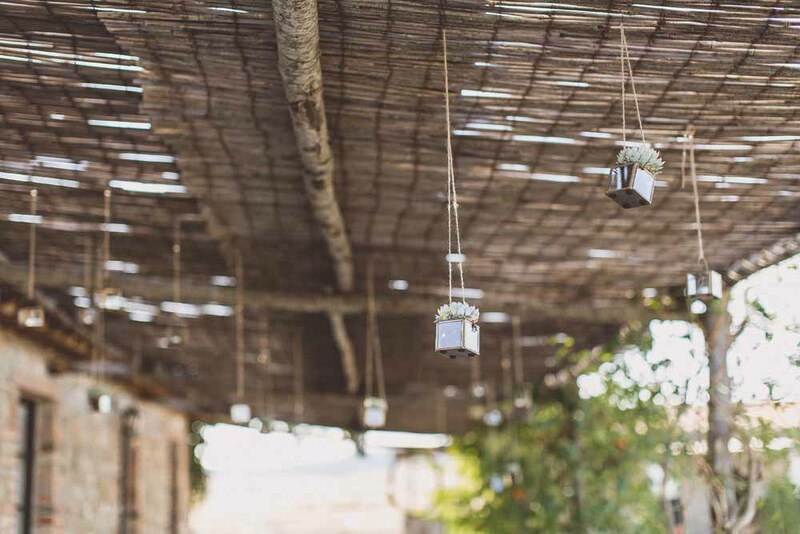 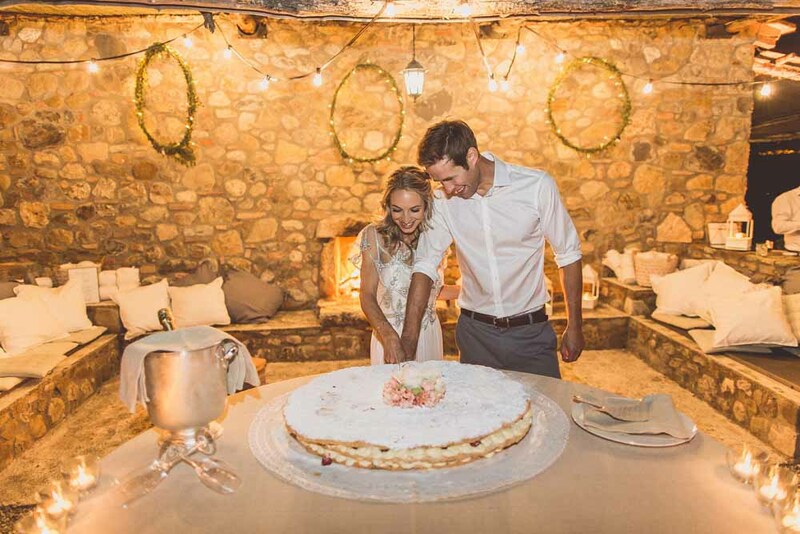 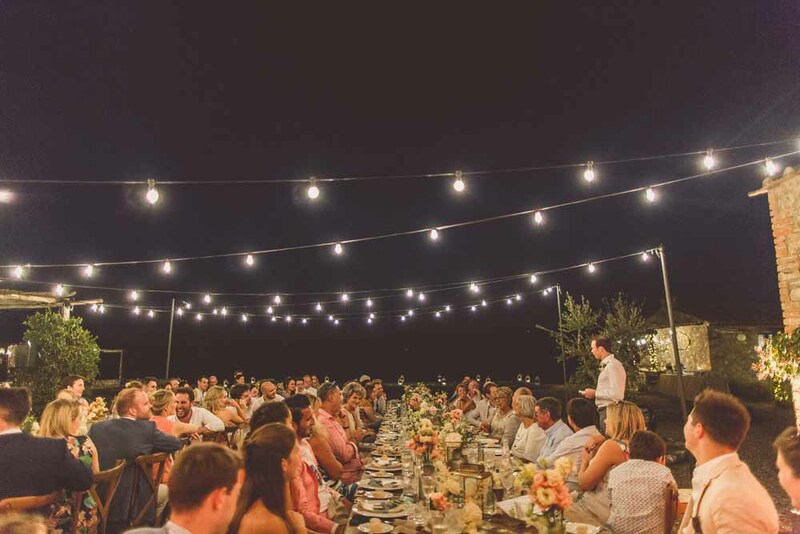 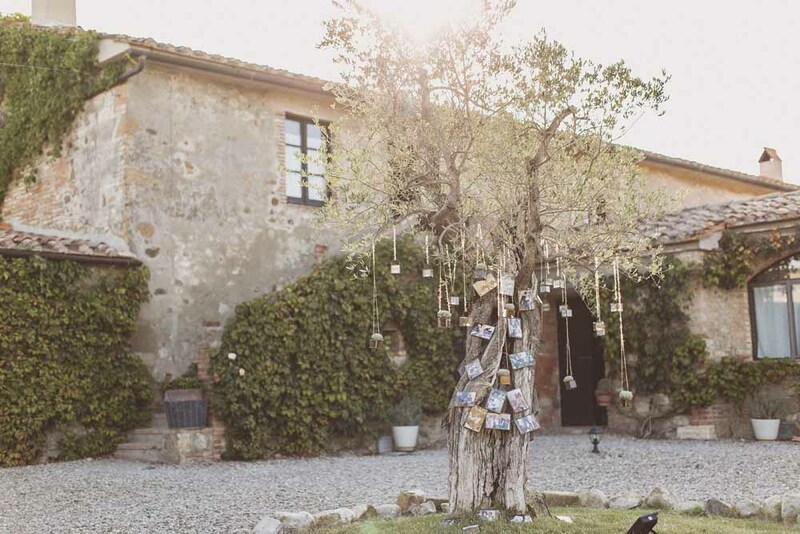 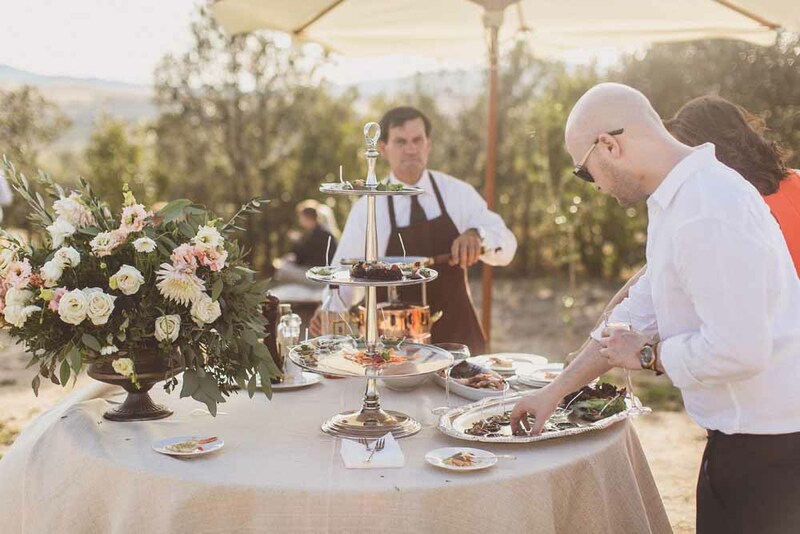 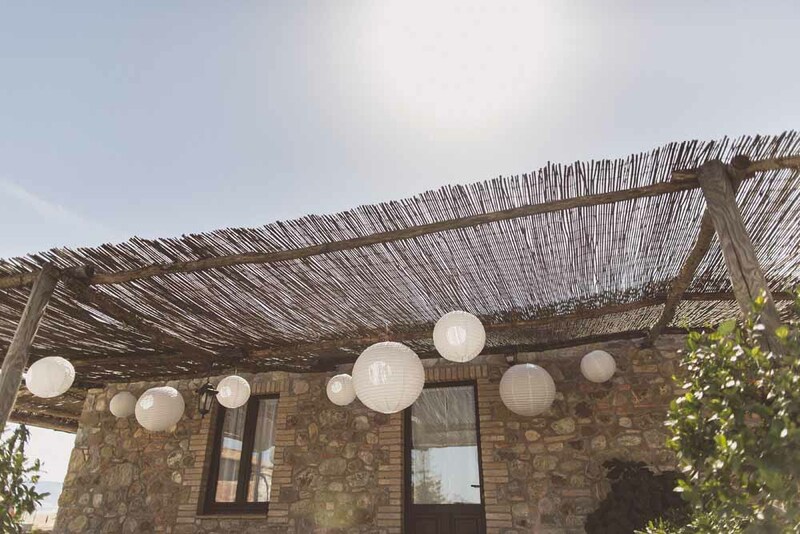 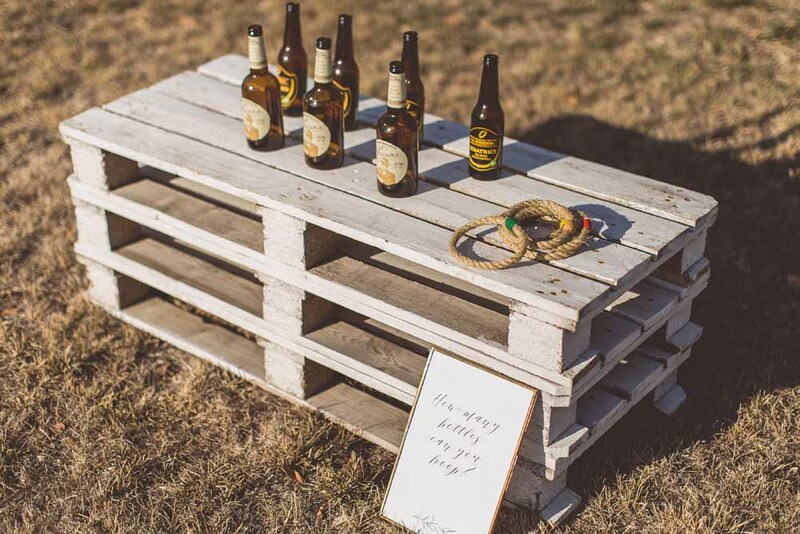 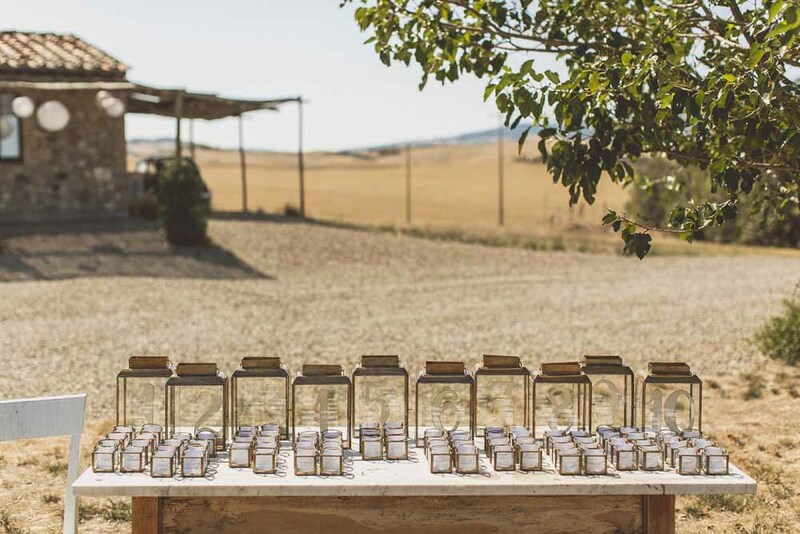 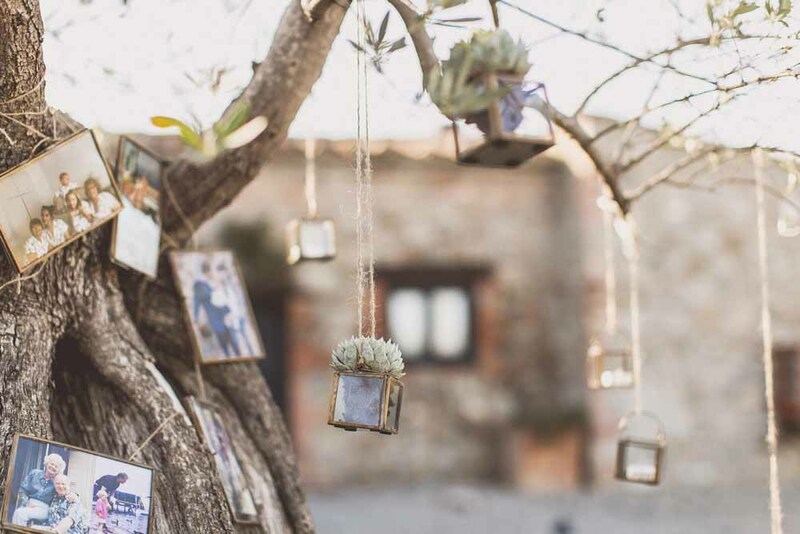 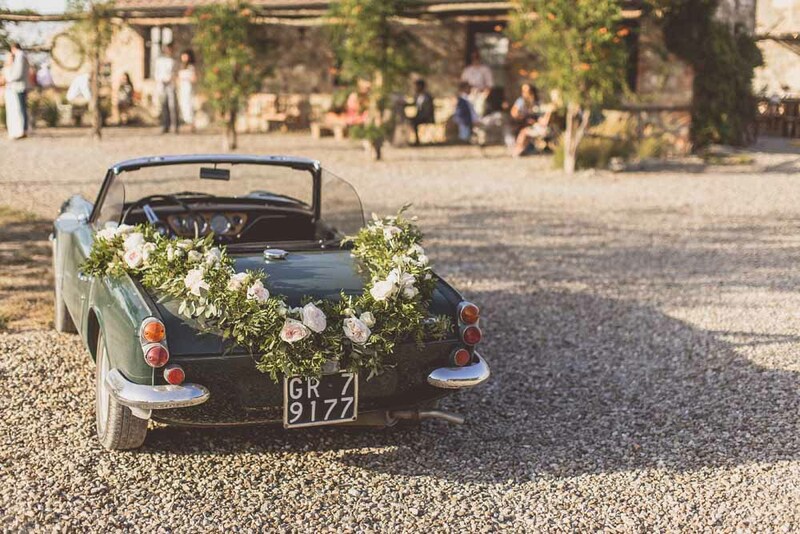 We love a rustic wedding as do so many of our wedding couples. 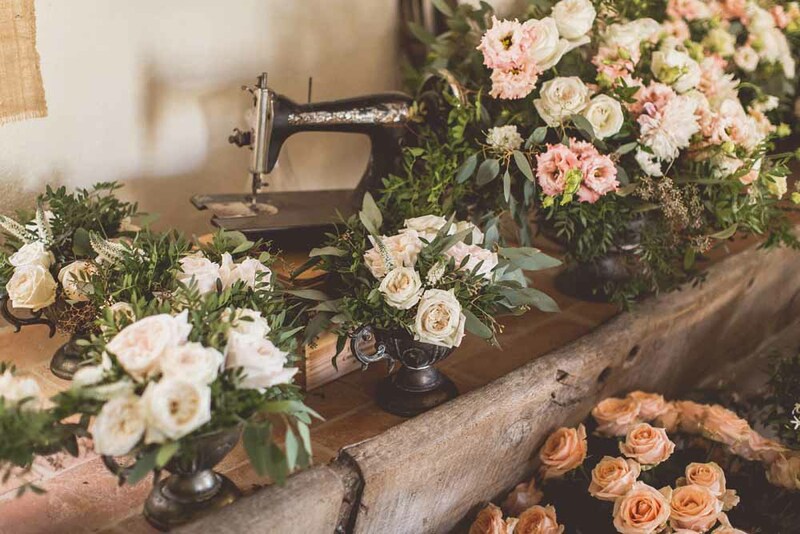 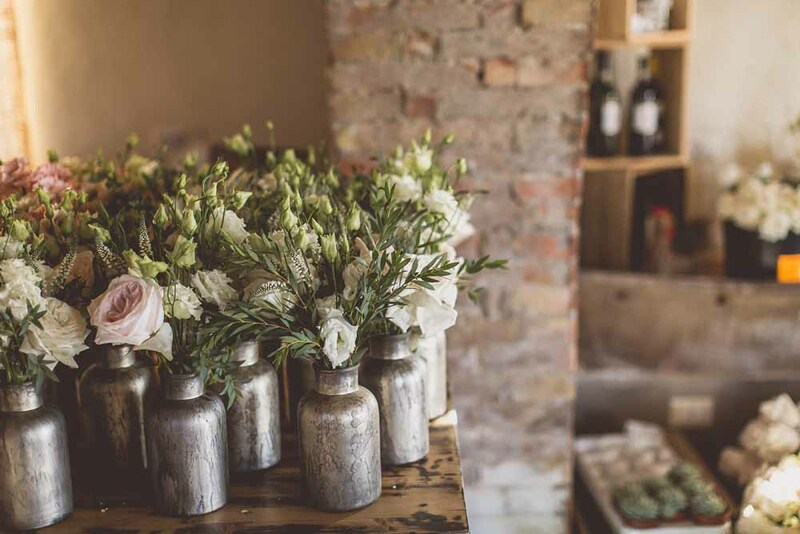 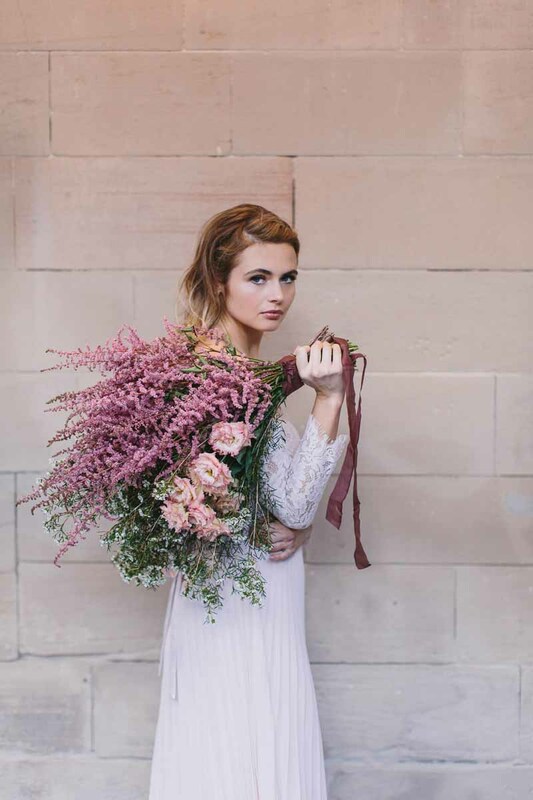 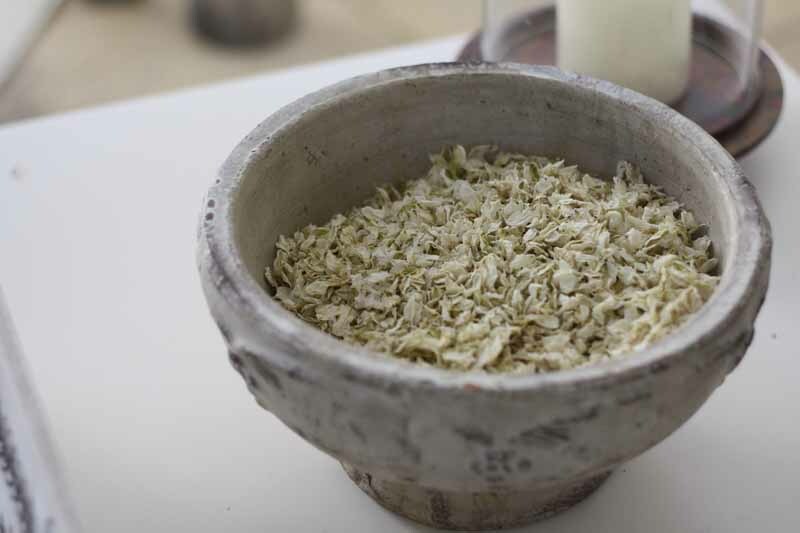 Natural organic style wedding flowers are key to creating a relaxed look to a rustic wedding. 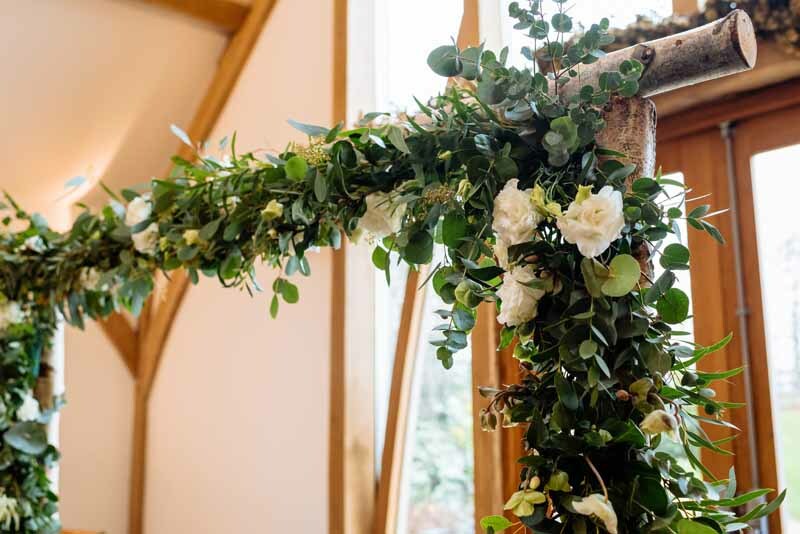 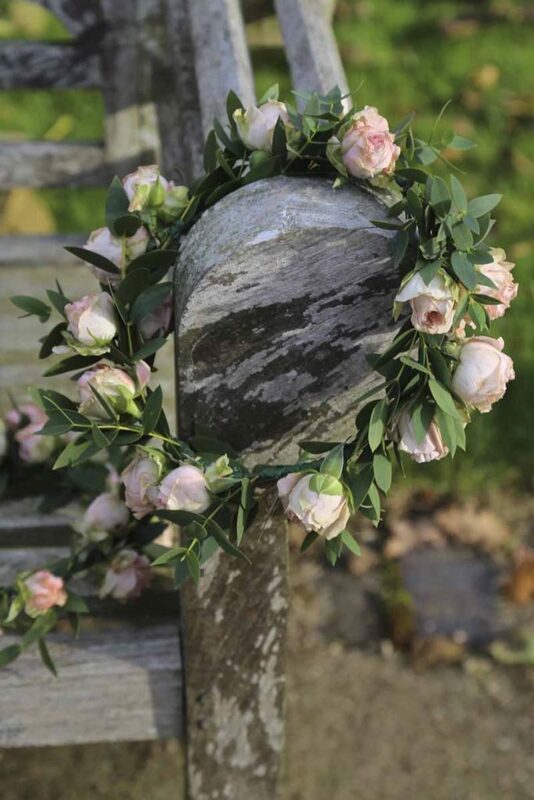 Starting with our birch arch we added a mix of foliage, we usually use a mix of at least 3 different types of foliage, with a mix of roses, helebores and lisianthus to lighten the look. 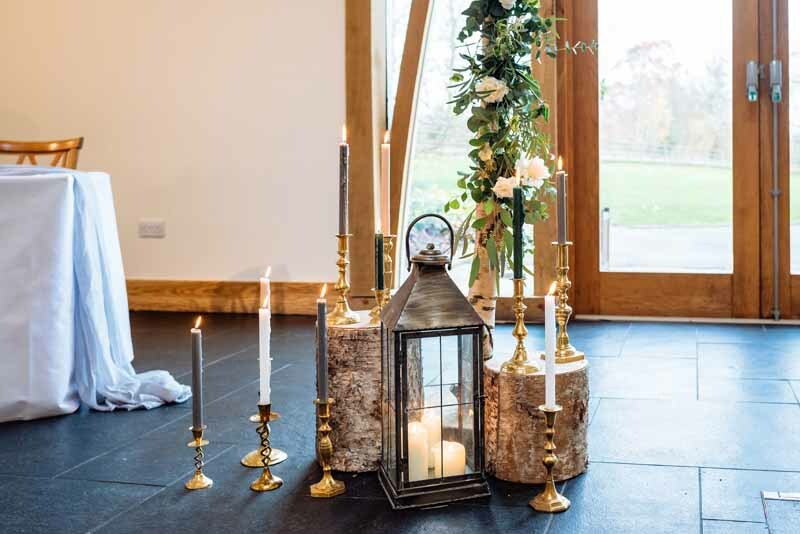 Our tree stumps and lanterns tied the look together with a mix of candlesticks. 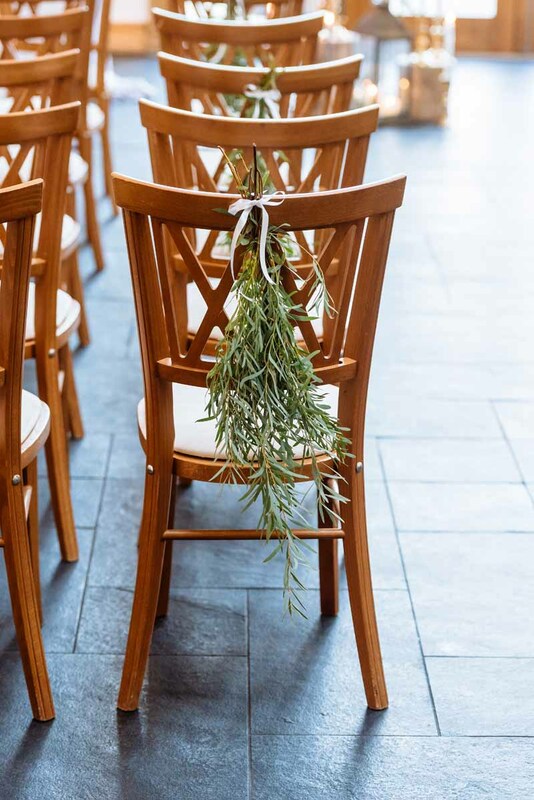 Aisle chairs were finished off with a bunch of eucalyptus to complete the look. 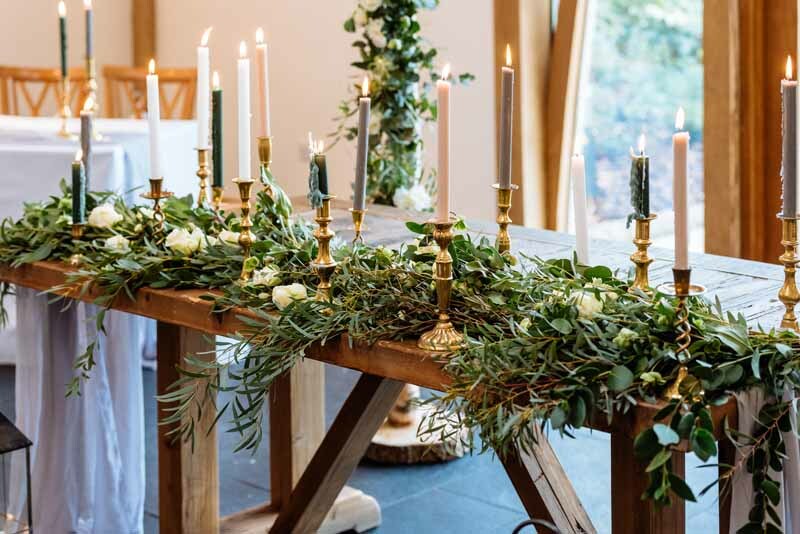 The wooden ceremony table has a soft runner, an array of gold candlesticks and a mass of foliage garland with highlights of natural flowers. 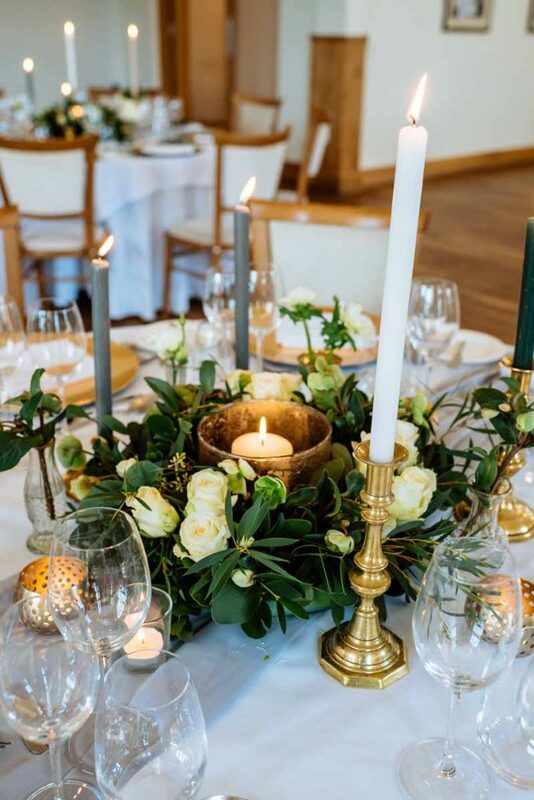 The guest tables centrepieces continued the gold and green scheme with gold hurricane vases with a candle framed by a ring of foliage and flowers. 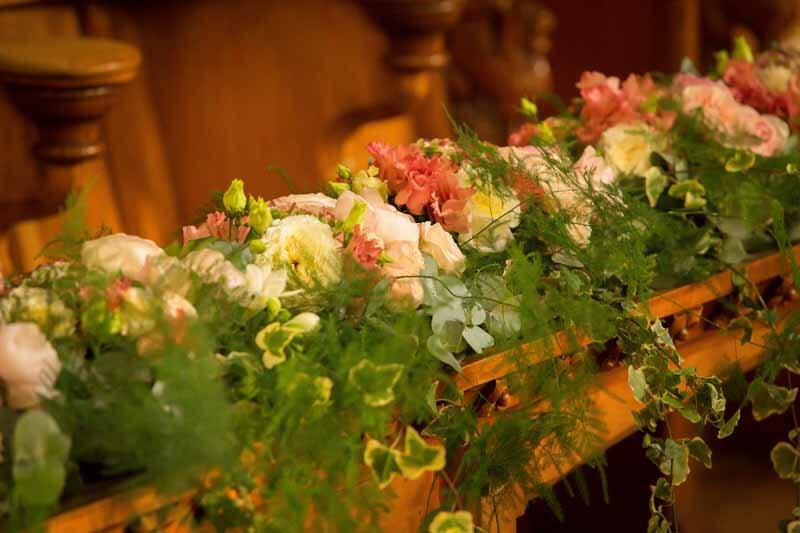 Flowers here included anenomes, helebores and roses. 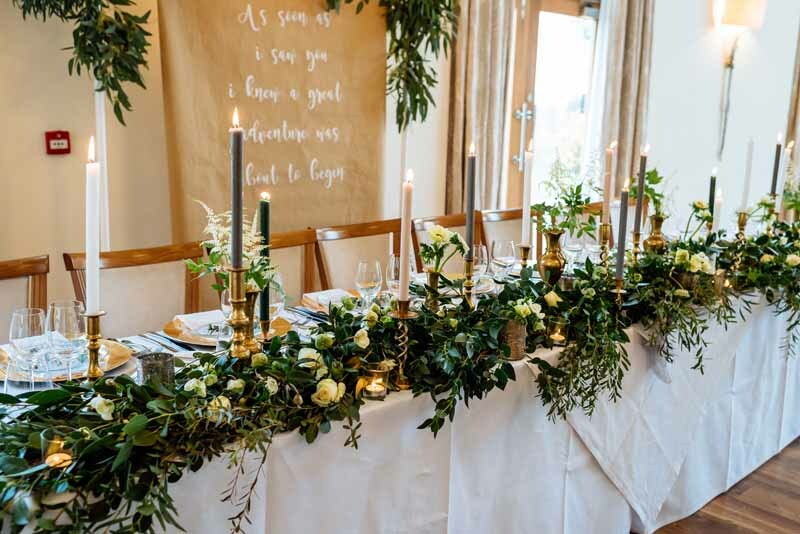 If you are having a backdrop behind the top table make sure it continues the feel of your wedding day, for a rustic wedding add large amounts of foliage for a natural organic look. 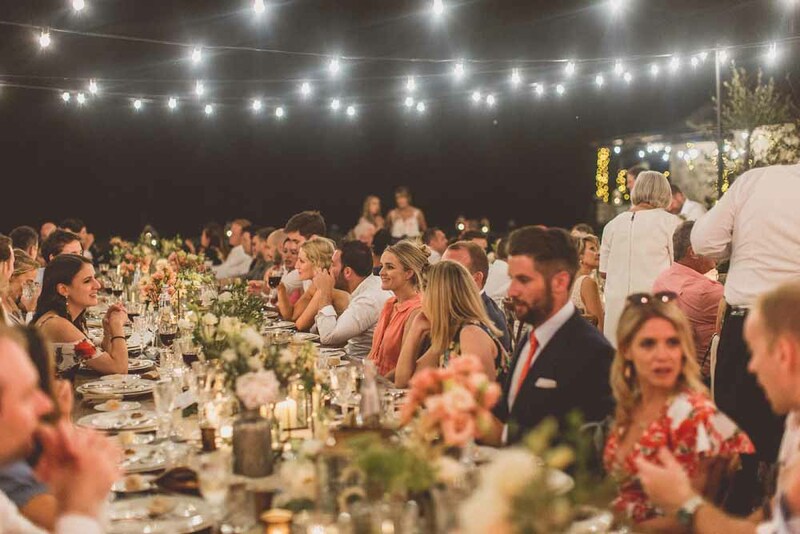 All eyes are on the top table and it should be a feast for the senses, this will be the focal point for the duration of the speeches so you’ll want it to look as pretty as can be. 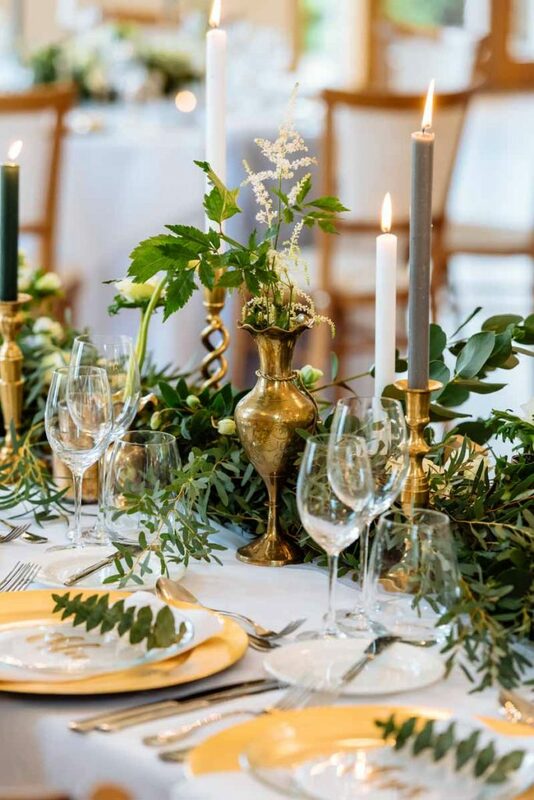 The richness of the gold together with the organic green foliage and soft, delicate blooms caught the magic of the day. 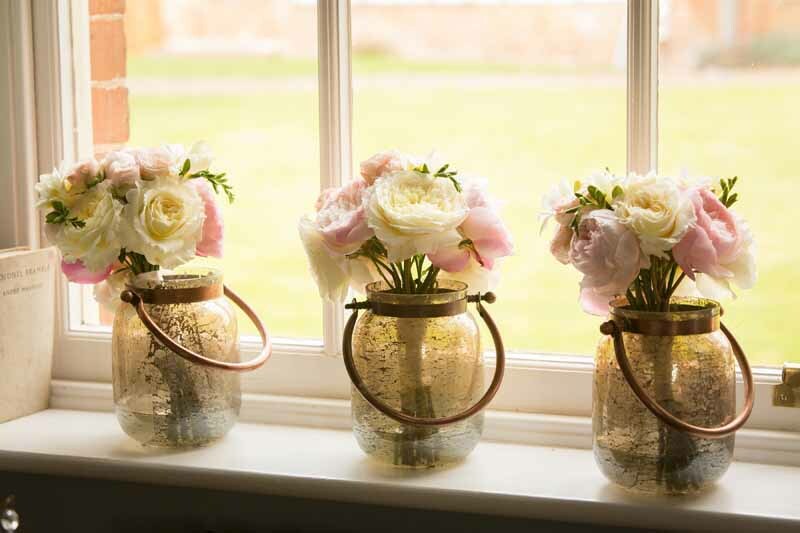 I just love the whimsical astilbe in the gold vases and the softest anemones in the lower vases. 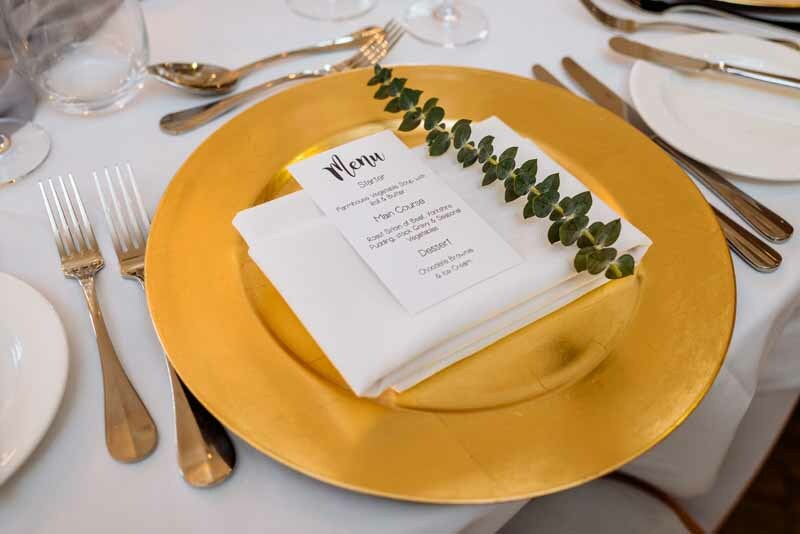 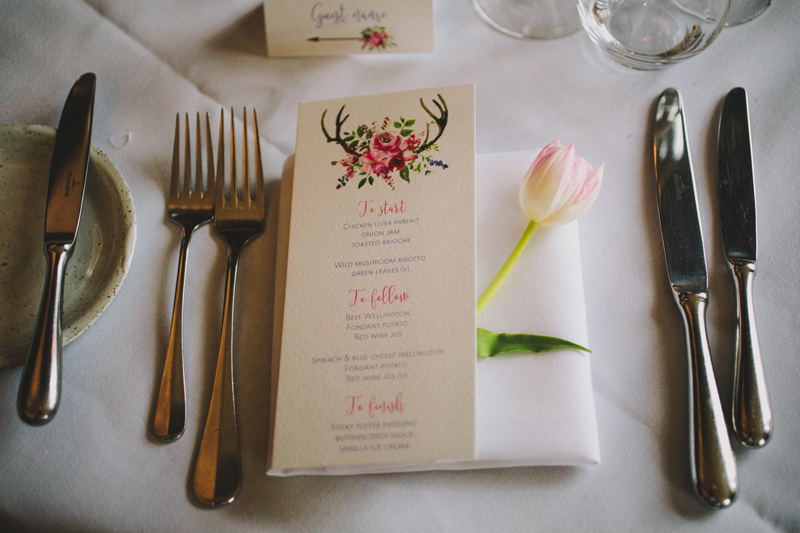 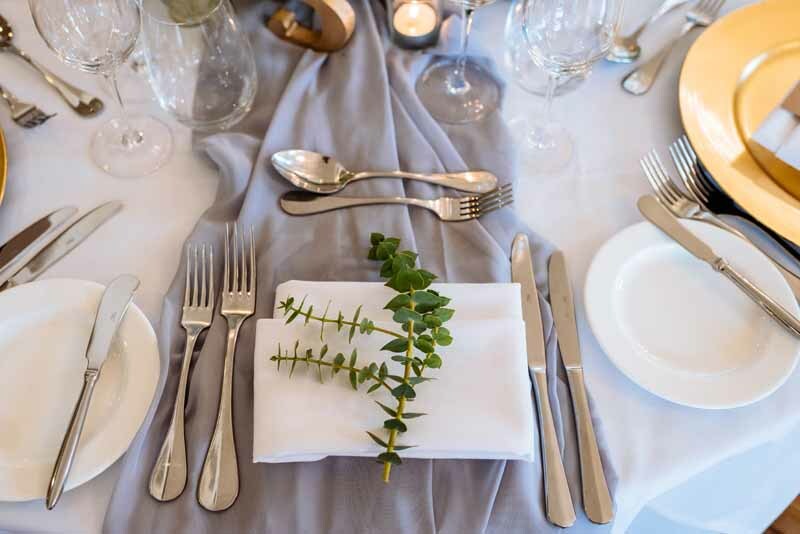 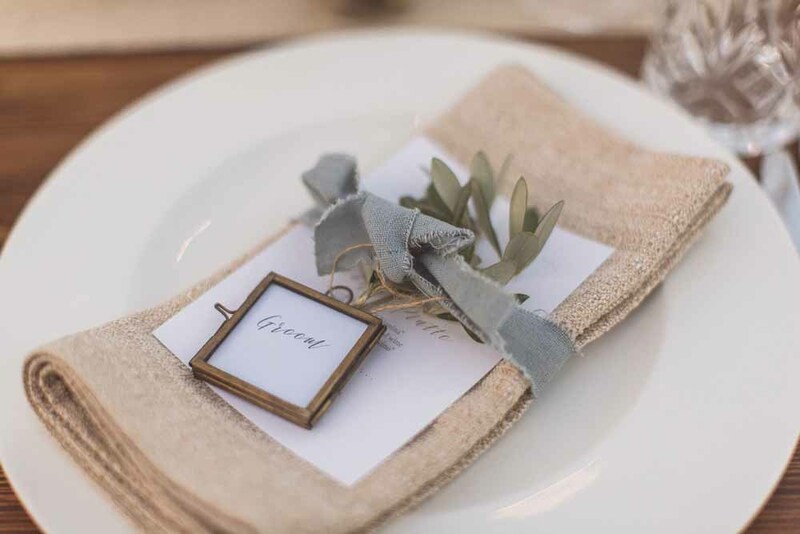 Each place setting had a snippet of foliage and gold cut out name as a place card / favour. 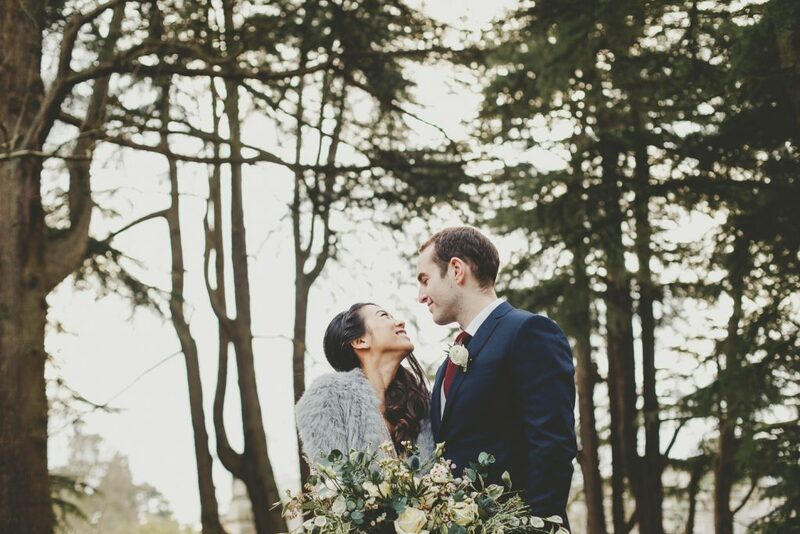 Maria and Rik are such a photogenic couple and the loveliest of clients. 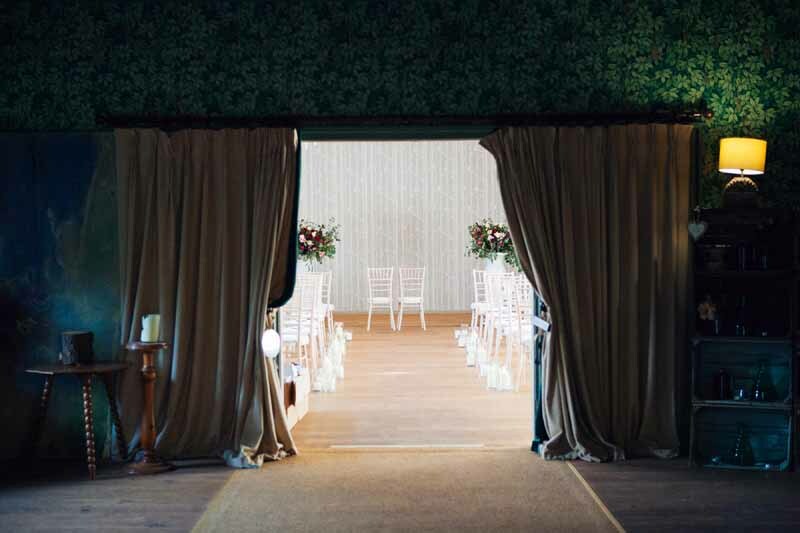 Maria and I enjoyed many happy hours planning the designs for her summer church wedding and reception at Shustoke Farm Barns. 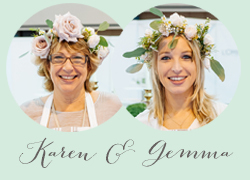 We had the pleasure of creating flowers for her sister’s wedding a couple of years back so jumped at the chance to work with these lovely people again. 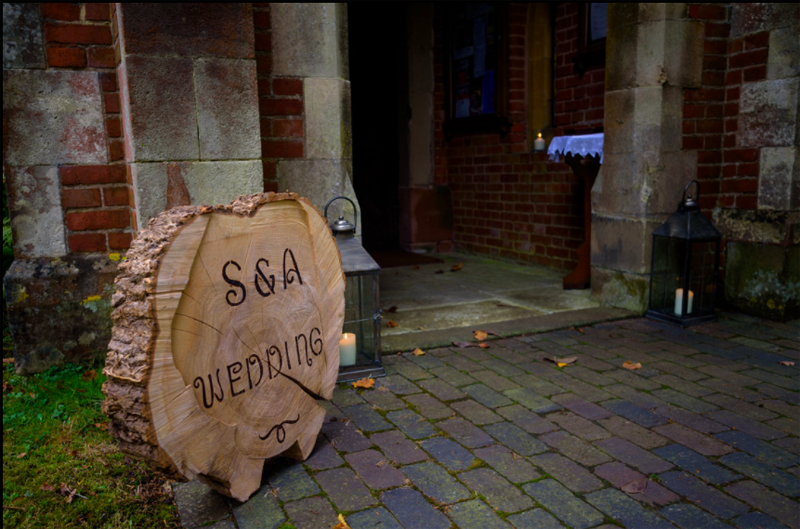 Add to the mix that Steve Gerrard was flying back to capture their day and we knew a good day was to be had by all. 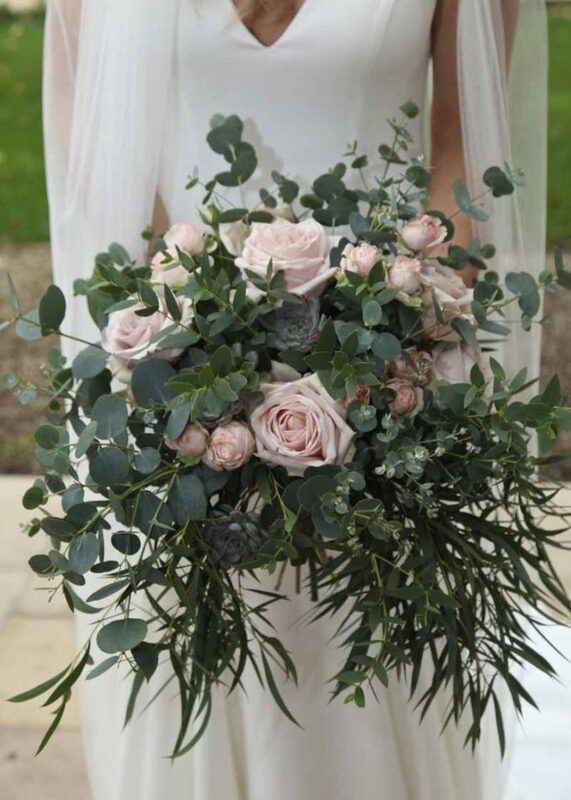 The organic style of bouquets suited Maria’s dress chosen from our friends at Tilly Trotters Bridal in Leamington. 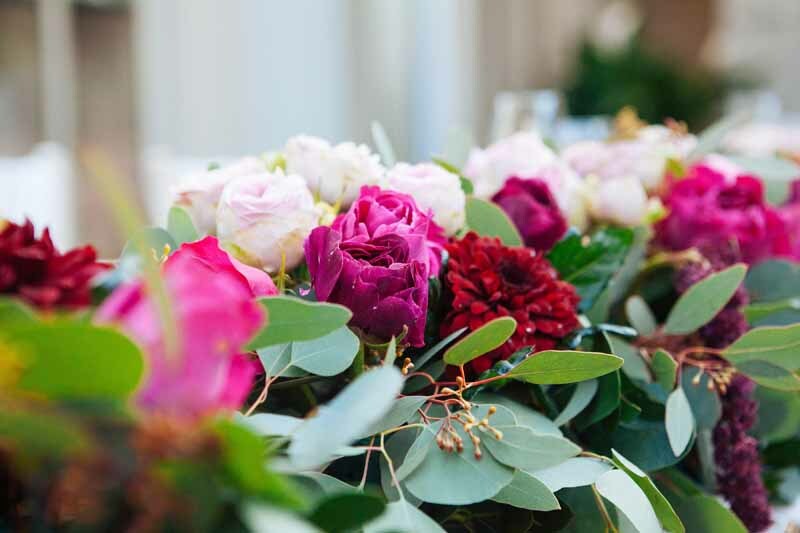 A hand chosen selection of blooms including deep pink dahlia, scabious and soft pink roses were combined with a mix of textured foliage for this late August wedding. 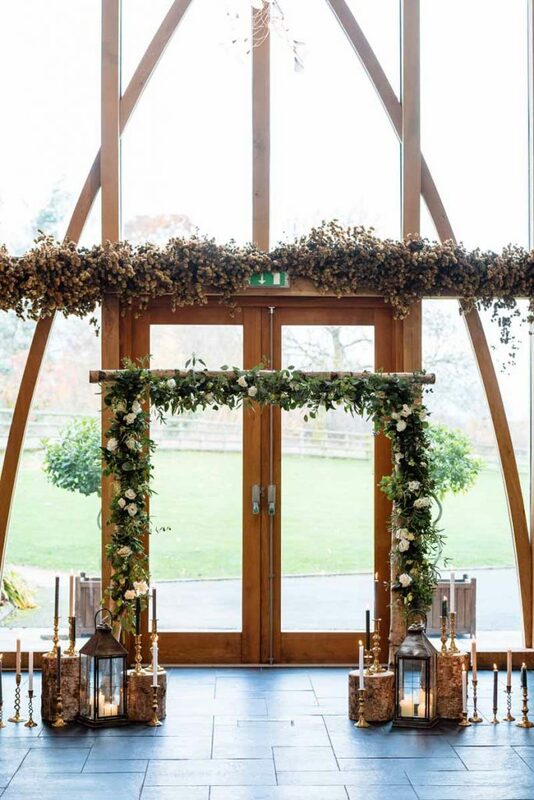 We continued the organic style florals in to the reception. 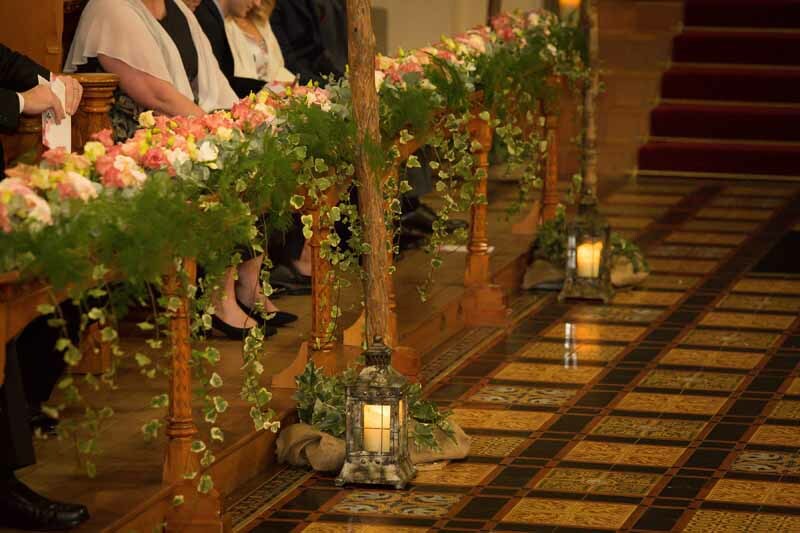 We styled the tables with a mix of tall and low table centres, keeping the flowers and foliage organic and lush. 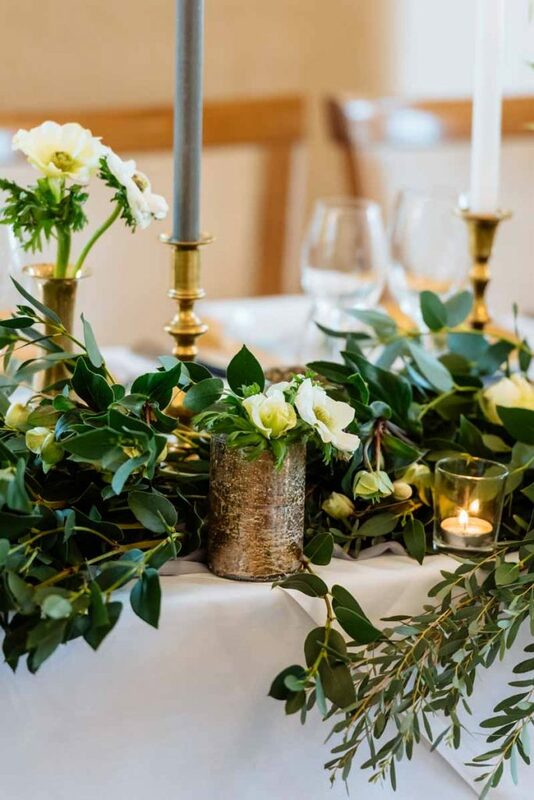 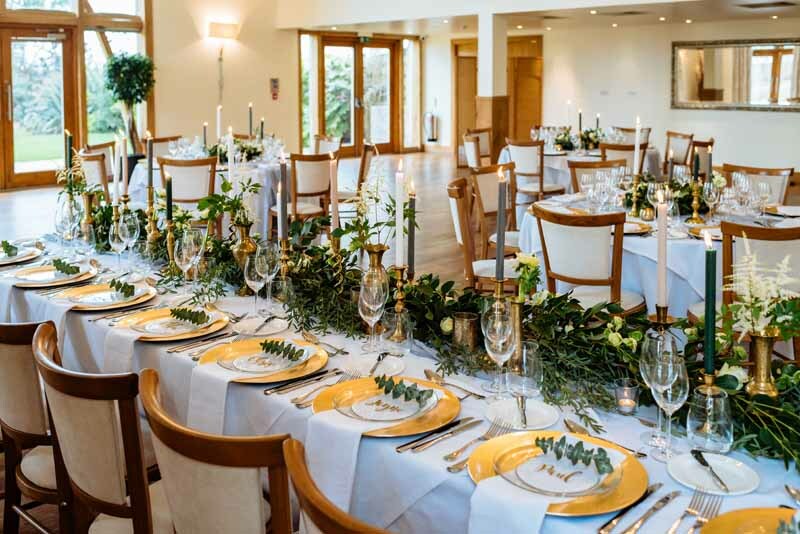 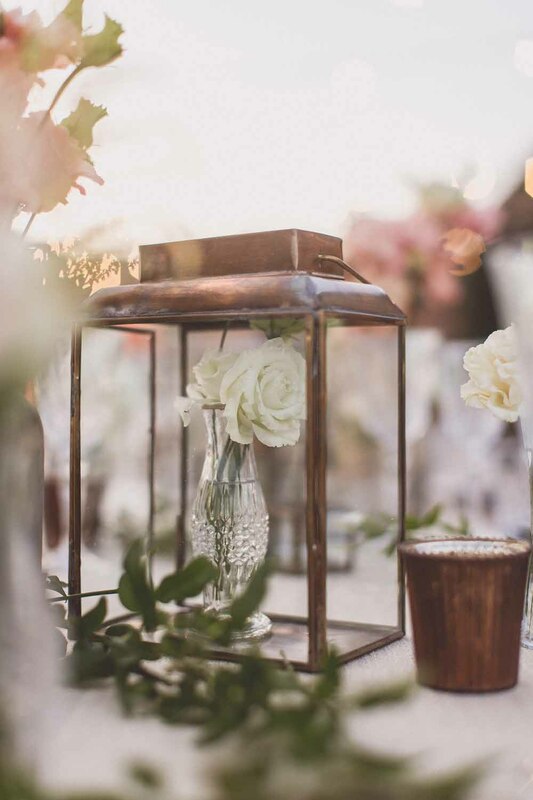 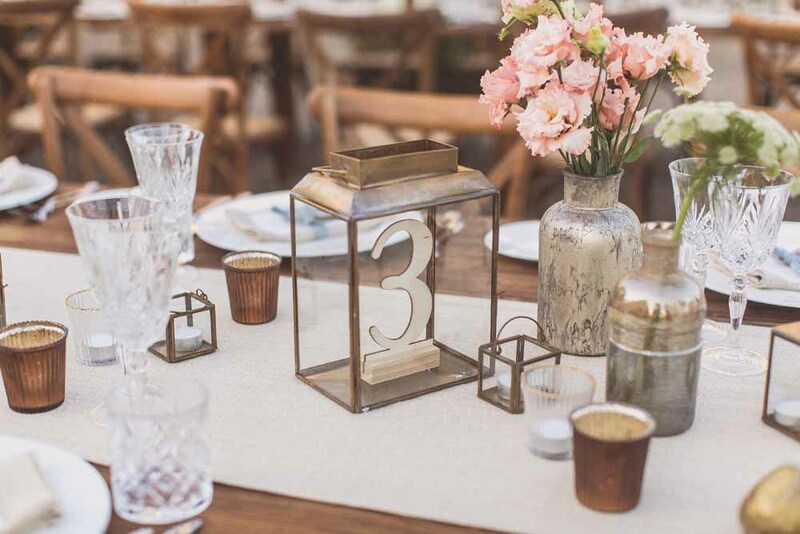 Tall designs on bronze/gold stands or tall bronze vases with large urns for the top table overflowing with natural organic styled flowers and foliage. 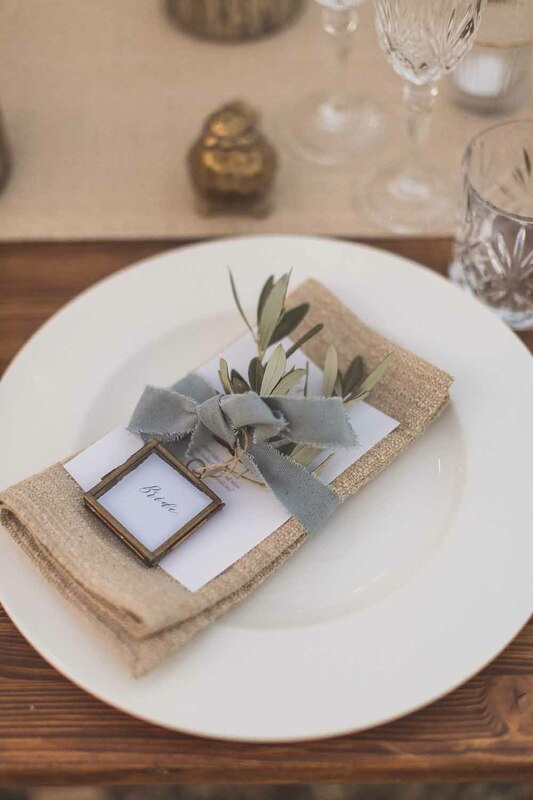 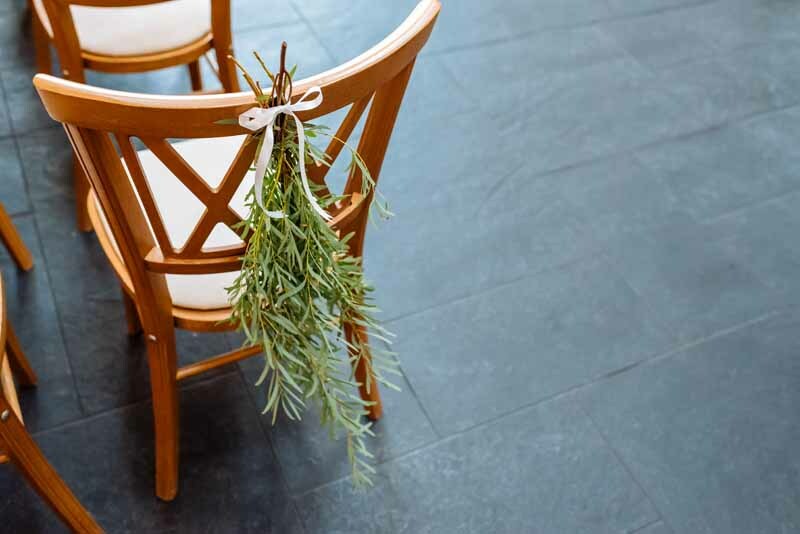 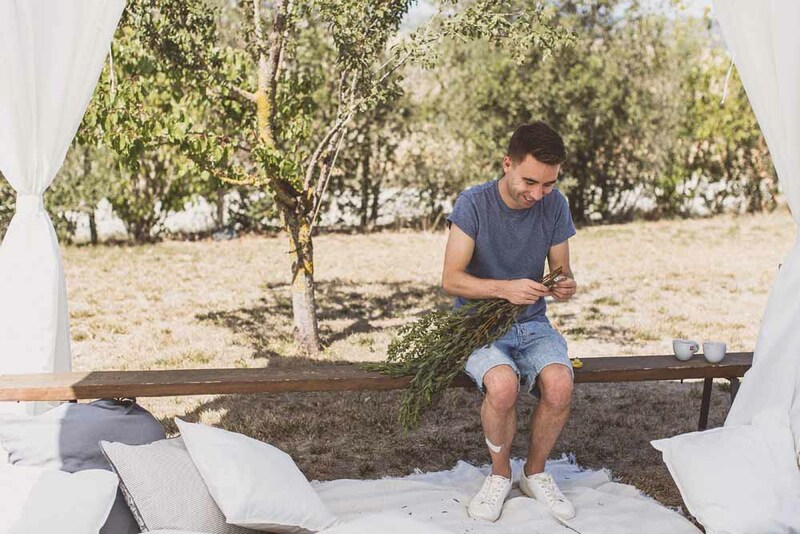 Fresh rosemary was added to the place settings where everyone had their name in gold. 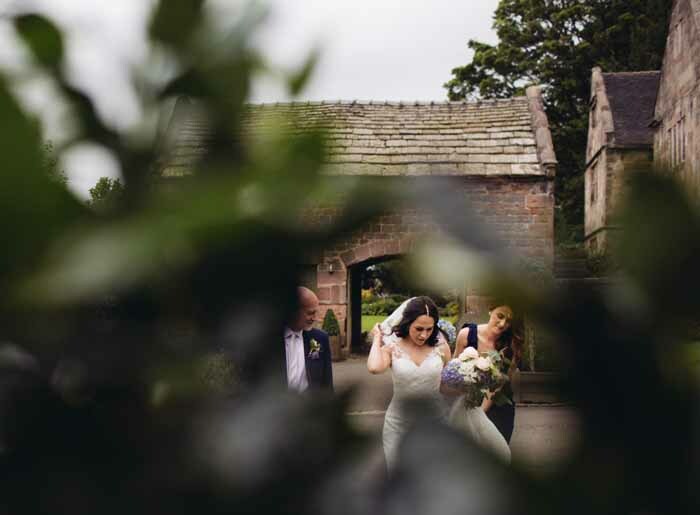 The courtyard at Shustoke is gorgeous with its olive trees and natural planting. 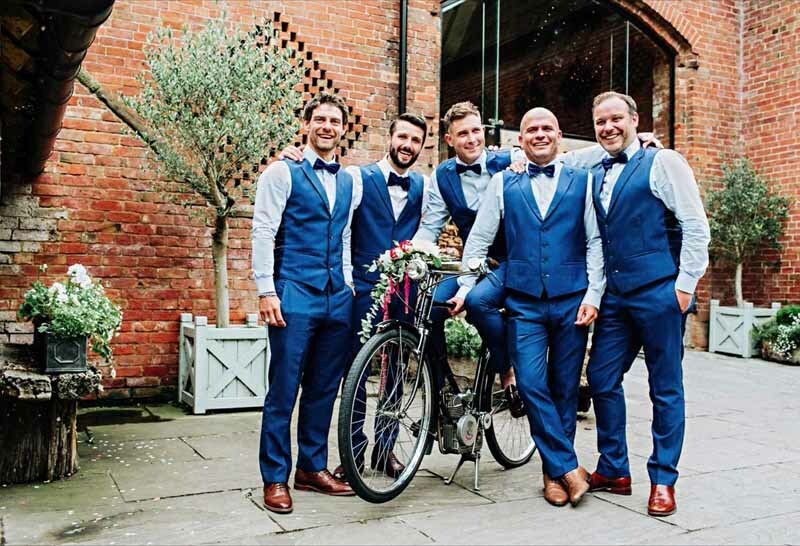 We had fun decorating the bike for Rik and the boys as well as adding extra styling details to the table plan. 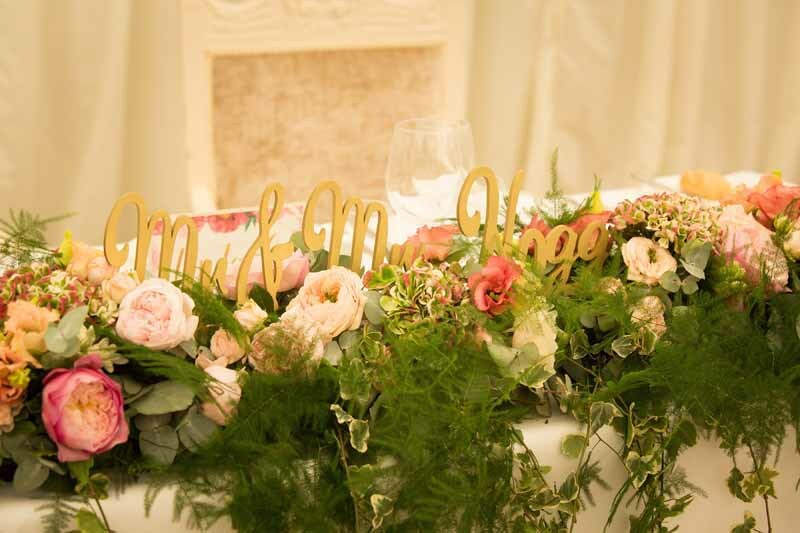 For a welcome touch we added rococco style candlesticks and foliage, as well as decorating their mirror table plan with a foliage garland and we always love adding our floral touch to a wedding cake table. 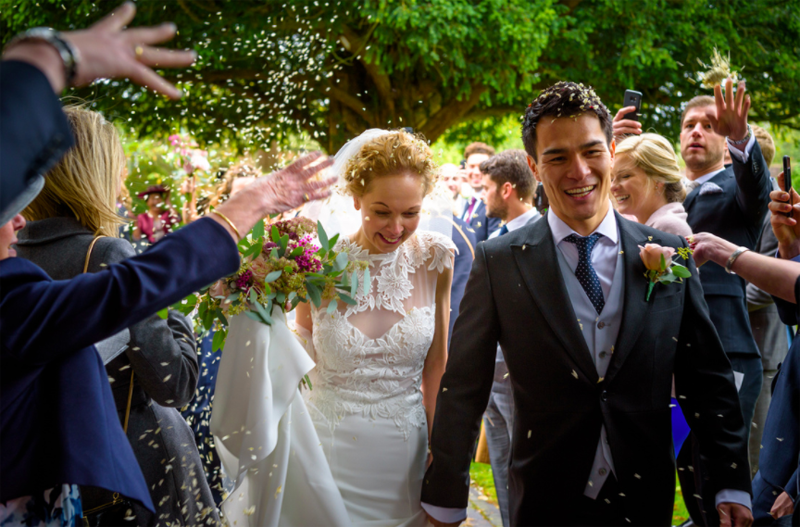 Thank you Mr and Mrs Hackett for sharing your day. 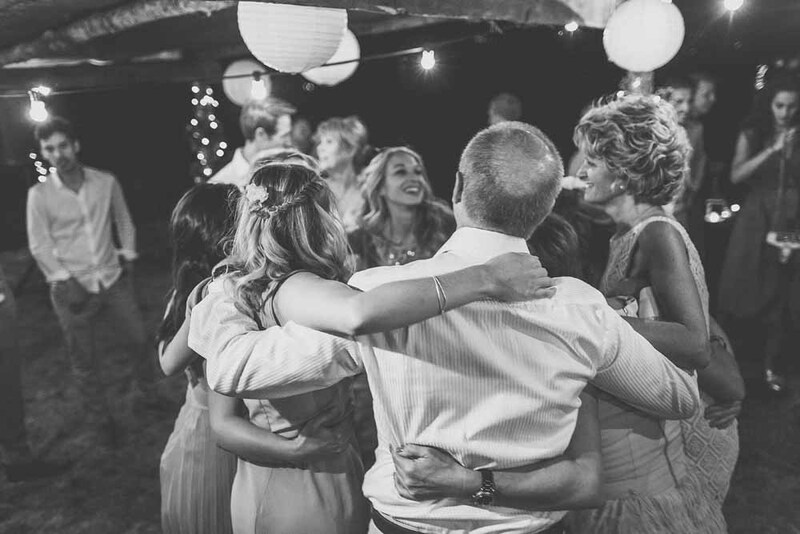 We loved being a part of your wedding. 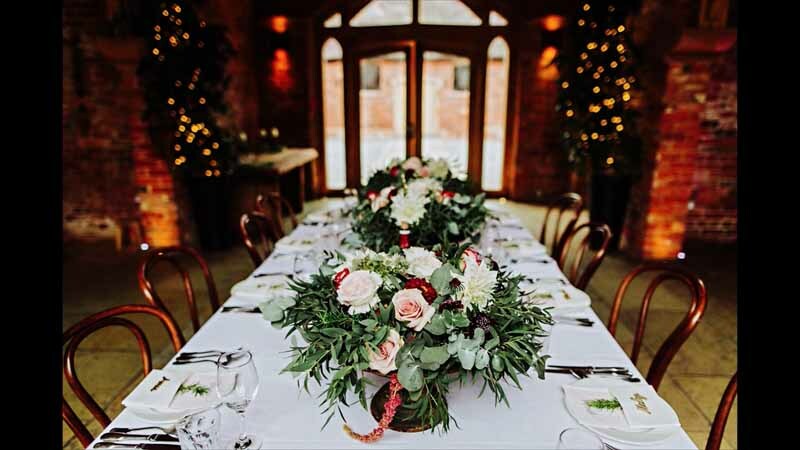 If you are planning a wedding a Shustoke Farm Barns, or a similar barn style venue and like our floral designs (organic style flowers in particular) and approach we would love to hear from you. 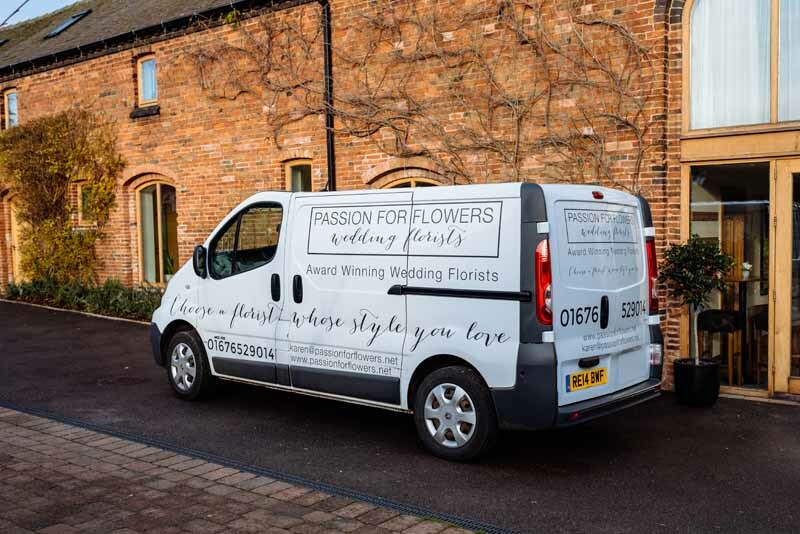 Please get in touch and see if we are available. 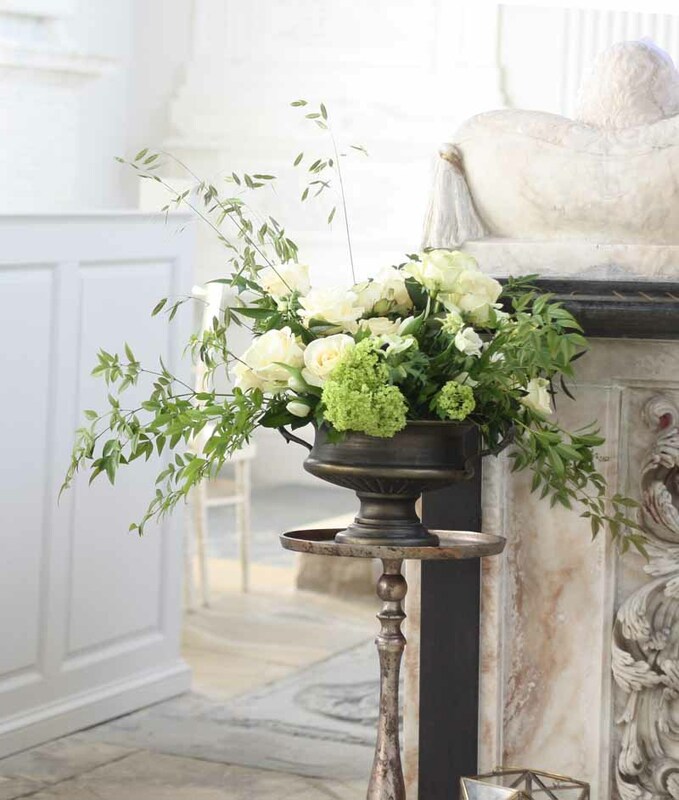 We were delighted to style the enchanting chapel at Compton Verney which is now available for wedding ceremonies. 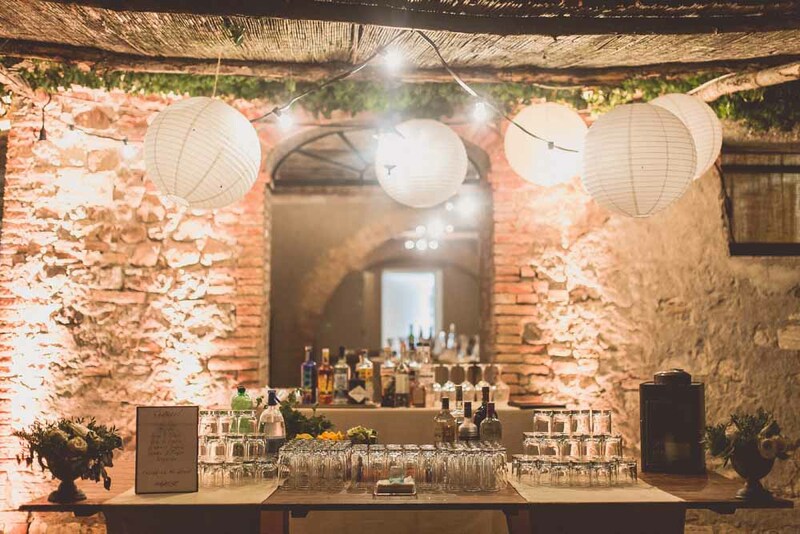 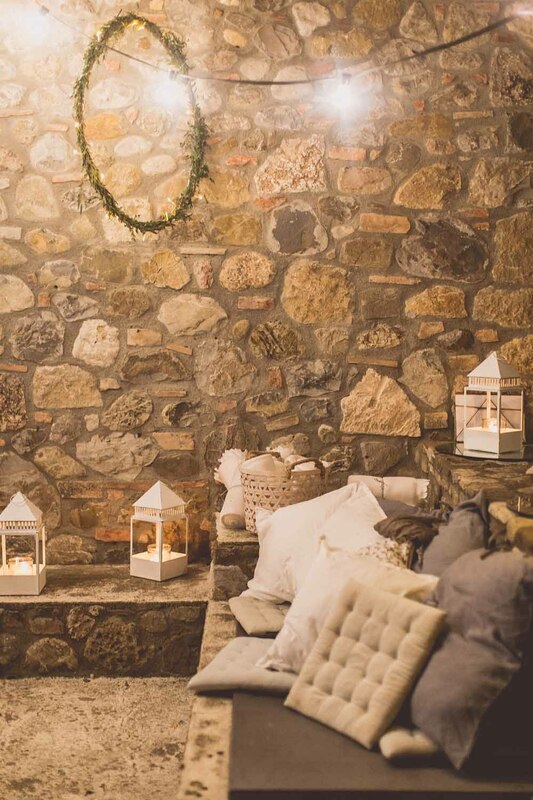 The white interior needs a natural look and so we choose an entrance welcome of a mix of aged lanterns and simple decoration inside the chapel. 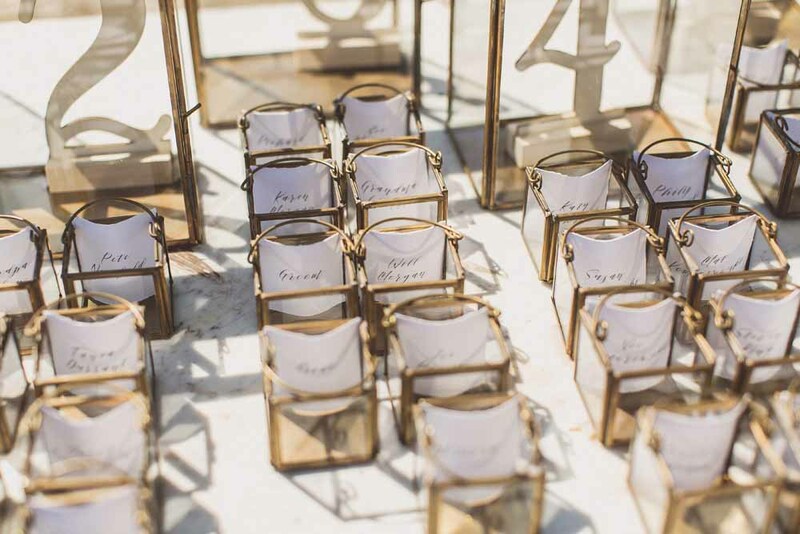 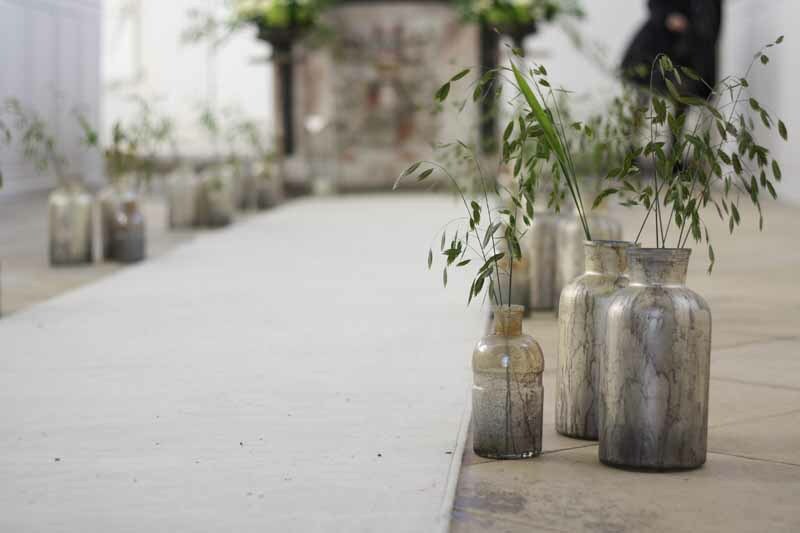 We lined the aisle with a mix of bronze gold bottles with the softest of grasses. 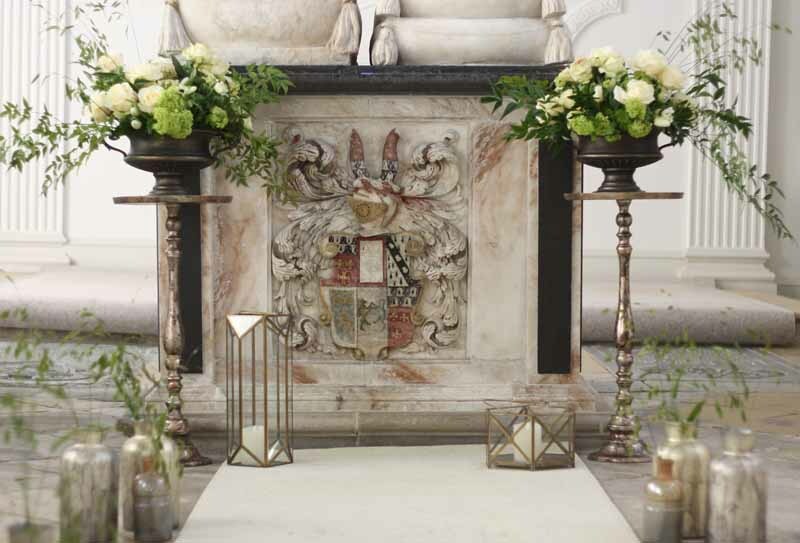 The main ceremony arrangements were natural and organic in style with a mix of white and green in bronze urns sat on pedestal bases. 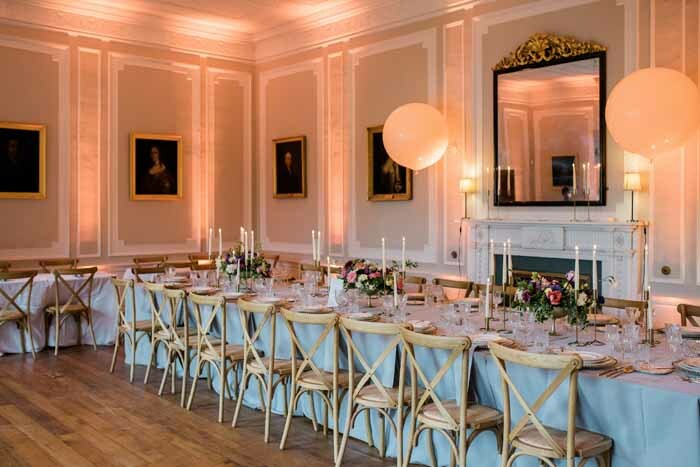 The elegant Adams Hall at Compton Verney is a perfect setting for your wedding breakfast. 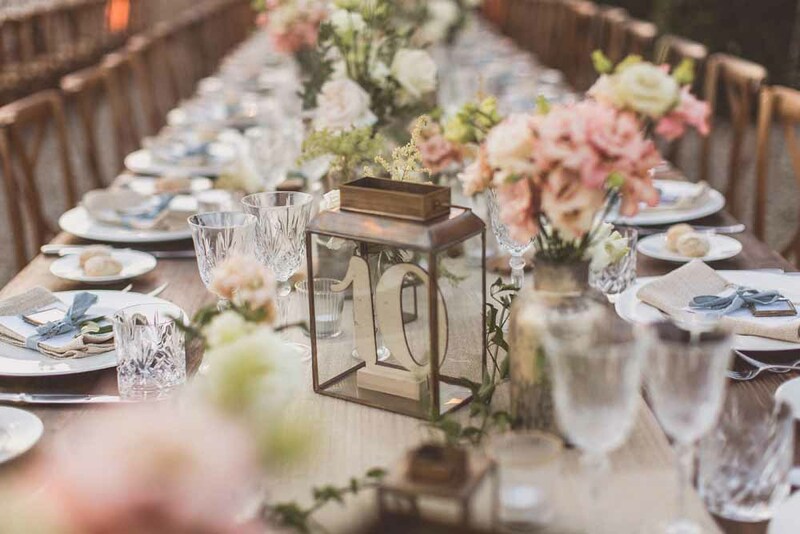 We favour a mix of high and low table designs adding interest around the room. 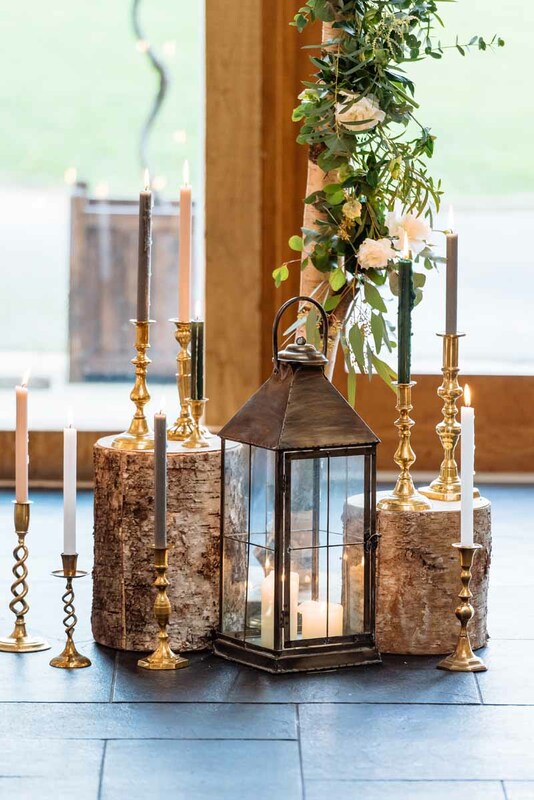 For a low arrangement we choose a natural design in a footed bronze urn, styled with simple candlesticks and bronze ribbed tea lights. 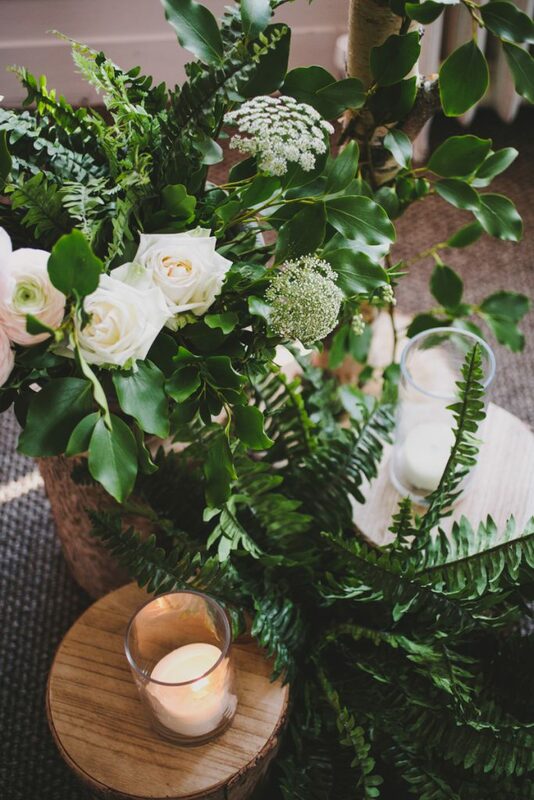 The flowers in white and green kept the look fresh and easy on the eye. 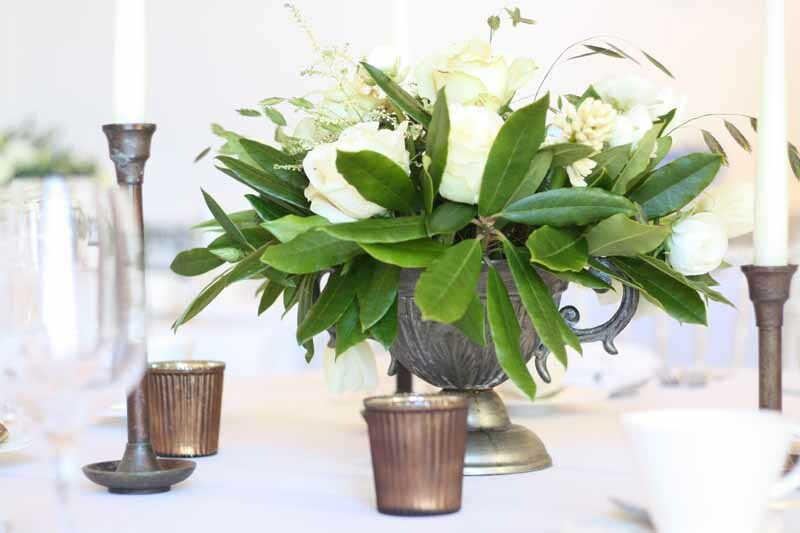 Tall bronze stands with an organic styled arrangement in whites, creams and greens created a perfect tall floral display. 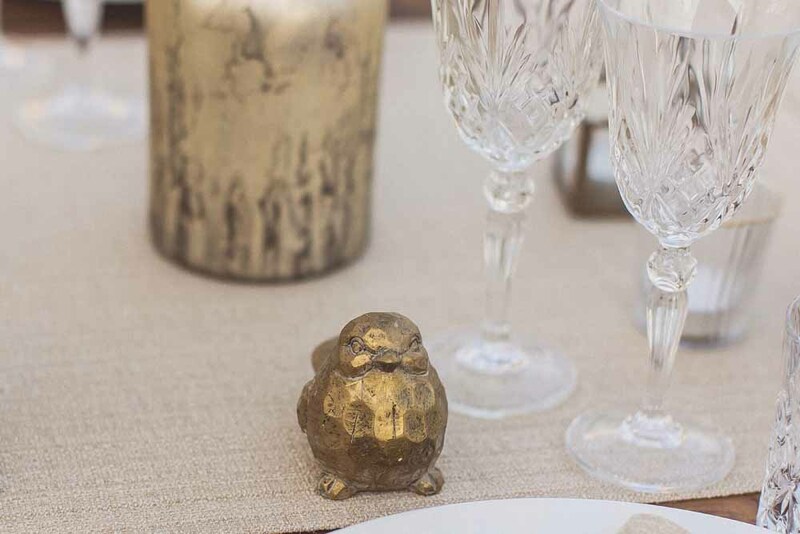 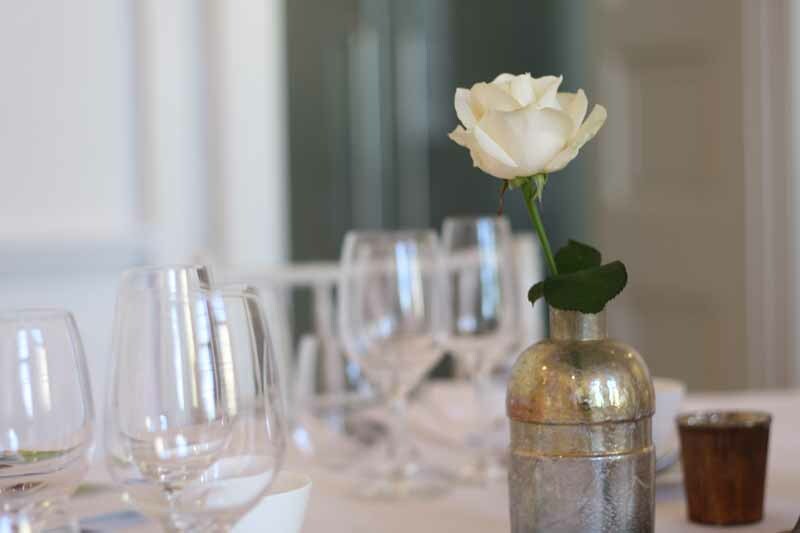 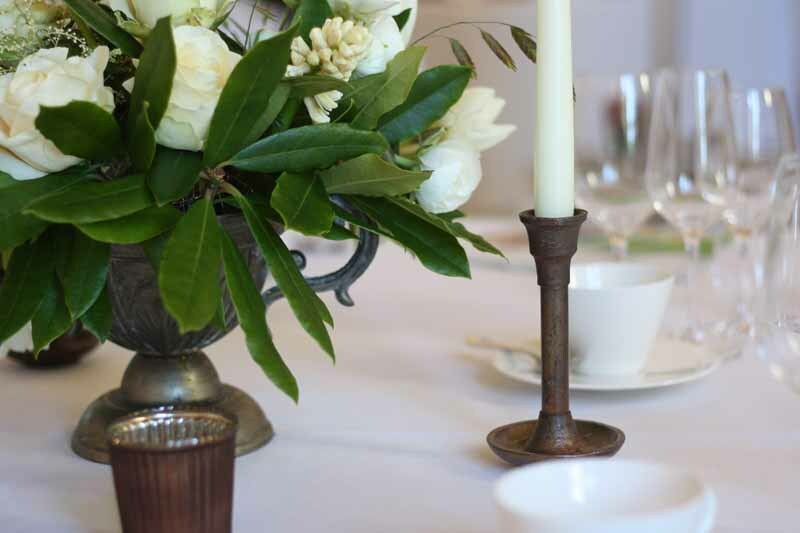 Adding a touch of bronze to the Adams Hall adds a depth of colour and simple elegance to the table arrangements. 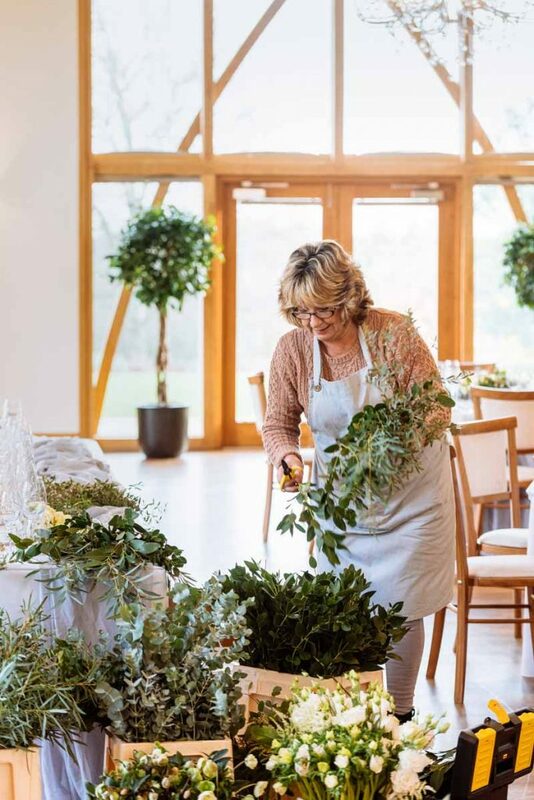 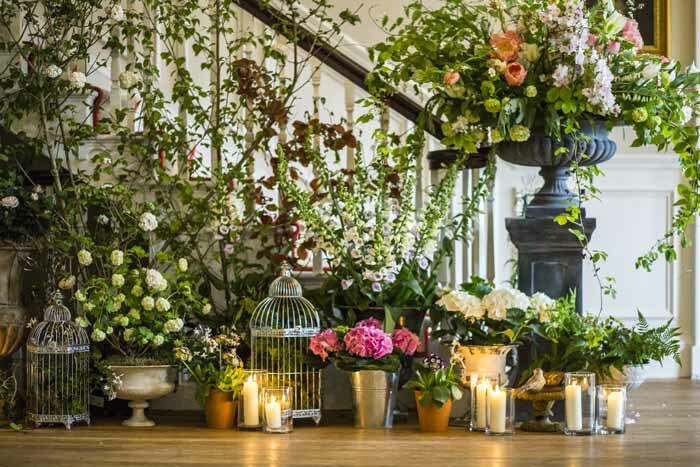 if you are looking for a florist for your Compton Verney wedding or event please get in touch. 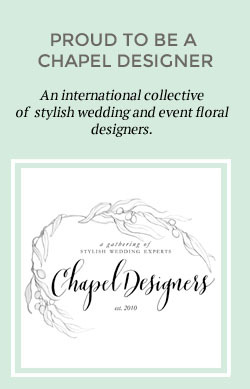 I was asked to design a bouquet for Lizzie and her girls for her recent wedding. 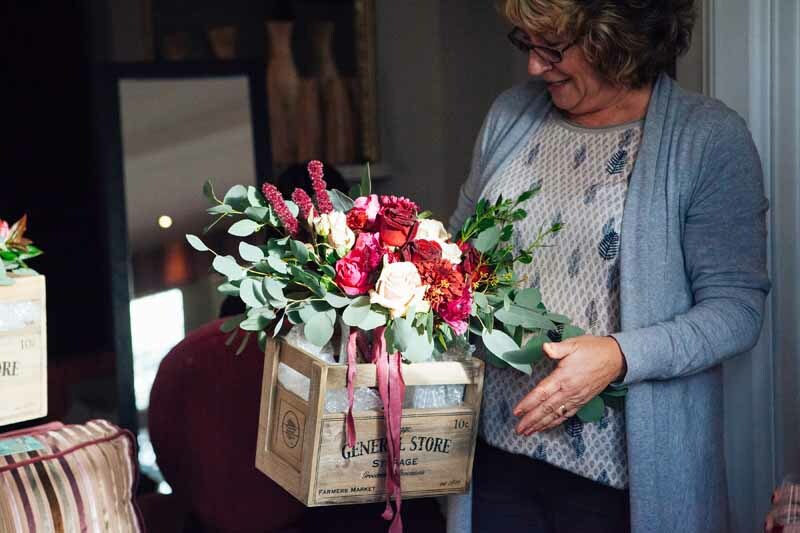 Helen, her Mum, of Helen Eames Photography, joined us for our meeting and I was delighted to hear that the flowers then became an important part of Lizzie’s day. 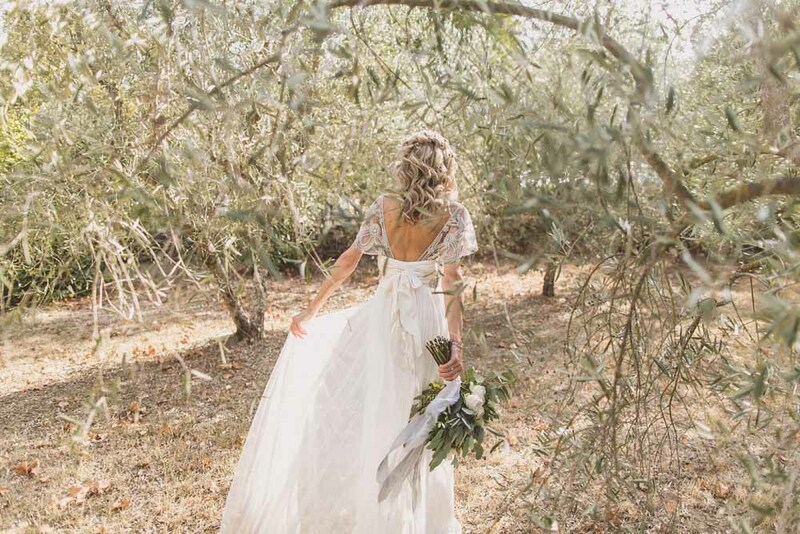 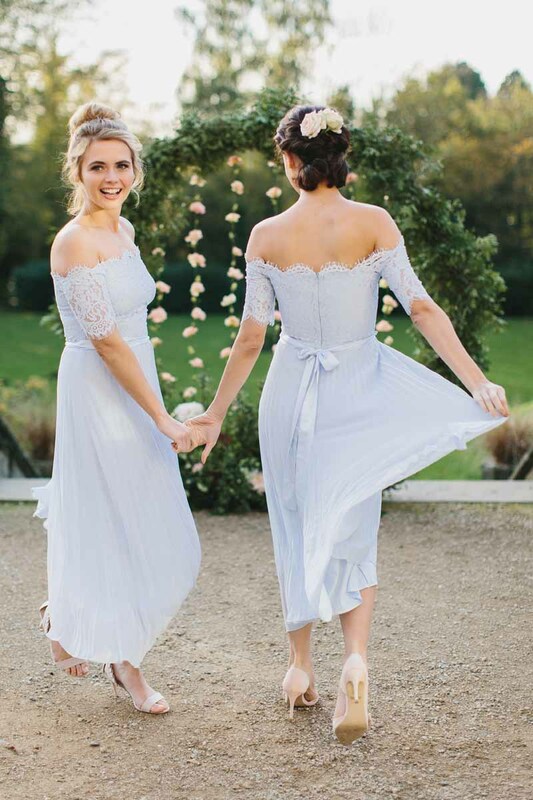 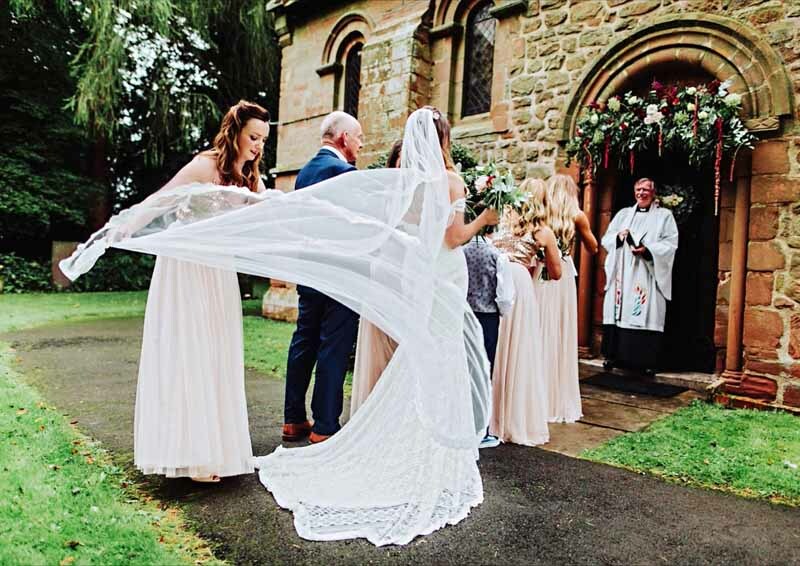 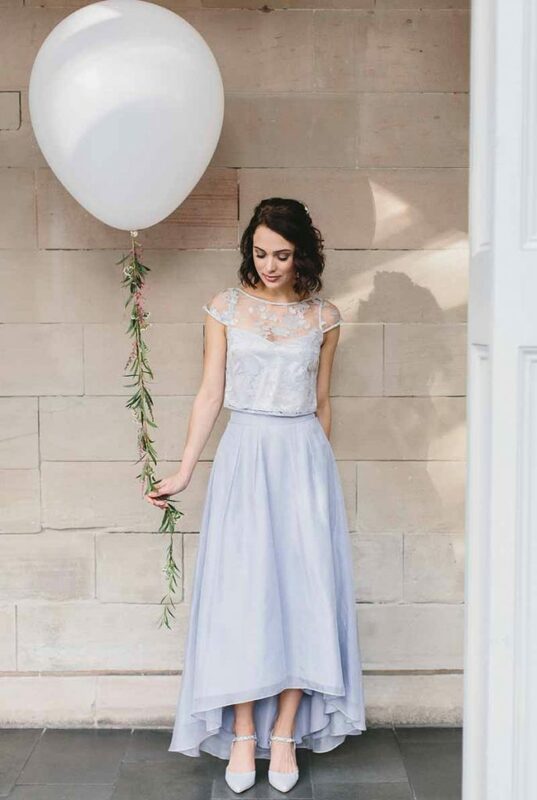 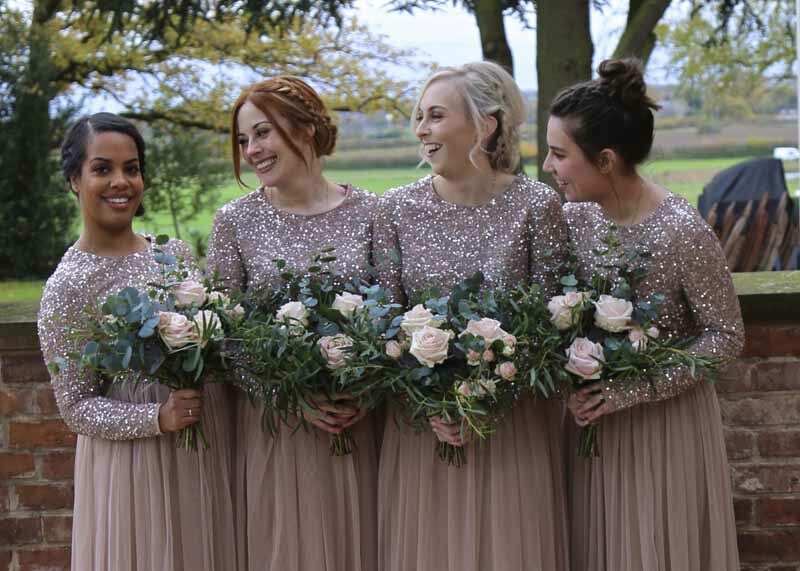 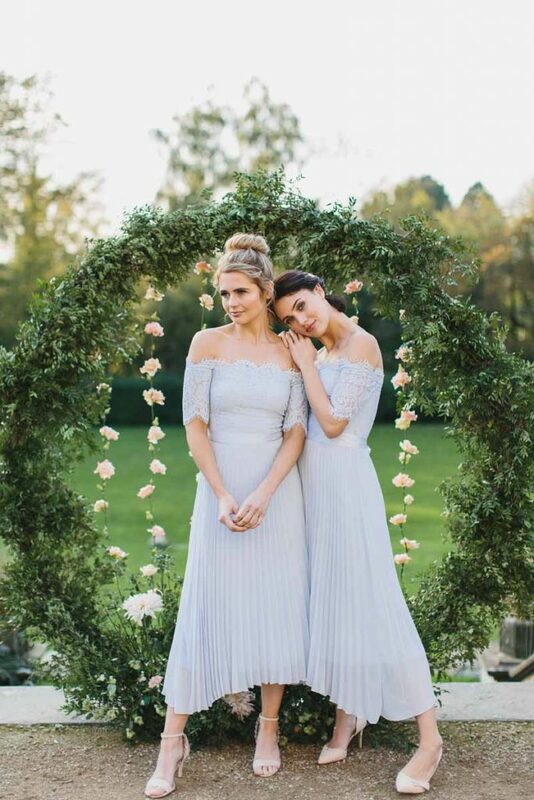 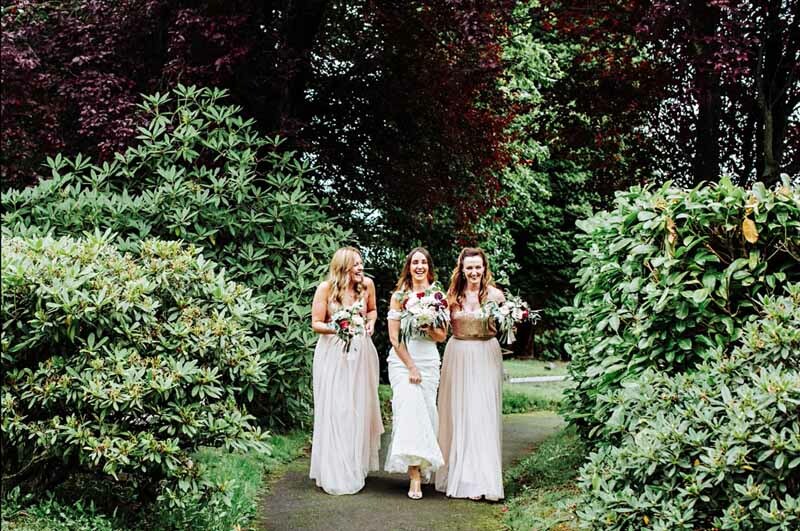 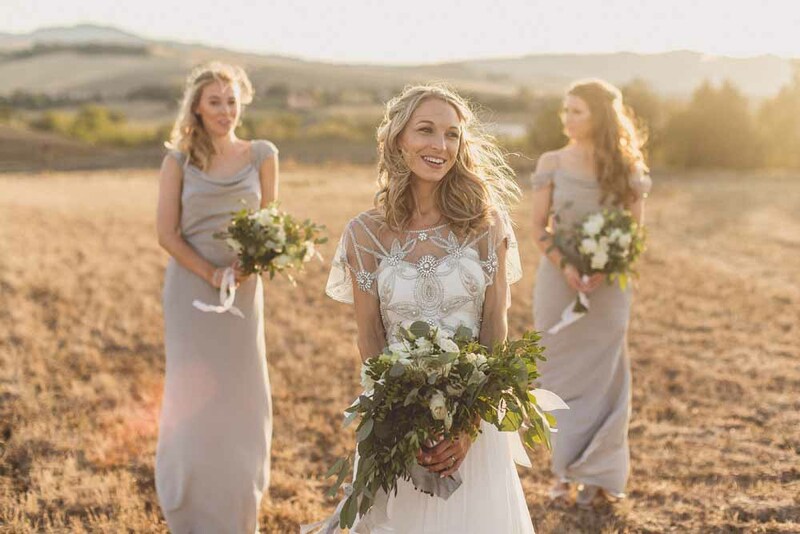 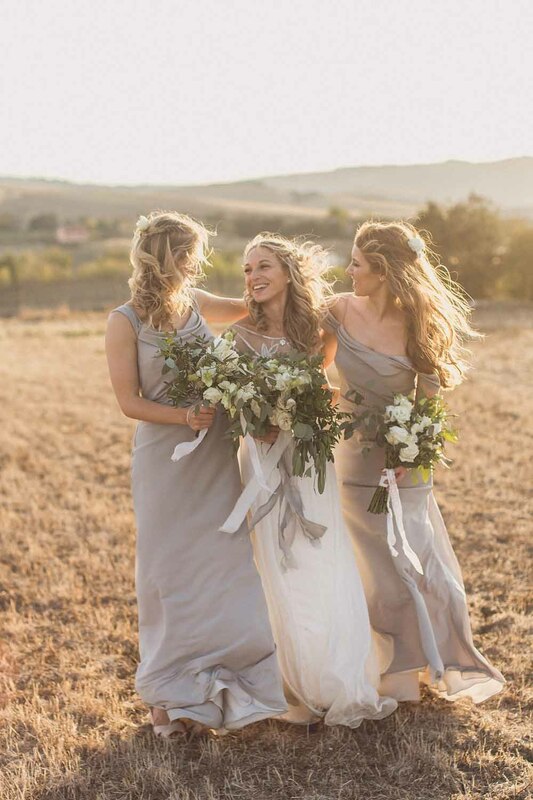 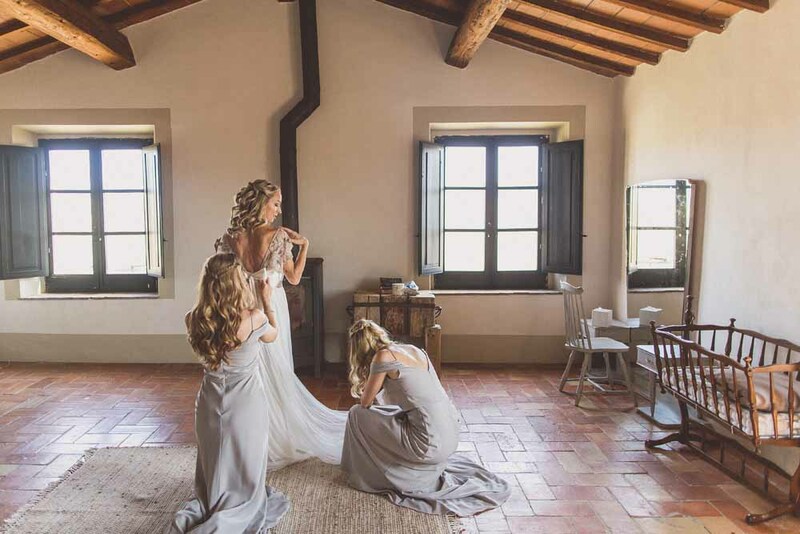 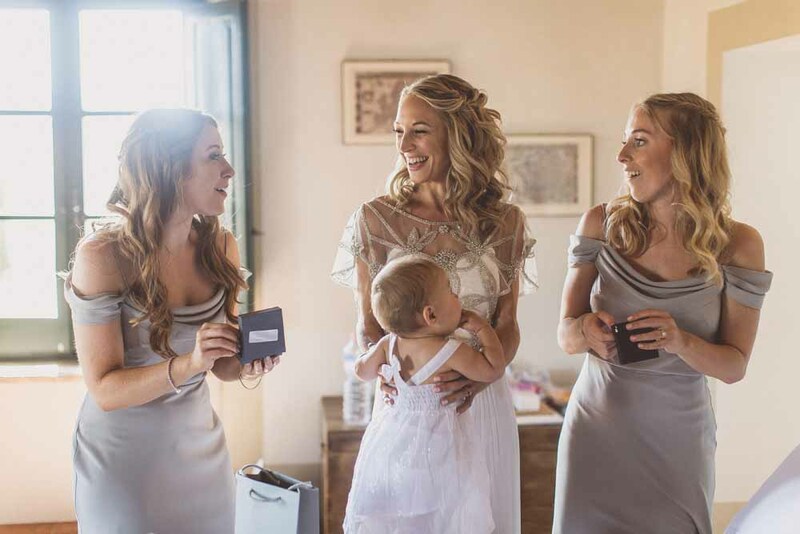 Lizzie’s dress was chosen from the lovely Sophie at CocoandKate and we felt a wild organic bouquet with touches of blush pink roses, lashing of eucalyptus and highlights of the grey pink edged echivera would be the perfect choice for this stunning bride and her bridesmaids. 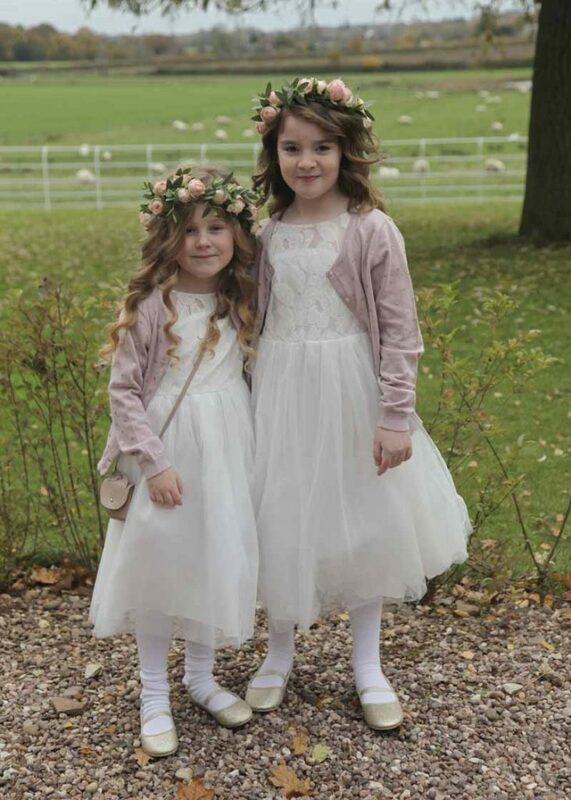 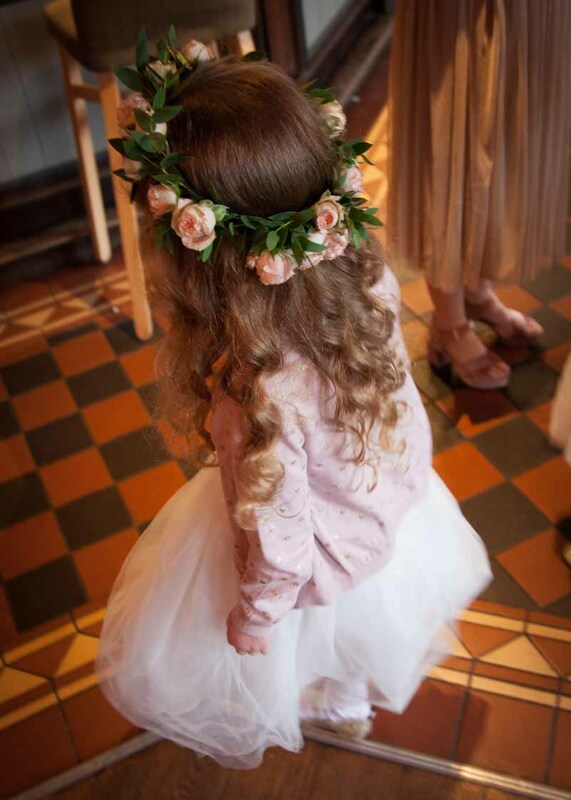 Flower girls are known to steal the show and these two were no exception, eager to try on their pink rose flower crowns when I arrived and looking so beautiful in their gorgeous dresses and soft pink cardigans. 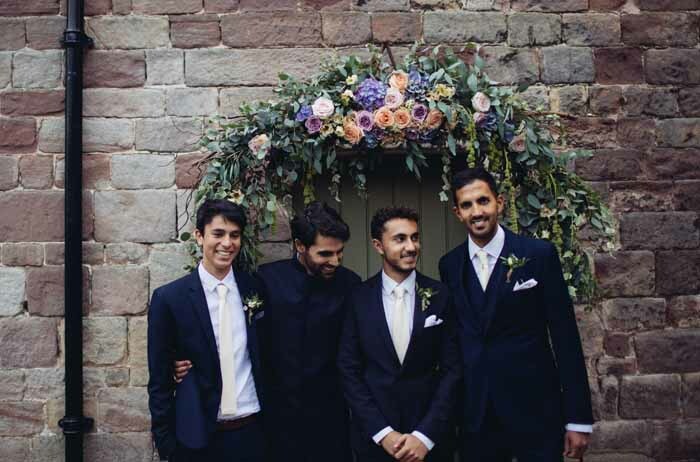 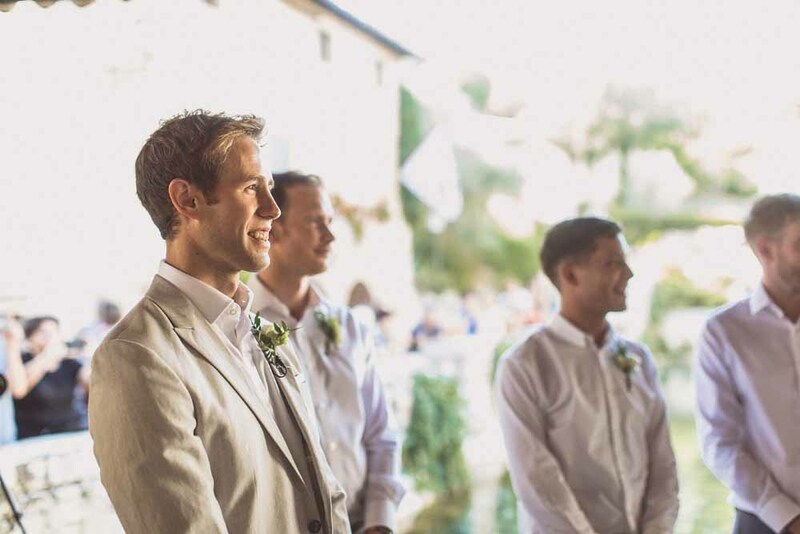 The boys wore pink rose bud button holes with eucalyptus and echivera to bring the look of the bridal party together. 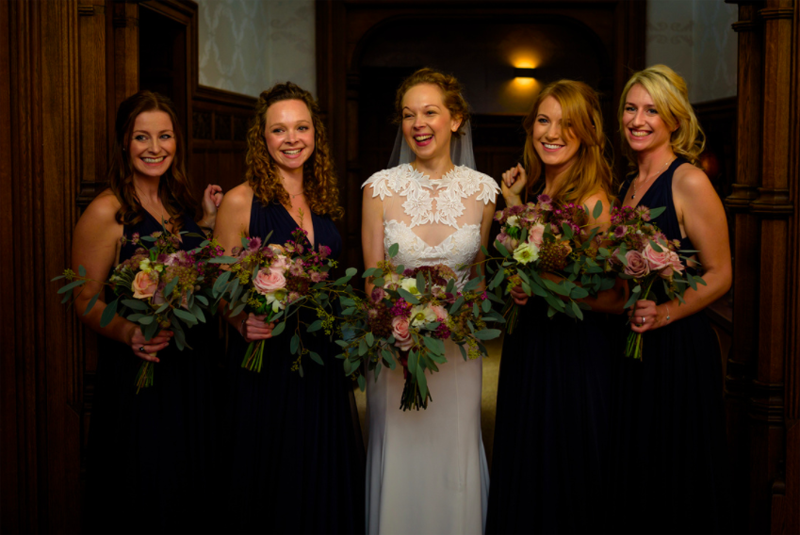 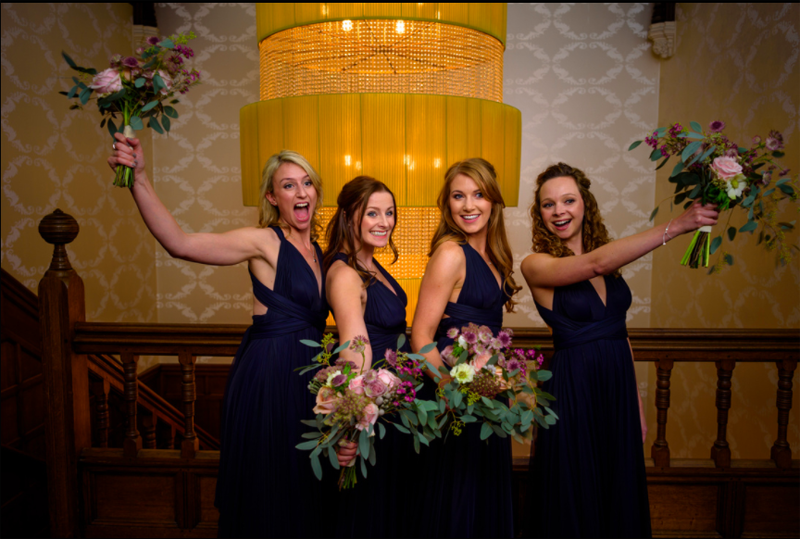 Thank you for sharing the images Lizzie, so happy you enjoyed loved your bouquets and to Helen for capturing the day with such beauty. 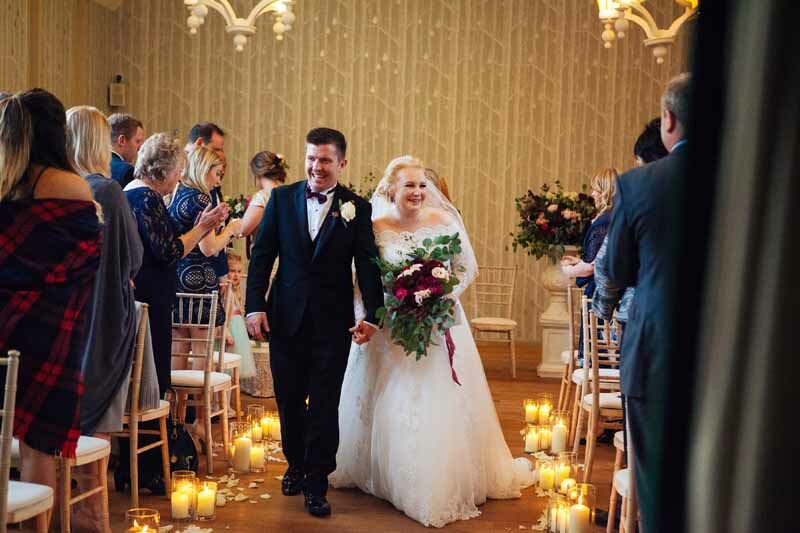 Laura and Ed were married in the amazing Abbey at Stanbrook Abbey surrounded by family and friends. 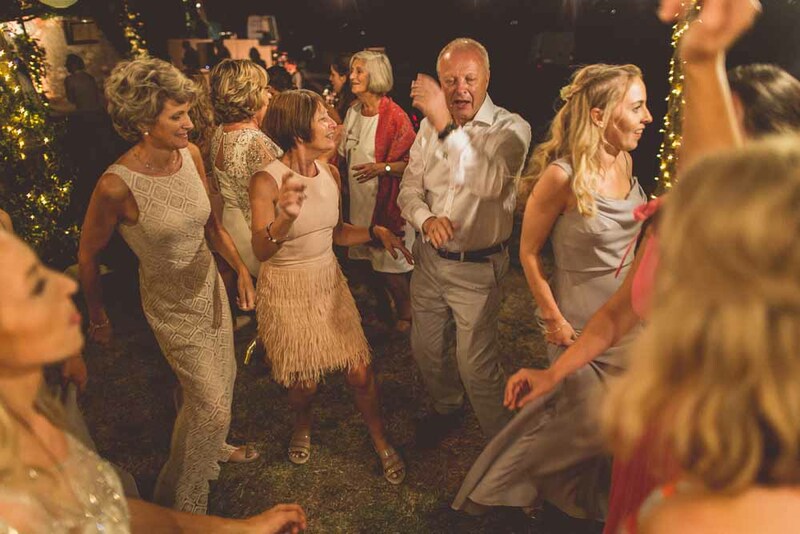 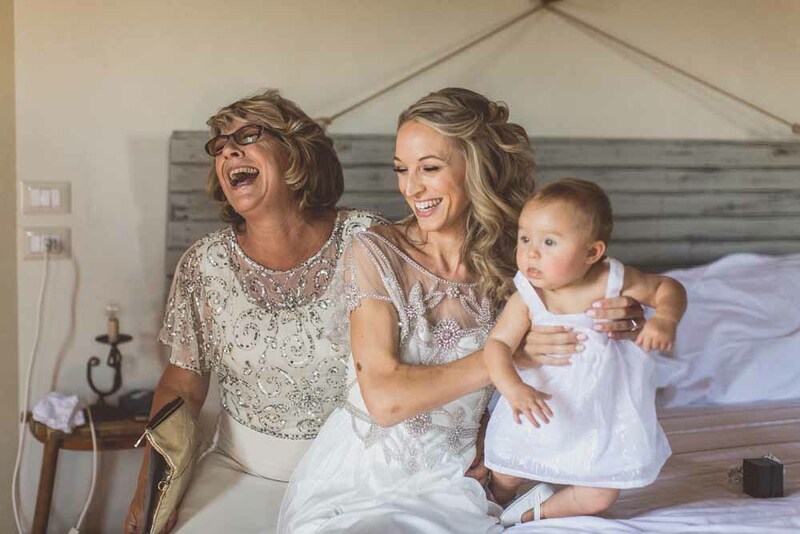 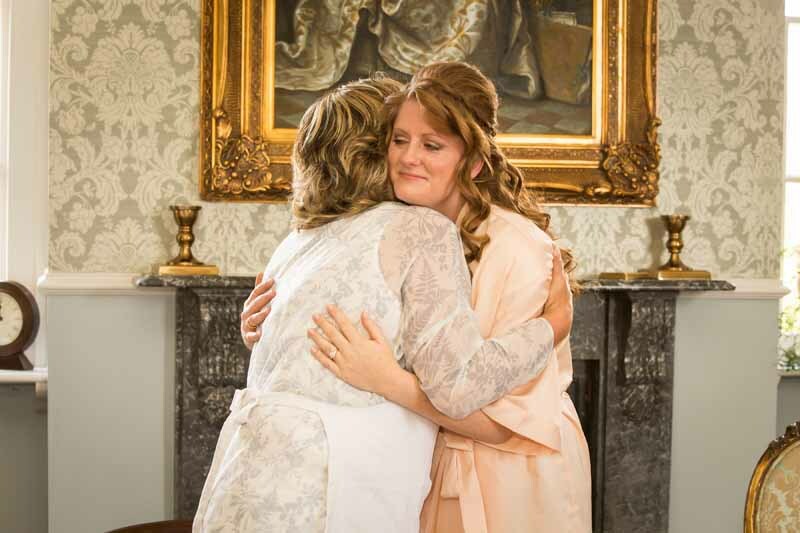 Laura and her Mum Debbie had spent many months planning this beautiful wedding and had handpicked the best suppliers they could for this epic wedding. 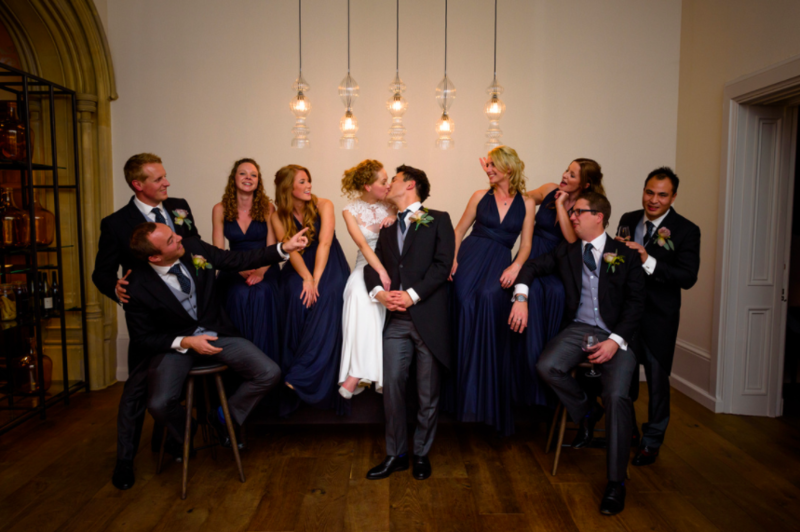 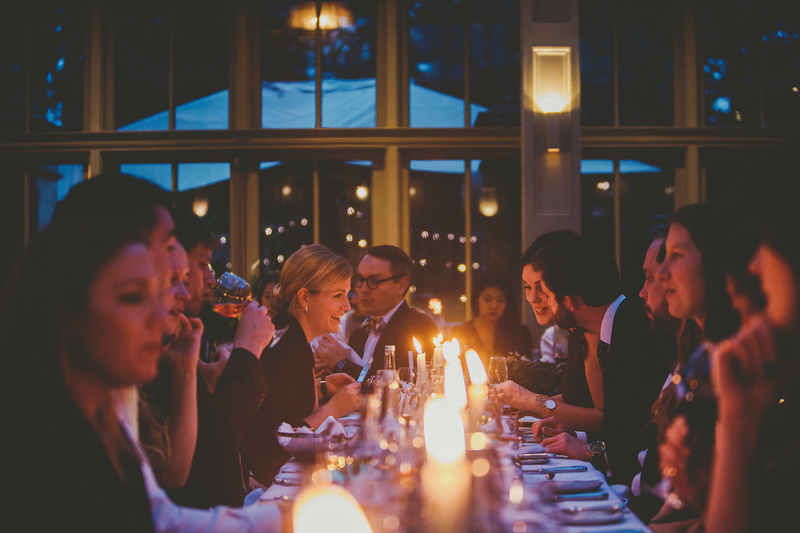 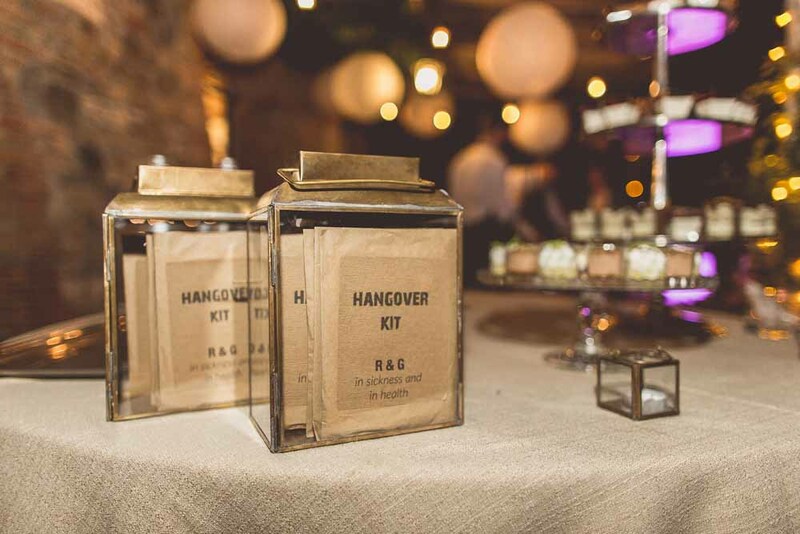 We loved being such a big part of their wedding and helping bring their ideas to life. 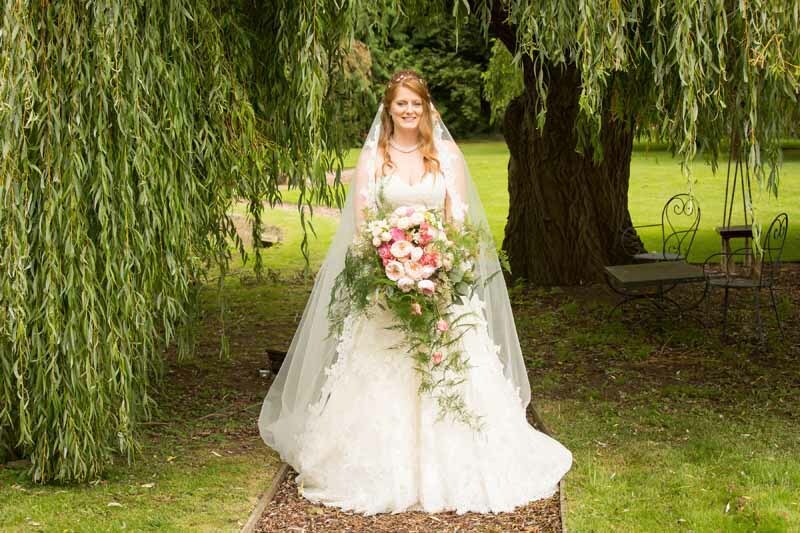 Flowers and scent were key to this wedding and the pure joy and delight as we brought the bouquets in to Brides Manor on the wedding day was for all to see, an emotional day but one we will remember for many years to come. 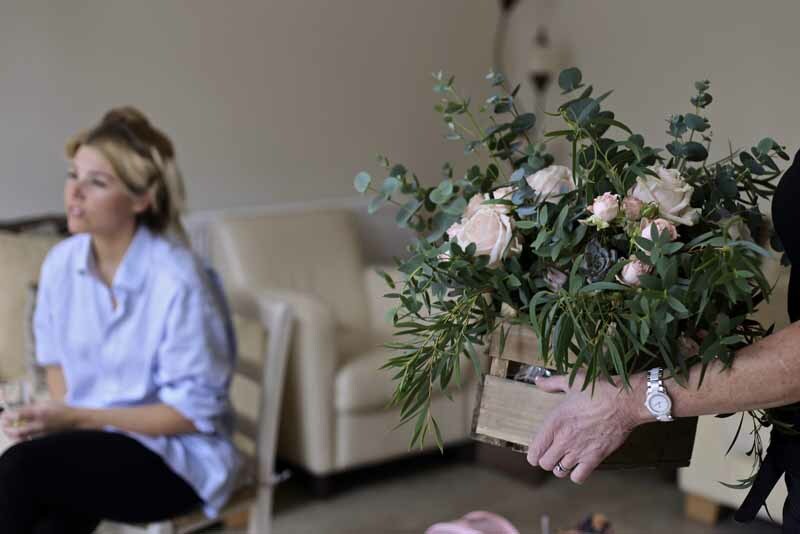 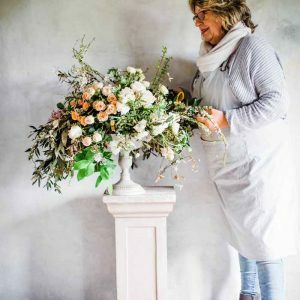 Laura gave us a free rein on the final design of her bouquet, but we were thrilled to have been given photos of her grandma’s bouquet as a great starting point and took inspiration from that with the trailing asparagus fern and roses. The bouquet contained the most scented of David Austin roses and was a joy to create. 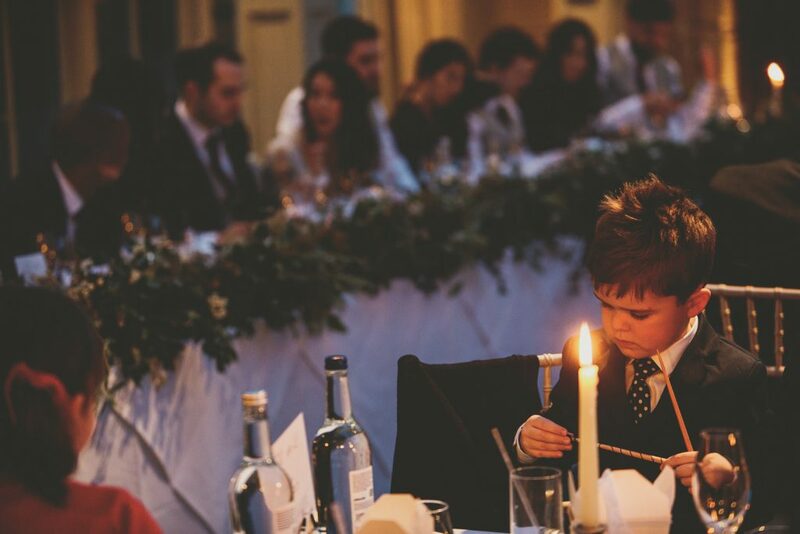 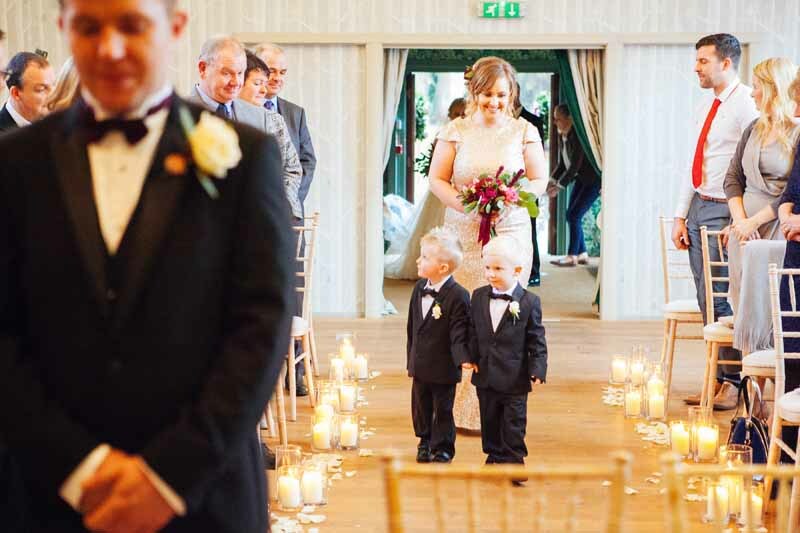 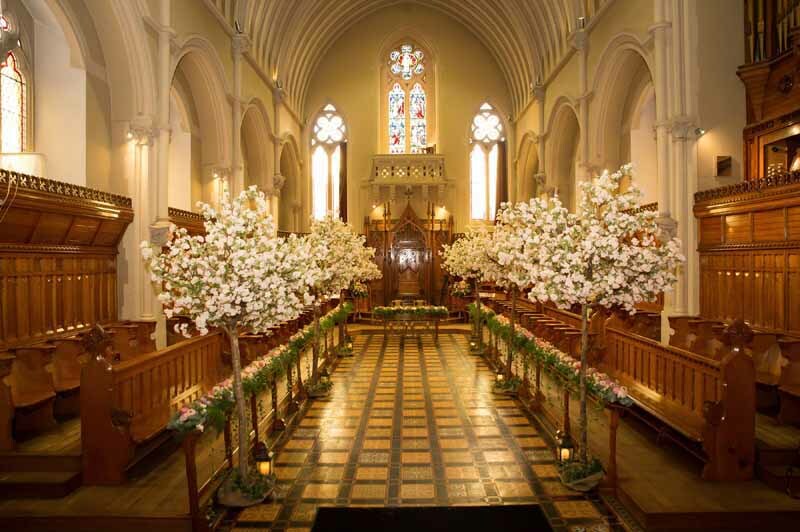 During the planning stages we visited Stanbrook Abbey, sat in the pews and created our plan. 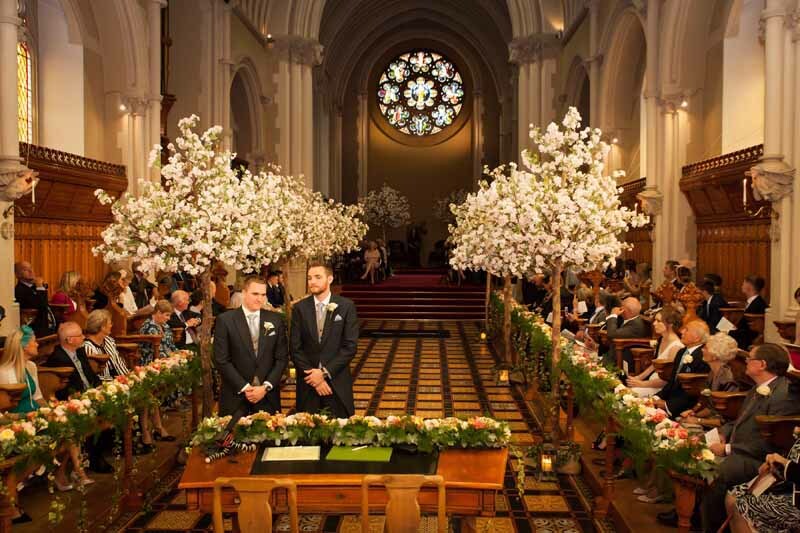 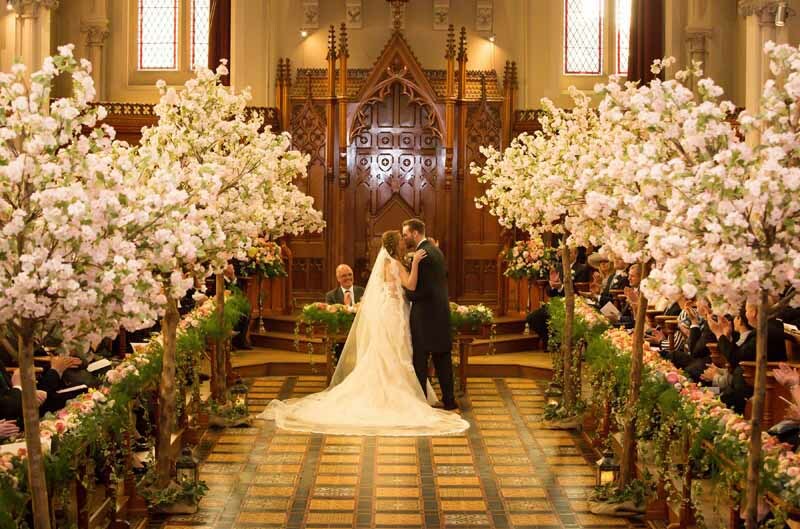 Bountiful blossom trees lined the aisle and every surface was covered with metres and metres of floral garlands. 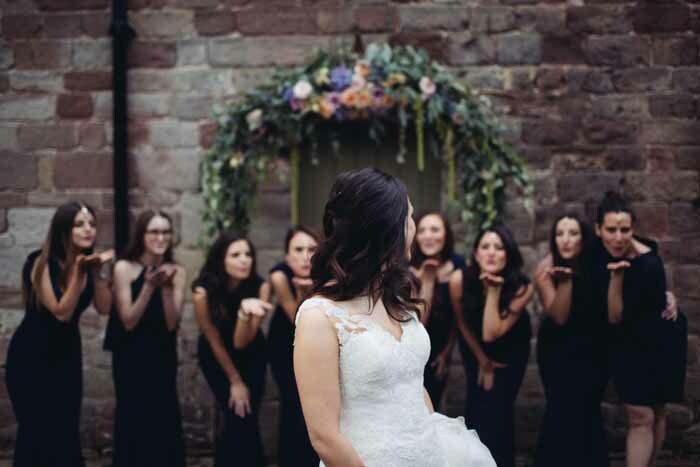 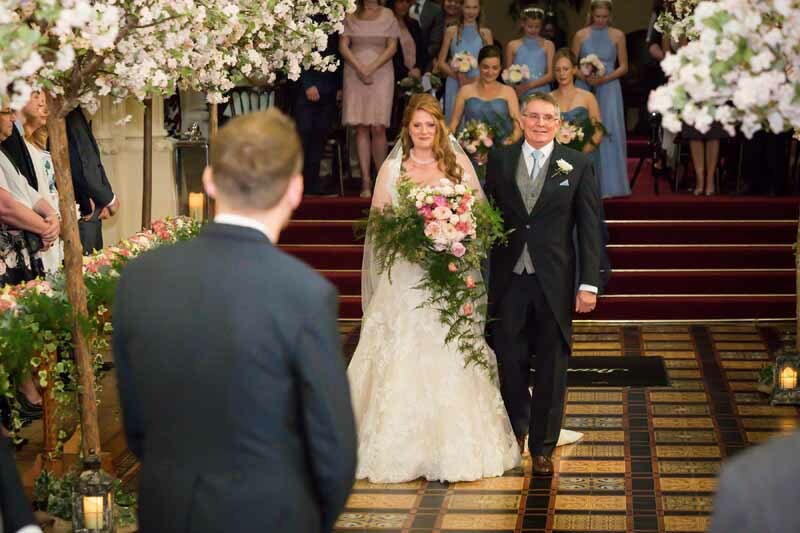 The scent was so evocative and emotional as the guests awaited the arrival of the bride and the ceremony began whilst being entertained by the gospel choir. 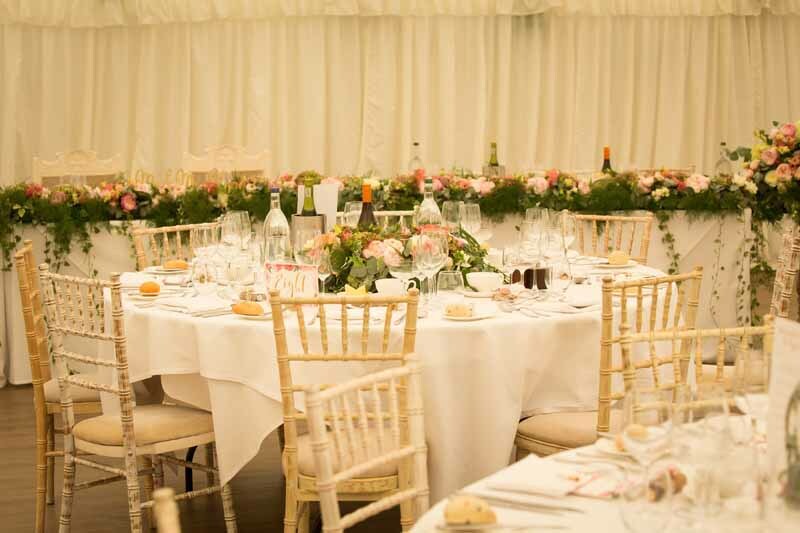 Whilst the bride and groom were having photos with their guests we added the final touches to the marquee. 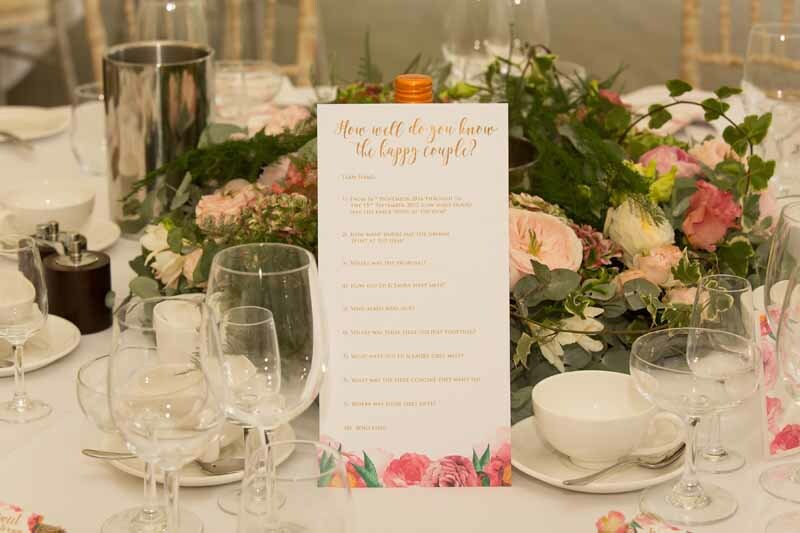 The top table had a full length floral garland with the lovely mix of pink, peach and green foliage with masses of summer roses and lisianthus. 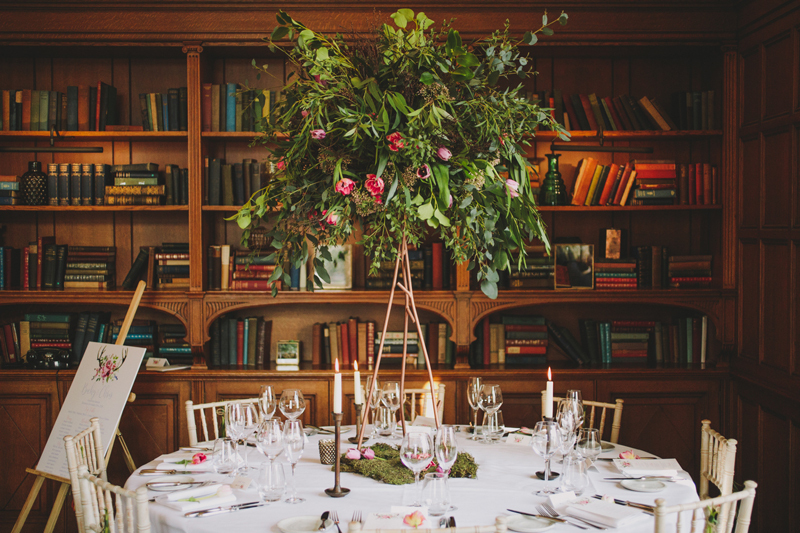 With the blossom trees and foliage it looked as if the gardens had come inside. 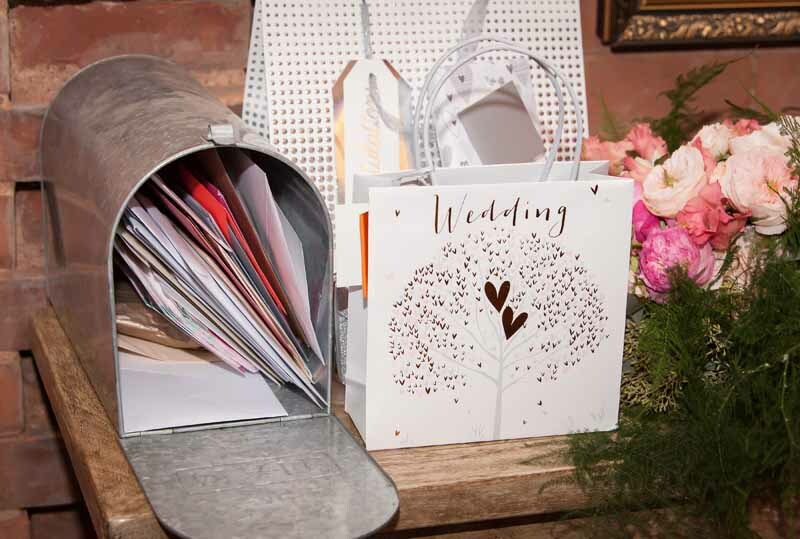 Laura and Ed had thought of all the extra details and used our US mail box for and gifts. 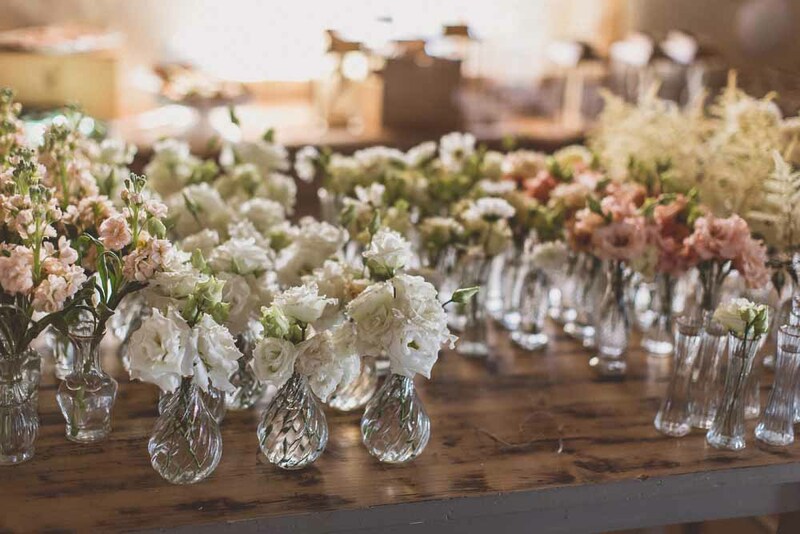 Flowers continued to adhorn and perfume even the smallest of spaces. 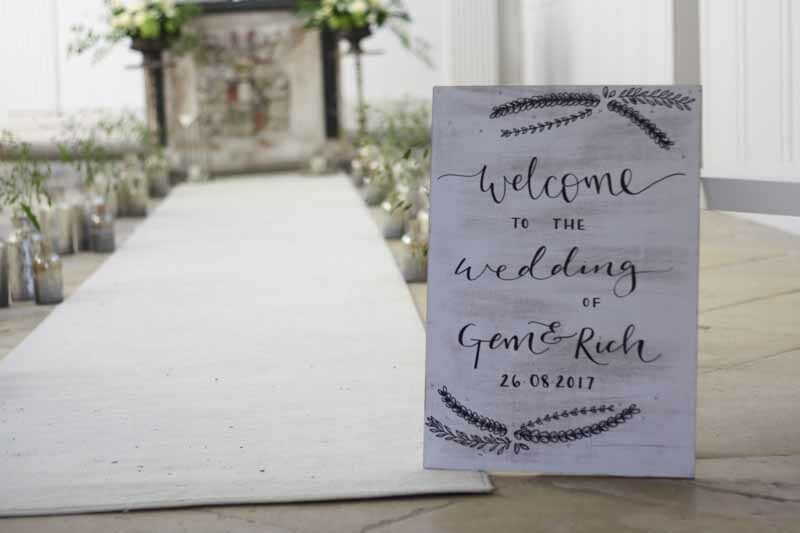 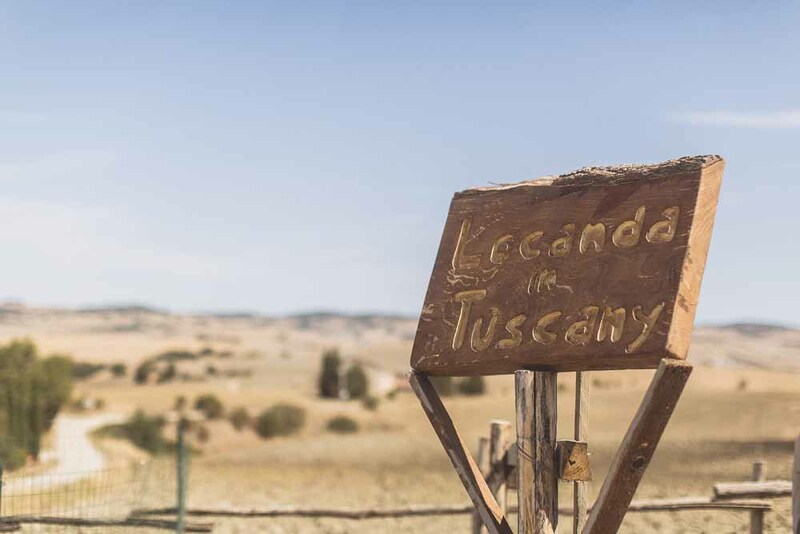 The hand crafted welcome sign is a reminder of this beautiful day. 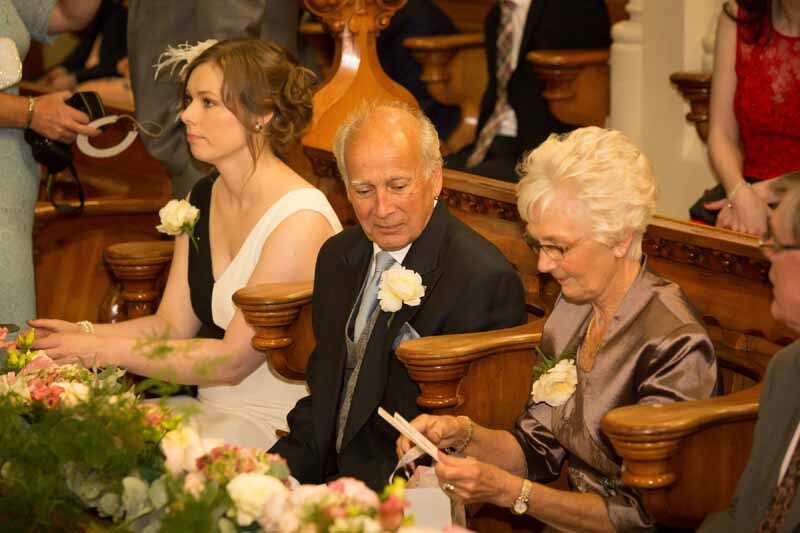 Thank you Martyn and Debbie, Father and Mother of the Bride for you heartfelt thank you card, it was an epic task for our team and we all loved every moment of creating this wedding for your family. 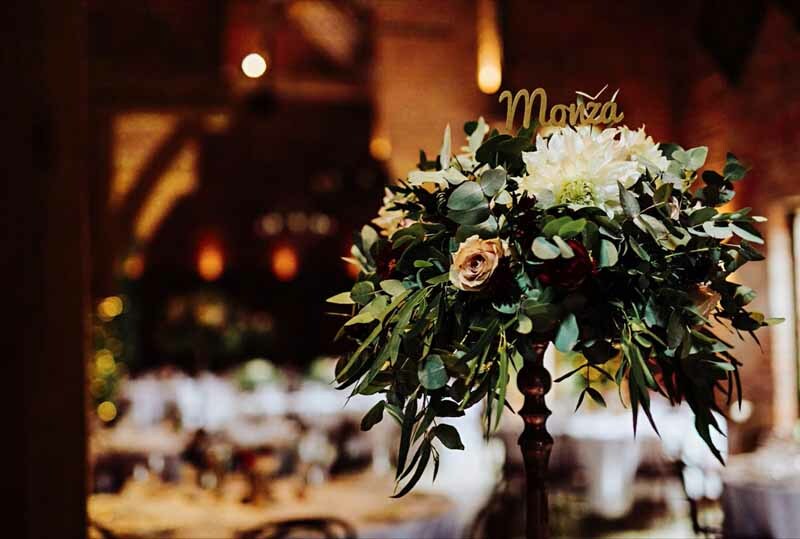 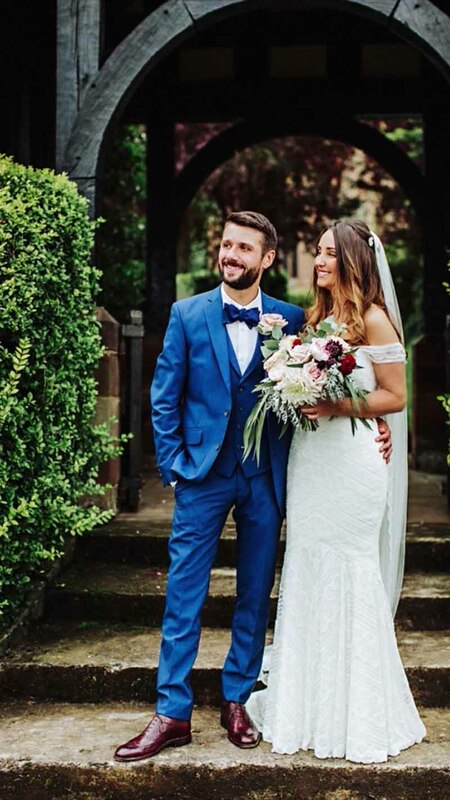 Laura and Ed our thanks to you for being so fantastic and for sharing these beautiful photos of the flowers and decor at your wedding day. 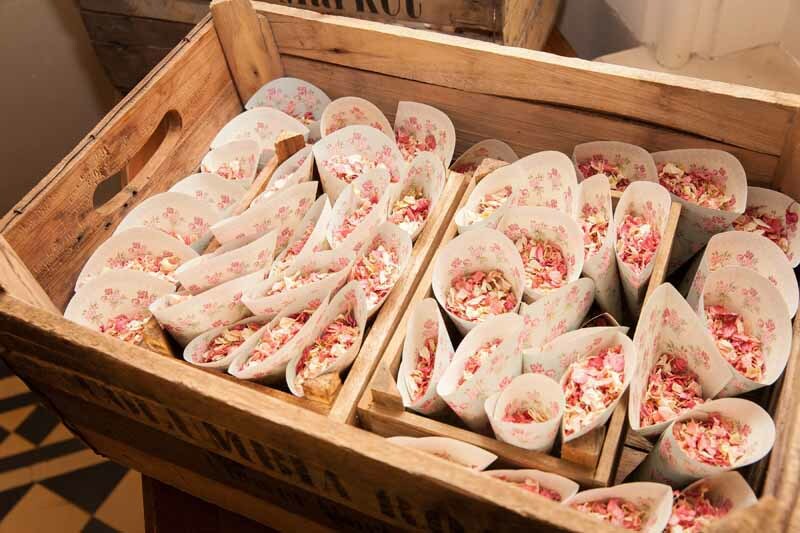 If you are looking for inspiration for a summer garden inspired wedding then please get in touch.